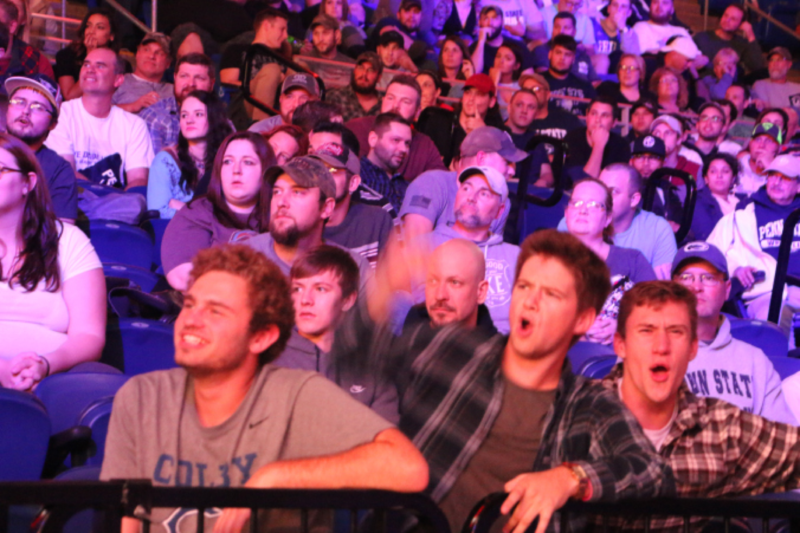 State College, Pa. — Bellator 186 was the first Bellator fight card held on a major Division 1 college campus. 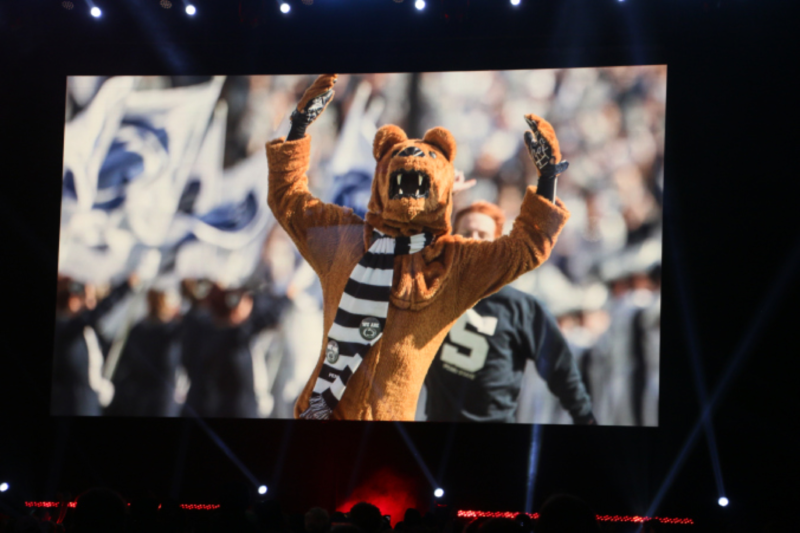 The fights emanated from Penn State University, a college campus well known for its football and top notch wrestling program. Former Penn State wrestlers Phil “Mr. 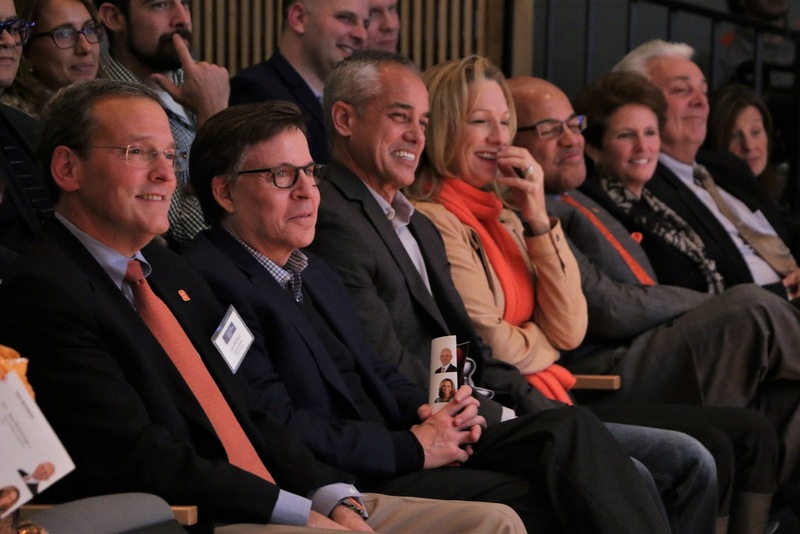 Wonderful” Davis and Ed “Easy” Ruth made their return to their alma mater and the crowd was electric in support of them. There were 14 fights total on the card, nine on the preliminary card and five on the main televised card. The following are the results of each fight in the order they took place the Bryce Jordan Center at Penn State. Not all hard-hitting action occurs on the main card and this fight proves it. 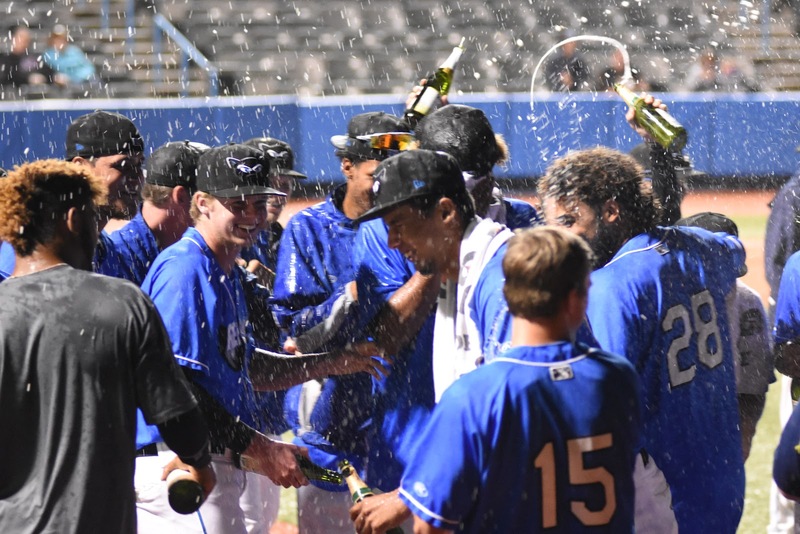 Tywan Claxton made his pro debut and he did not disappoint. 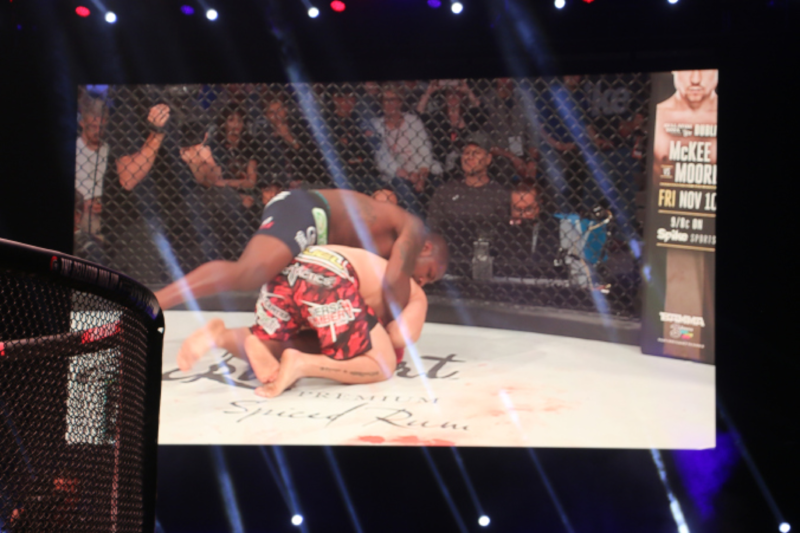 In the 1st round he delivered a vicious flying knee that knocked out Jonny Bonilla-Bowman on contact. It was arguably the highlight of the night. 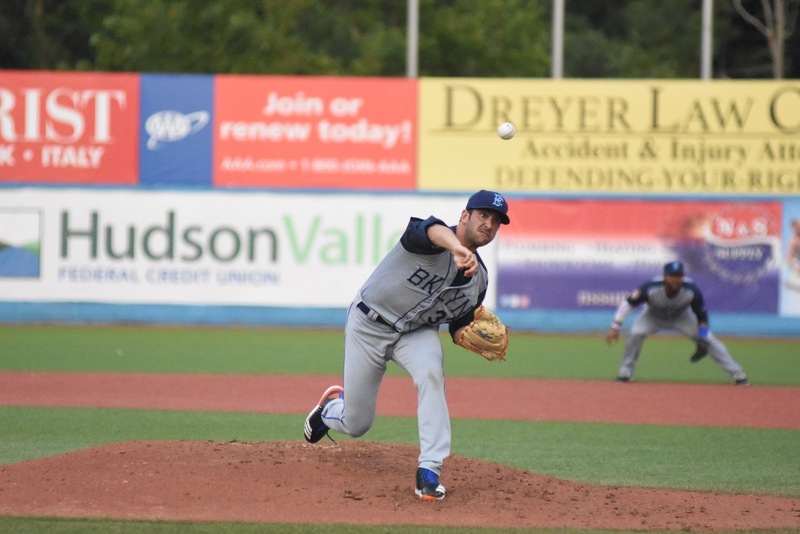 Dominic Mazzotta was coming off a loss to A.J. 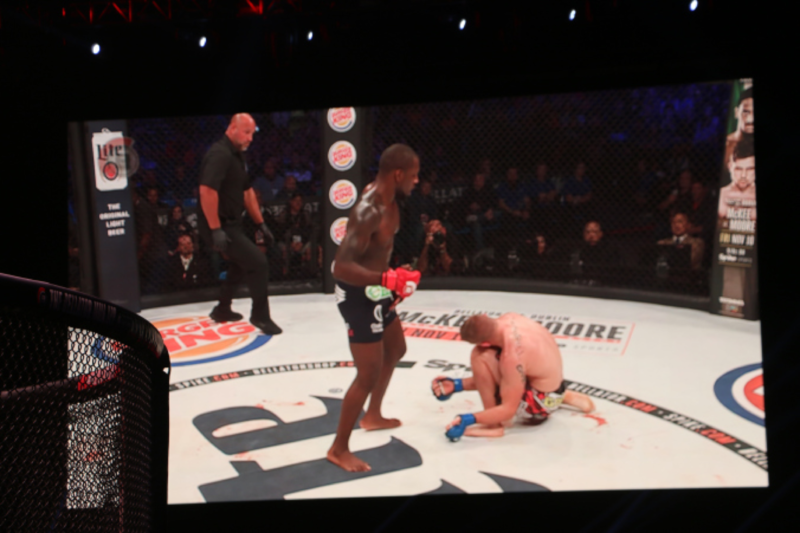 McKee at Bellator 178 and had something to prove. 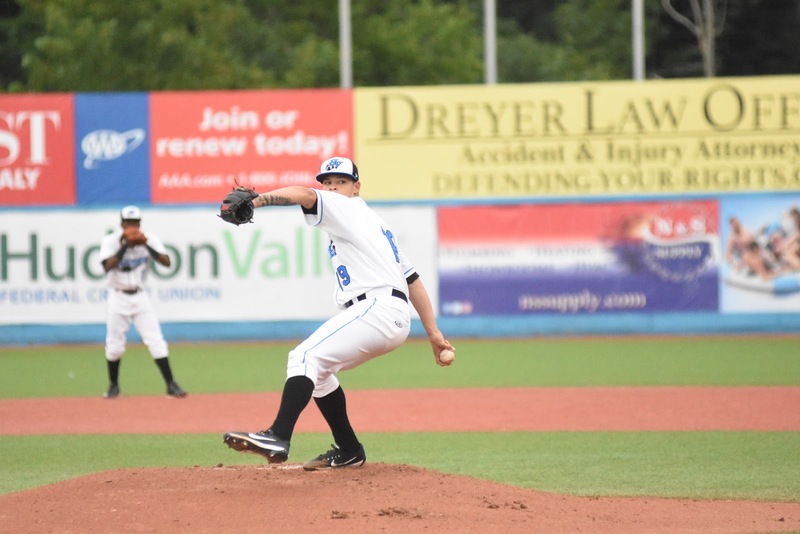 Mazzotta is also a native of New Kensington, Pa. which must have added to his motivation. Mazzotta easily controlled the first round taking down Lozano and executing brutal ground and pound. 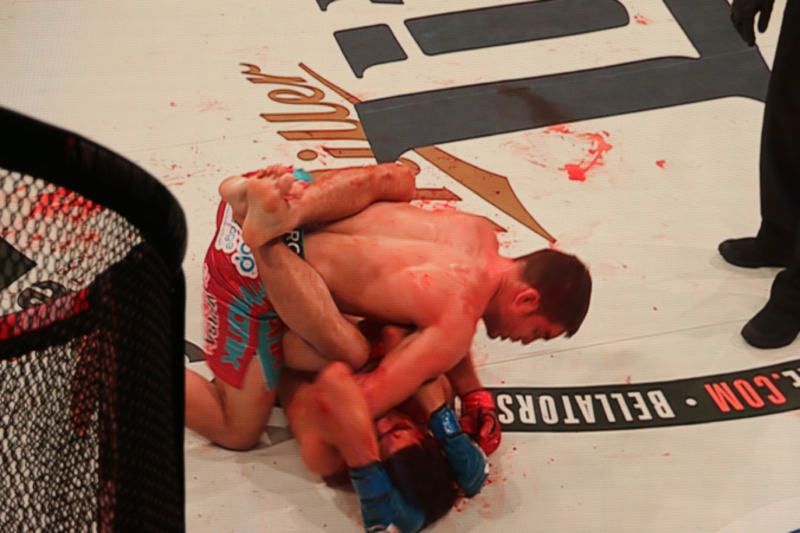 Mazzotta landed an elbow early on that littered the canvas with Lozano’s blood. 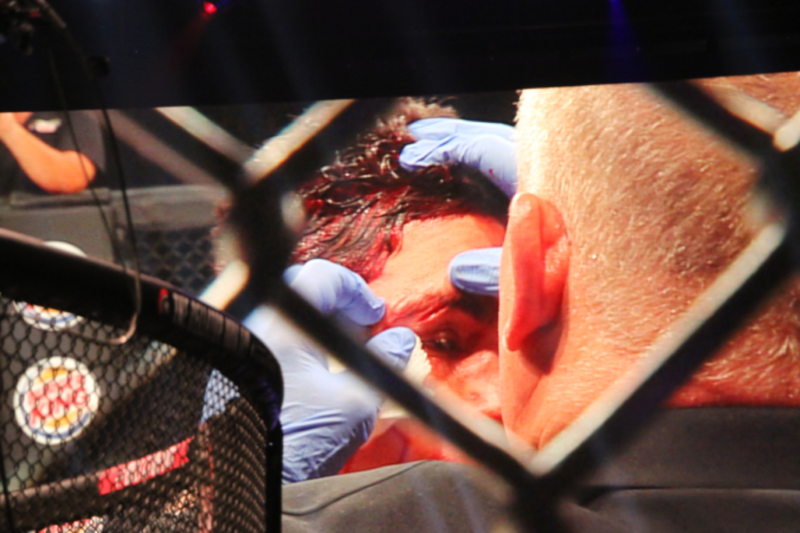 Mazzotta continued to rack on the damage until the referee stopped the action to have a doctor examine the cut. 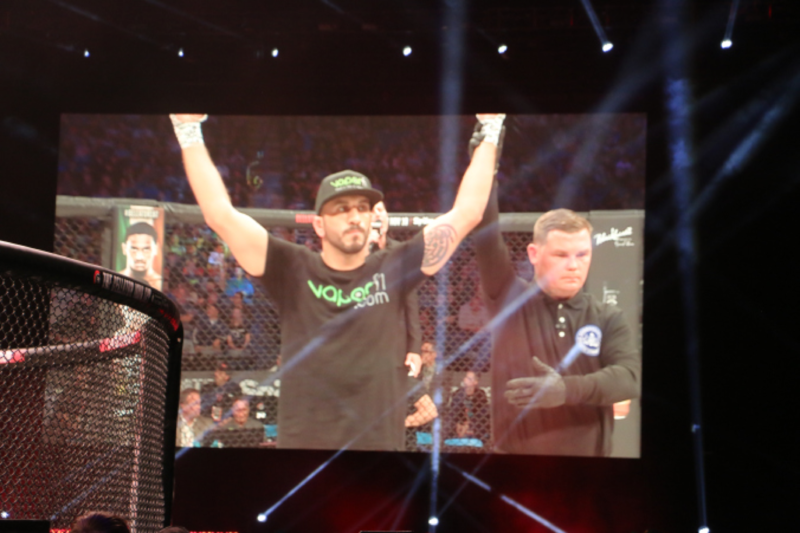 The fight was called off in the first round by the doctor and Mazzotta was declared the winner. Two local boys faced off in the penultimate prelim fight. 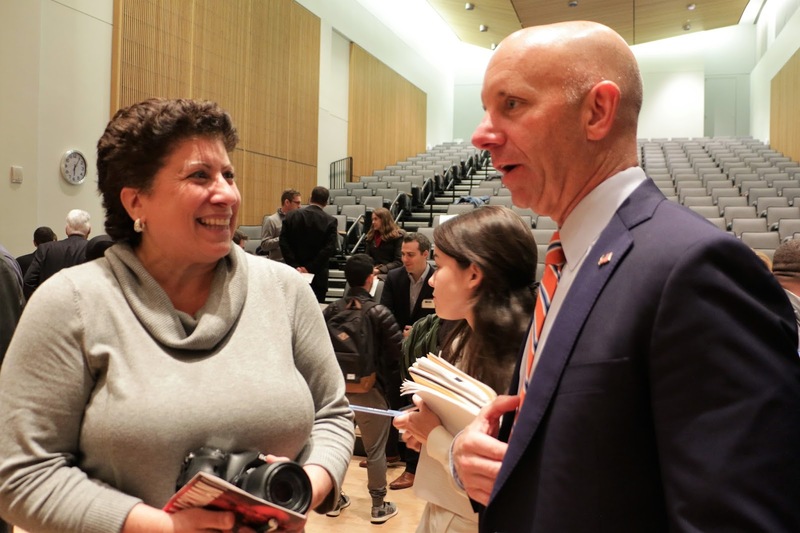 Mike Wilkins brought his supporters with him who cheered him on voraciously in the Bryce Jordan Center. 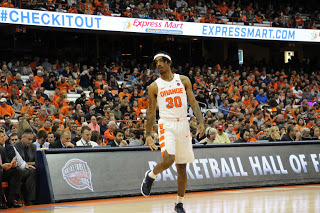 Wilkins showed his dominance early by putting on a striking clinic in the first round. The first round was all Wilkins as he dictated the pace and used his striking to maintain the distance. Round one ended with Martinez’s right eye swollen and with a mouse developing under it. 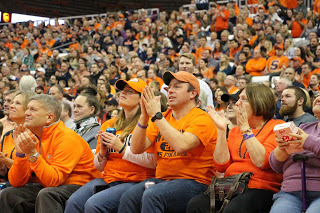 Wilkins wasn’t the only one celebrating as his supporters were ecstatic as well. 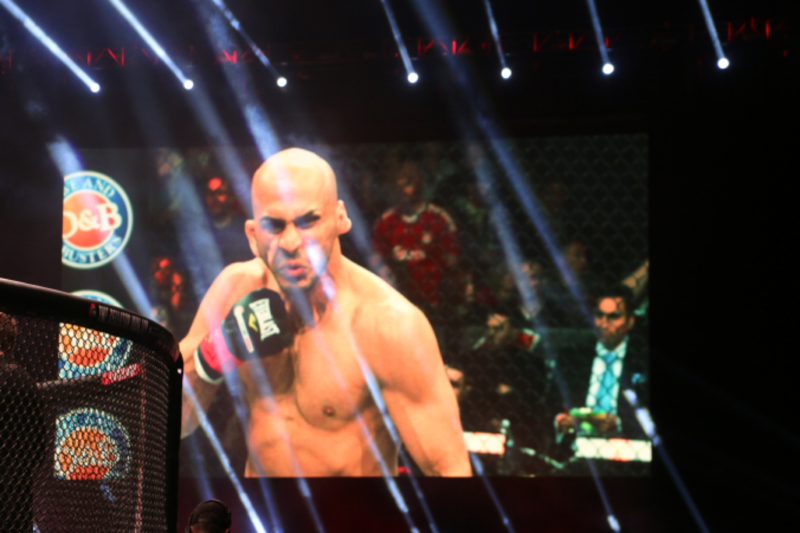 Saad Awad is a veteran MMA fighter who has fought on Bellator cards multiple times. He came out with something to prove against Zach Freeman. 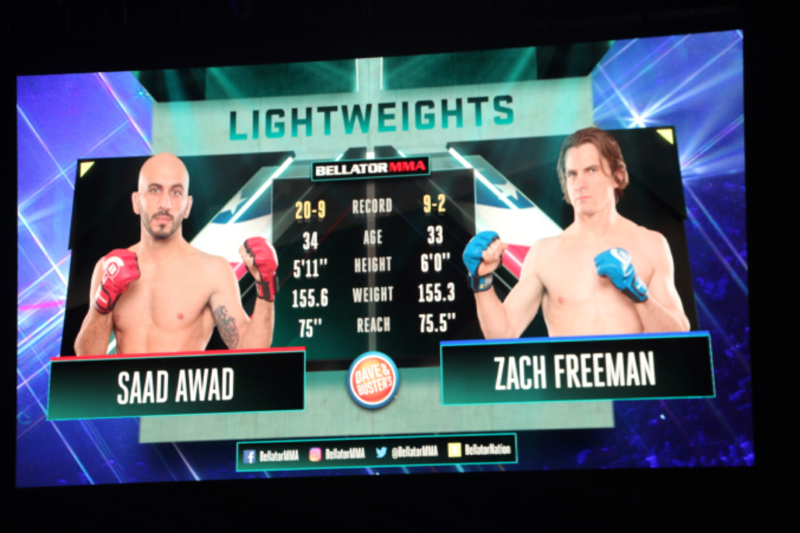 Awad made short work of Freeman with a vicious right hook that landed flush. In the post fight interview Awad said he felt overlooked. 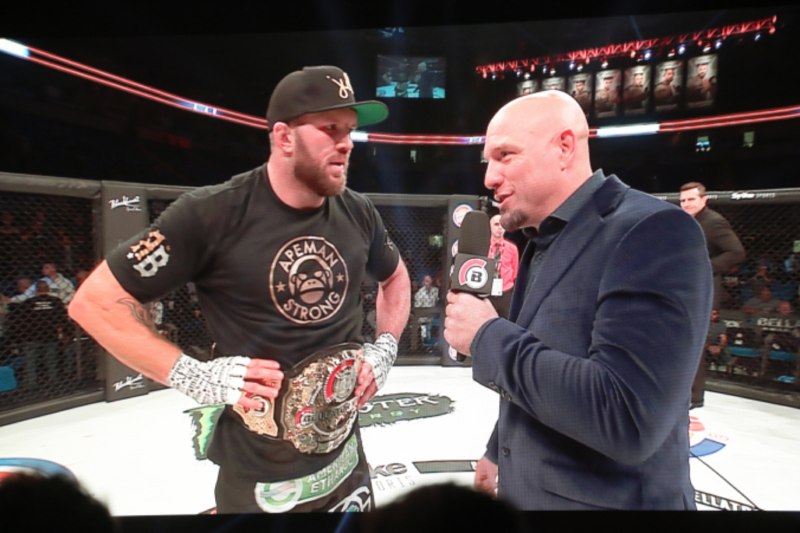 He hopes to get a title shot, and after that performance you can be assured that Bellator President Scott Coker is considering it. 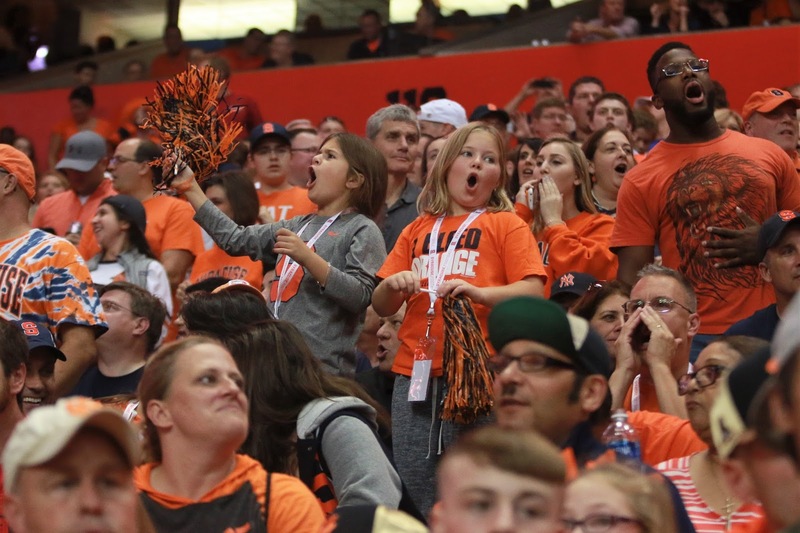 Undefeated Ed Ruth returned to his Alma Mater with a thunderous ovation. The three time All American wrestler was expected to use his wrestling skills to dominate Chris Dempsey and Ruth did not disappoint as he maintained control in the first round using his wrestling skills. 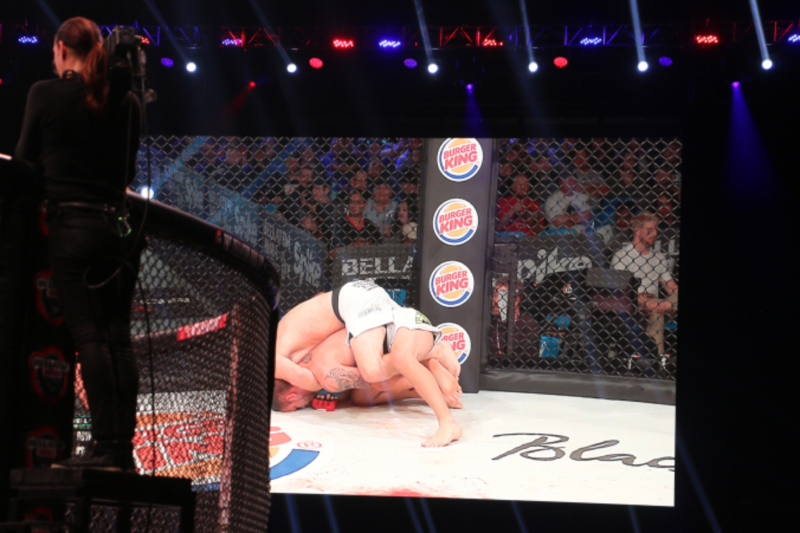 Dempsey could not overcome Ruth’s superb wrestling skills and tried to keep the fight in the center of the cage. However, it turned out to be a mistake as Ruth is also a magnificent striker. Ruth was declared the victor in the second round via K.O. 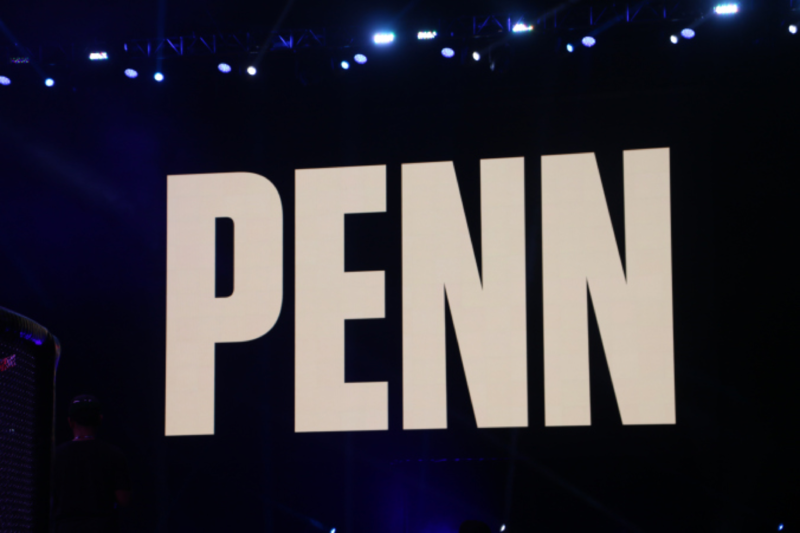 Penn State was electric as he celebrated his victory. 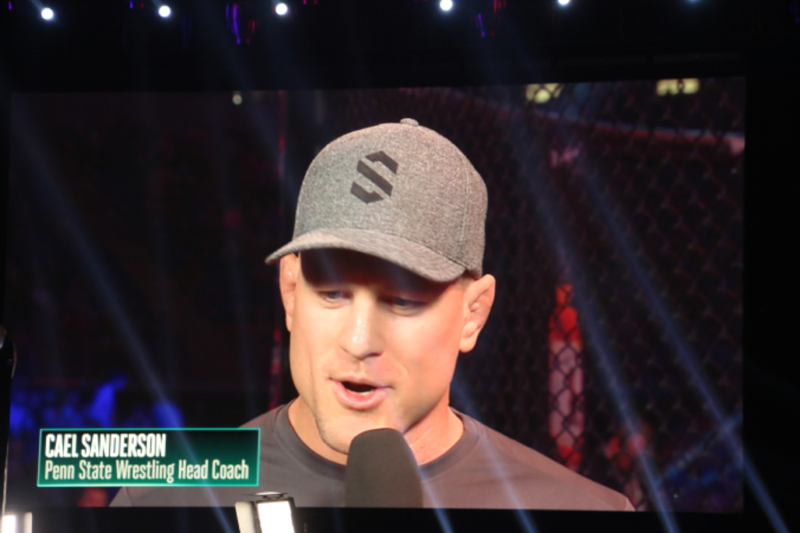 Penn State wrestling coach and legend Cael Sanderson was in attendance at Bellator 186. 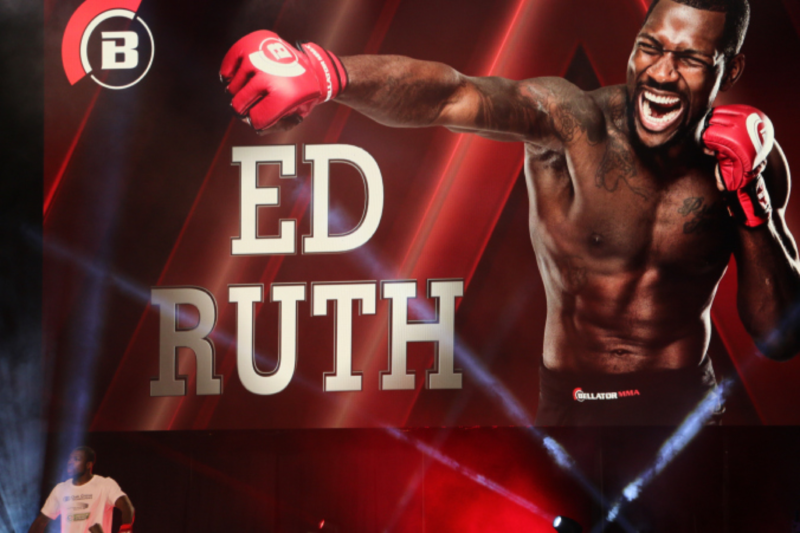 He was asked by the broadcast team to join them for the next fight, Davis vs. Leite. Mr. Wonderful like Ruth was a very accomplished wrestler during his time at Penn State and many believed he would use his wrestling to beat Leite. It wasn’t his wrestling that Leite would have to worry about but Davis’ kicks. 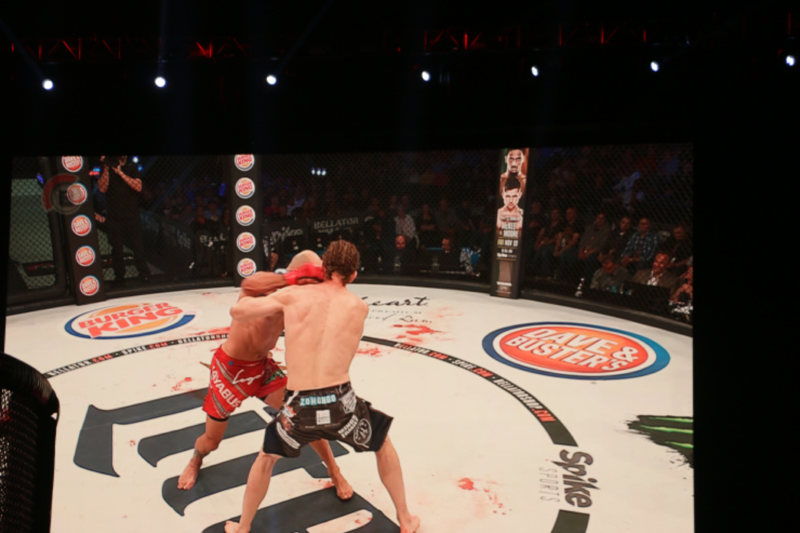 In round one Davis and Leite were feeling each other out not committing too much to attacking. Leite is a former Jui-Jitsu World Champion which gave Davis problems in terms of using his wrestling to bring Leite to the mat. 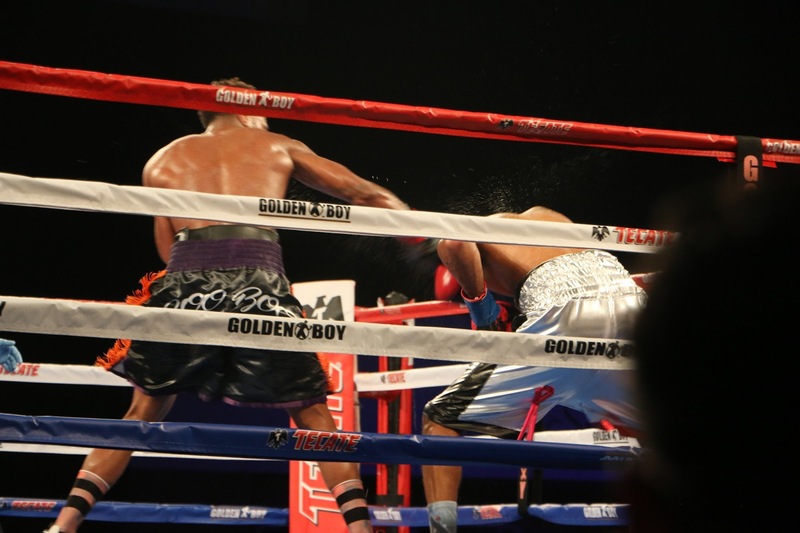 In round 2 the action perked up as Davis became more aggressive throwing more punches. However he accidentally poked Leite in the eye. Once the referee called time in, Davis went back to applying pressure and forcing Leite on his backfoot. Heading into the third round it seemed Davis was winning on the cards due to his consistent pressure. Davis continued throwing punches and kicks hoping to sway the judges. 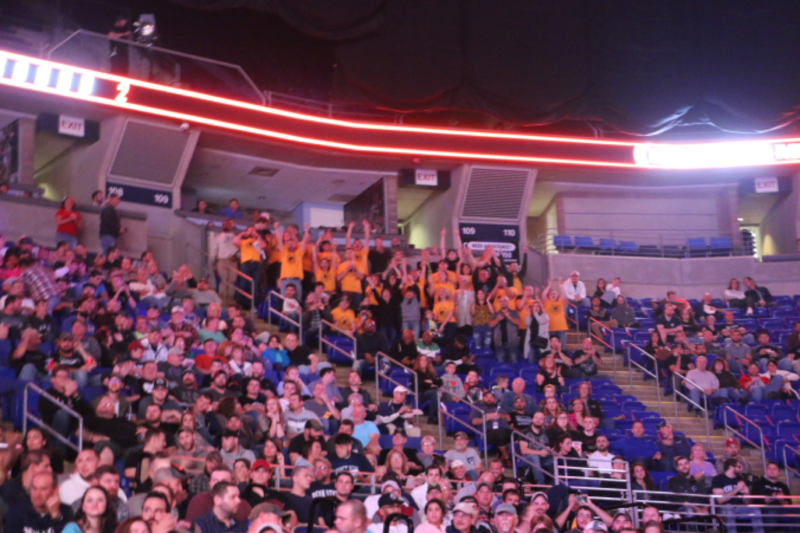 The crowd began chanting “We are Penn State!” and “Davis!” to motivate Davis. 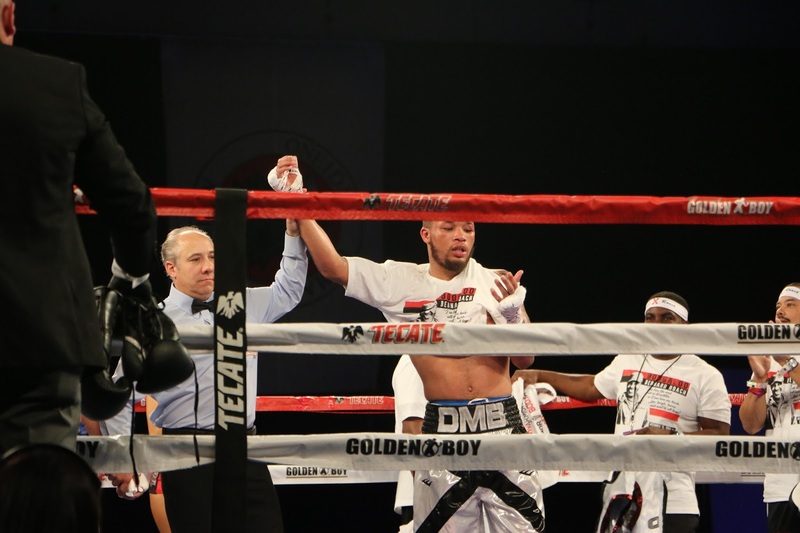 Davis won a unanimous decision as his consistent pressure and role as the aggressor swayed the judges in his favor. He said that he was glad to be back at Penn State and wants a title fight next and that he wouldn’t mind fighting both Ryan Bader and Linton Vassell. 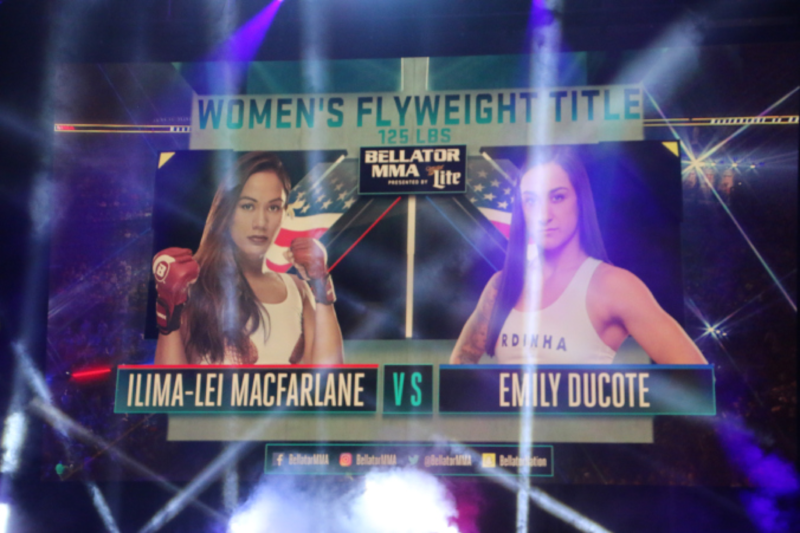 History would be made as the winner of Ducote versus Macfarlane would be the inaugural Bellator Women’s Flyweight champion. 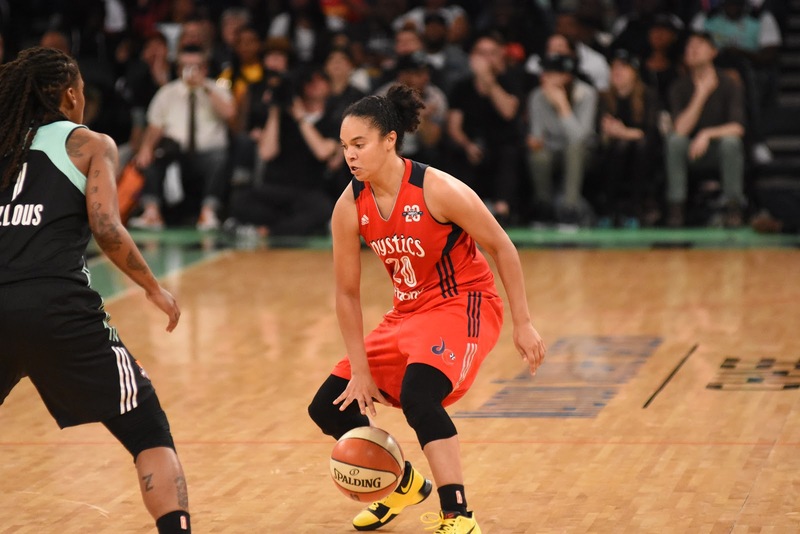 From Round one Macfarlane showed why she is a feared striker with effective punches. Not only was her striking efficient, but she was able to defend well against Ducote’s strikes. 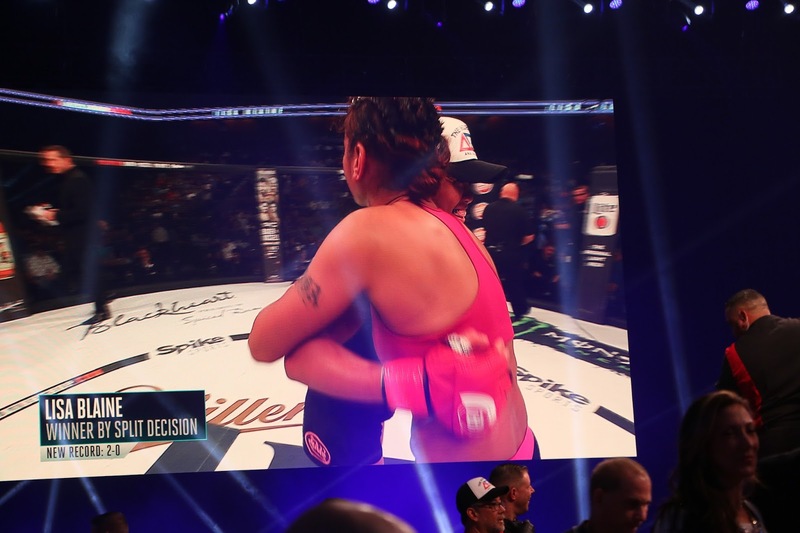 Macfarlane was also very comfortable on the ground as she continually tried to lock in a submission hold, whether it be a triangle choke, armbar, kimura, or rear-naked choke. 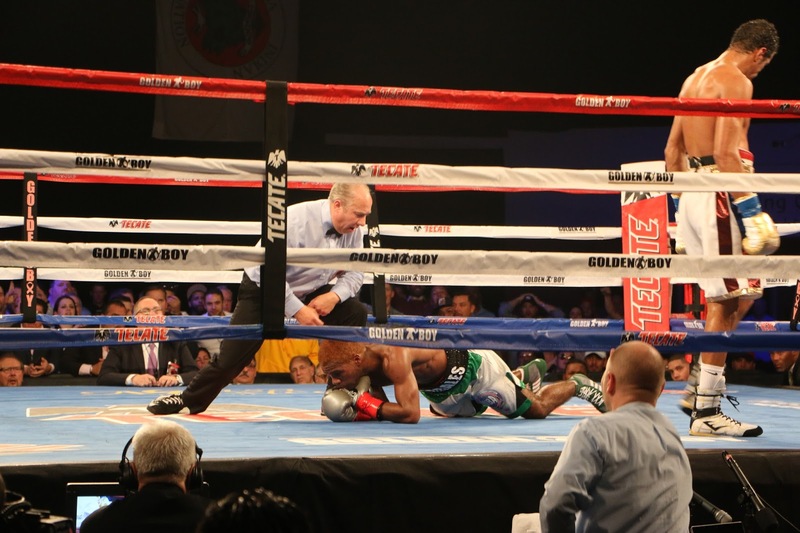 In round two both fighters stayed on their feet and exchanged strikes. 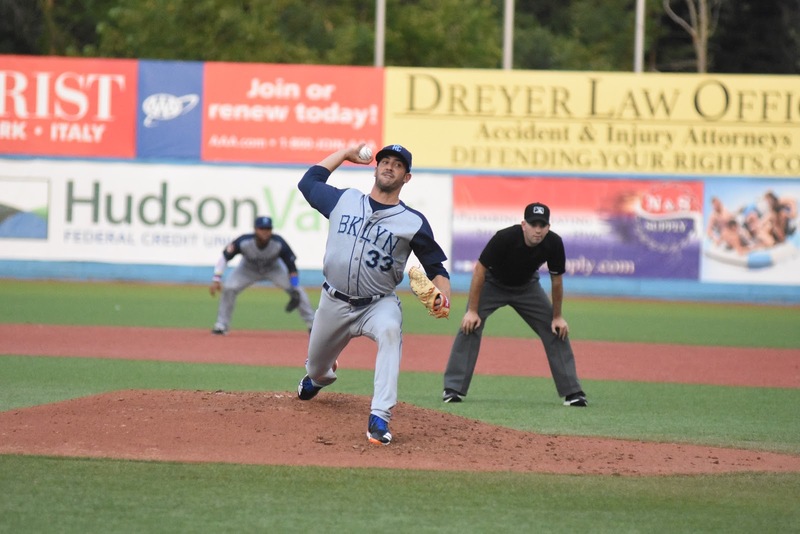 Ducote threw solid leg kicks hoping to weaken Macfarlane’s base. 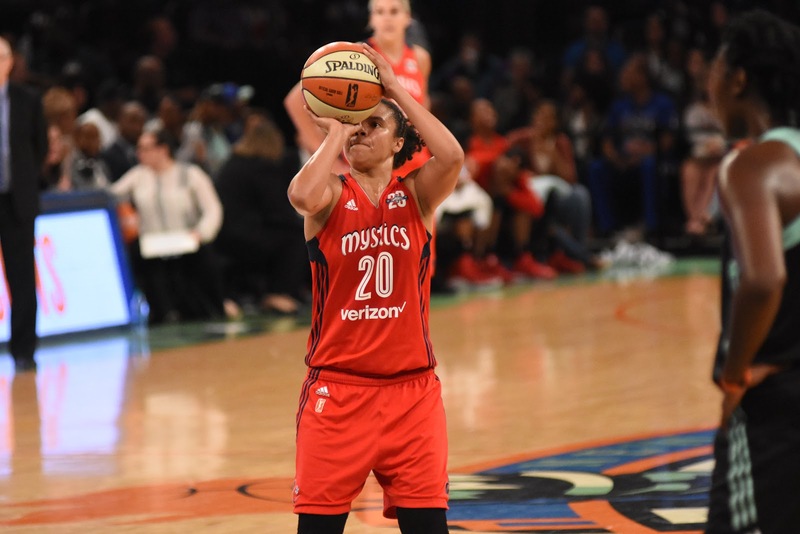 Macfarlane continued to strike effectively and caused Ducote to begin bleeding from her nose. 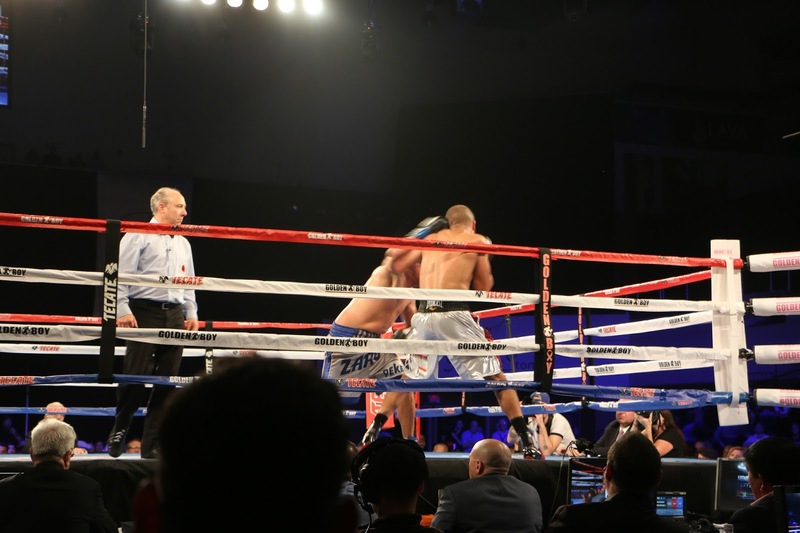 In the third round Macfarlane began attacking Ducote’s body. 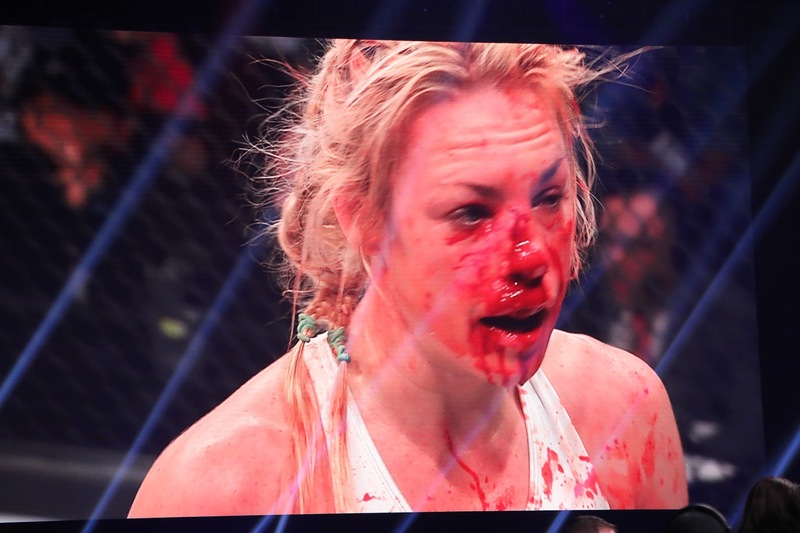 Her attack included a savage knee from a clinch. Ducote tried to take Macfarlane down in hopes of getting in control but it was reversed. 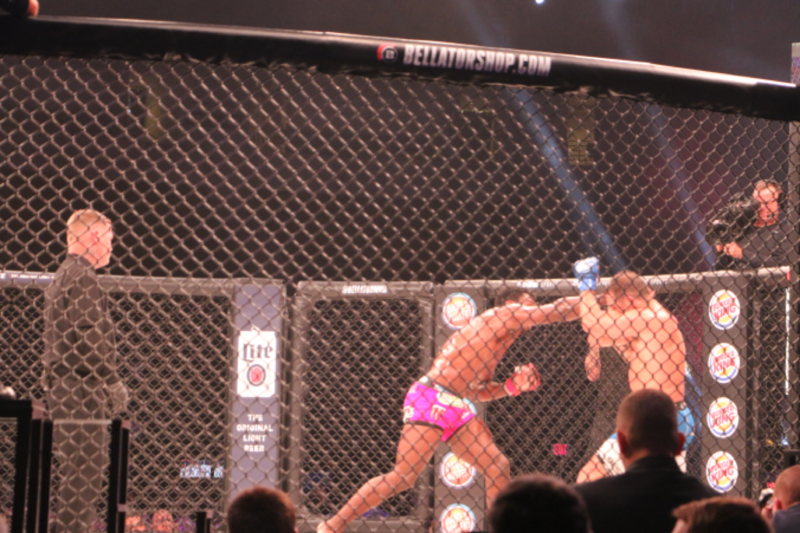 In round four both combatants took each-other to the limit as they exchanged blows in the middle of the cage. Both were showing signs of fatigue, but they did not back off. 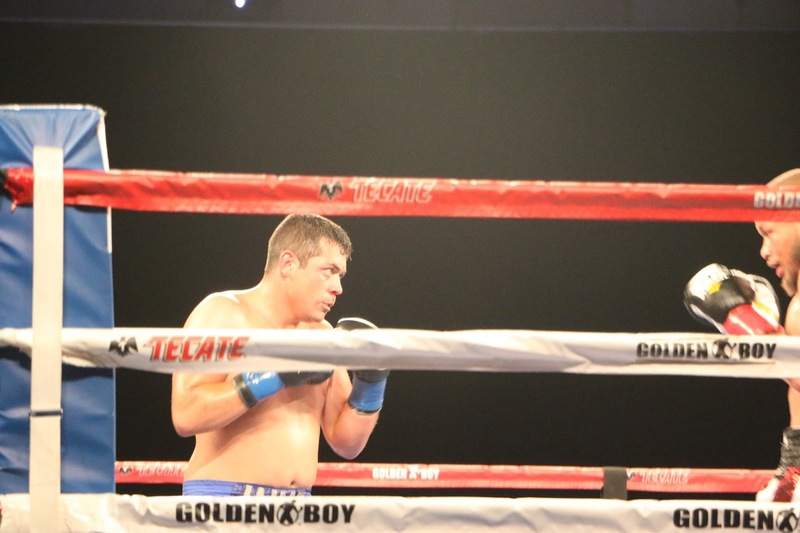 In round five Ducote worked hard to turn the tide of the fight. She was the aggressor hoping to land something solid on Macfarlane. 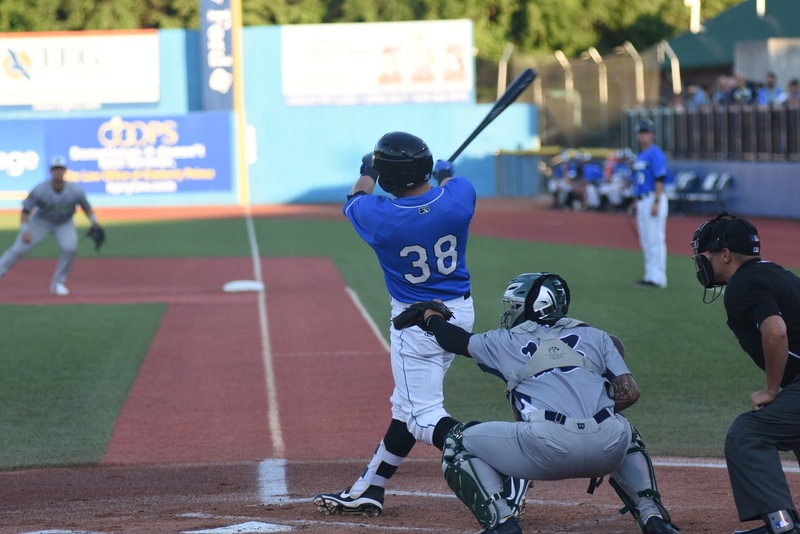 Macfarlane went for a throw however Ducote reversed it and gained control. 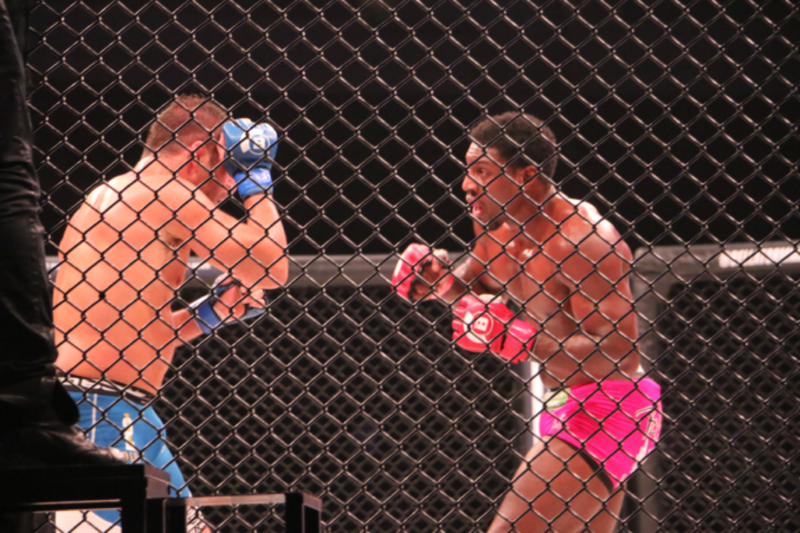 Macfarlane remained poised to find an opening and lock in a submission. 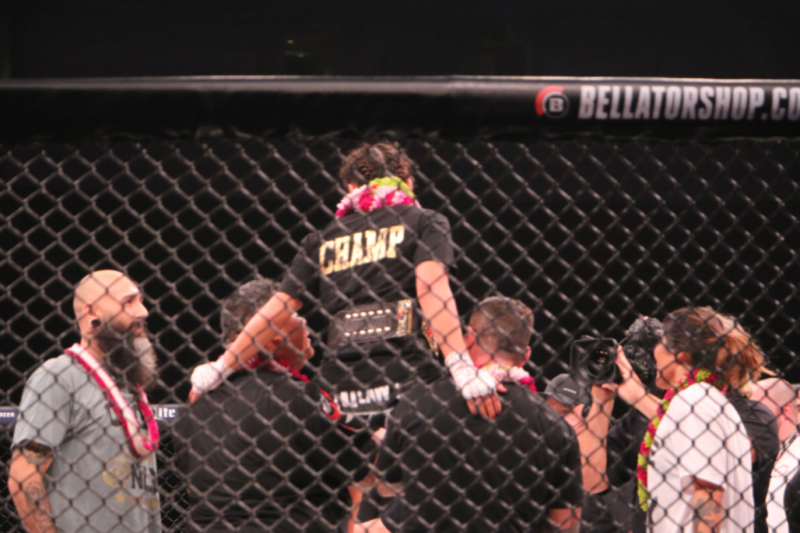 She finally found her opening as she was able to secure Ducote’s arm and lock in a makeshoft armbar for the win. 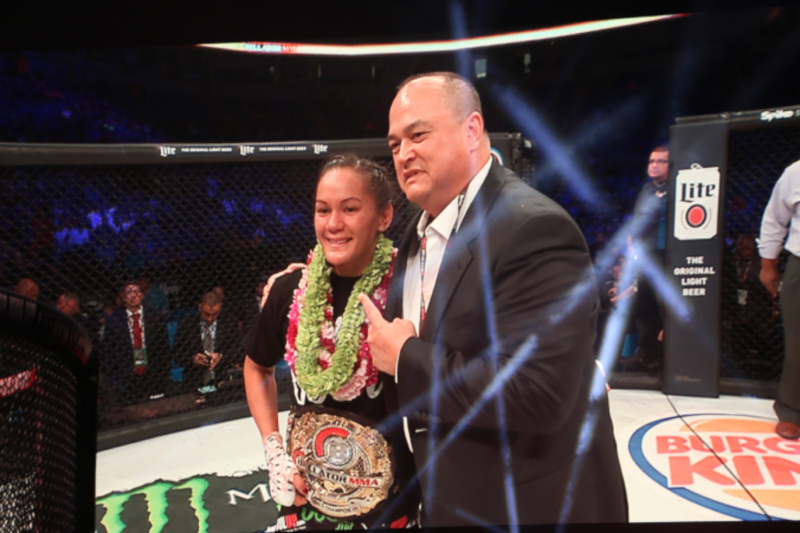 Ducote verbally submitted and Macfarlane was crowned the inaugural Bellator Women’s Flyweight champion. 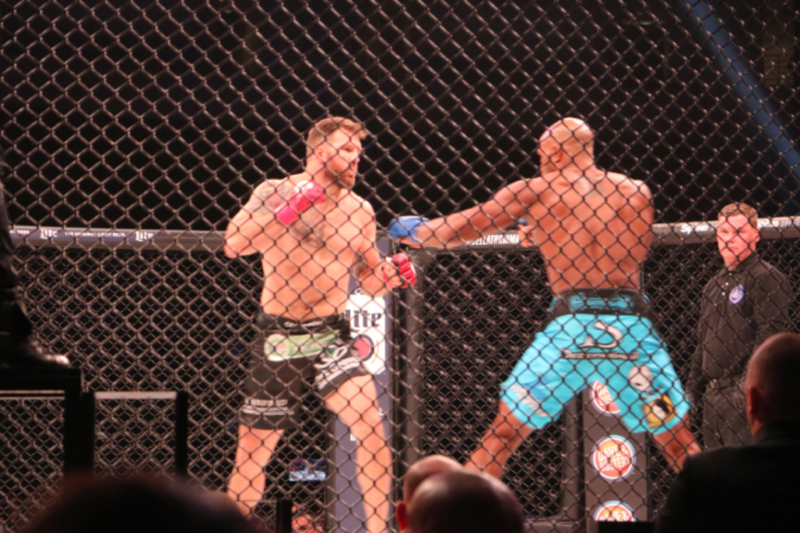 In the main even Ryan Bader and Linton Vassell faced off for Bader’s Bellator Light Heavyweight championship. 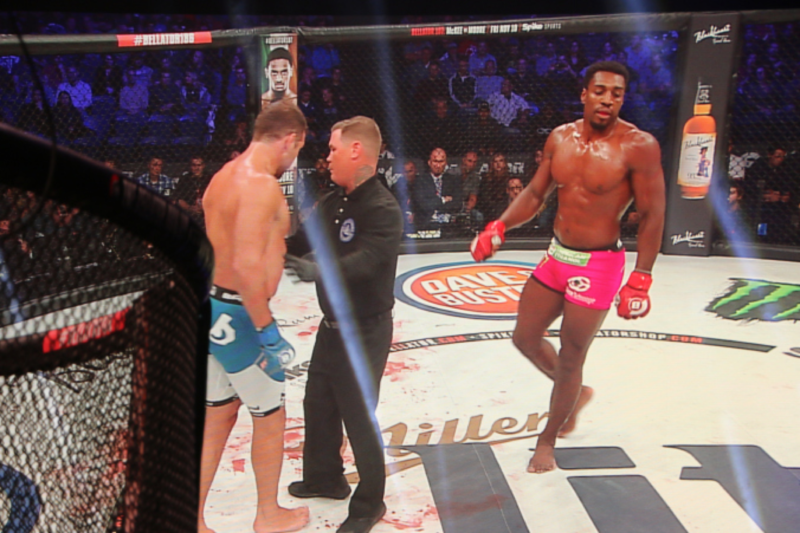 Vassell was not an easy opponent for Bader as he was very strong and had excellent range. As was the theme for most of the night, wrestlers dominated, and Bader used his wrestling skills to gain control of the fight. 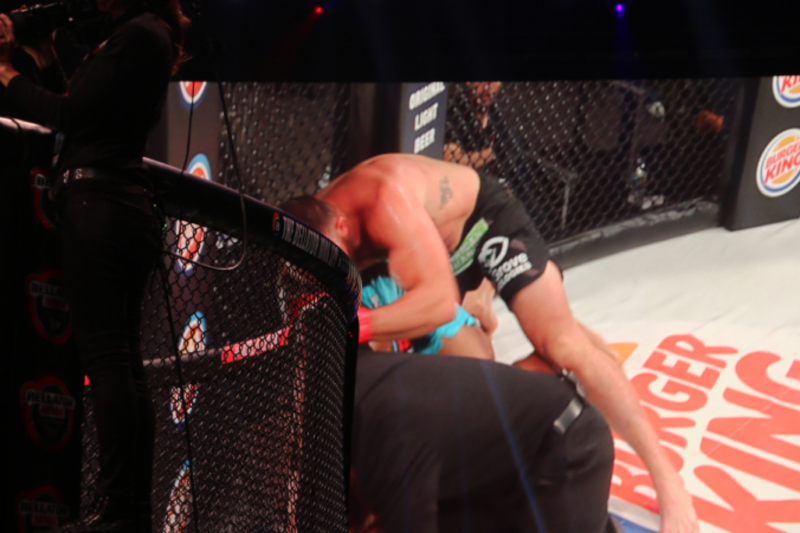 Heading into the second round Bader resumed wrestling and was able to corner Vassell at the edge of the cage. 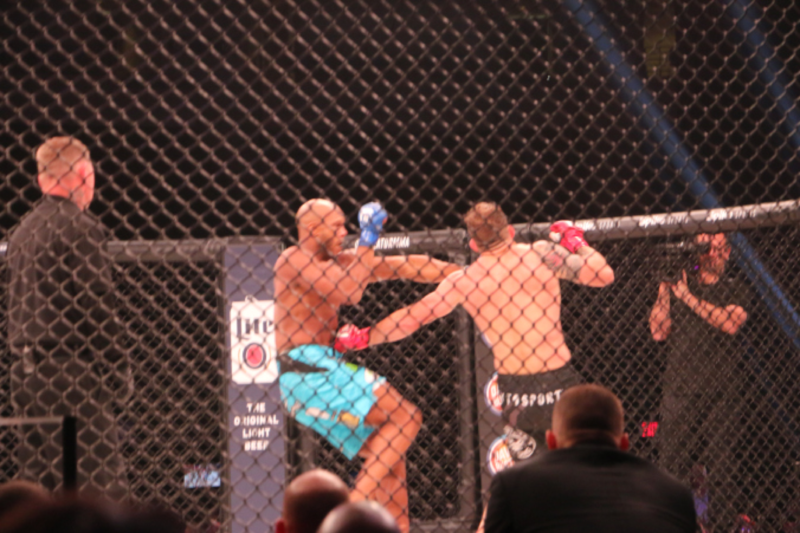 Bader began to throw heavy strikes after gaining wrist control and exposing Vassell’s guard. 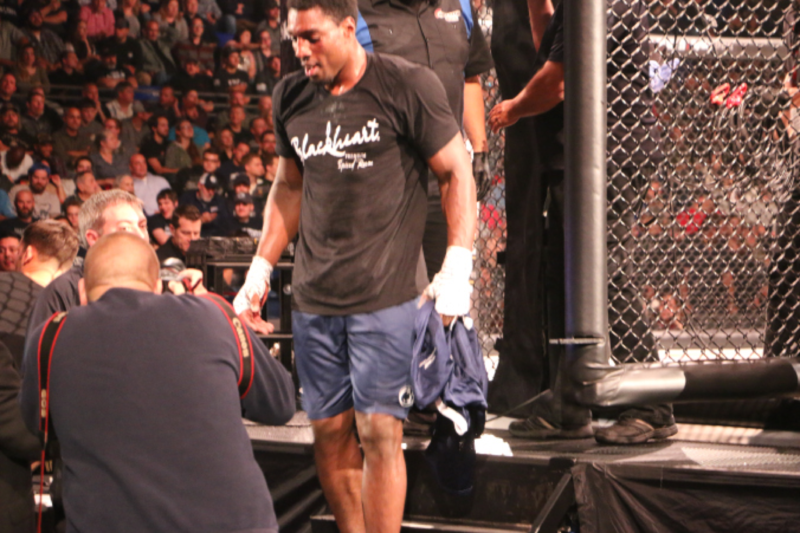 The referee stopped the fight shortly thereafter as Vassell was taking heavy punches to his face by Bader. 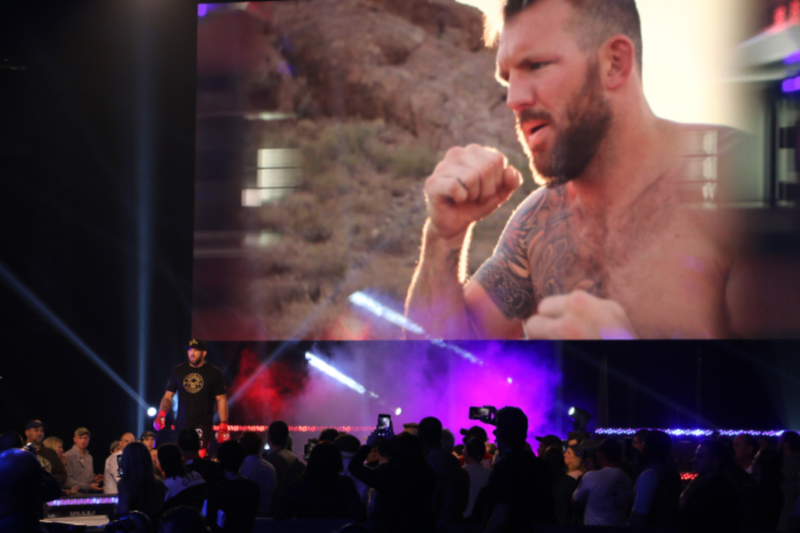 The referee stopped the fight in the second round via TKO and Ryan Bader retained his Light Heavyweight championship. 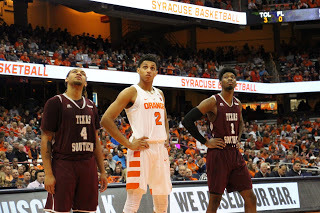 Syracuse, N.Y. — Tyus Battle proved to be the difference maker in Syracuse’s 80-67 win over Texas Southern in front of 16,644 fans Saturday night at the Carrier Dome. 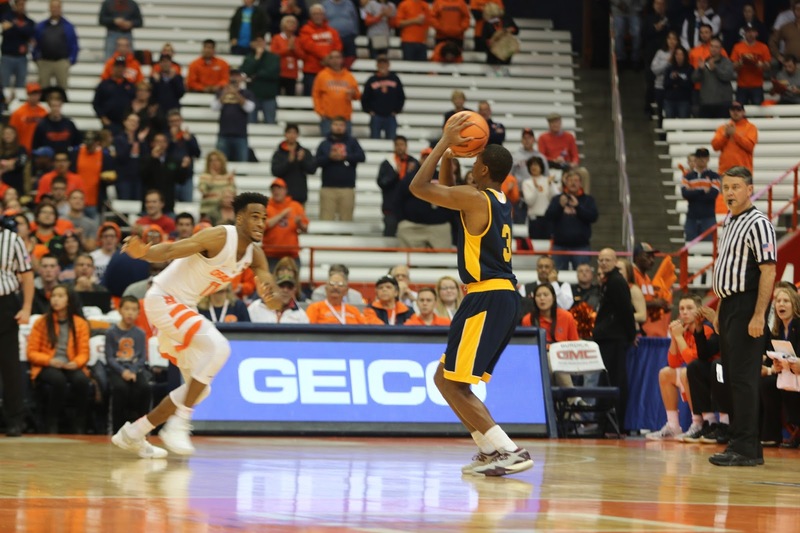 The 6-foot-6 sophomore guard finished with 21 points on 9-of-16 shooting in just 26 minutes on the court. 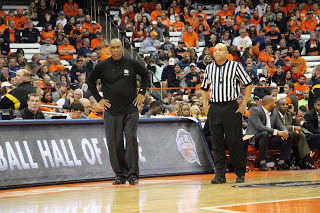 Syracuse head coach Jim Boeheim took Battle out after picking up his second personal foul with 9:50 left in the first half. 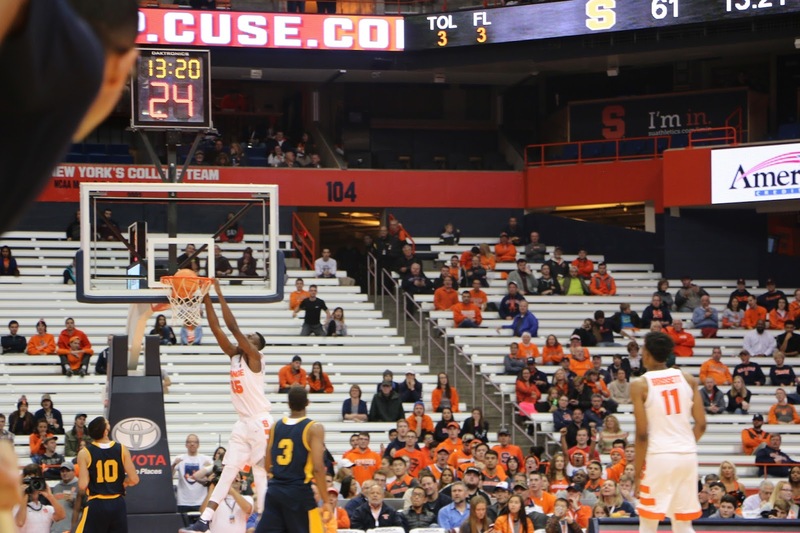 Syracuse was trailing 20-18 at the time. 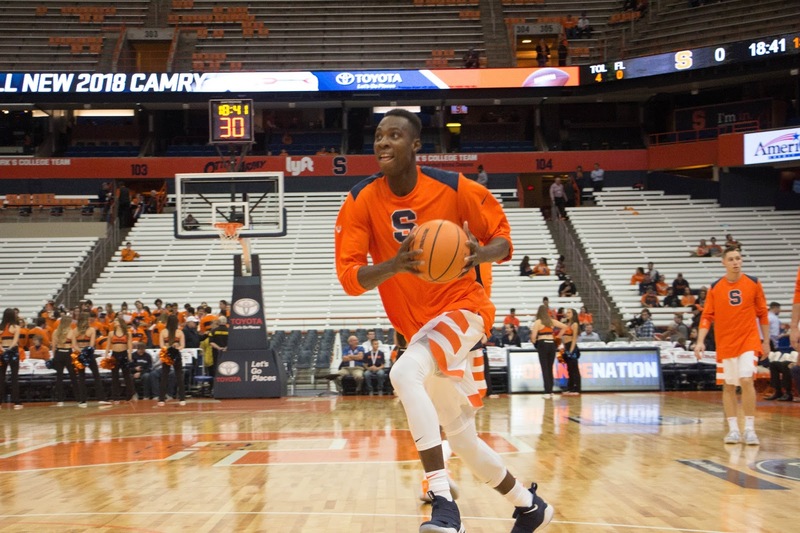 “He could have went back in, but I think Frank [Howard] and Geno [Thorpe] played well together during that stretch,” Coach Boeheim said. 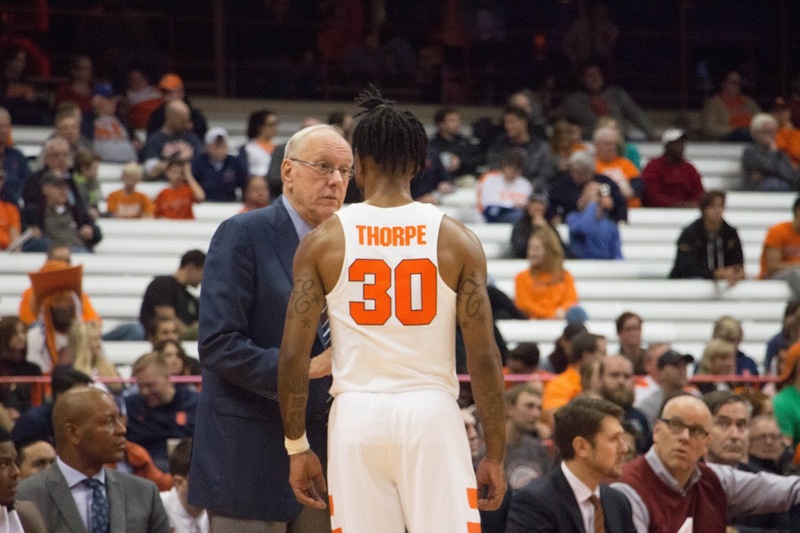 Thorpe helped pick up the slack for Syracuse with Battle on the bench. The fifth year transfer from South Florida led the Orange with 13 markers on 5-of-6 shooting, including 3-of-4 from the perimeter, heading into half with a 38-30 lead over the Tigers. 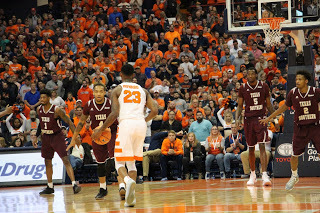 That wasn’t the case in the second half as Thorpe didn’t score a single point. 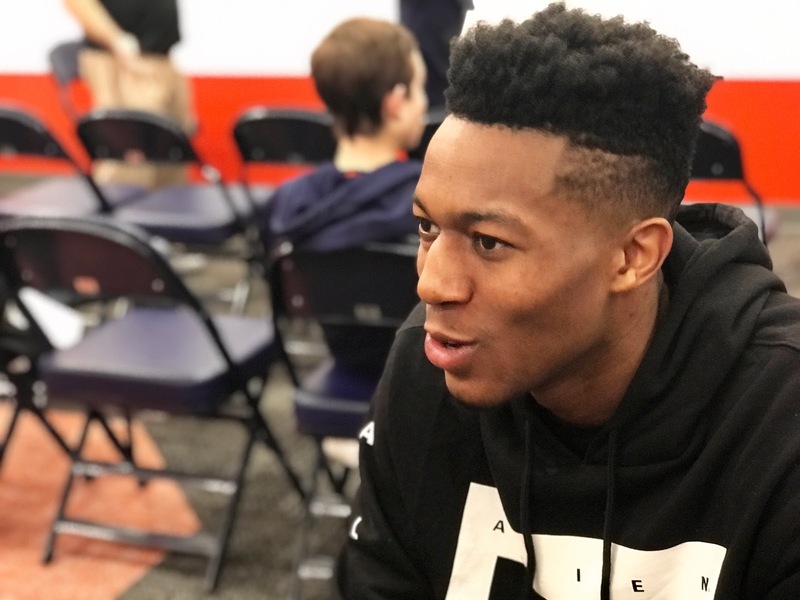 The Pittsburgh native played only seven minutes and missed all three shots he took. 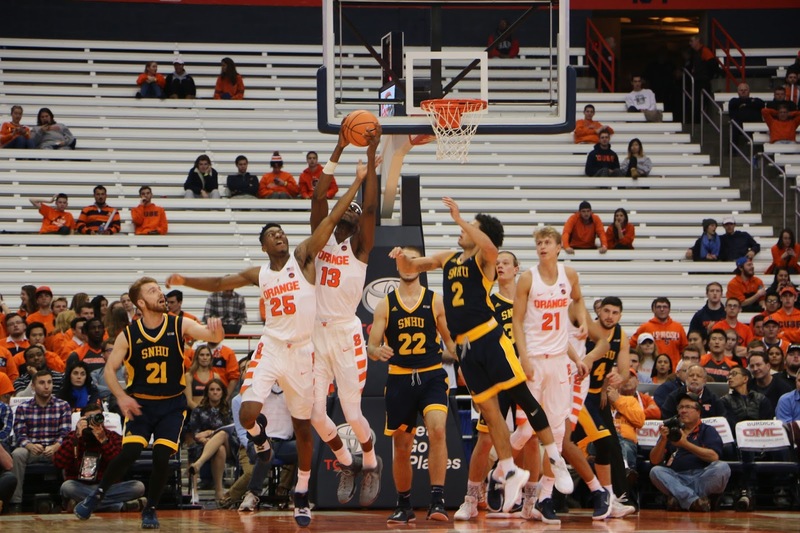 Battle returned to start the second half and made his presence known by burying a 3-pointer on Syracuse’s first possession. 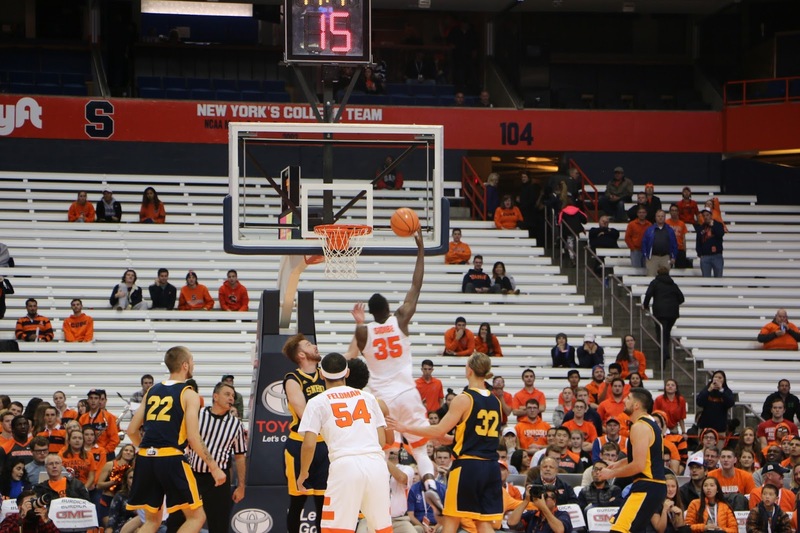 The Orange went on a 15-0 run with the help of the sophomore guard. 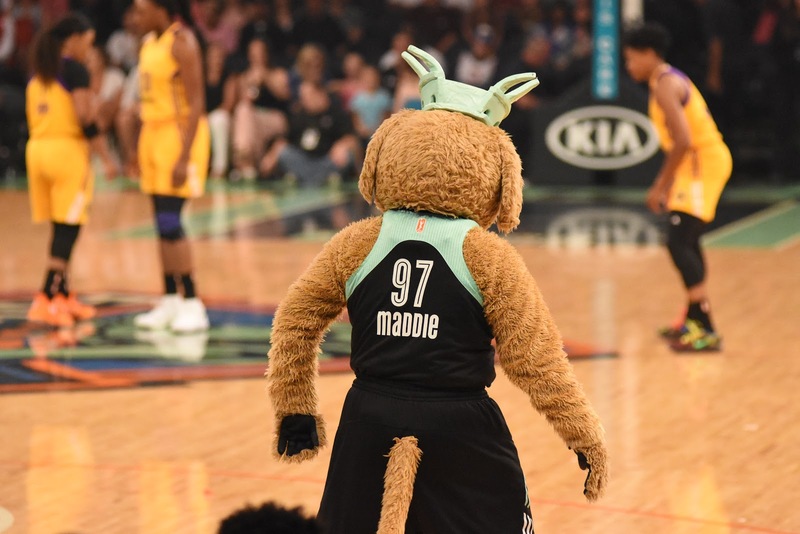 He scored 14 points in the first eight minutes. 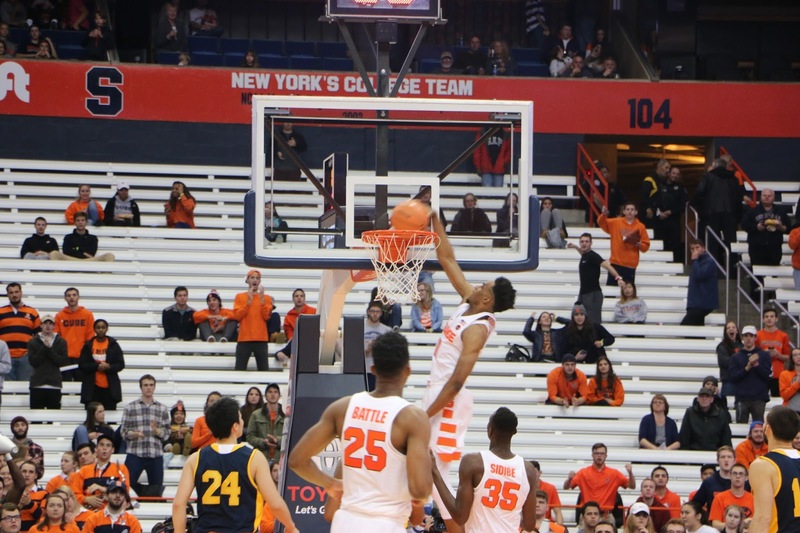 Battle faked out his defender in the corner, spun back towards the baseline and put down a one-handed dunk that lifted the Syracuse crowd from their seats with 12:26 on the clock. 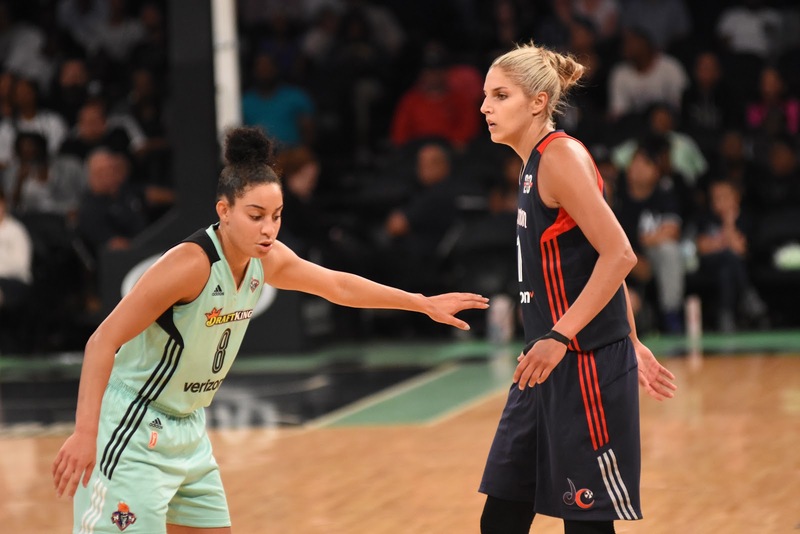 Battle is averaging 22.3 points per game this season. 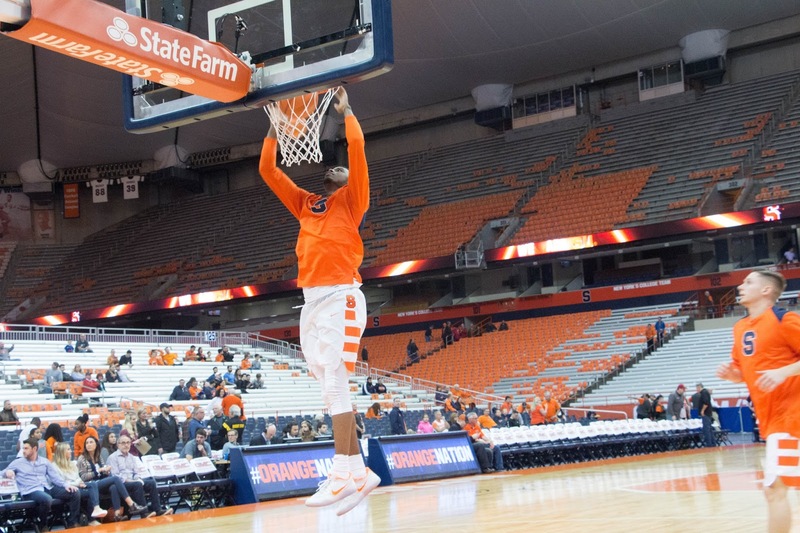 Like its last three starts, the Orange struggled to get the ball rolling. 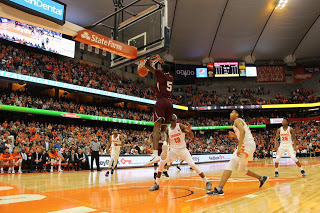 Texas Southern went on a 5-0 run to start the first half. 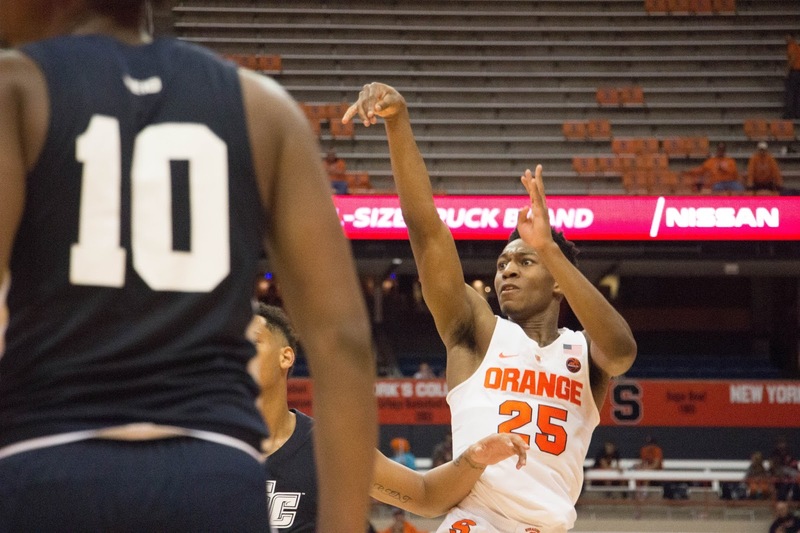 The Orange got on the board with a pair of foul shots from Oshae Brissett. 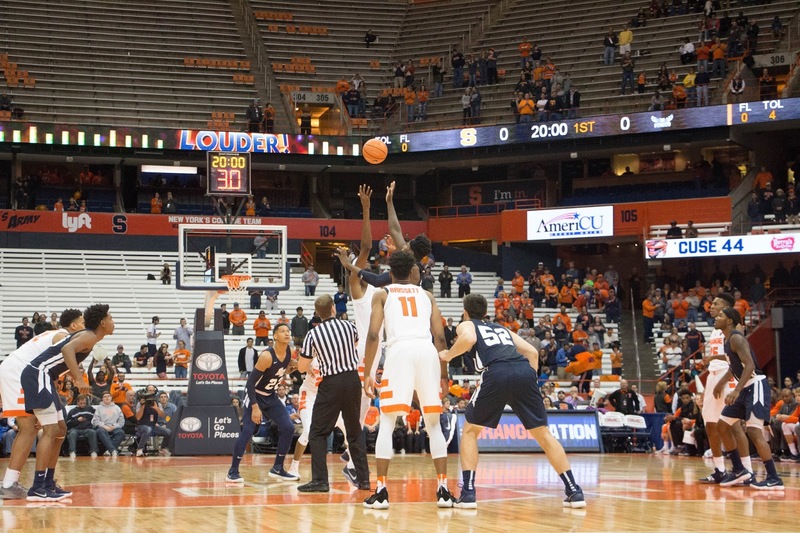 In the postgame conference, Boeheim said it was like his team had never seen a zone before. 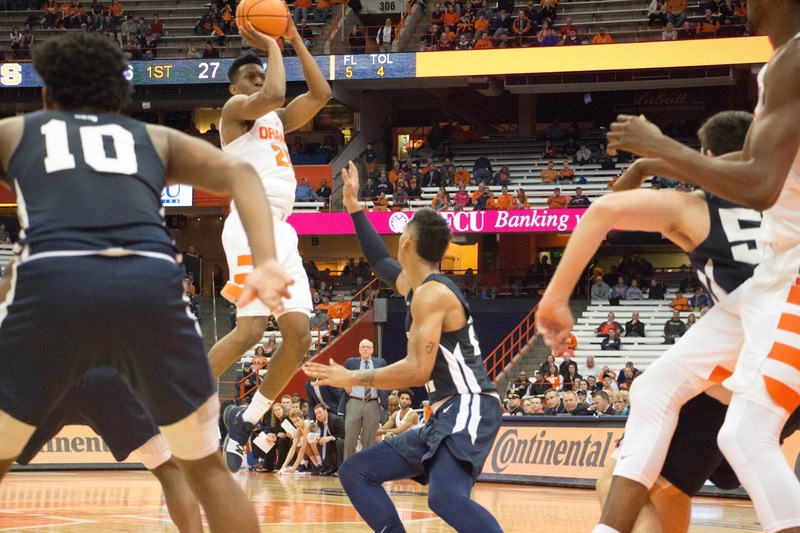 The Tigers played a 2-3 zone, which Syracuse struggled against, going 0-7 from the field to start the game. 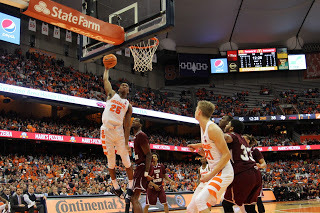 Their first bucket didn’t come until four minutes in when Tyus Battle knocked down a 3-pointer. 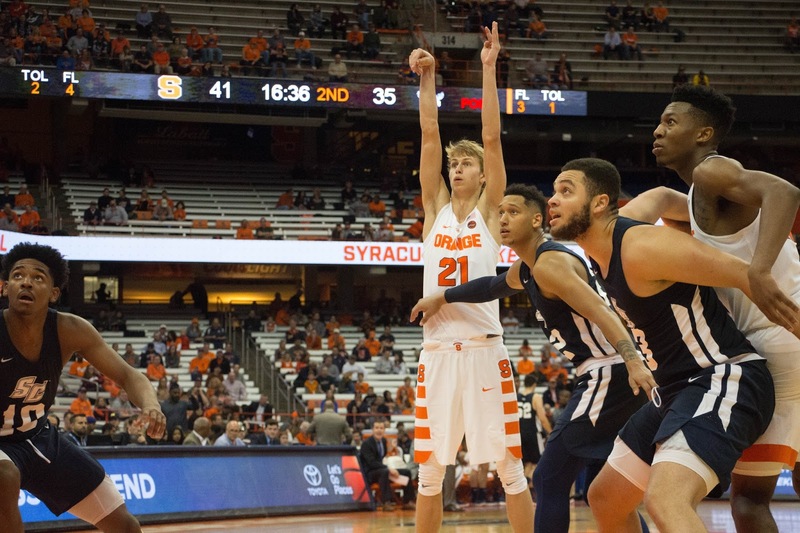 Syracuse had five players finish in double figures. 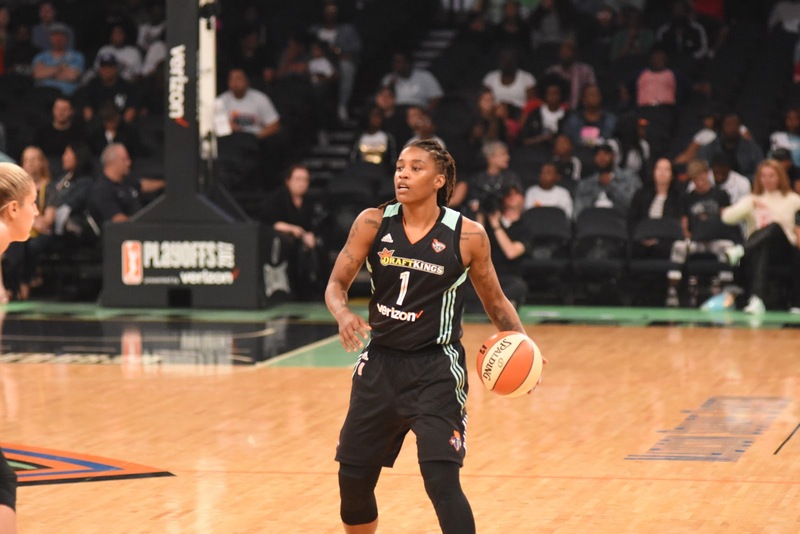 Battle led the offense with 21 points and Thorpe added 13. 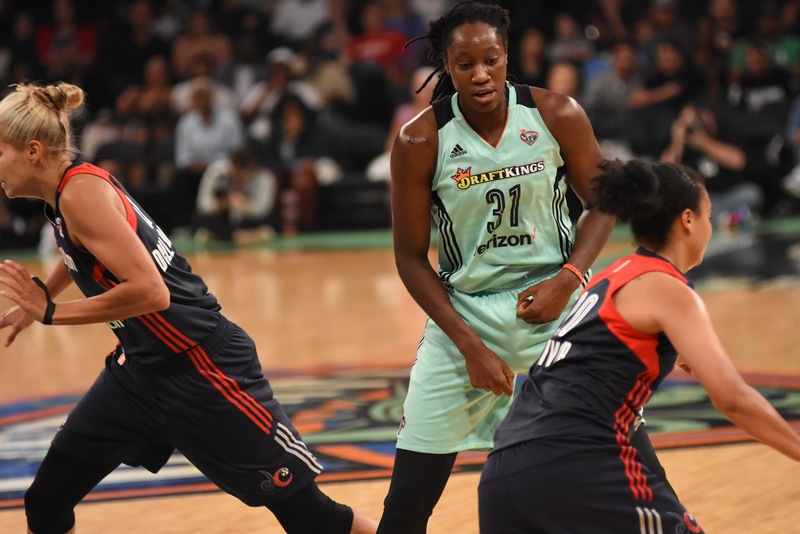 Howard finished with 12 markers and dished out eight assists. 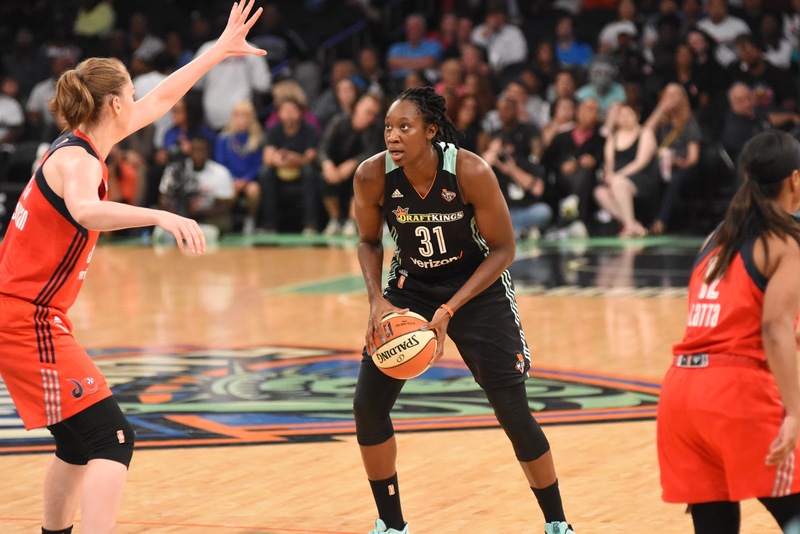 Bourama Sidibe and Marek Dolezaj scored 11 and 10 points respectively. 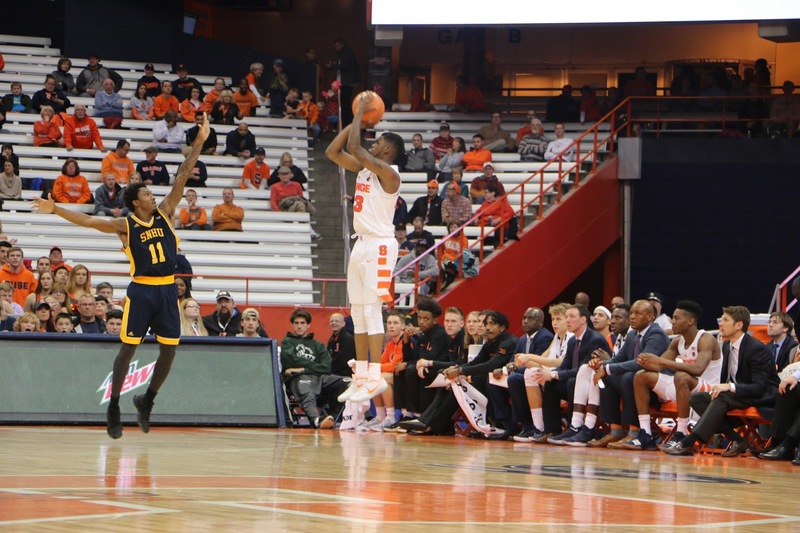 The Tigers were led by Donte Clark, who finished with 20 points. 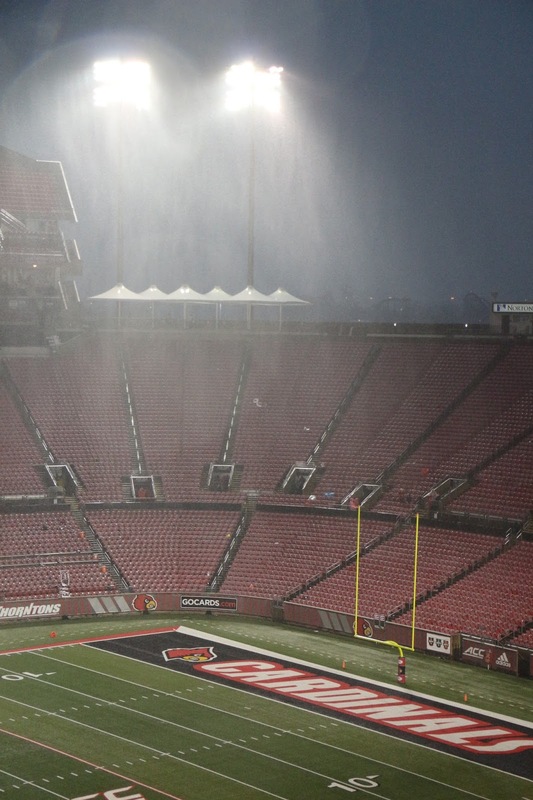 LOUISVILLE, Ky.–Weather delayed Saturday’s game, but not even Mother Nature was pouring it on as much as the Louisville Cardinals did on Syracuse in the Orange’s 56-10 loss at Papa John’s Cardinal Stadium in Louisville, Kentucky. 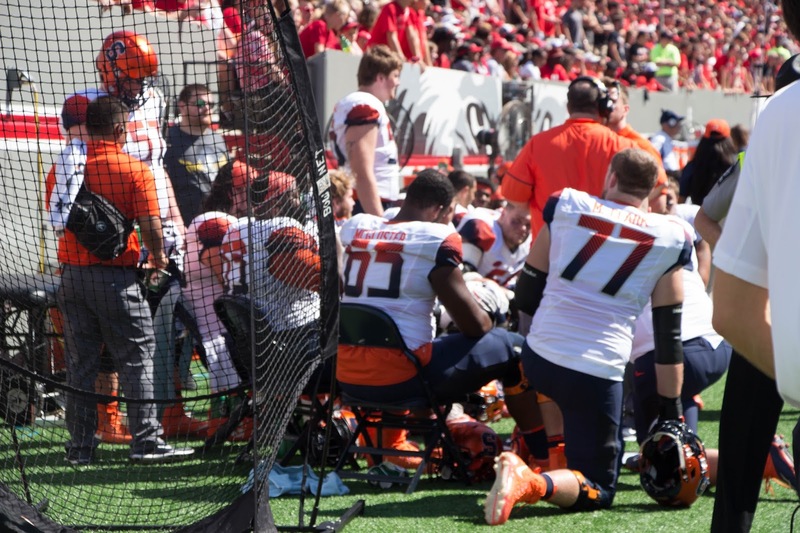 The team suffered its worst loss by point margin on the season, ending its chance for an automatic bid for a bowl game. The Cardinals got it done behind a powerfully balanced offensive attack. 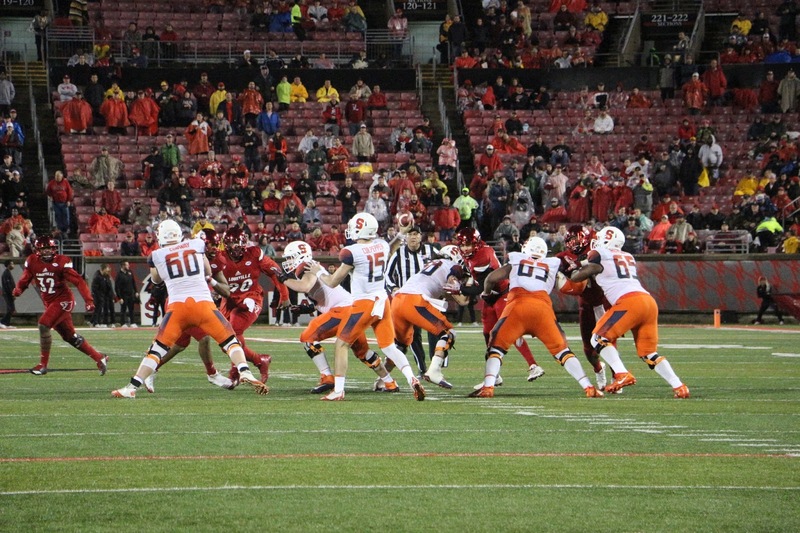 Louisville outgained Syracuse in total yards 727 to 335. 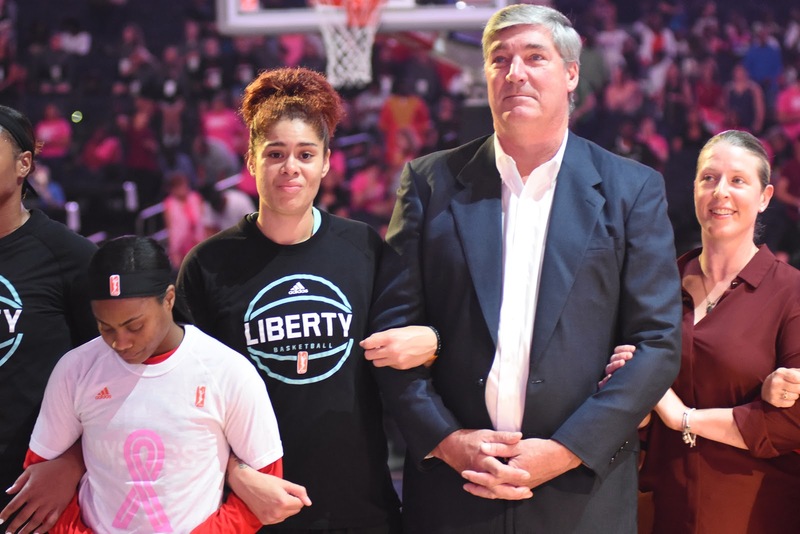 Louisville set the tone just 36 seconds into the Senior Day game with a senior. 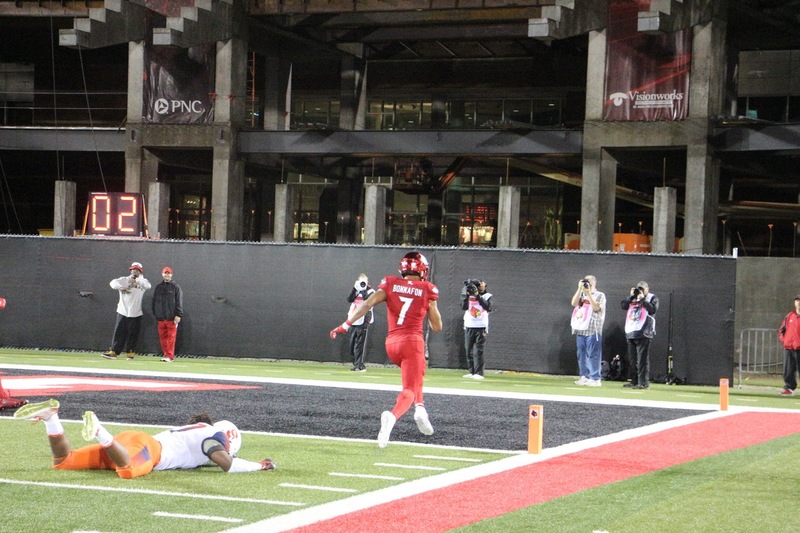 On the second play of the opening drive, Cardinals running back Malik Williams bolted into the endzone for a 43-yard rushing touchdown and a 7-0 lead. 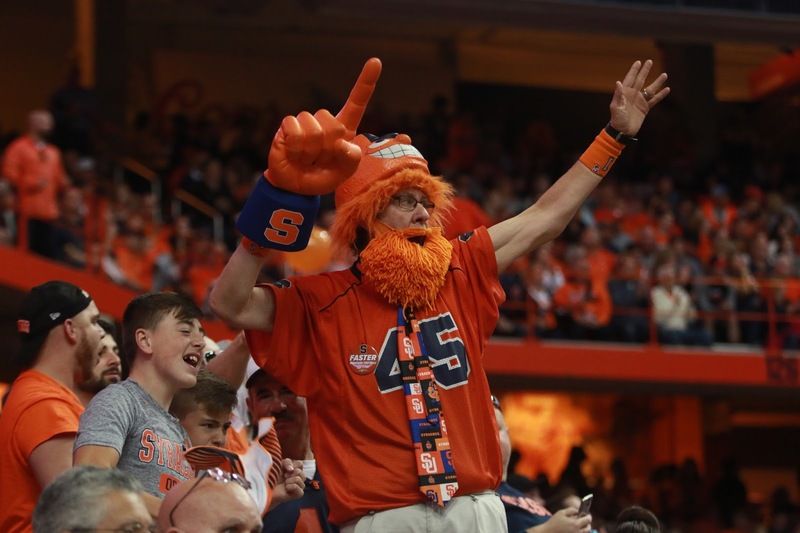 The Orange responded with a 51-yard field goal from Cole Murphy later in the quarter, but those were the only points Syracuse mustered in the first half. Just as quickly as the Cardinals opened up the first quarter, they did it again in the second. 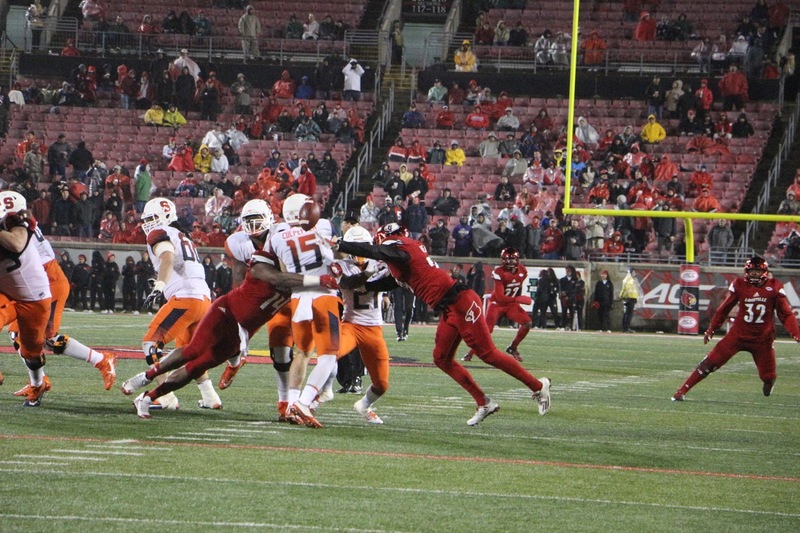 On the quarter’s opening play, Quarterback Lamar Jackson stiff armed a defender on his way to a 43-yard rushing touchdown to make it 14-3. Two minutes of game time later, running back Reggie Bonnafon added to the score with a 33-yard rushing touchdown to make it 21-3 as the crowd chanted his name. 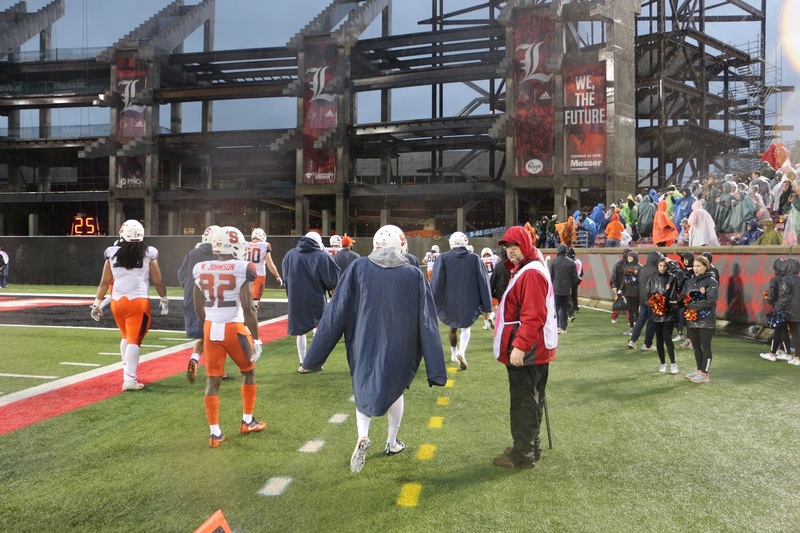 The game was postponed early in the second quarter due to lightning. The 43 minute delay couldn’t halt the Cardinals momentum. When play resumed, Jackson found wide receiver Jaylen Smith for a 72-yard strike with 5:50 left in the first half. 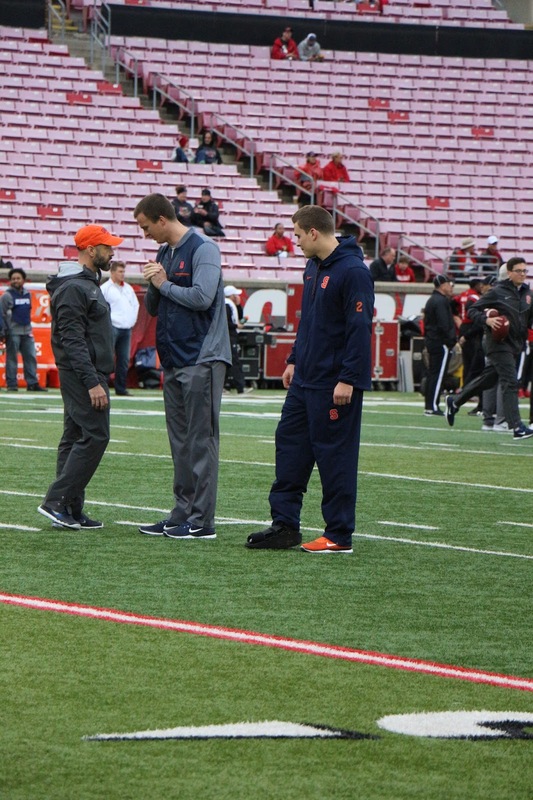 On the following drive, Syracuse third-string quarterback Rex Culpepper replaced Zack Mahoney, who was starting for injured Eric Dungey. 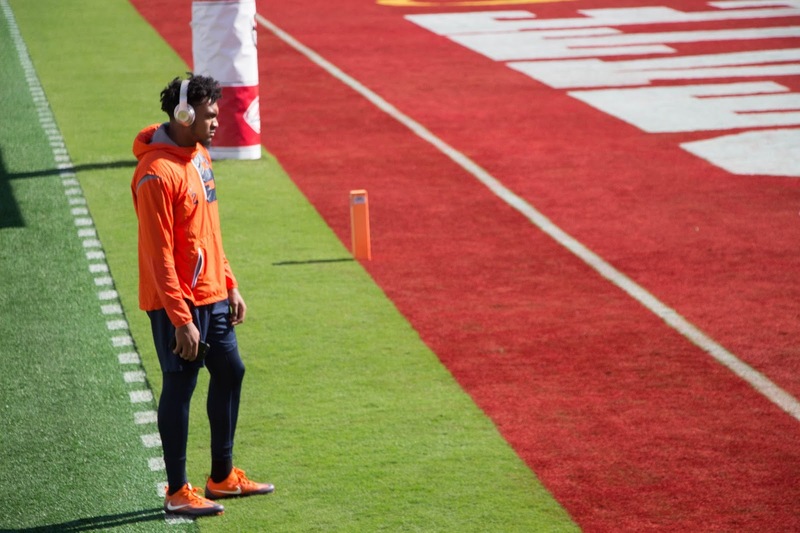 Mahoney was 5 of 15 for 49 yards with two interceptions when he was pulled. 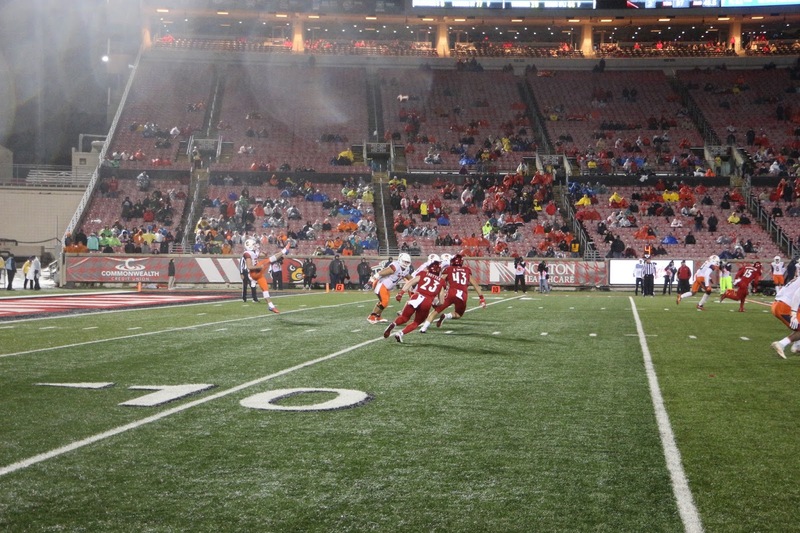 Louisville took a 35-3 lead at halftime. 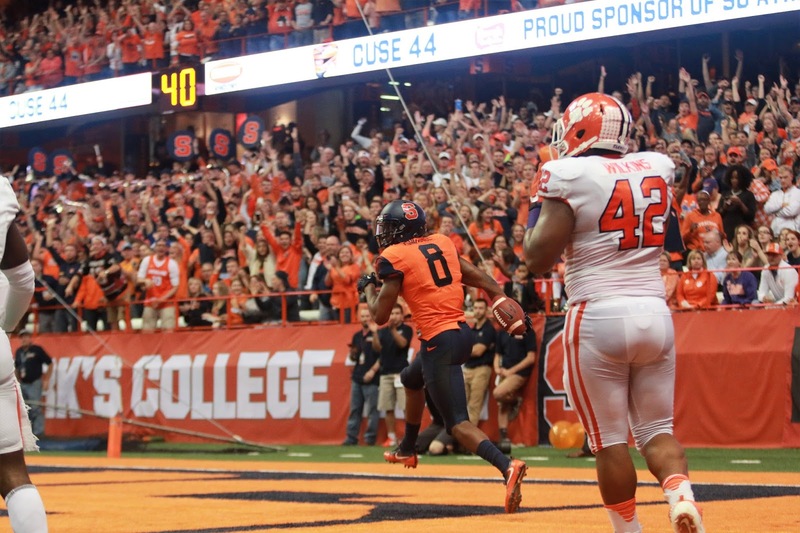 Syracuse was out-gained 450 yards to 148 at the break. 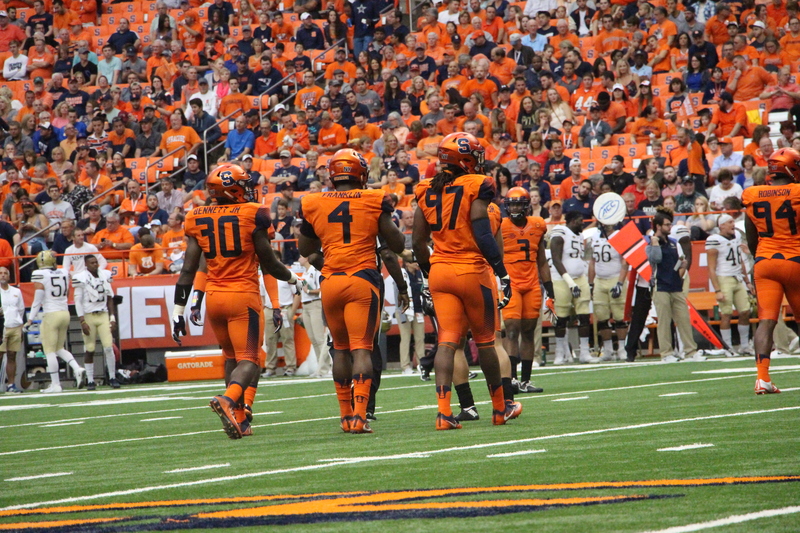 All the touchdowns Syracuse’s defense let up in the first half were for more than 30 yards. 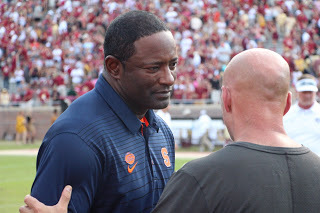 however, Culpepper threw an interception in the opening drive of the half. 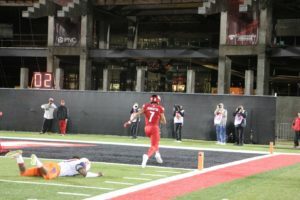 Louisville promptly scored 56 seconds later as Jackson twisted and turned for a 19 yard rushing touchdown making it 42-3. The Cardinals scored two more touchdowns in the half. Malik Williams ran through the Orange defense for a 56-yard touchdown in the third quarter. 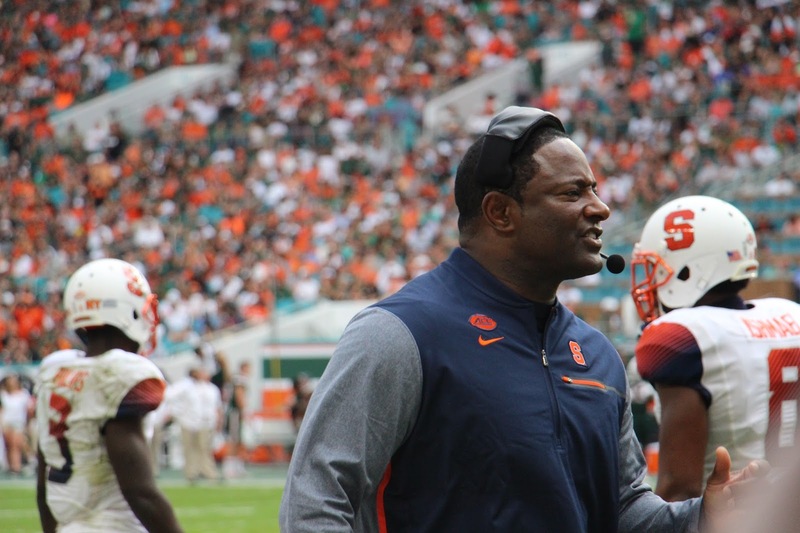 Williams had nine rushes for 181 yards and two touchdowns. It was the most rushing yards by a running back at Louisville since 2010. 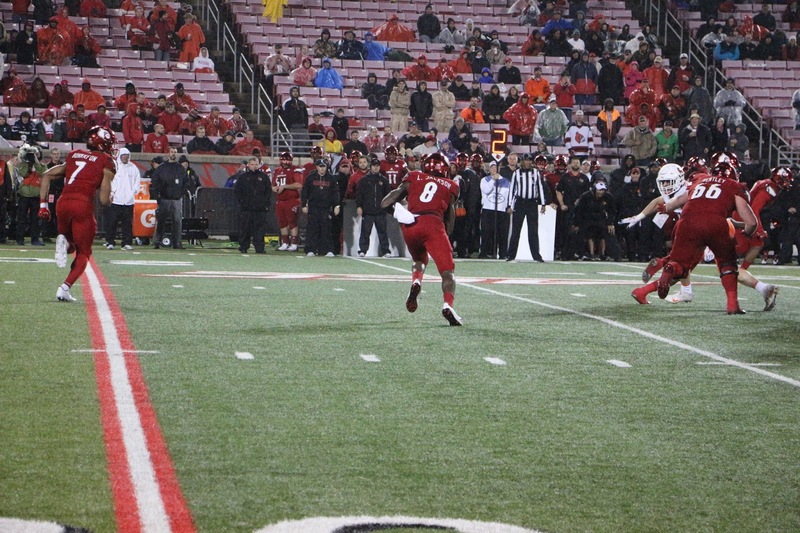 Backup Louisville quarterback Jawon Pass threw a touchdown to wide receiver Dez Fitzpatrick to make it 56-3 in the fourth. 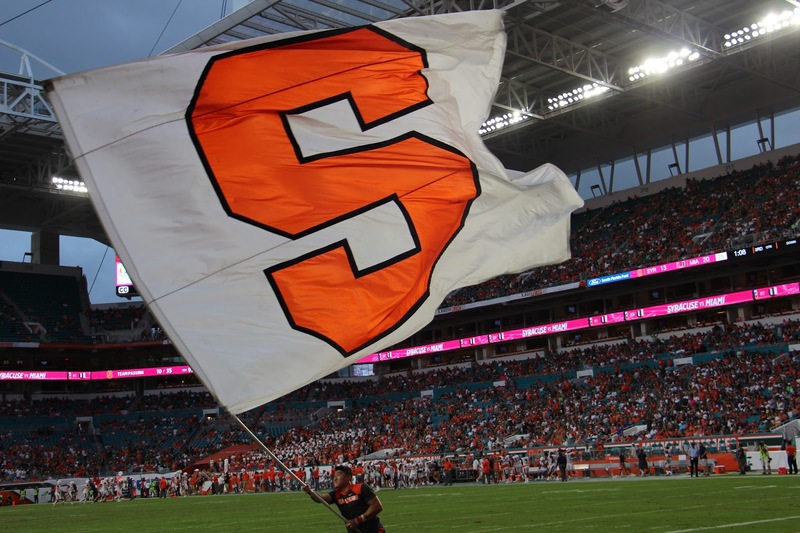 The Orange scored an eight yard, Ervin Phillips rushing touchdown with about five minutes left in the game to make it 56-10. 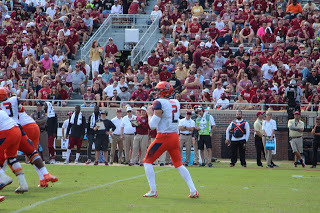 Rex Culpepper finished the game 8-19 for 89 yards with two interceptions. 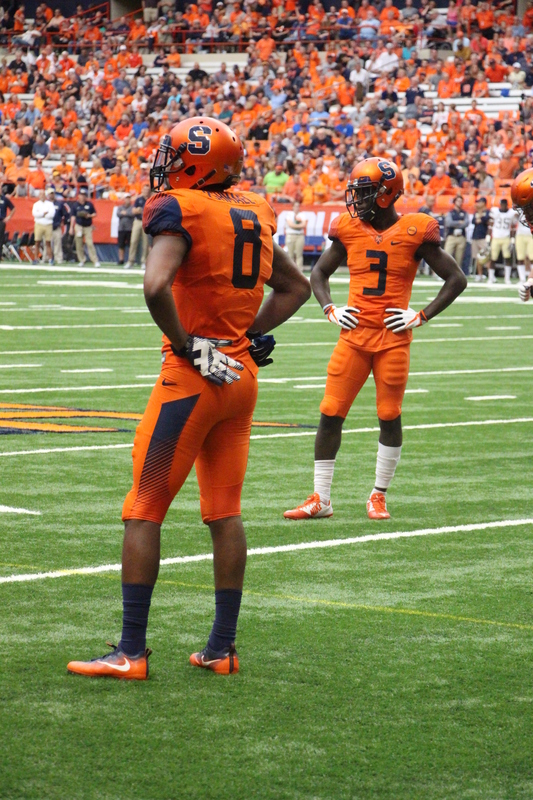 Syracuse boasts the top active receiving duo in NCAA football with wide receivers Steve Ishmael and Ervin Phillips. They struggled to find space today, combining for only four catches and 42 yards. 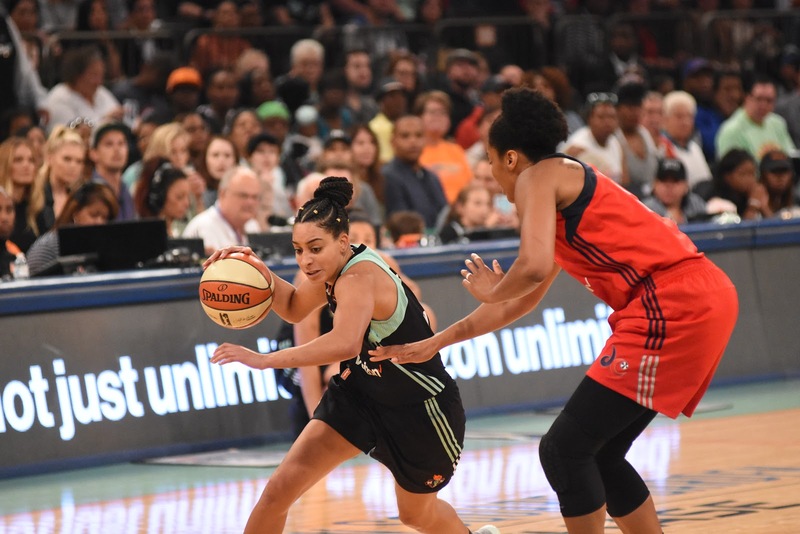 It was the duo’s lowest combined total of the season. 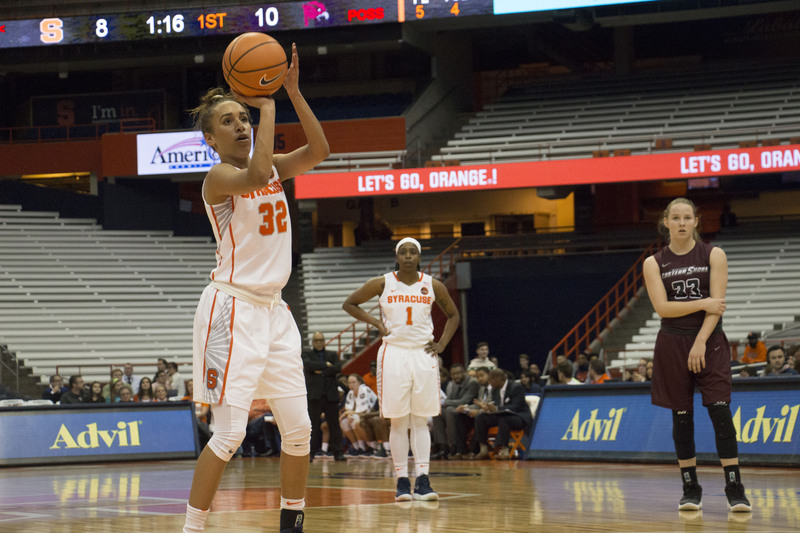 The Orange allowed over 50 points for the second straight game, allowing 110 points in total to Wake Forest and Louisville. 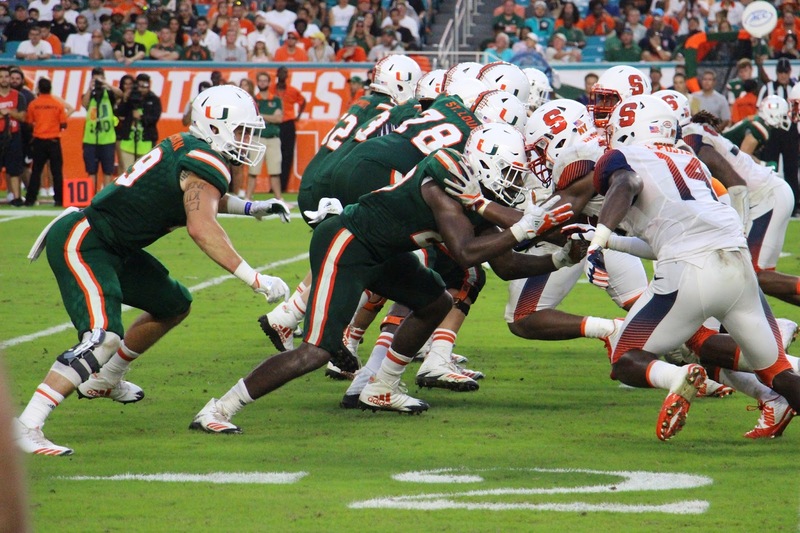 The defense has let up over 700 yards in both of the last two games. They allowed 734 yards to Wake Forest and 727 to Louisville. 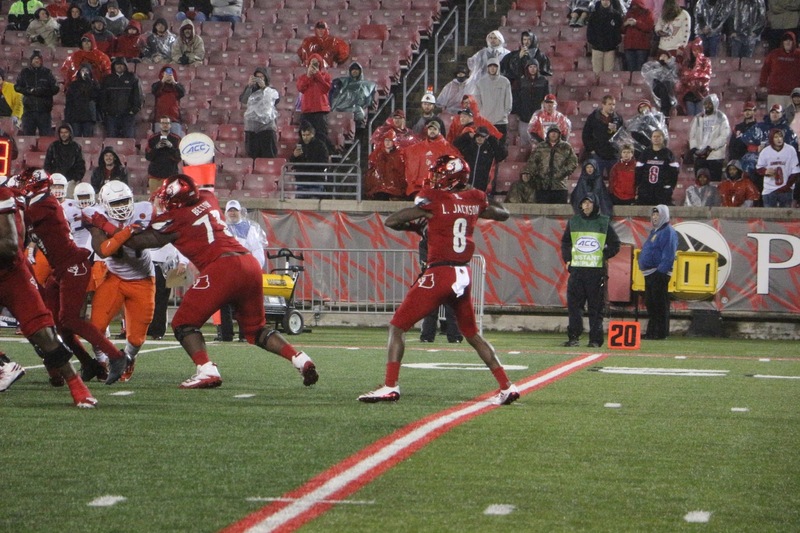 Lamar Jackson had quite the day for Louisville and set school records along the way. Jackson went 14-26 for 270 yards and two touchdowns. He ran 12 times for 111 yards and two touchdowns. 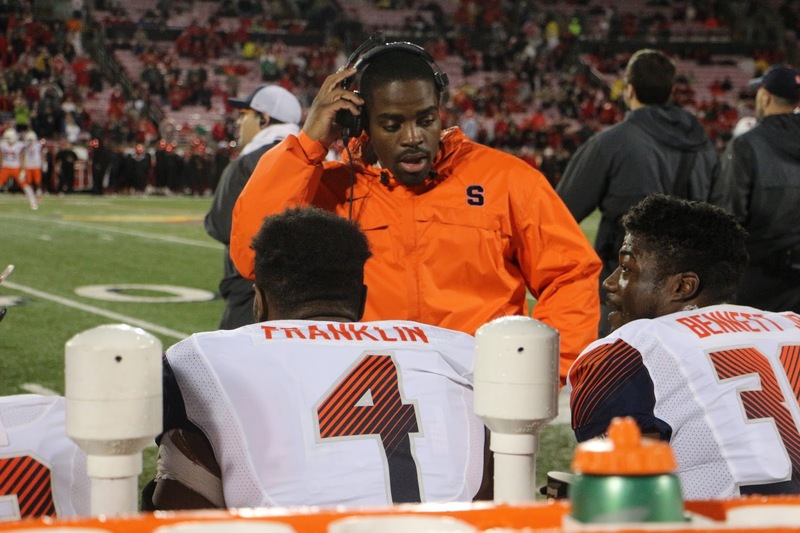 “Today he made plays that people can’t make other than him,” Syracuse linebacker and team captain Zaire Franklin said. He broke the school record for most total yards in Louisville Cardinals history. He passed Chris Redman’s total of 12,474 yards. 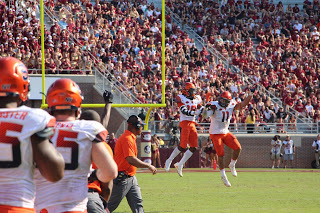 As starting running back Dontae Strickland sat out due to injury, his backup Moe Neal rushed for a season high 98 yards. 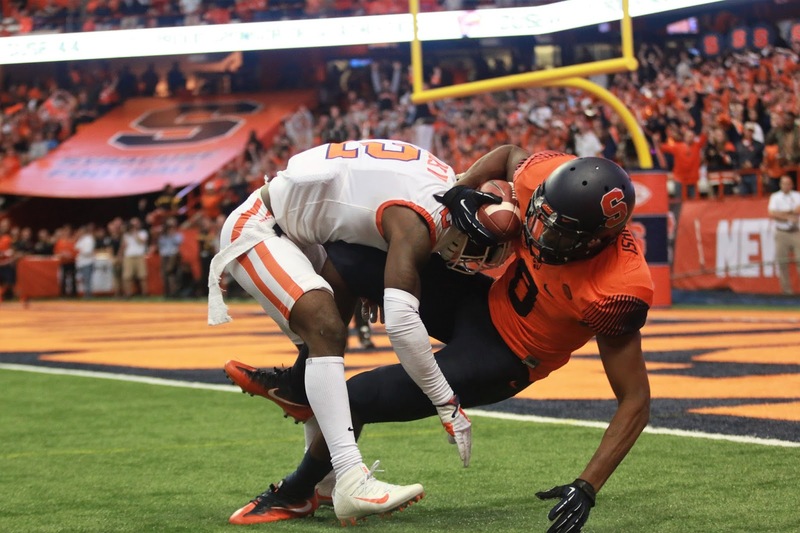 Steve Ishmael ties former Orange wide receiver Amba Etta-Tawo’s single-season record for receptions at 94 that was set in 2016. 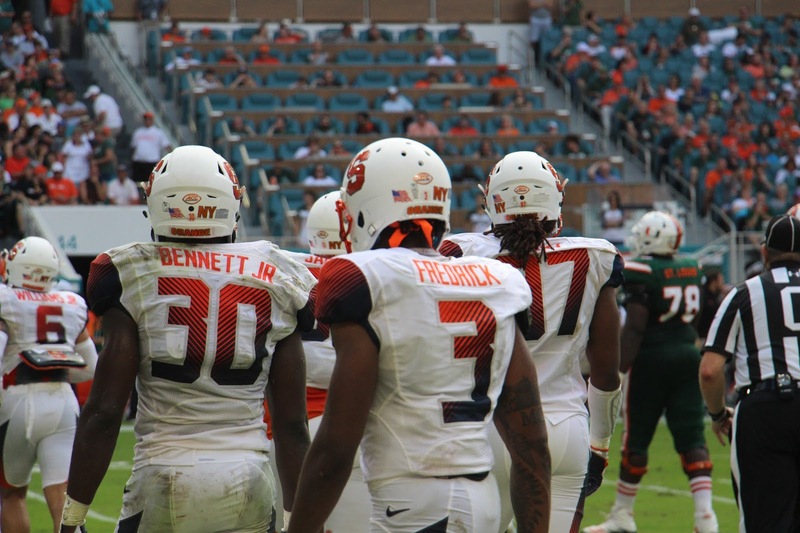 On defense, linebacker Zaire Franklin recorded his 300th career tackle. 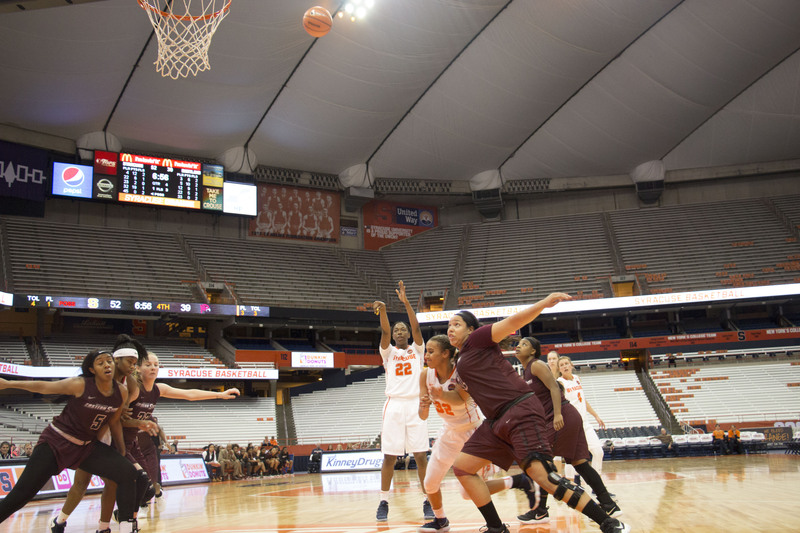 The Orange plays its final game of the year against Boston College next Saturday in the Carrier Dome. 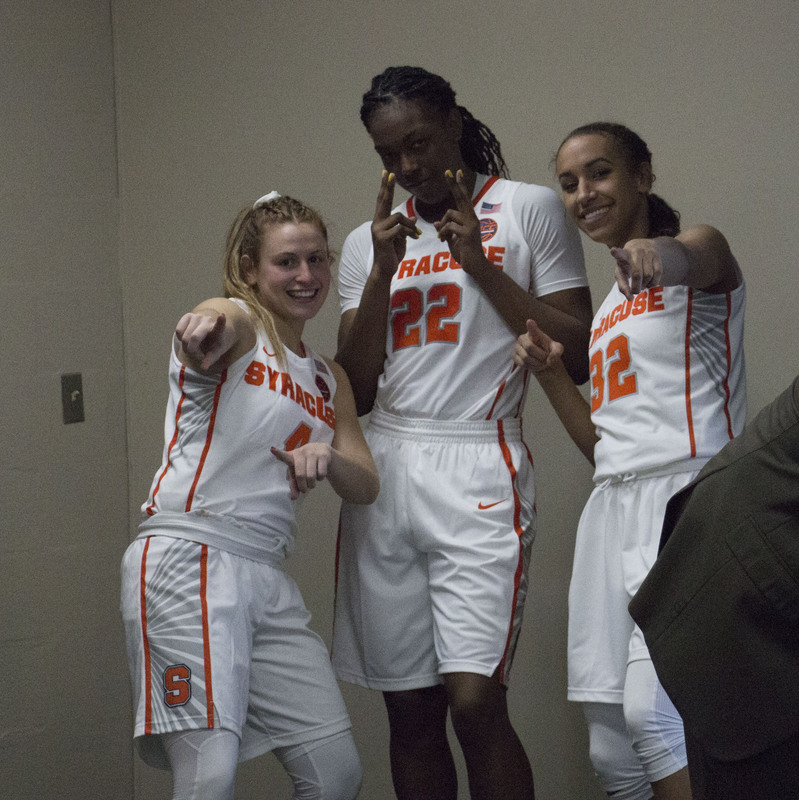 It will be Senior Day for Syracuse. 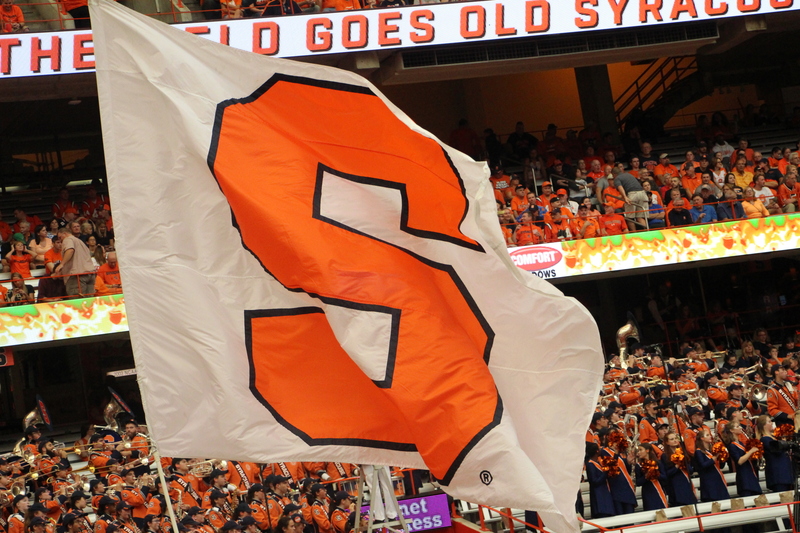 Syracuse is no longer eligible for an automatic bid for a bowl game. 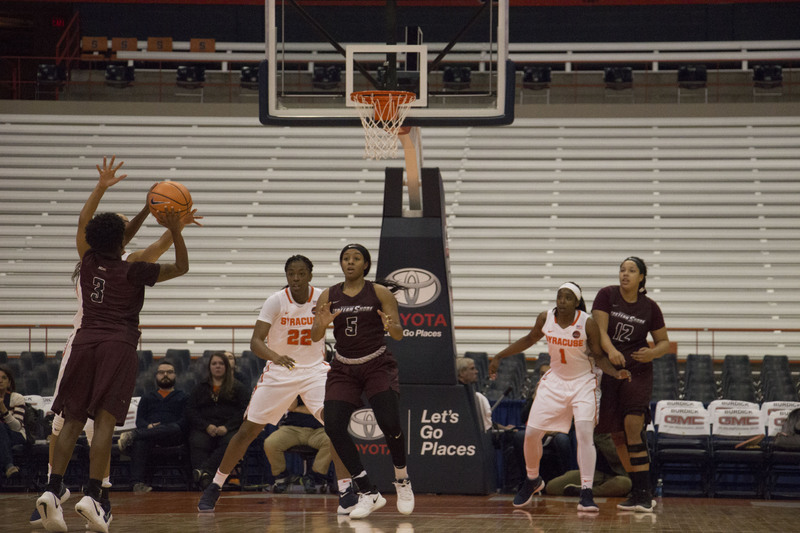 Syracuse, N.Y. – The Syracuse Orange women’s basketball team (2-0) topped the Maryland Eastern Shore Hawks (1-2) 68-45, winning their second of four straight home games. 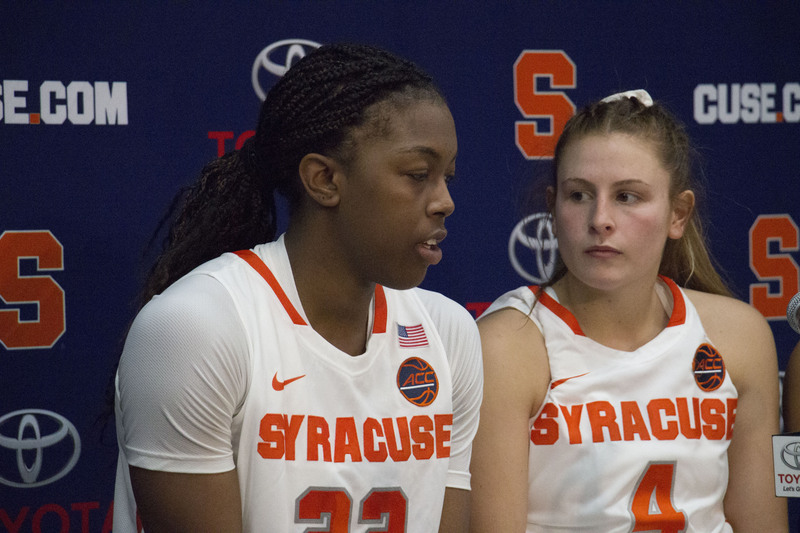 Sophomore point guard Tiana Mangakahia looked sharp, spreading the ball around for ten assists and redshirt junior forward Miranda Drummond led the way in scoring, recording 19 points on an efficient five of nine shooting night. 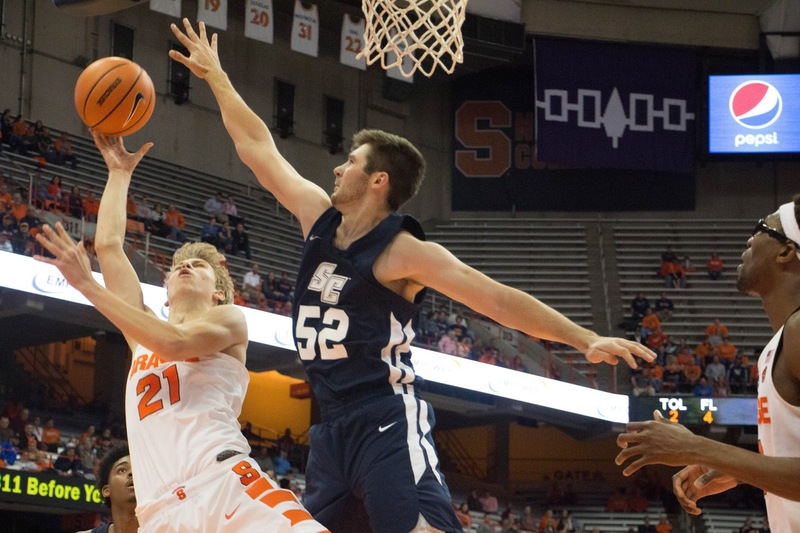 Syracuse got off to a hot start defensively holding MDESW to just 10 points and 35-percent shooting from the floor. 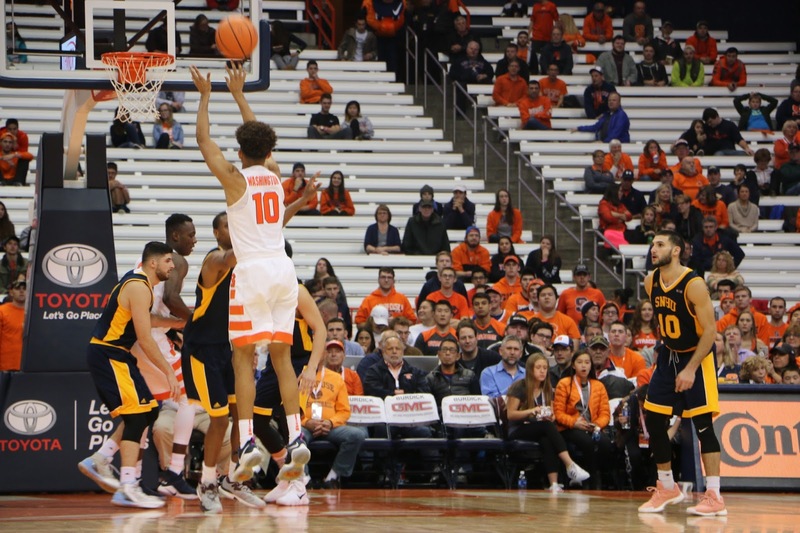 The Orange’s defensive effort translated into early offense, converting ten first-quarter turnovers into eight points on the other end. 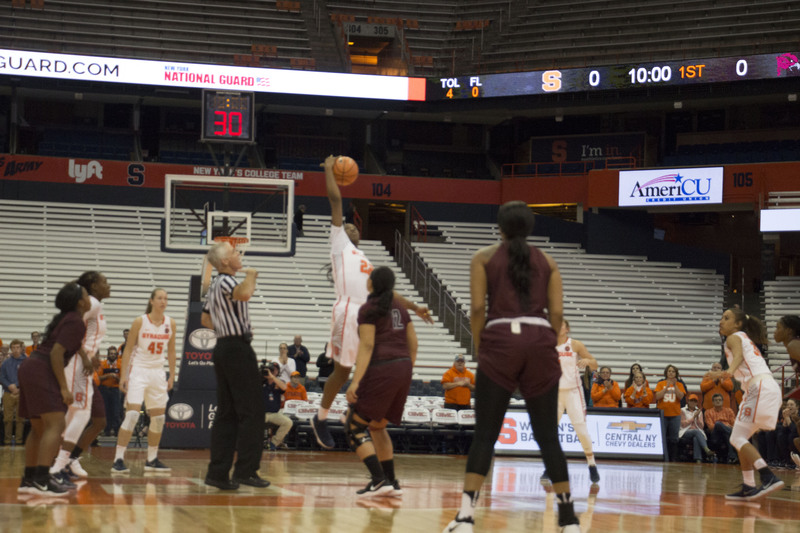 In the second period, Jasmine Nwaje sparked a 10-0 run with a jumper at the 6:11 mark and after an Isis Young layup in the final seconds, Syracuse closed the half with a 37-28 advantage. 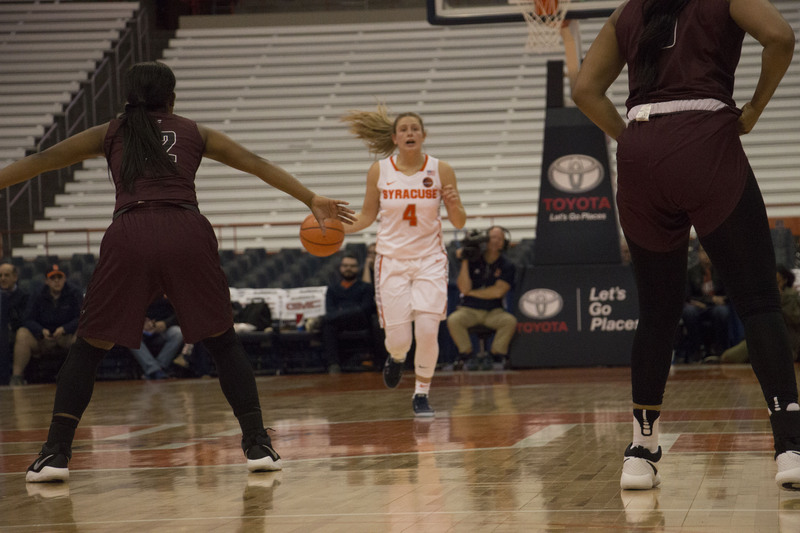 In the fourth, the Orange got out on another run, this time a 12-point advantage capped by a Mangakahia lay-up as the guard tallied her final two points, finishing with 16 on the night—recording her first double-double of the season. 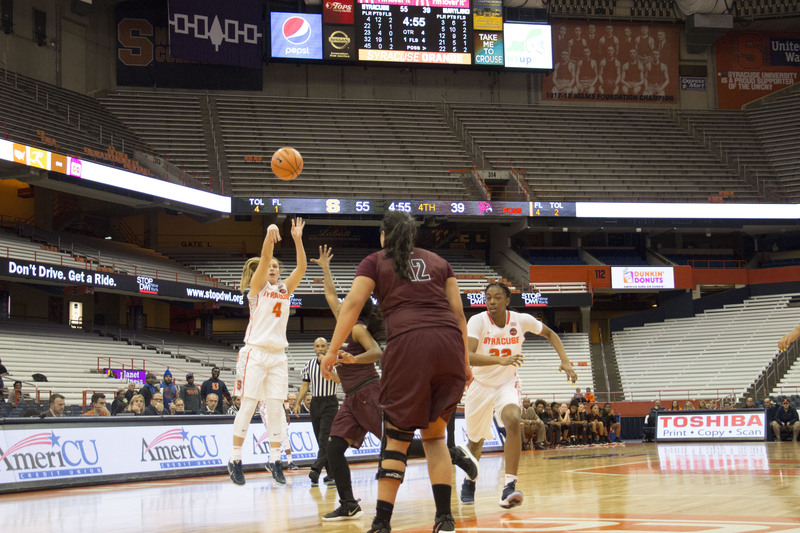 Freshman Nikki Oppenheimer drained a 3-point dagger in the closing moments of the fourth, giving the Orange a comfortable 24-point lead. 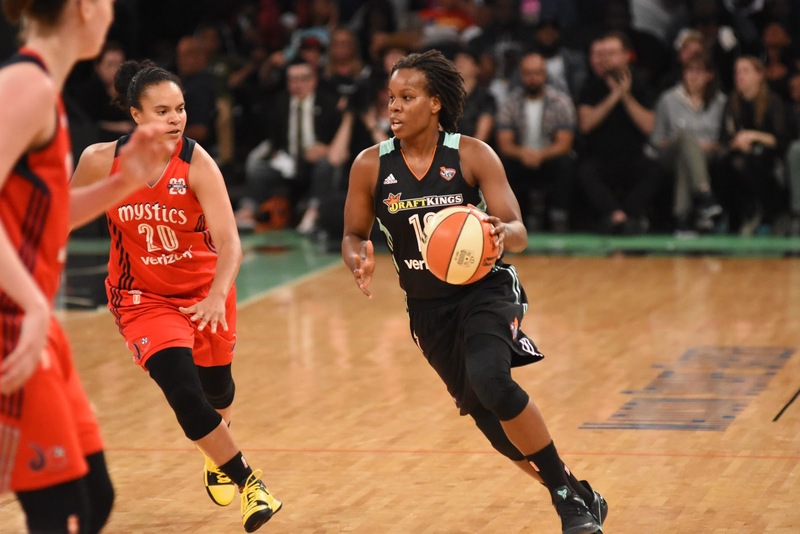 Miranda Drummond’s 19-point night helped her lead both teams in player efficiency at a rate of 19.0. Drummond started slow, shooting just one for four in the first quarter. 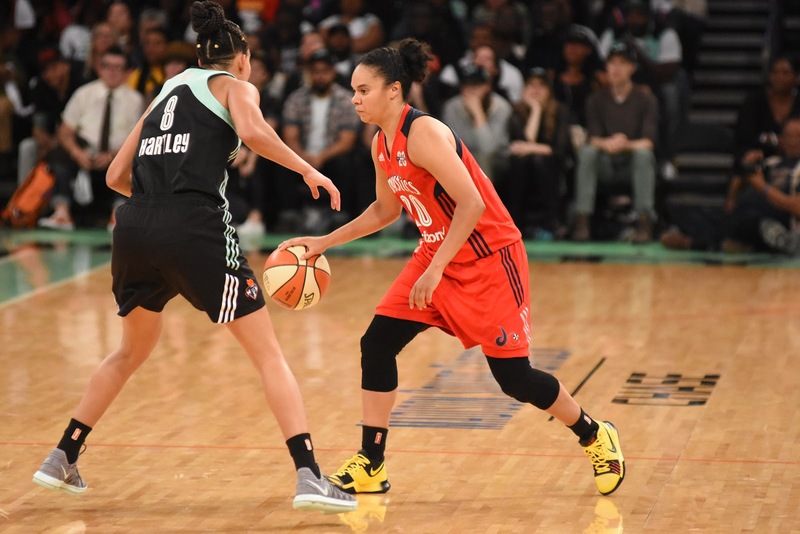 Her sluggish shooting night didn’t last long, scoring 13 points in the second quarter. 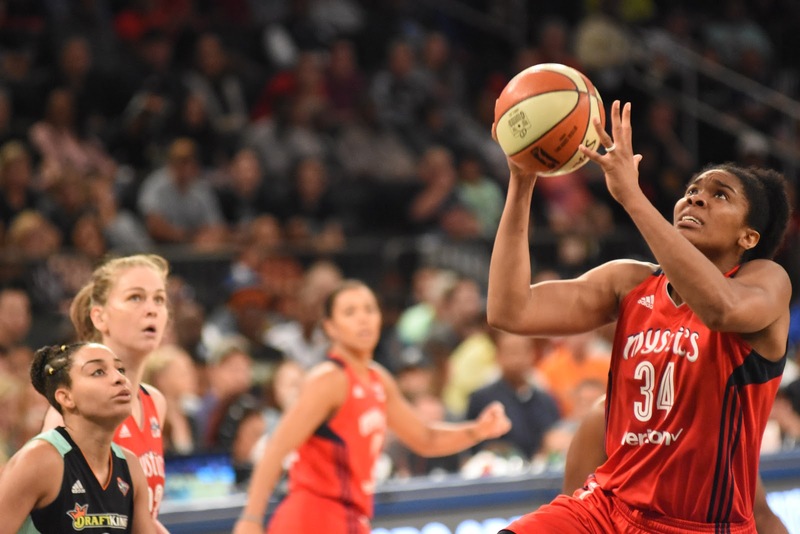 “Seeing that first one go down definitely helps.” Drummond said. 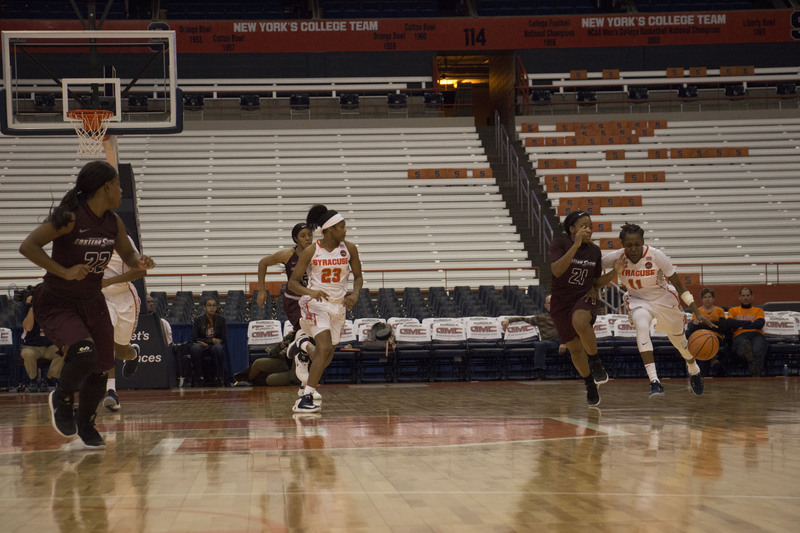 Syracuse out-rebounded Maryland Eastern Shore 51-33 and picked up 12 offensive boards in the game. 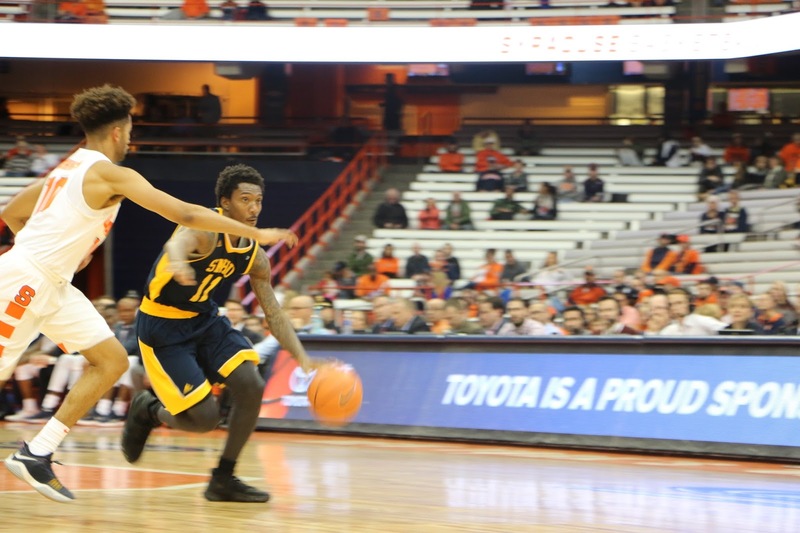 Mangakahia finished with ten assists tonight for the second game in a row. 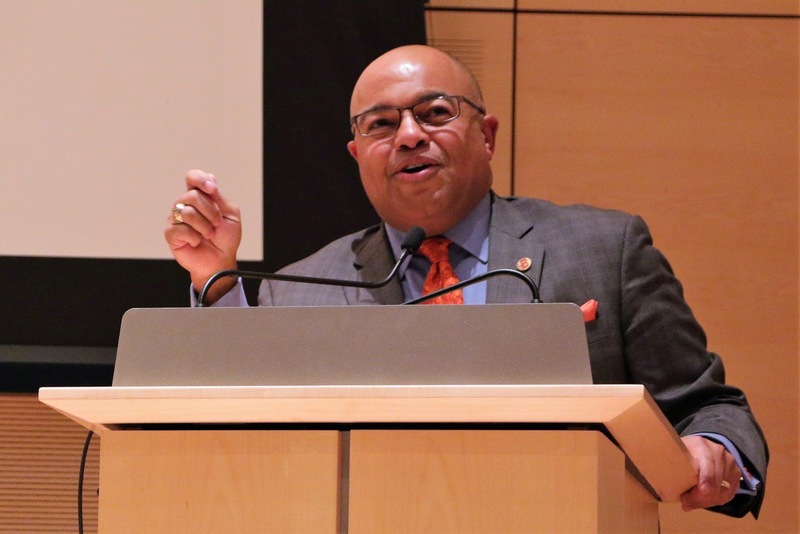 Syracuse, N.Y. – When Mike Tirico is behind a microphone calling a Notre Dame football game for NBC or hosting Football Night in America, he usually has a tremendous amount of notes prepared, ready to deliver any information at a moment’s notice. 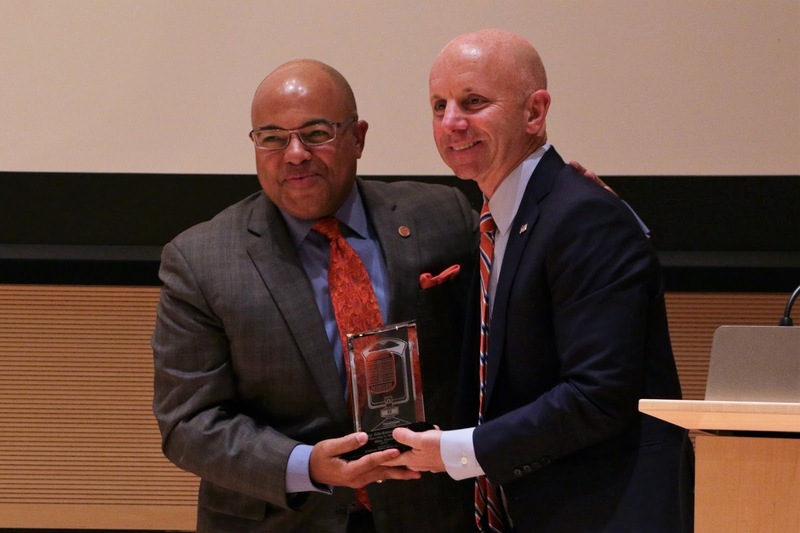 That was not the case Tuesday night when he accepted the Marty Glickman Award for Leadership in Sports Media. 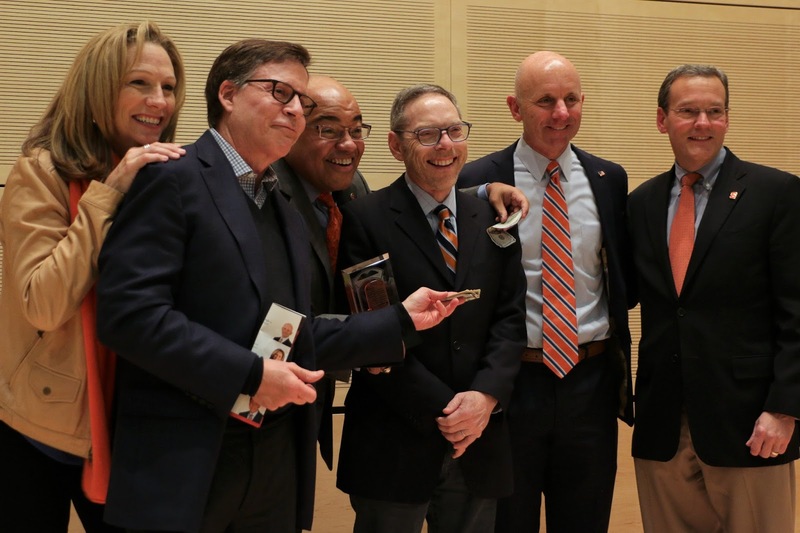 “I sat next to Beth (Mowins) and pulled out a notecard and said, ‘Beth, look what I’ve prepared,'” Tirico told the audience in the Joyce Hergenhan Auditorium at Syracuse University’s Newhouse School during his acceptance speech. 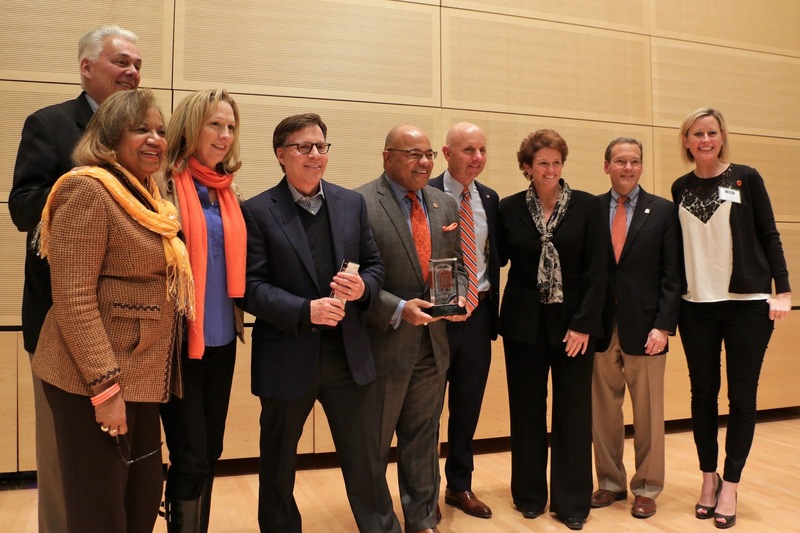 Tirico, who graduated from Syracuse in 1988, is the fifth person to receive the award, joining Bob Costas, Marv Albert, Beth Mowins, and Sean McDonough. 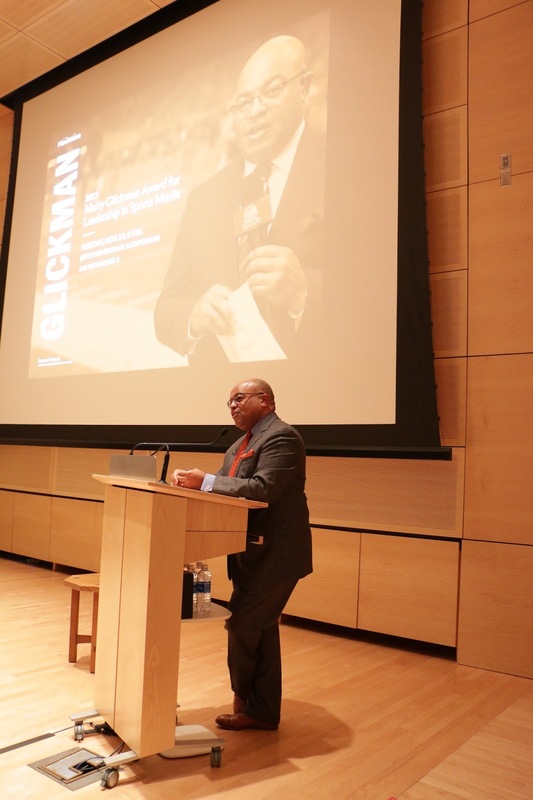 The award is named after Marty Glickman, an Olympian and 1939 alumnus who later became a trailblazer as a sports announcer. 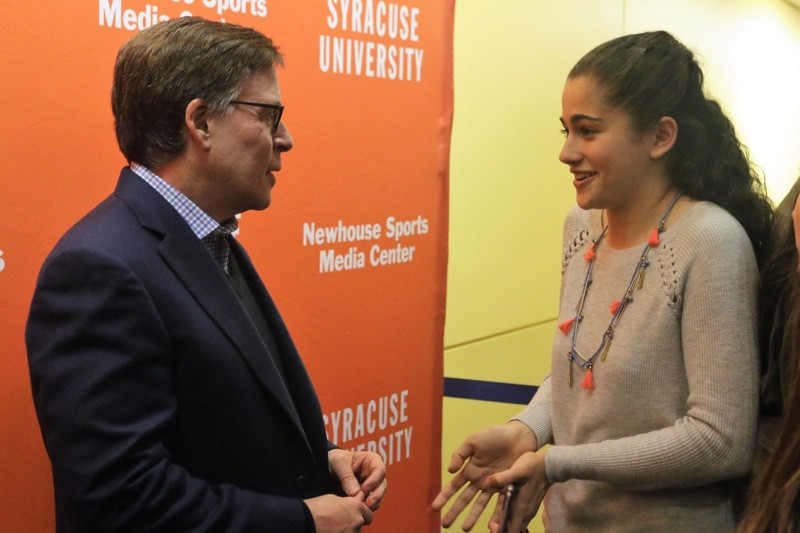 He is credited with being the person who started the long line of successful sports media professionals who attended Syracuse. 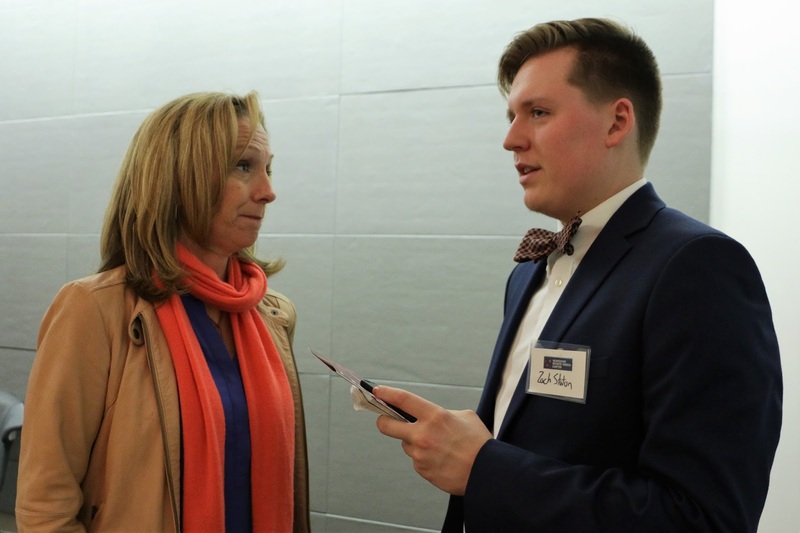 Albert, a Glickman protégé, said his mentor would be proud of Tirico. 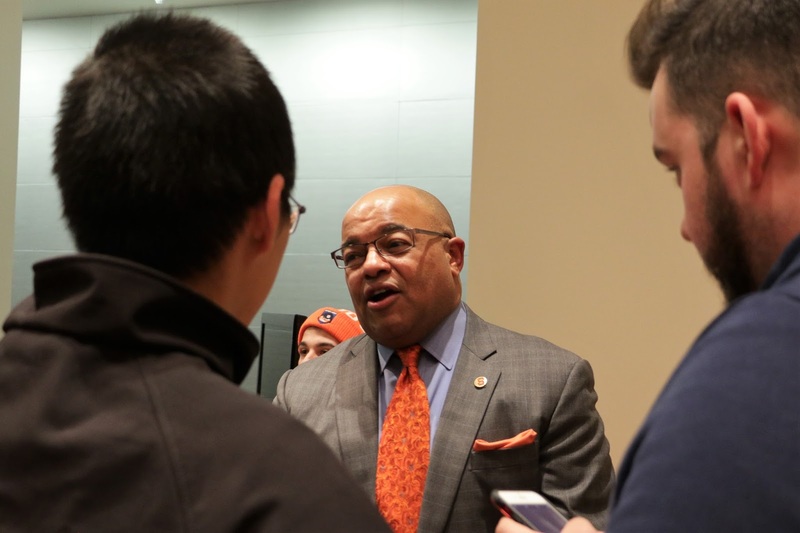 Tirico’s career has spanned more than 30 years, starting in Syracuse a rerporter and then sports director at WTVH-TV while serving as the play-by-play voice for SU football, basketball, lacrosse, and volleyball. 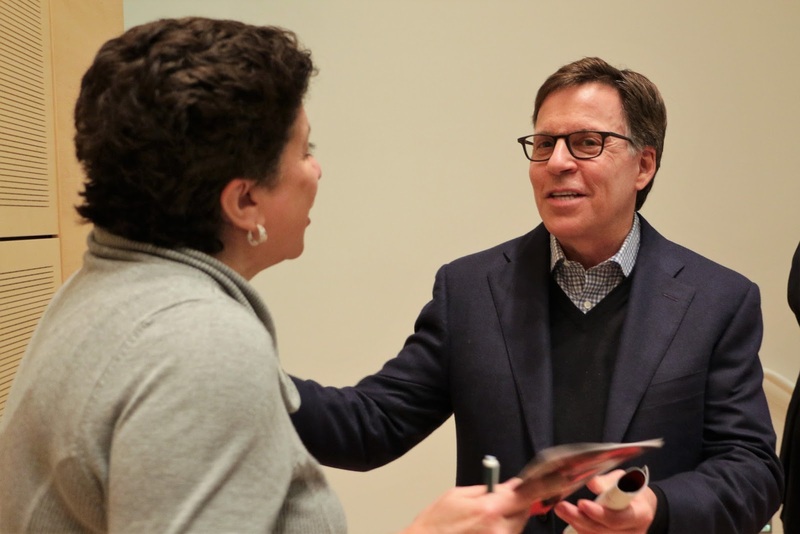 He then moved on to ESPN, where he spent the next 25 years in various roles, including the voice of Monday Night Football for nine seasons. He also broadcaste events such as The Open, The Masters, FIFA World Cup, Wimbledon, and tennis’ U.S. Open. 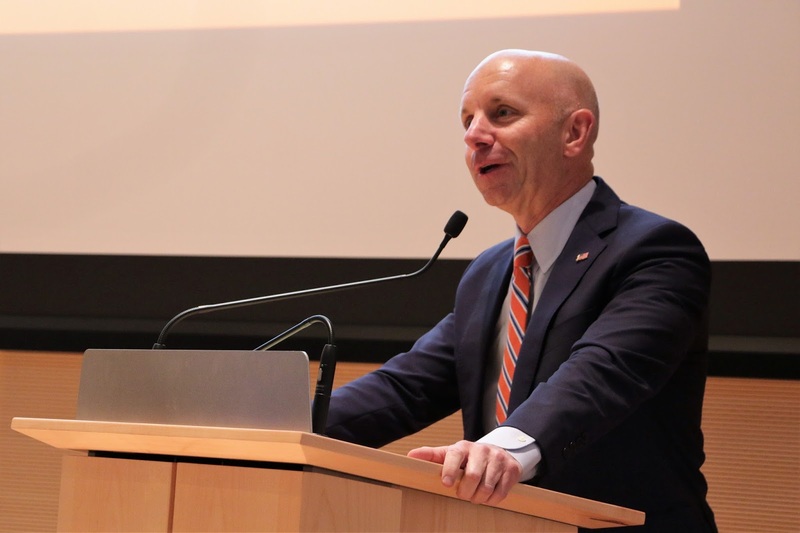 In July 2016, he made the move to NBC Sports Group, where he is now the voice of Notre Dame Football and NBC’s broadcasts of Thursday Night Football and the on-site host forFootball Night in America and Sunday Night Football. In 2018, he will become the primetime host for the Olympics, a position previously held by Costas, starting with the winter games held in PyeongChang, South Korea. 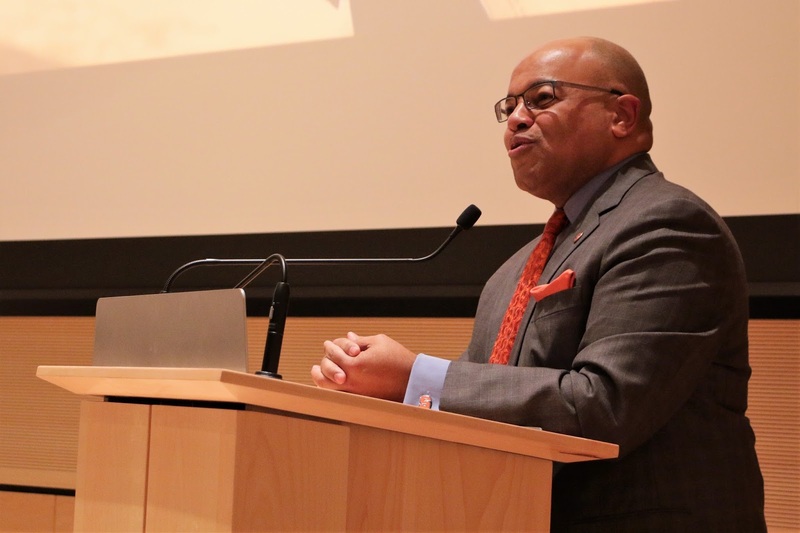 After such a long stint with ESPN, Tirico said he didn’t know what to expect from the transition to a new company. 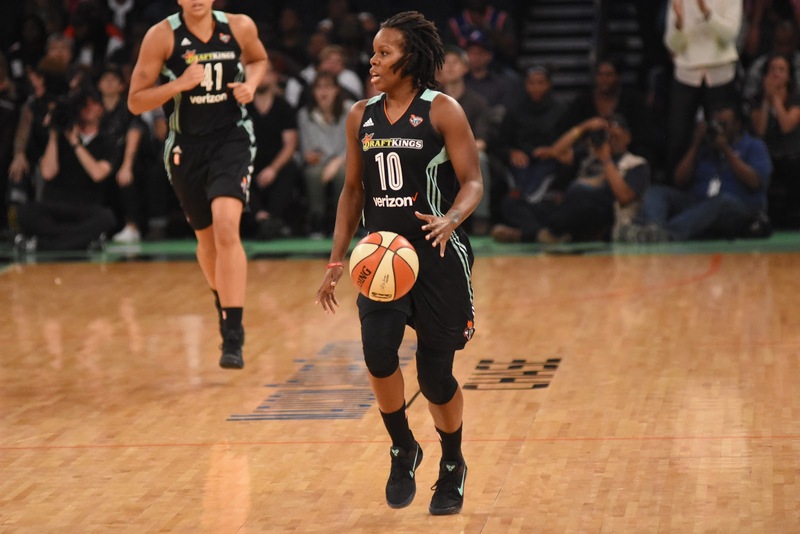 McDonough, last year’s recipient, presented the award. 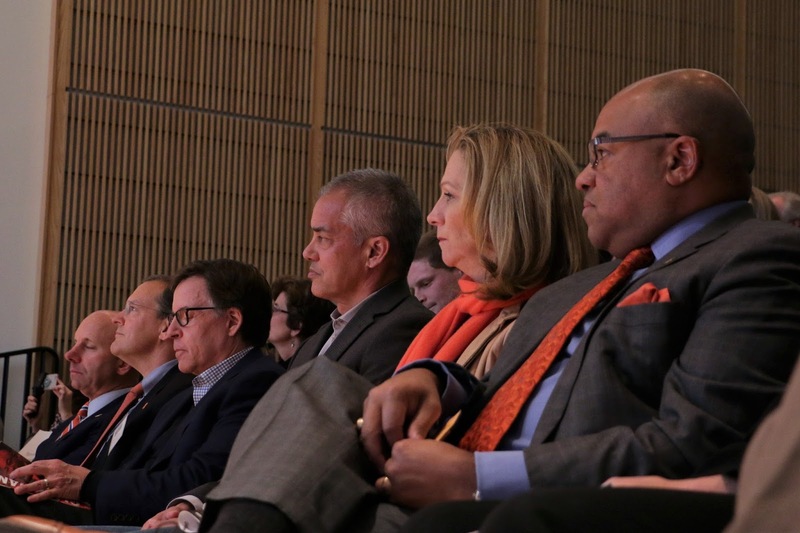 He took over the play-by-play duties for Monday Night Football when Tirico left for NBC. 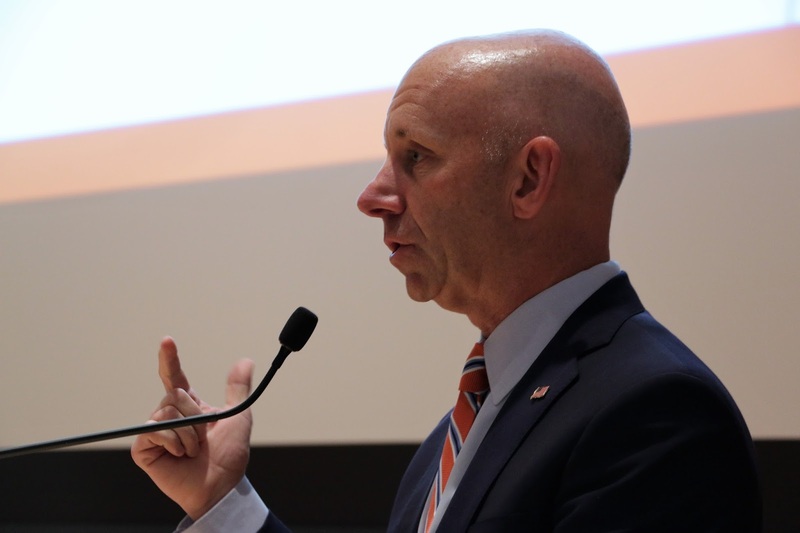 He kept McDonough informed on his possible move to a new company, hinting that it could lead to a promotion for McDonough. Moving seemed to be a theme in the pair’s friendship. 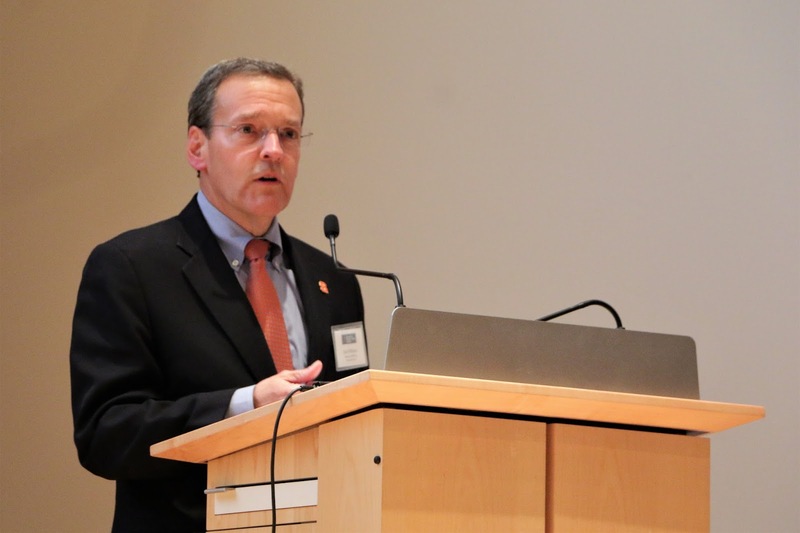 Right after graduating in May 1984, McDonough took his first job in Boston. 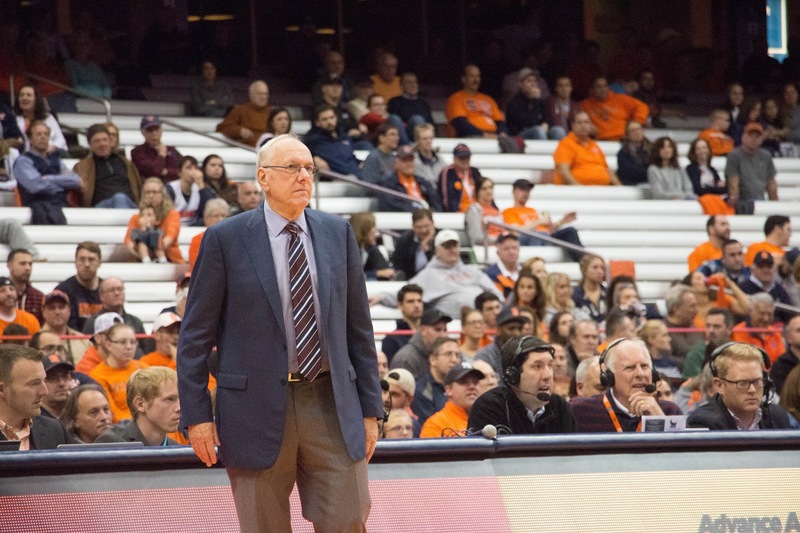 The staff at WAER, the university-licensed radio station where McDonough worked during his time at Syracuse, decided to help him move to his new apartment. 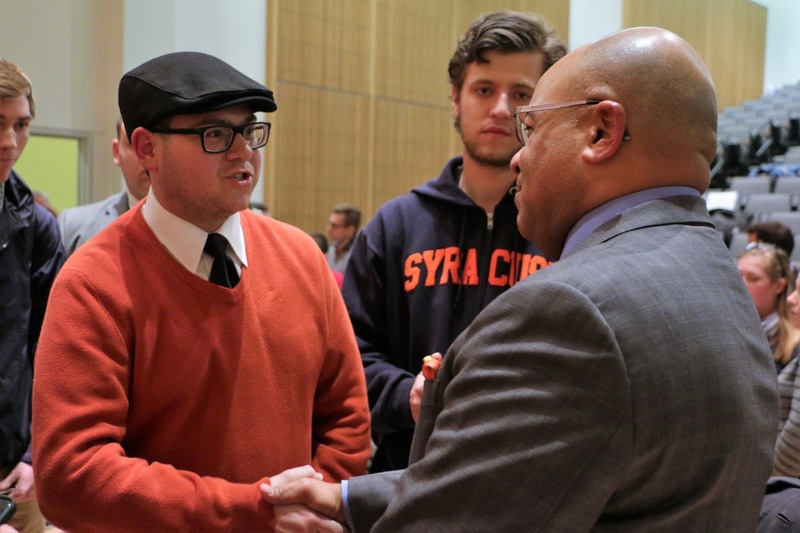 Part of the moving crew: Mike Tirico, a freshman who started in September 1984. 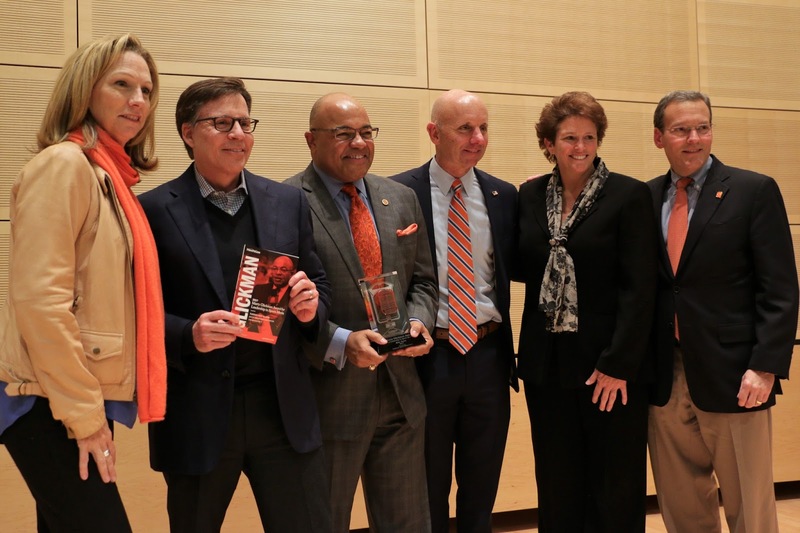 Tuesday night’s ceremony also marked the first time that all three of Tirico, McDonough, and Mowins had been together since Mowins became the first female to announce Monday Night Football. 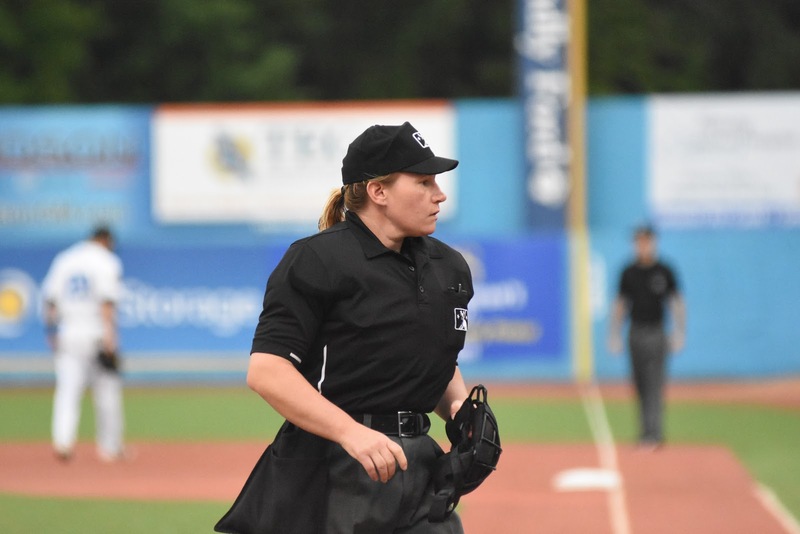 When she learned the news she would be on the call for the second game of ESPN’s doubleheader, the first people she contacted were in Tirico and McDonough. 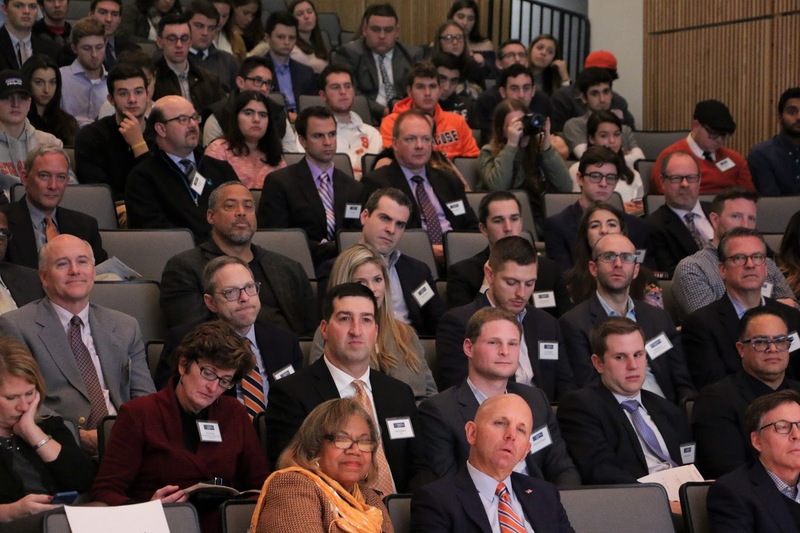 Their advice to Mowins was simple: “Be yourself.” The fact that three Newhouse graduates were following each other in the booth was something all three took seriously. 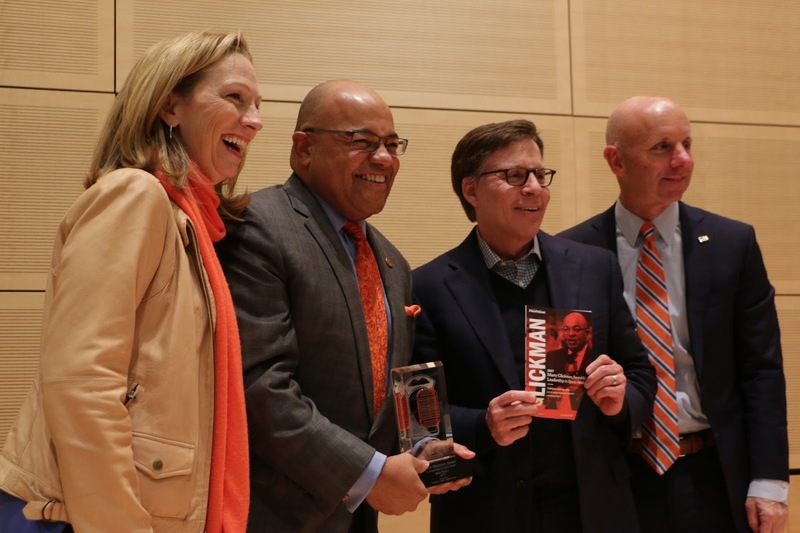 Tirico called Mowins the “premier glass-ceiling breaker in this business of all-time.” However, it was an indirect tie that Tirico said will always leave him indebted to Mowins. Perhaps the unknown sacrifice came to provide Mowins with good karma later on. 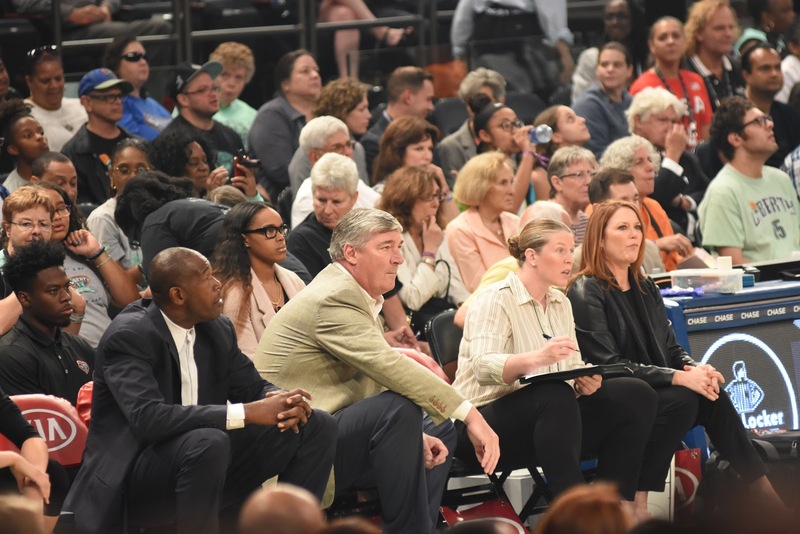 Before Mowins went to work for ESPN, she interned at WTVH-TV whileTirico was there. 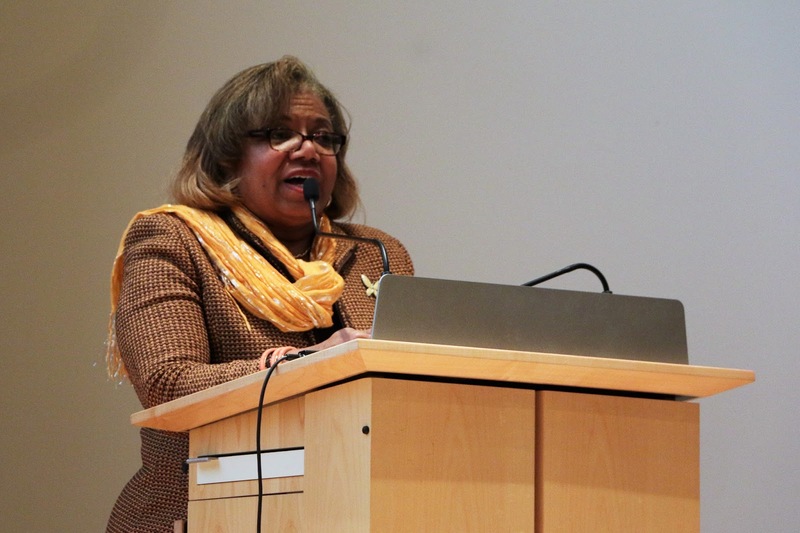 She remembered the experience helped her see how to prepare for broadcasts and how to work with others in the business. 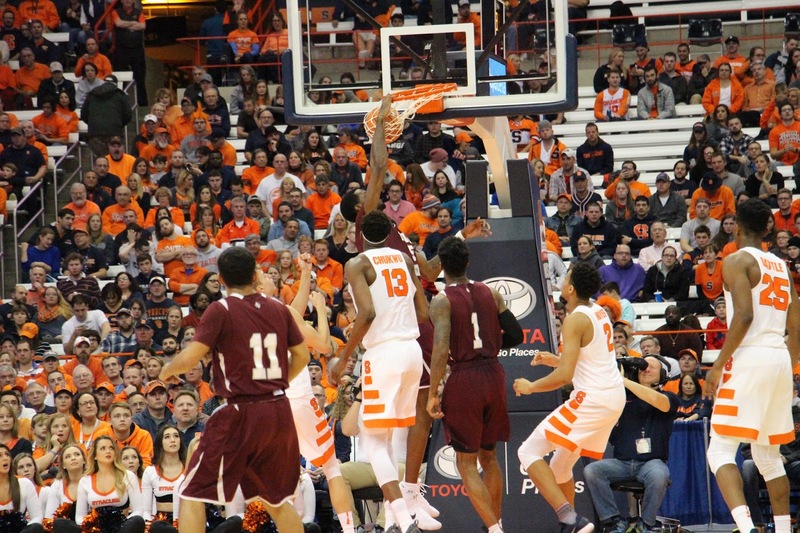 SYRACUSE, N.Y. — Sophomore Tyus Battle led the Syracuse Orange to victory against the Iona Gaels 71-62 at the Carrier Dome Tuesday night. 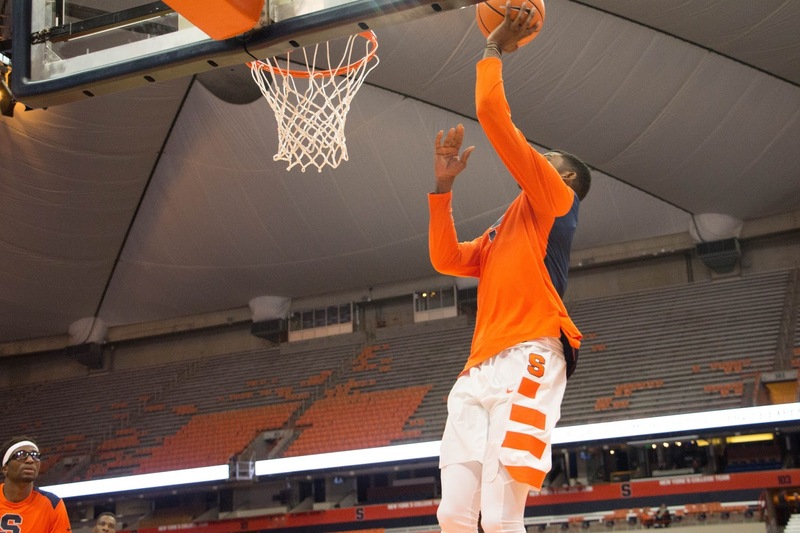 He finished with a career-high 28 points along with five rebounds and three assists. 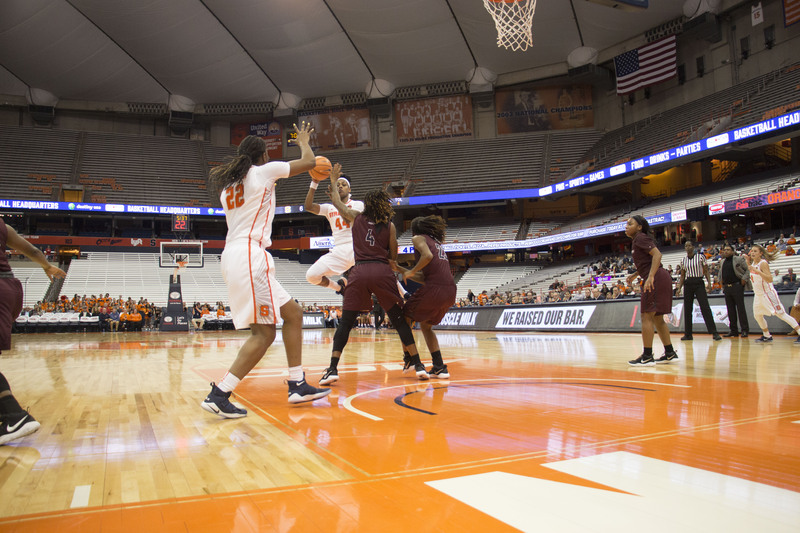 Coming off a season-opening win against Cornell, Syracuse (2-0) struggled against the matchup defense by Iona (0-2). 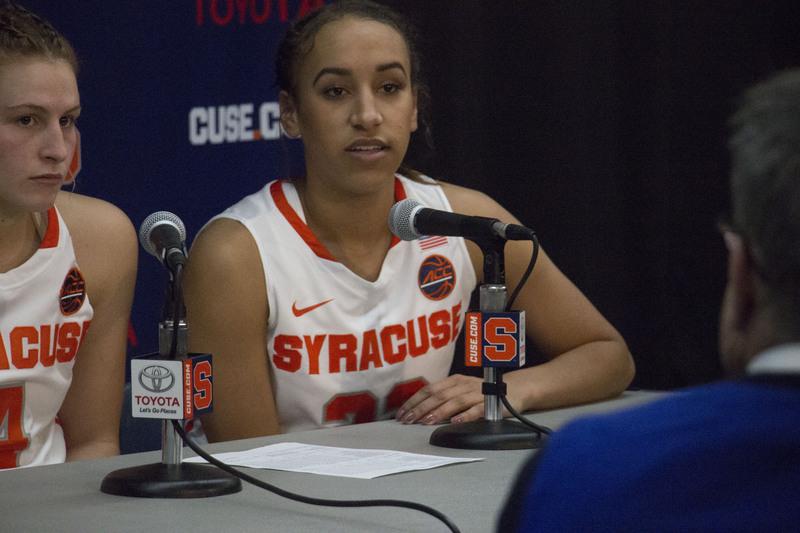 Boeheim gave credit to Iona, who made the NCAA tournament last year. 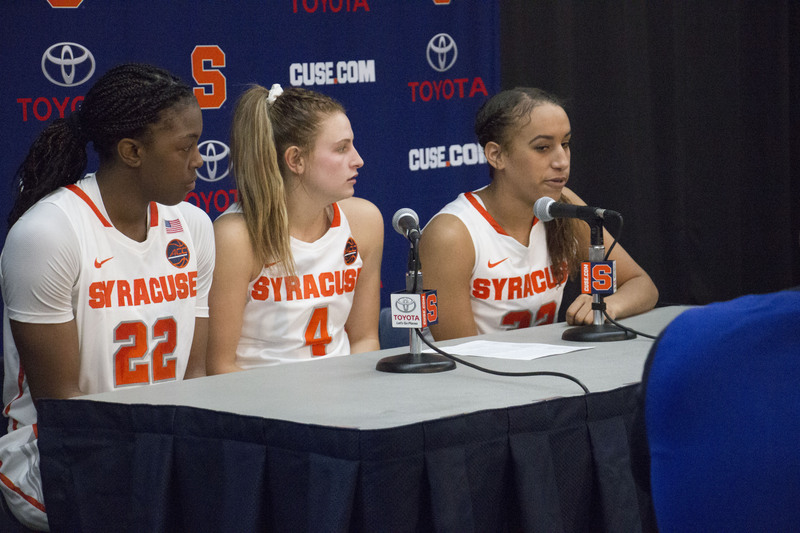 This win could shape the Orange as a tournament team, even though it was not projected as such in the preseason. 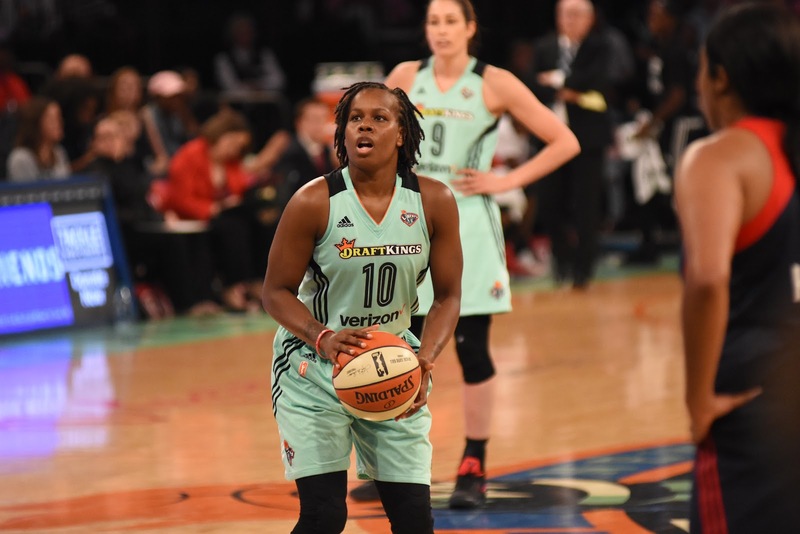 Eleven of Battle’s career-high 28 points came in the last eight minutes of the game. 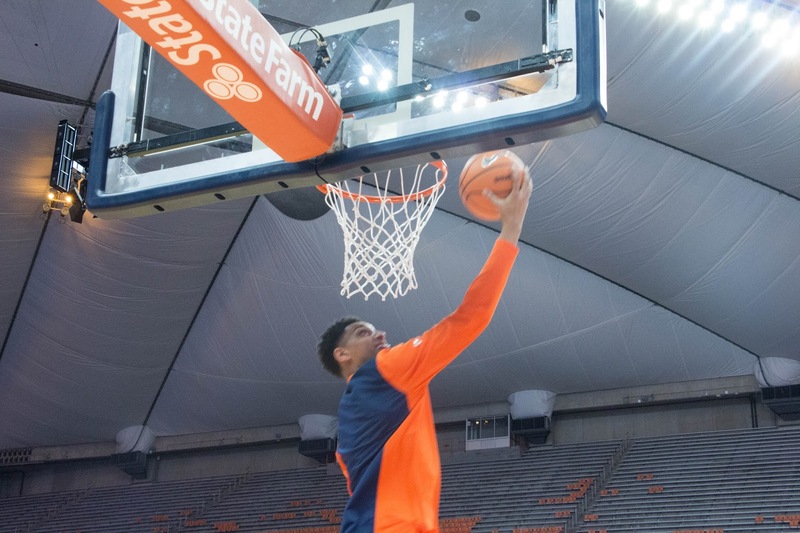 His previous high was 23 against Virginia last season. 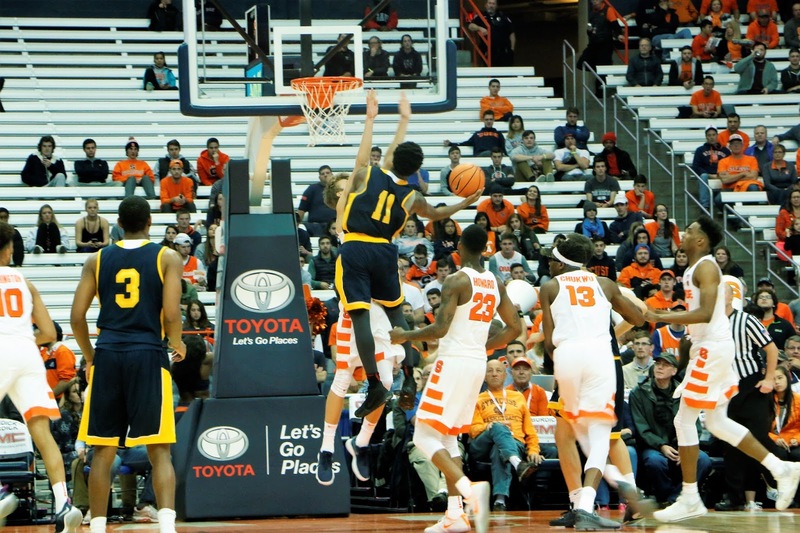 This effort did not go unnoticed by his teammates. 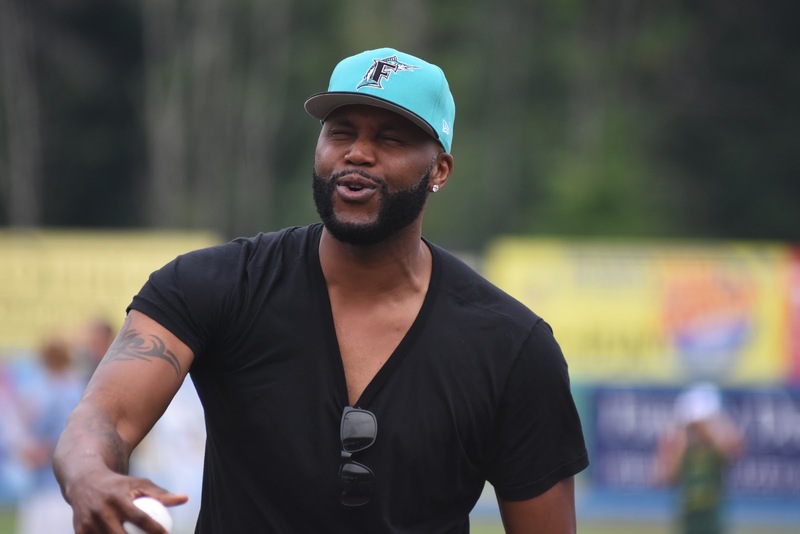 Battle said he felt more confident during the game. 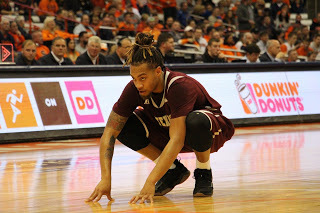 When Iona started to inch back within a few points, he just wanted to make something happen. 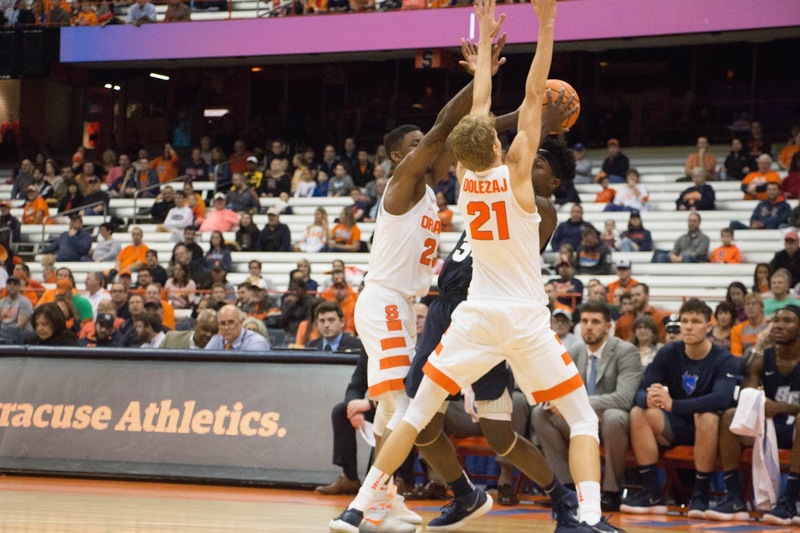 He also mentioned the offensive rebounds made by Marek Dolezaj late in the game. 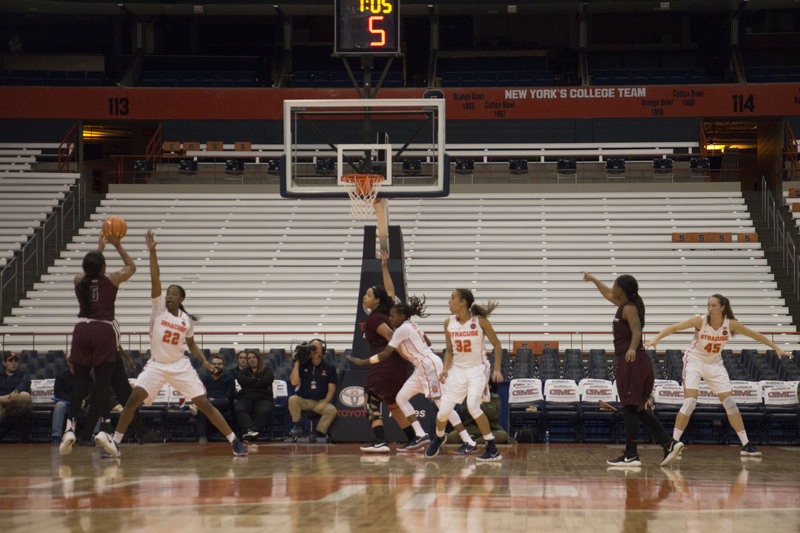 The Gaels are known for being a three-point shooting team, and they didn’t stray from their usual game plan tonight. 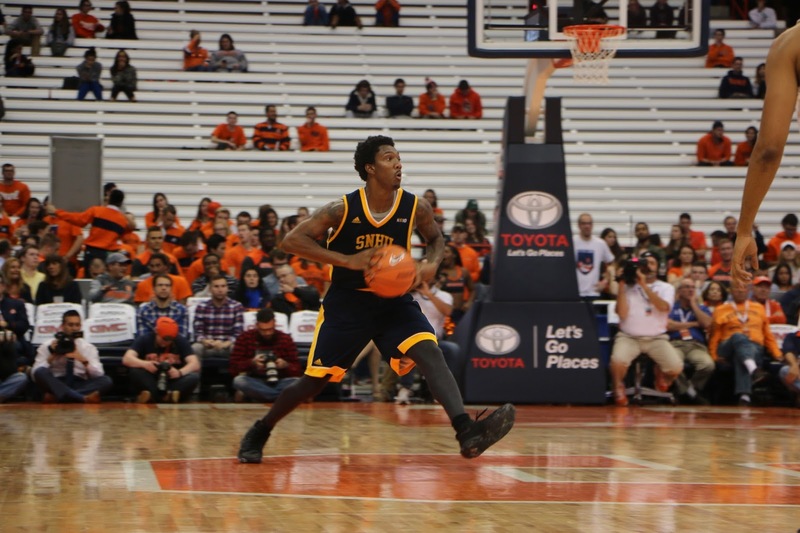 They shot 32 three-pointers and 31.3 percent led by junior guard Ricky McGill. 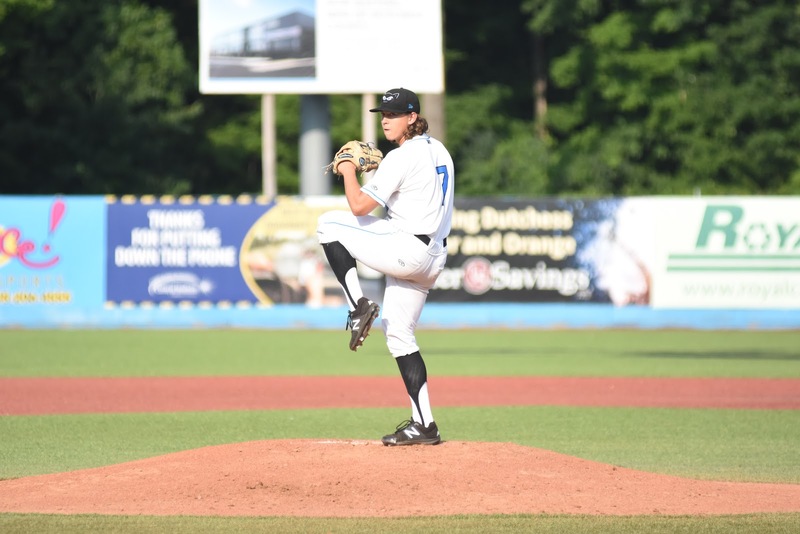 McGill was 5 for 9. 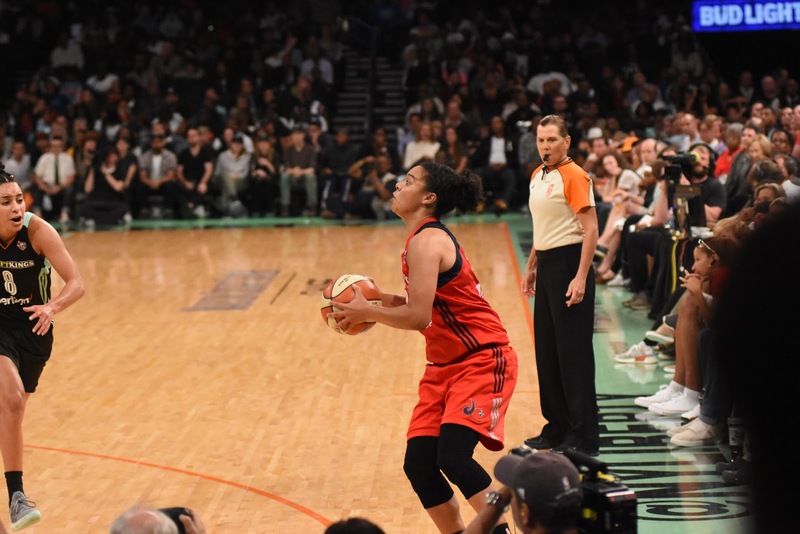 He was the most productive in three-point range and finished with 21 points. 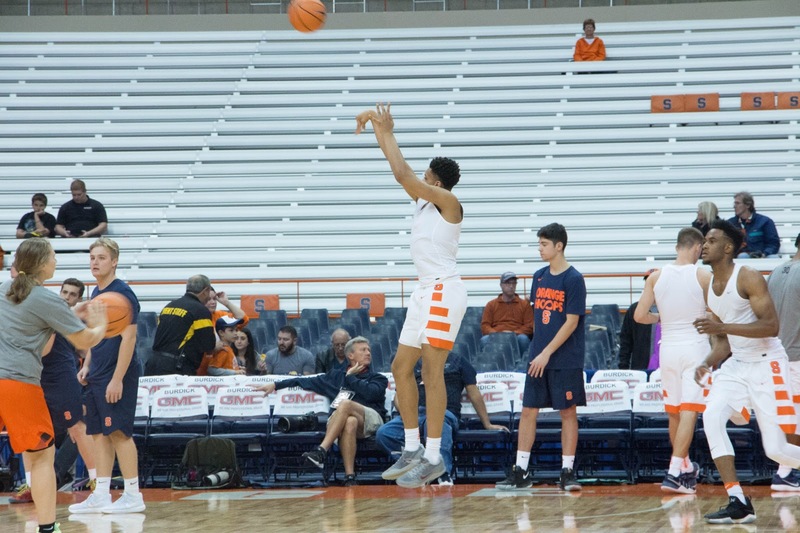 Syracuse shot 33.percent from beyond the arc. 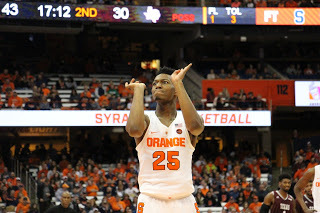 Junior Frank Howard, Battle and Brissett each finished with two threes. 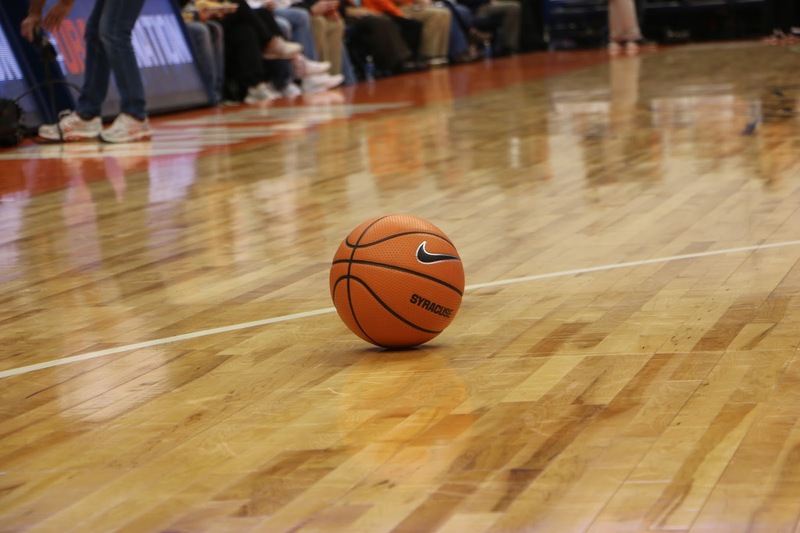 Syracuse hosts Texas Southern on Saturday, Nov. 18 at the Carrier Dome to begin the Hoophall Miami Invitational. Texas Southern (1-1) is coming off an overtime win at Washington State. 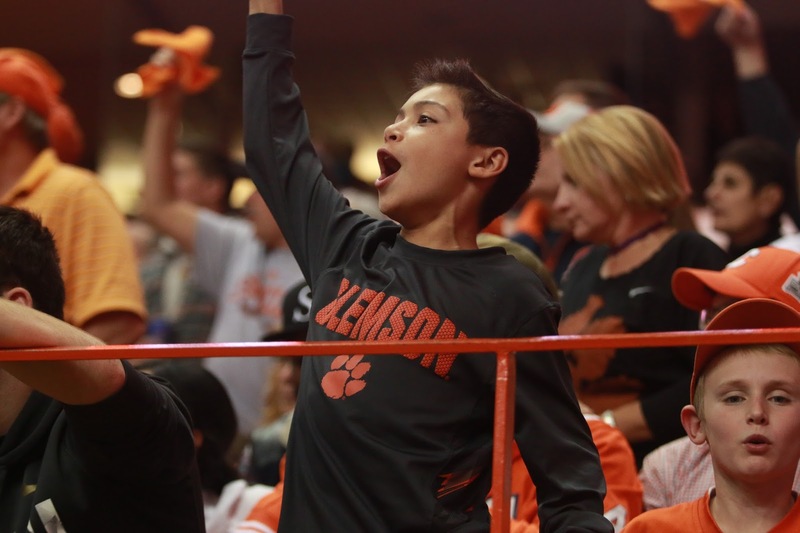 The Tigers play Thursday at Ohio State. 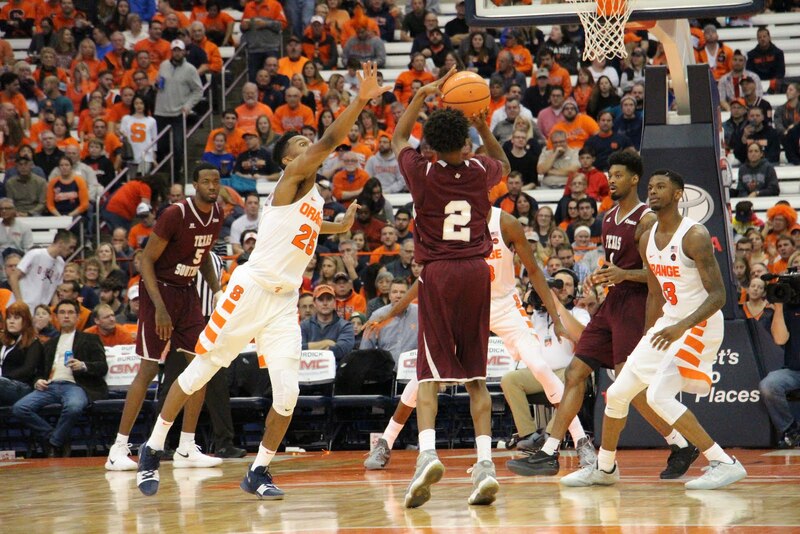 Tallahassee, Fla. – In a game that came down to the final seconds of regulation, the Syracuse Orange (4-5, 2-3 ACC) fell short once again on the road. 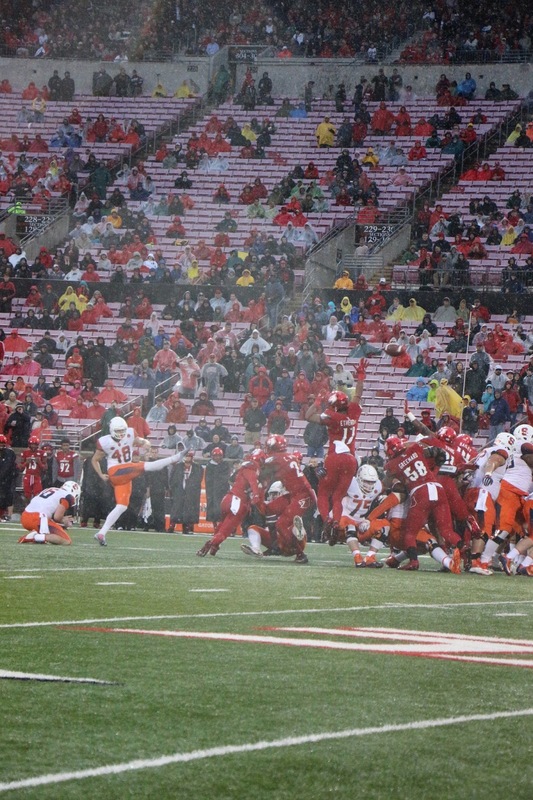 Cole Murphy’s 43-yard, game tying field goal attempt, with six seconds left, was wide left. 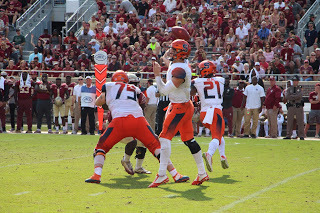 Eric Dungey was the story of the first quarter for the Orange. 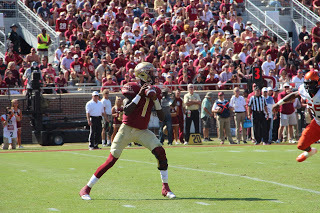 The junior lasted one drive as it was capped off by a Derwin James interception. 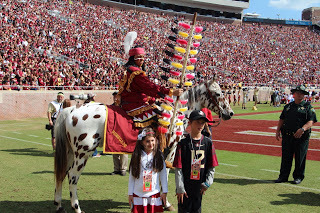 This was the start the struggling Seminoles were looking for. 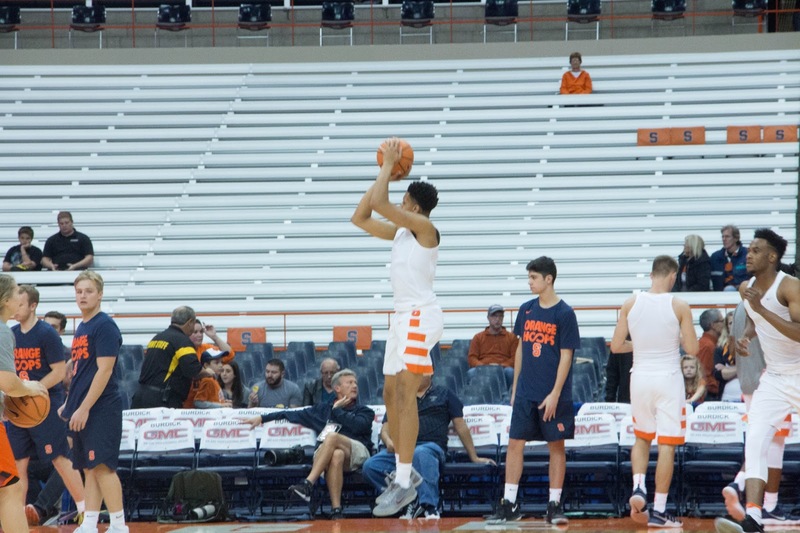 Dungey did not return for the rest of the quarter as he walked his way into the Syracuse locker room under his own power, limping on his right foot. 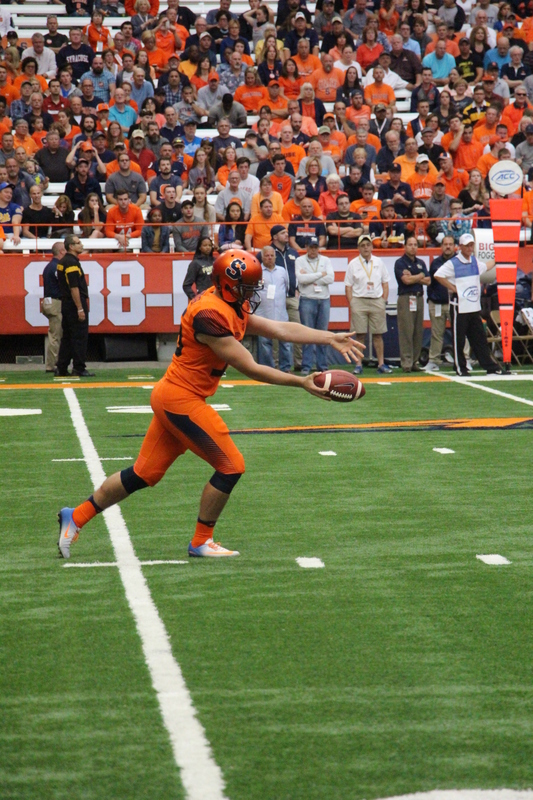 Senior Zach Mahoney would step in under center for the remainder of the quarter until Dungey returned from the locker room. “I am not going to talk about the injury but he did a fantastic job on coming back and battling. 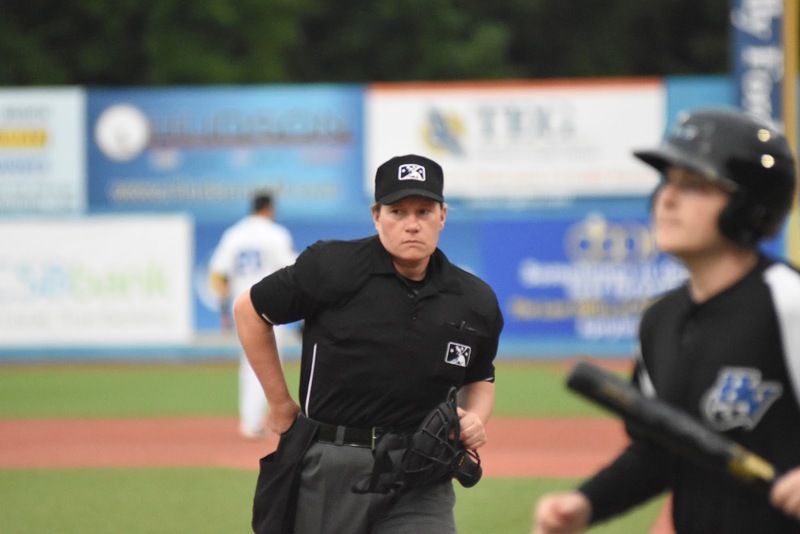 Obviously he wasn’t 100 percent but he was out there giving us his arm and giving him his leadership, and giving us his decisions making skills. He did a fantastic job.” Babers said. 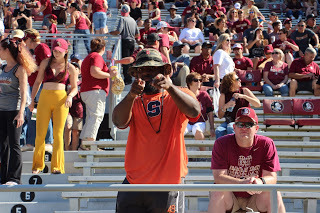 Across the field it would be Florida State’s James Blackman finding Nyqwan Murray for a 51-yard strike into the end zone, giving the Seminoles an early 7-0 lead following a Ricky Aguayo extra point. 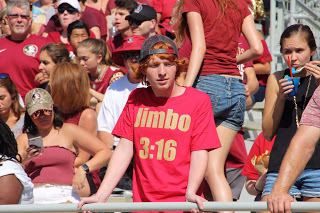 The FSU defense would take advantage of Mahoney the next two possessions, harassing him in the pocket, keeping the Orange off the scoreboard for the remainder of the quarter. 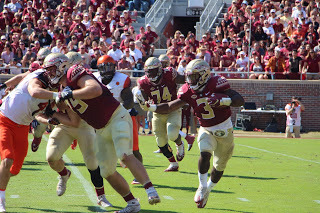 Cam Akers tailed for two scores for the Seminoles in the second quarter. A 54-yard touchdown run with 13:38 remaining in the first half was the longest of the freshman’s career, until he broke off a 63-yard run later in the second quarter. “I think good backs, you’ve got to tackle them. I think one good run Peanut Butter (Parris Bennett) missed a tackle. Good runners make tacklers miss, and they got big plays. 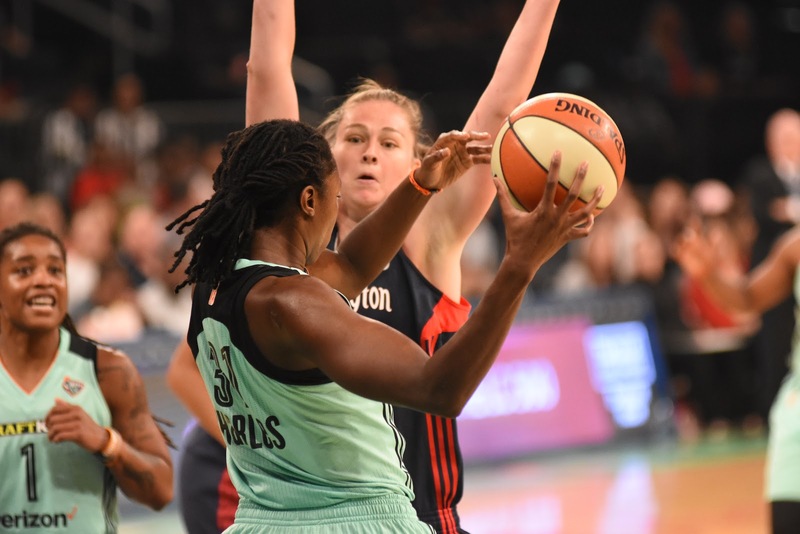 I think we did a better job of tackling in the second half.” Babers said. Akers finished the half with 159 yards on the ground. 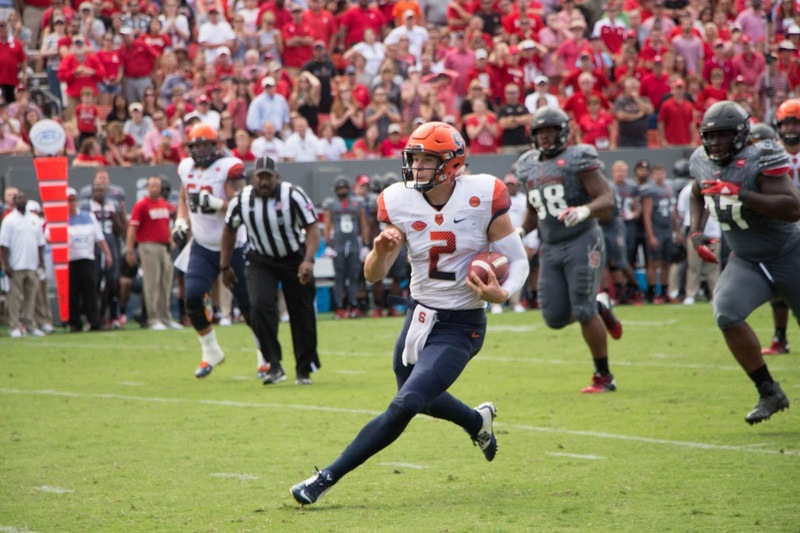 Syracuse would rally back off the limping foot of Dungey. 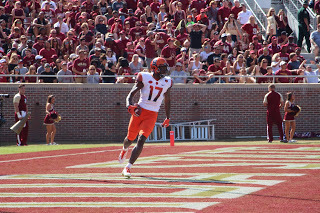 A 47-yard strike to Jamal Custis would cut the score in half. 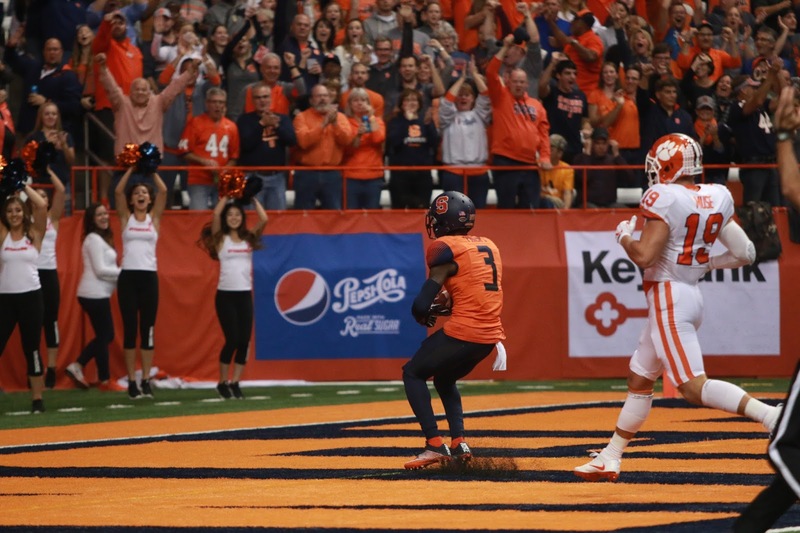 A few possessions later, Dungey fired a 34-yard pass to Steve Ishmael to send the Orange into the locker room trailing 21-14. 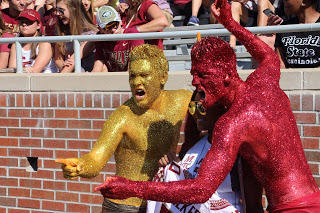 The scoring in the third quarter would come off the legs of Cole Murphy and Ricky Aguayo. 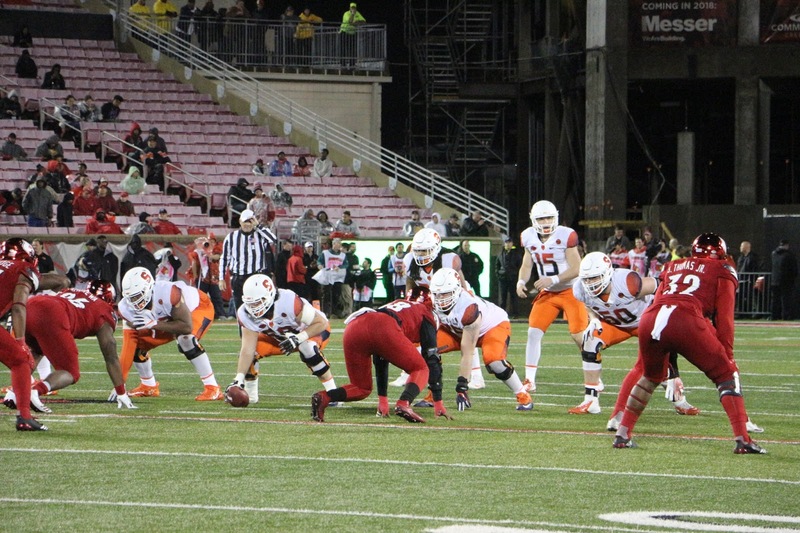 Murphy made it a four-point game with a field goal from 42-yards out cutting the lead to 21-17. 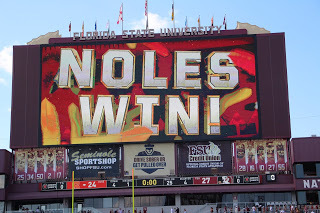 On the other end Aguayo nailed a crucial field goal from 49-yards to conclude the second half padding the Seminoles lead to 24-17. 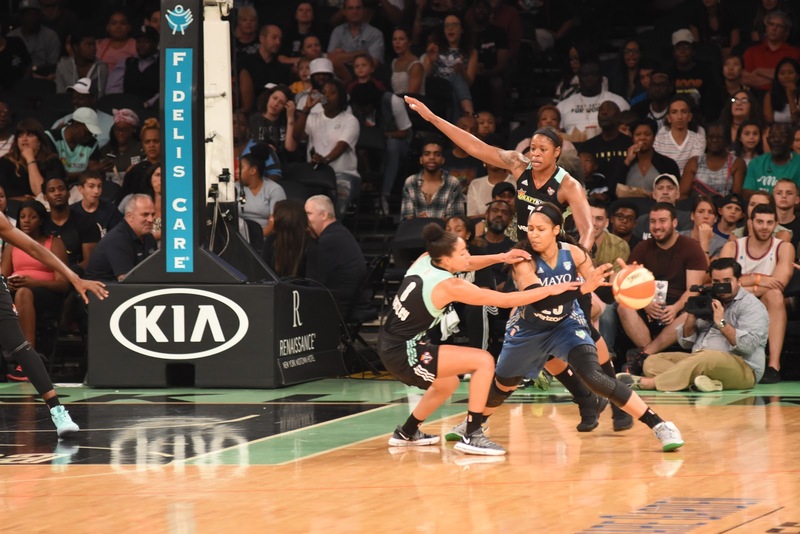 In a quarter filled with strong defense for both teams, it would be the final three minutes of the contest that had the fans on the edge of their seats. 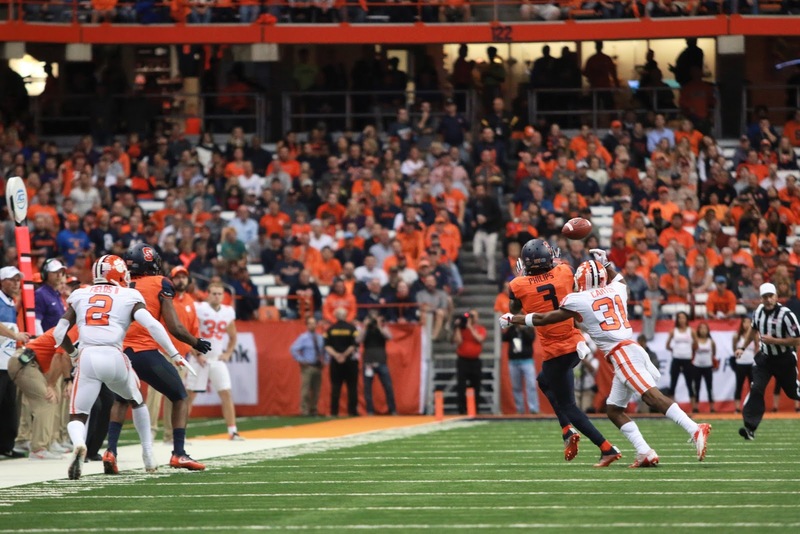 Dungey rallied the Orange to a 14-play 75-yard drive, which resulted in a 3-yard quarterback keeper into the end zone, cutting the score to 27-24. 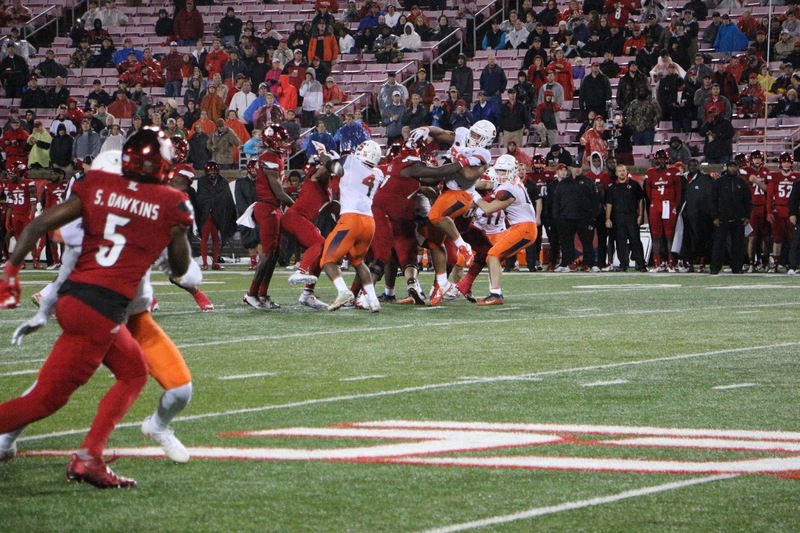 Babers elected to onside kick on the ensuing kickoff. 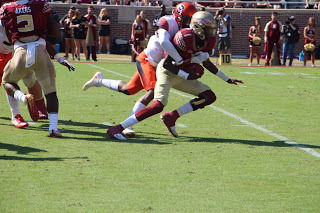 The choppy kick was recovered by Derwin James, setting the Seminoles up with great field position at midfield. 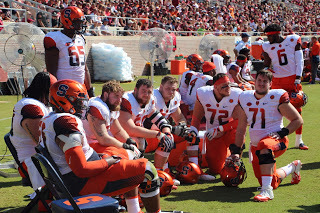 Syracuse’s defense would come up strong and force a punt later that drive. 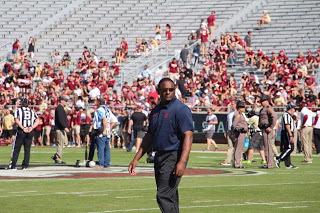 “I said wait a minute, let’s see if we can get them with an onside kick. I know the percentages are low.” Babers said. 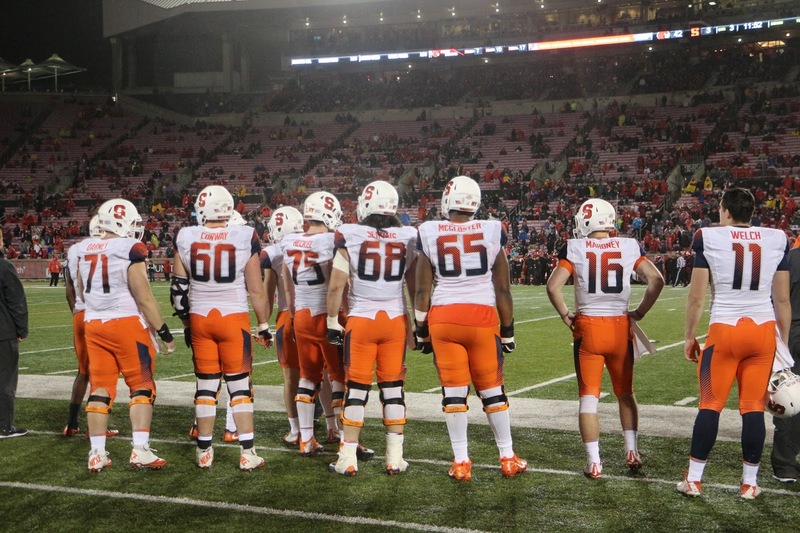 Dungey and the offense took the field with 1:23 remaining in the game with the ball at their own 18-yard line. 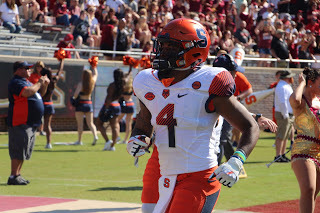 After a couple of quick strikes to Steve Ishmael, Syracuse was able to drive down field spotting the ball at the Seminole 25-yard line. 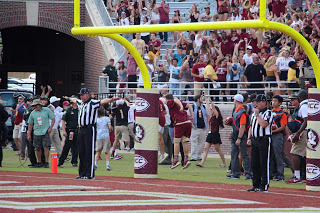 It would be the final six seconds remaining in regulation that would set up a Cole Murphy potential game tying kick. 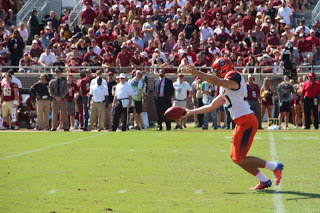 The snap was good, the hold was great and the kick was wide. 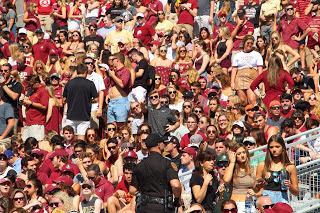 Murphy shanked the kick wide left from 43-yards out as Florida State stormed the field with the joy of victory. 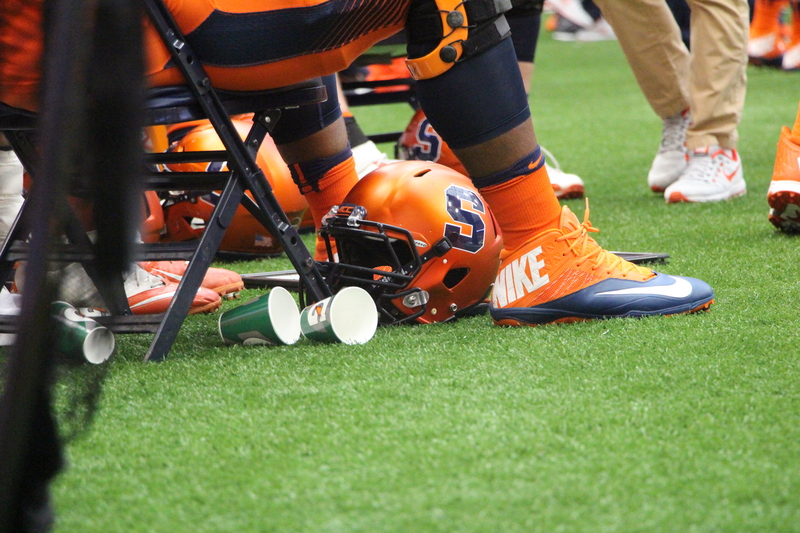 The Orange remained on the sidelines after coming up short yet again on the road. 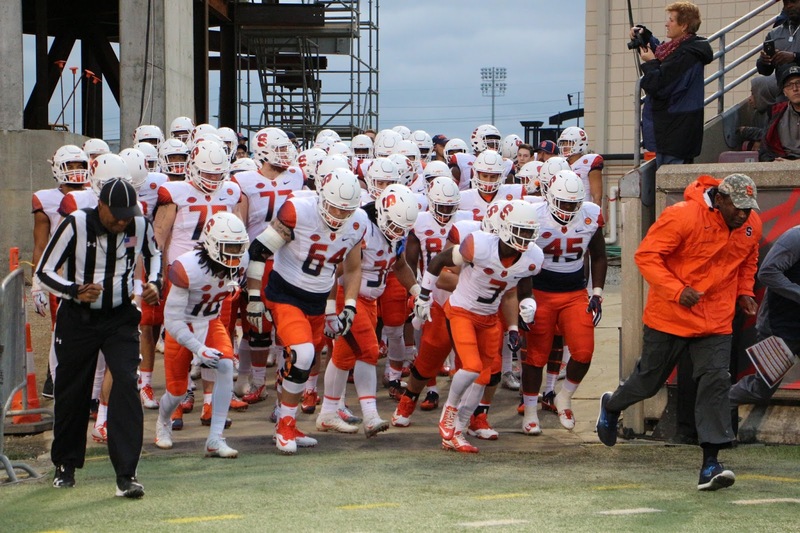 Syracuse heads home to host Wake Forest November 11th as they look to make a push for a Bowl Game. 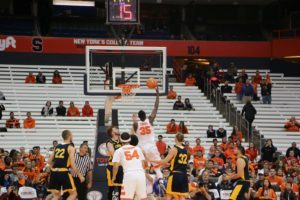 The Orange need to win two of their next three games if they want to find themselves playing in the post season. 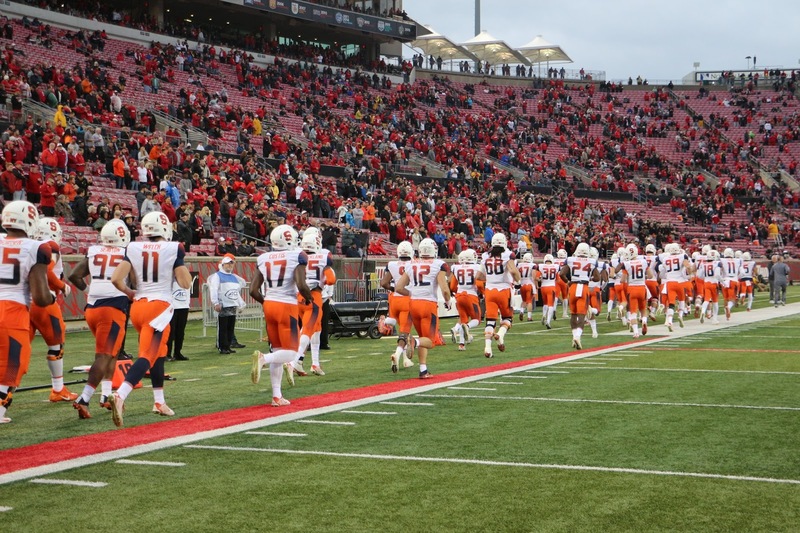 The schedule does not get easier for Dino Babers and the Orange as they then head down to Louisville to take on Lamar Jackson and the Cardinals. 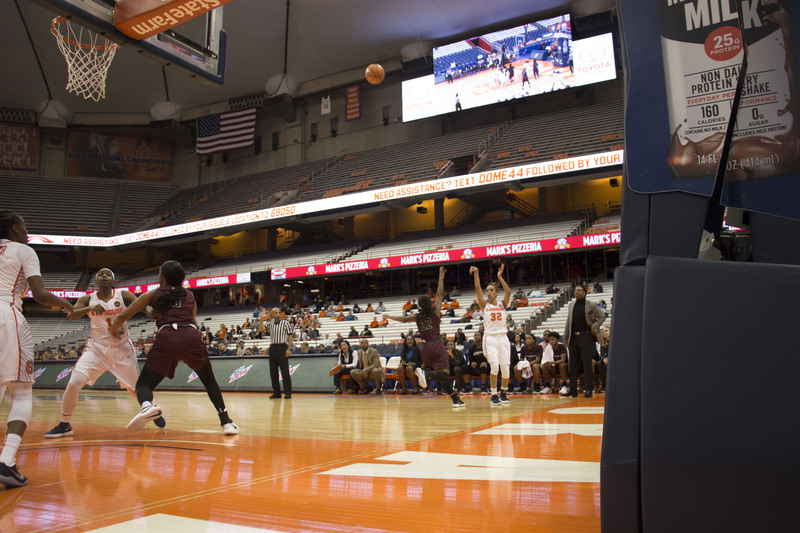 The final regular season game will conclude when Boston College comes to the Dome, in a game which can potentially determine their season. 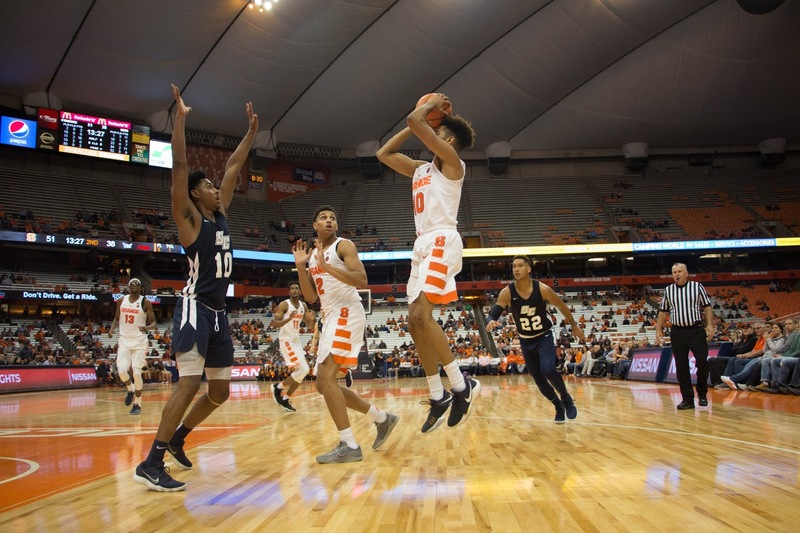 SYRACUSE, N.Y. — The Syracuse men’s basketball team kicked off the 2017-18 season at the Carrier Dome on Wednesday night, with an easy 84-54 victory against Southern New Hampshire. 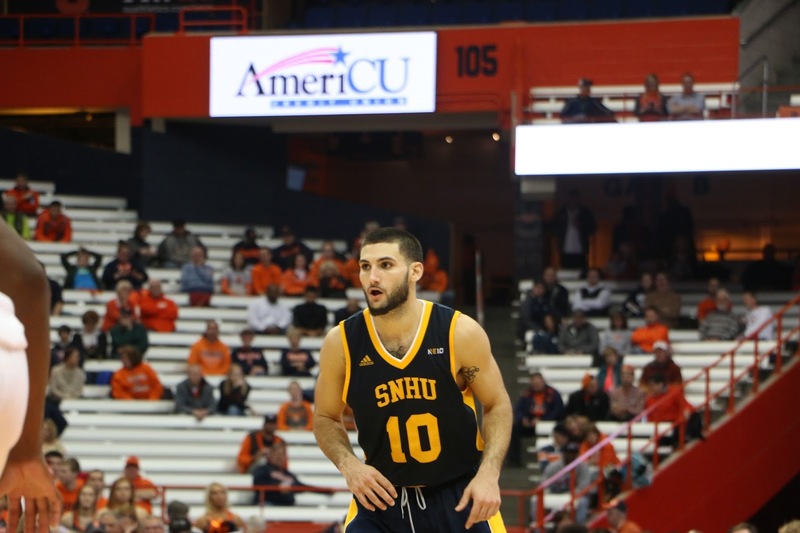 The visiting Penmen came out strong, but after the Orange shook off some early-season rust, they never looked back. 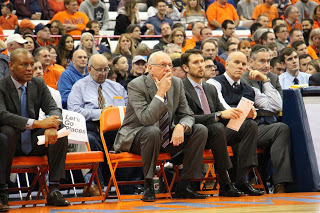 Head Coach Jim Boeheim was pleased with the effort in the first outing of the year. 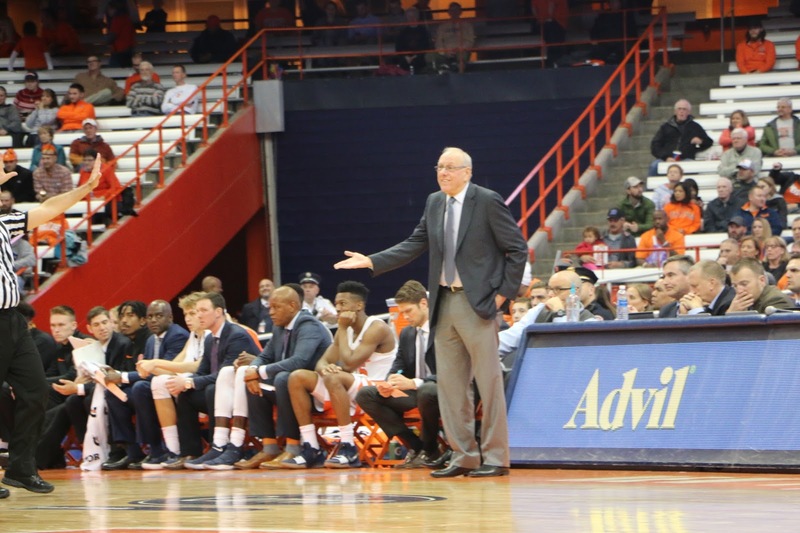 “Overall, it was a good first step,” Boeheim said. Everything worked inside out. 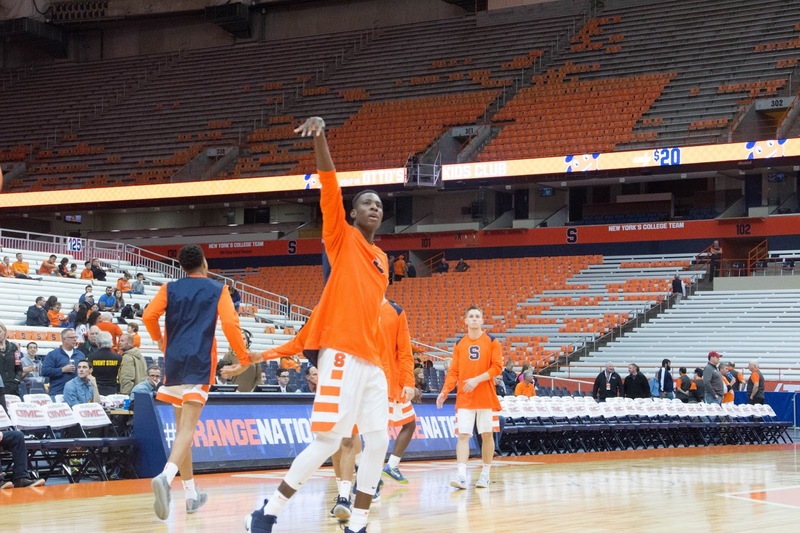 Center Paschal Chukwu and forward Bourama Sidibe rotated as rim protector at the five spot, and their presence forced Southern New Hampshire to take outside shots. 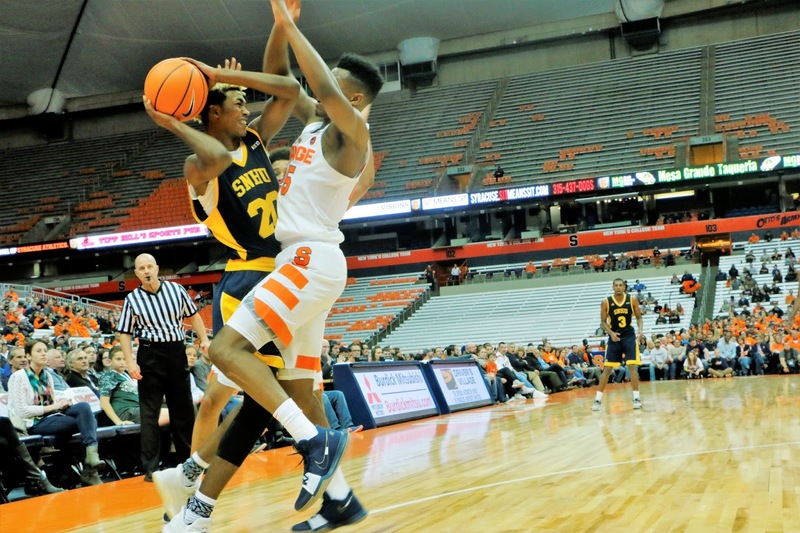 With the Penmen out on the perimeter, Syracuse’s depth at the guard spot proved too much. 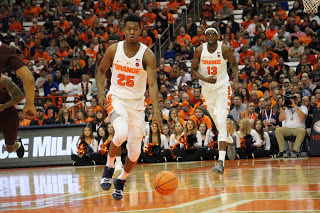 The majority of minutes went to starters Frank Howard and Tyus Battle, the two guards stopping the players opposite them, Chris Walters and Charlie Russo. 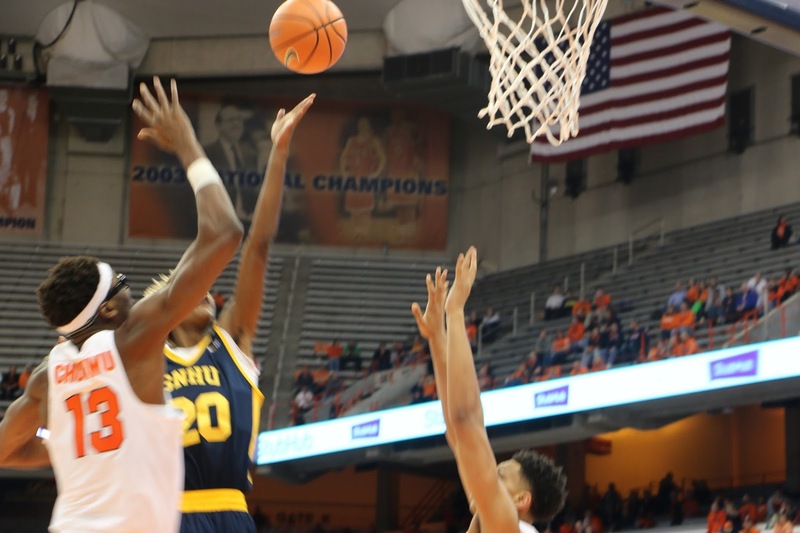 Any time Southern New Hampshire did venture inside, they found the rim protection lurking. 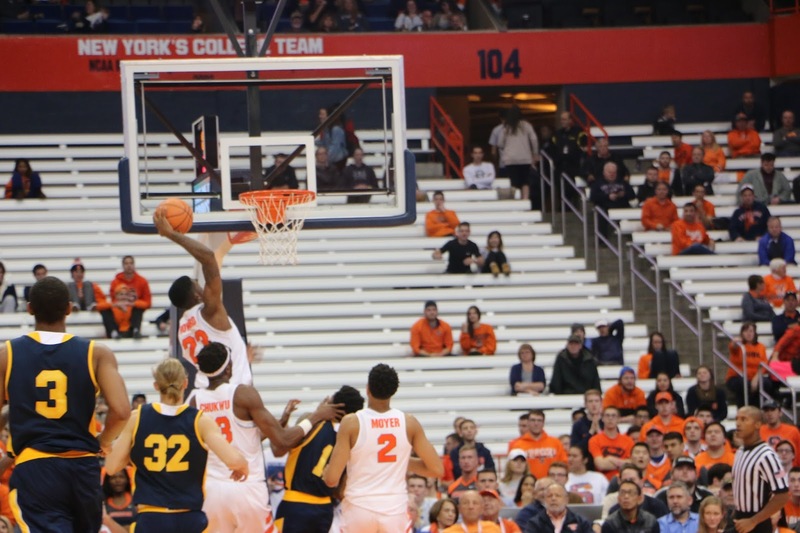 Syracuse recorded an astonishing 16 blocks with Chukwu and Sidibe grabbing six each. 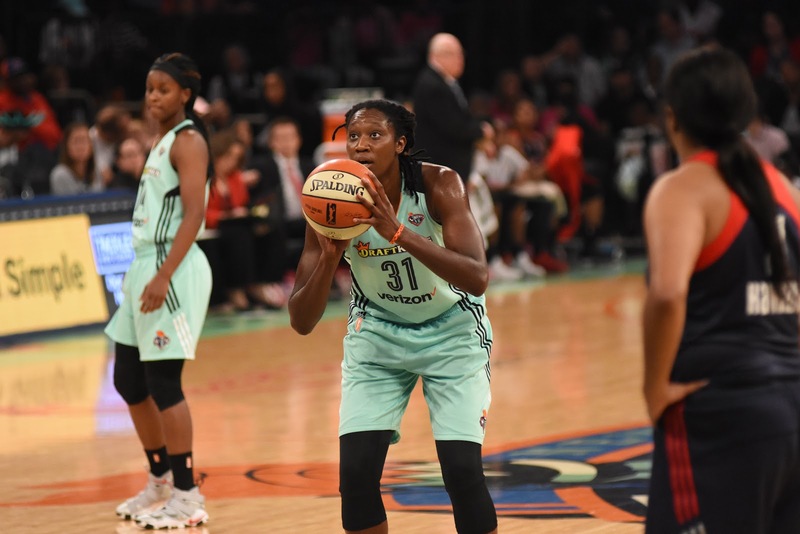 “It’s something we work on in practice,” Chukwu said. 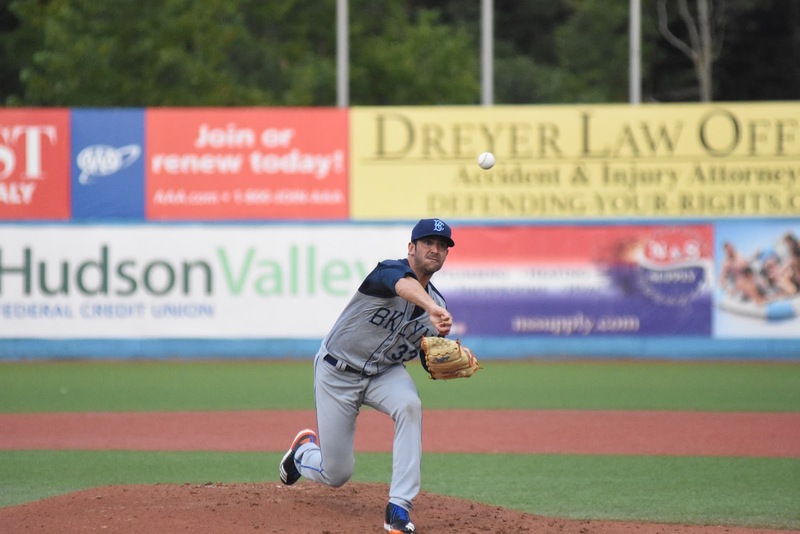 Southern New Hampshire’s Charlie Russo had a disappointing performance. 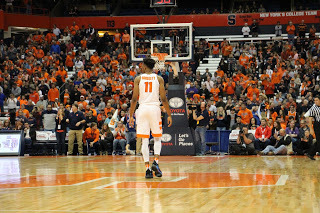 The Syracuse local shot just 1-10 before hitting three straight in the final three minutes. 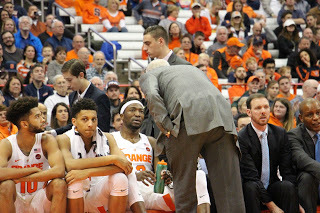 Russo interned in the Syracuse basketball office and was an integral reason the two teams organized an exhibition game against each other. 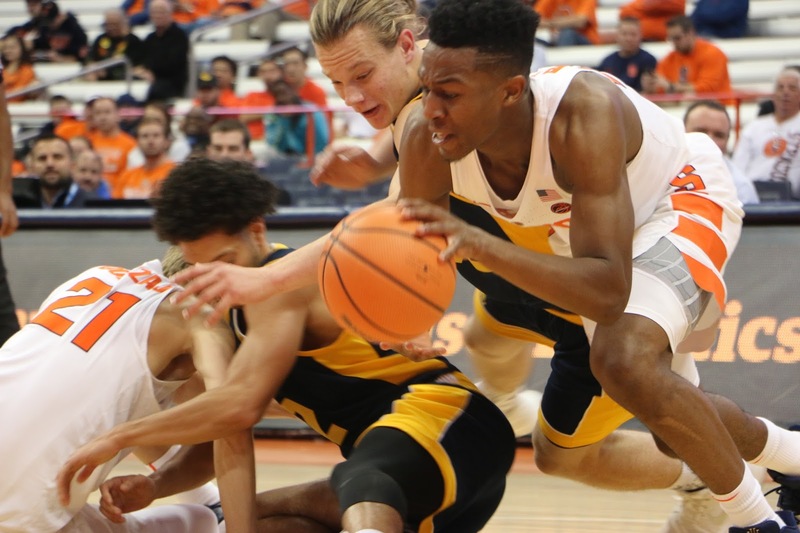 Early in the first half, most of the offense went through Battle. 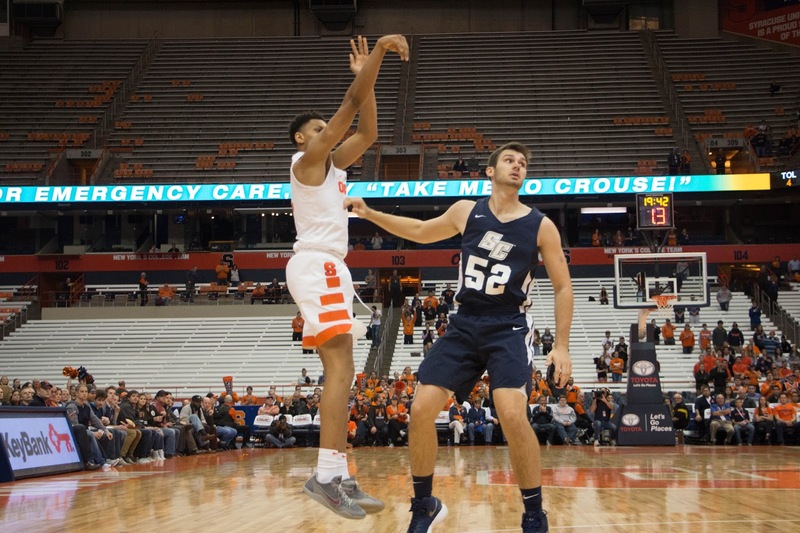 As Syracuse was shaking off the offseason rust, the sophomore helped ignite the offense with an early surge of 11 points in the first 10 minutes. 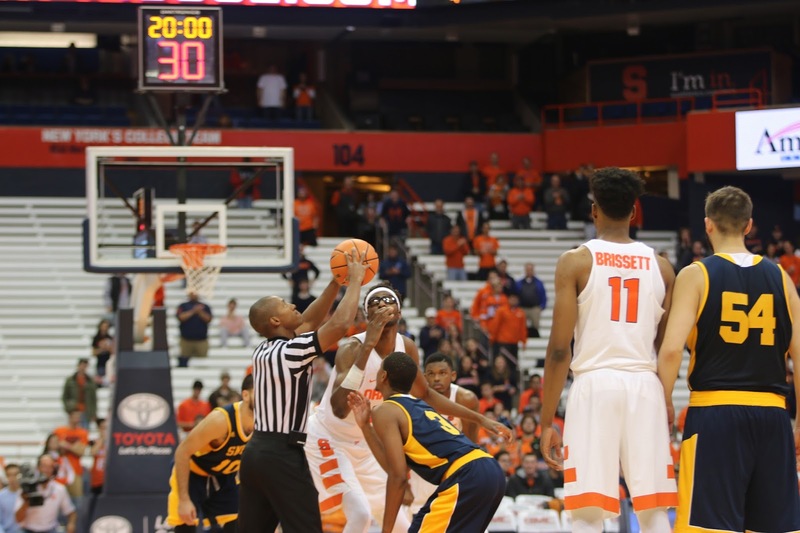 It didn’t take long for the Orange to begin to move the ball on offense, getting other players involved. 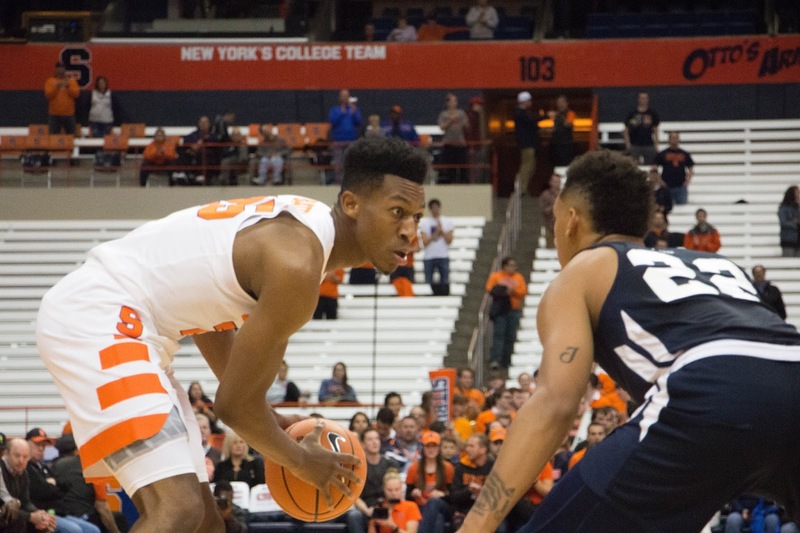 Oshae Brissett finished with 17 points and 11 boards while Frank Howard, Howard Washington and Bourama Sidibe all finished with double digit points. 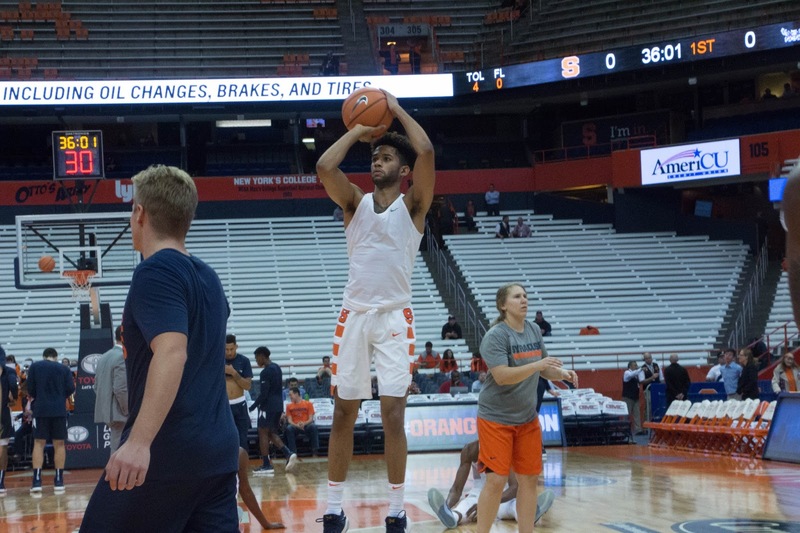 Syracuse returned only one starter this season — Battle — and will be forced to navigate the ACC with a roster that hasn’t played a lot of minutes together. 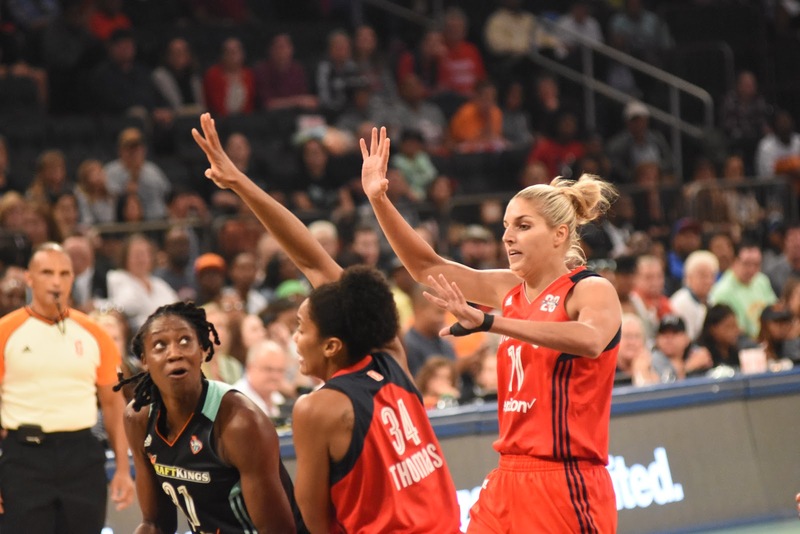 Exhibition games are important to the players trying to get a feel for each other ahead of the regular season. 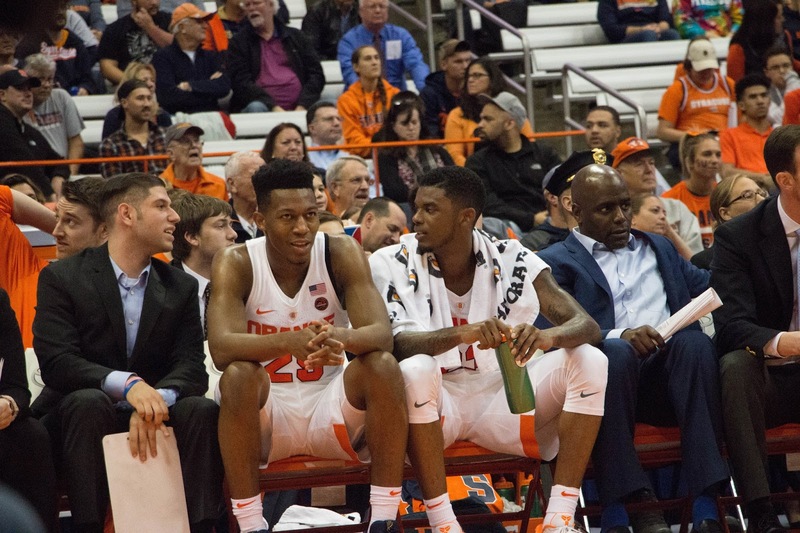 “With these guys, it makes a big difference,” Boeheim said. 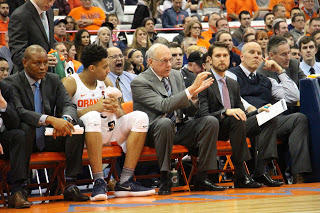 In a game where there was very little in the way of flashiness — a Tyus Battle dunk early in the first half and the blocks — coach was still happy to get the win. 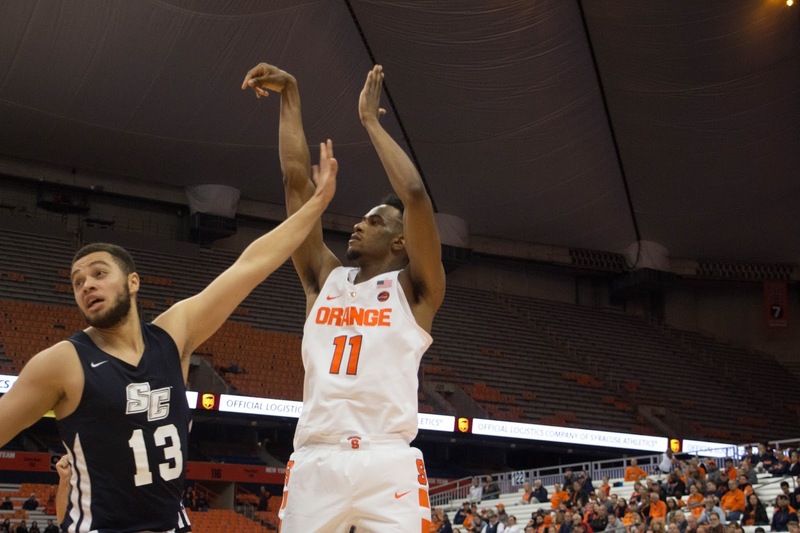 The Orange have another exhibition against Southern Connecticut State on Monday, Nov. 6 before their regular season tips off against Cornell on Friday, Nov.10 at the Carrier Dome. 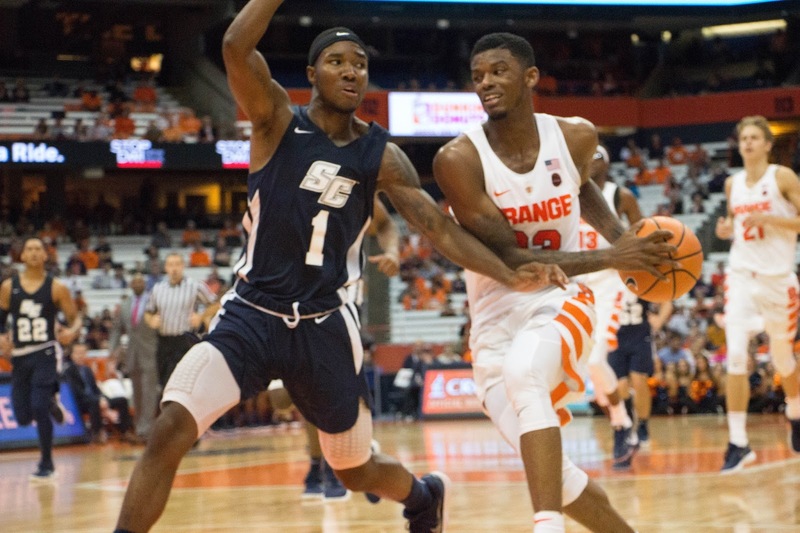 Miami Gardens, Fla. — Despite a late game surge, Syracuse fell to No. 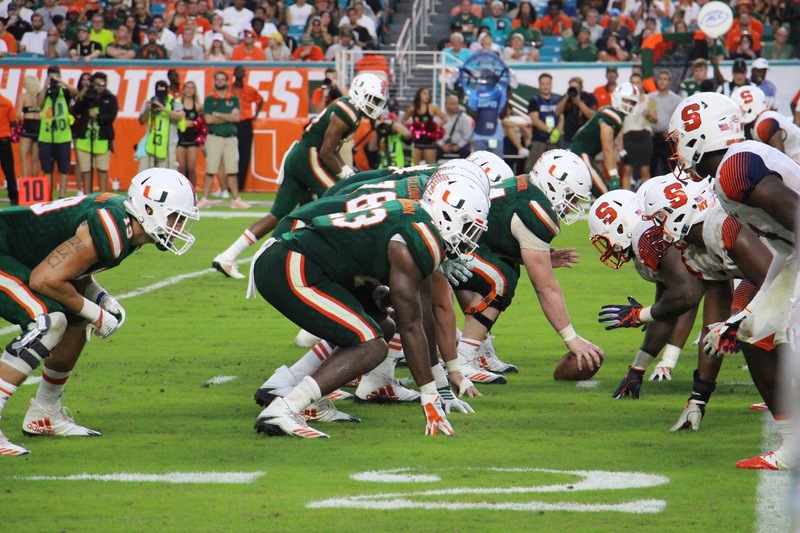 8 Miami Hurricanes on a sloppy field at Hard Rock Stadium on Saturday. 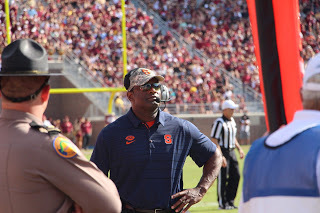 After beating the defending national champion Clemson Tigers eight days earlier Syracuse (4-4, 2-2 ACC) faced another top-ten opponent; this time on the road and came up just short, losing 27-19. 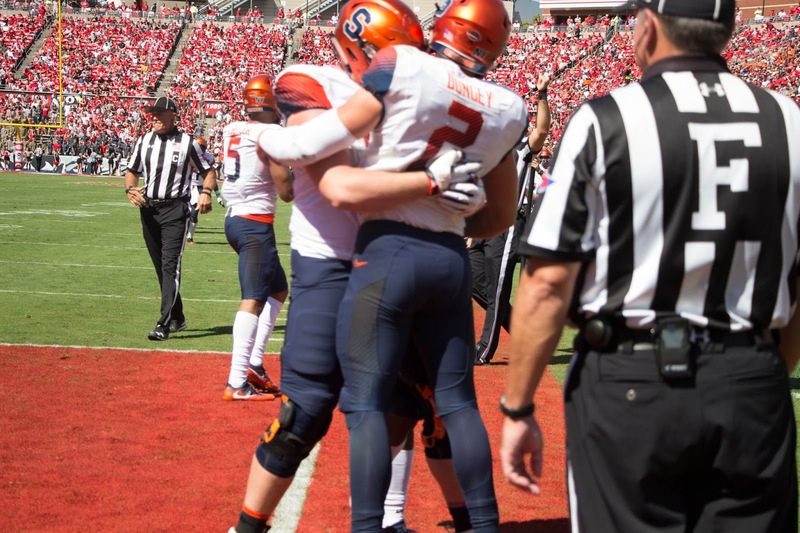 The SU defense and place kicker Cole Murphy kept Syracuse in the game as Orange quarterback Eric Dungey threw four interceptions and was consistently pummeled by the Miami defense. 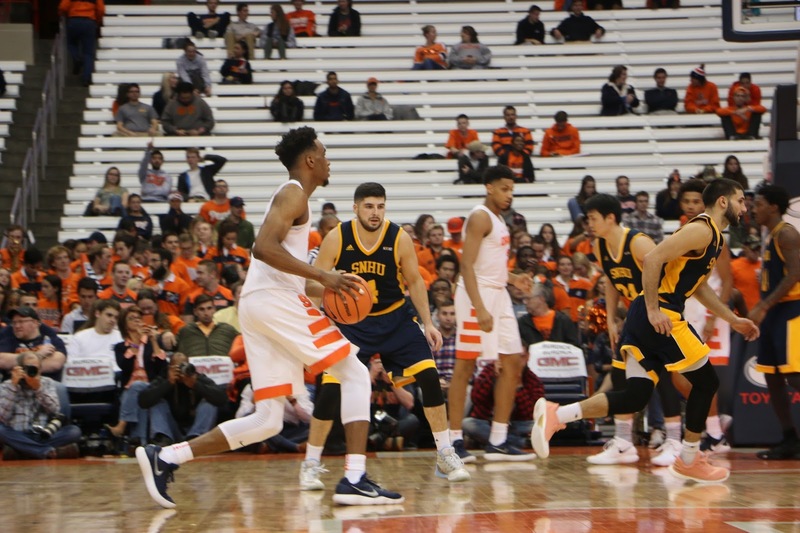 The Orange offense struggled to keep the ball in the first half. 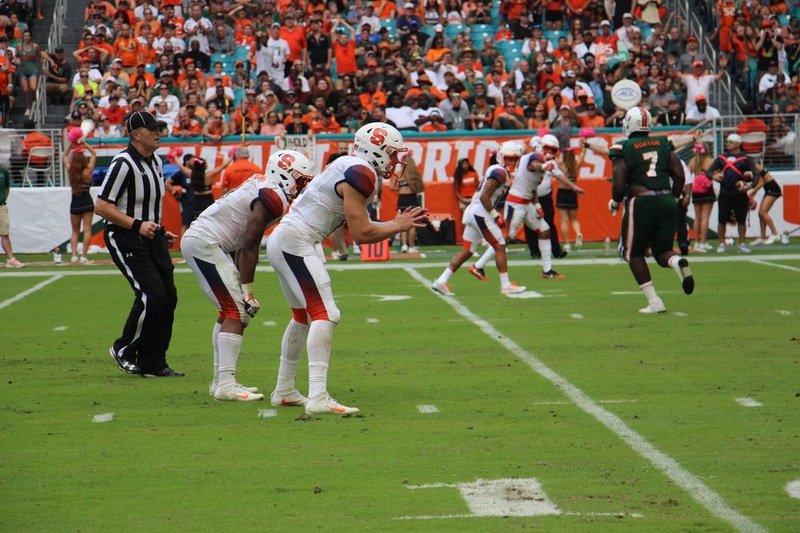 In addition to Dungey’s four interceptions Miami forced two punts. 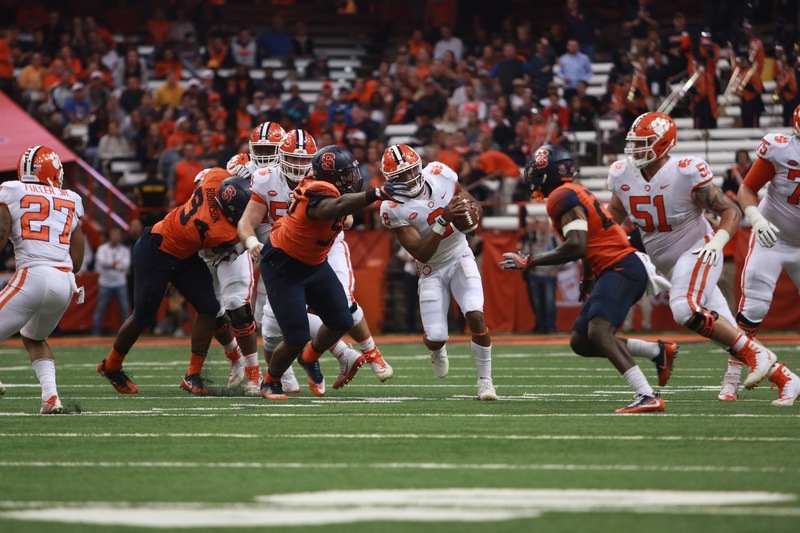 Dungey kept it from potentially becoming worse as, after the first interception he ripped the ball away from the Miami defender Demetrius Johnson, allowing Syracuse to keep the ball with a new set of downs. 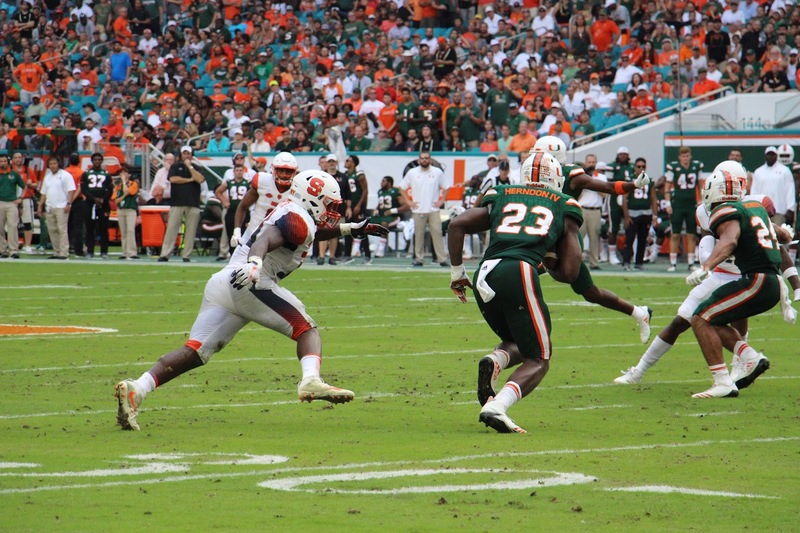 But that ended in a punt and Miami drove from its own 25-yard line to the Syracuse one before the Orange defense stuffed the Hurricanes, forcing them to take a chip shot field goal and a 3-0 lead. 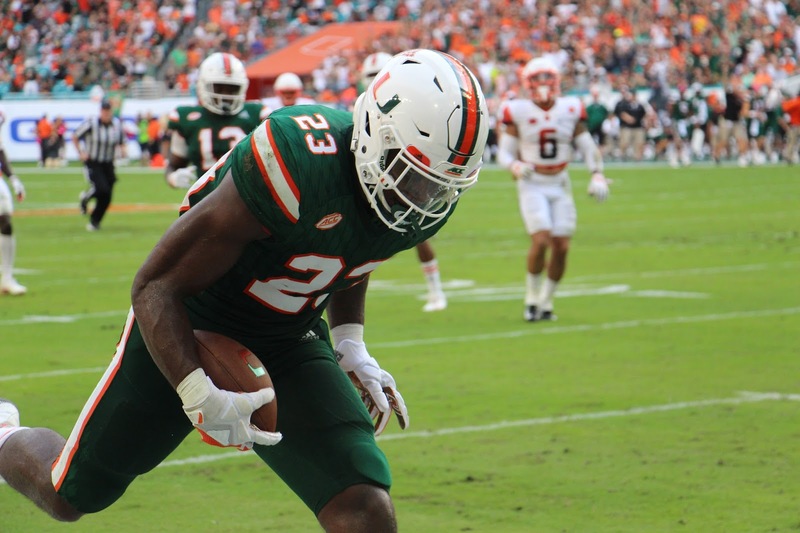 That’s how it stood as the first quarter ended but Miami (6-0, 4-0 ACC) was driving and finished it off with a 10-yard pass from Malik Rosier, Jr. to tight end Chris Herndon and a 10-0 lead. 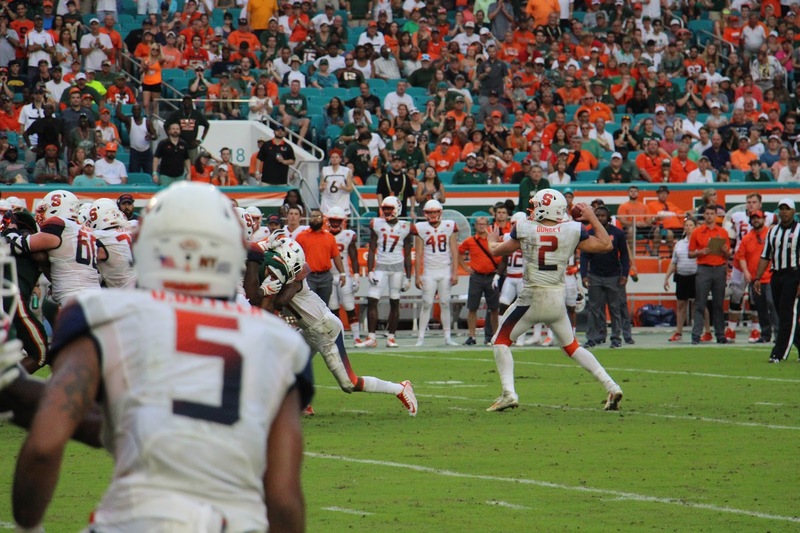 Dungey was picked off again and while the defense held Miami to a 39-yard field goal with 10:41 left in the second quarter Miami was up 13-0. 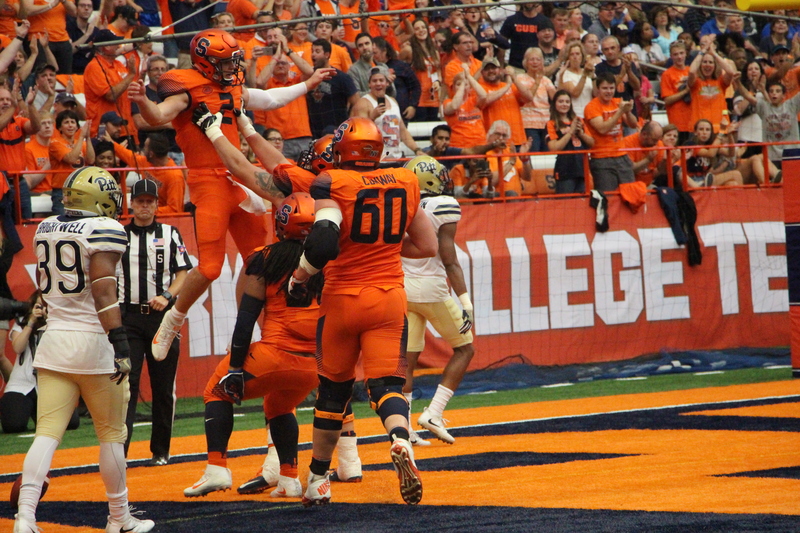 Syracuse drove but when Steve Ishmael was injured as he tried unsuccessfully to hold onto a pass in the end zone, the Orange turned to Murphy, who delivered a 22-yard field goal giving Syracuse a glimpse of hope, trailing 13-3 at the half. 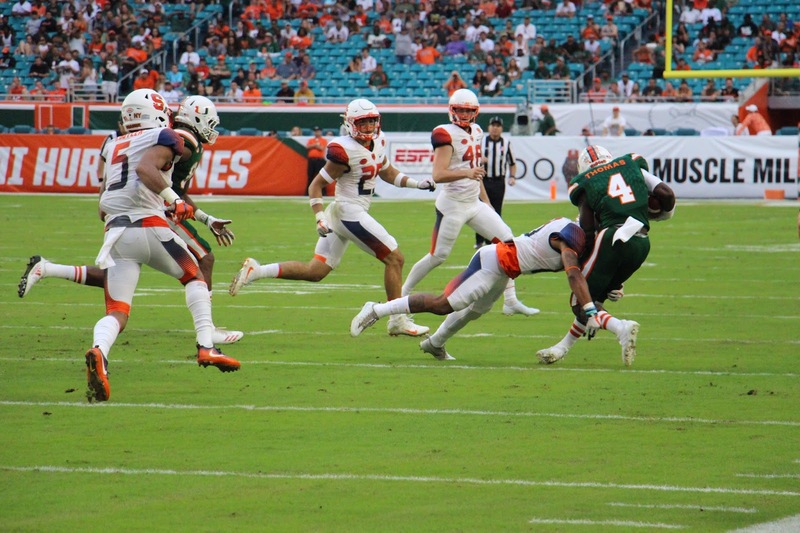 Syracuse stopped Miami’s opening possession and drove to the Hurricanes’ 22-yard line, but passes to Irv Phillips and Steve Ishamel went incomplete and on fourth and five Murphy hit a 40-yard field goal, making it 13-6. 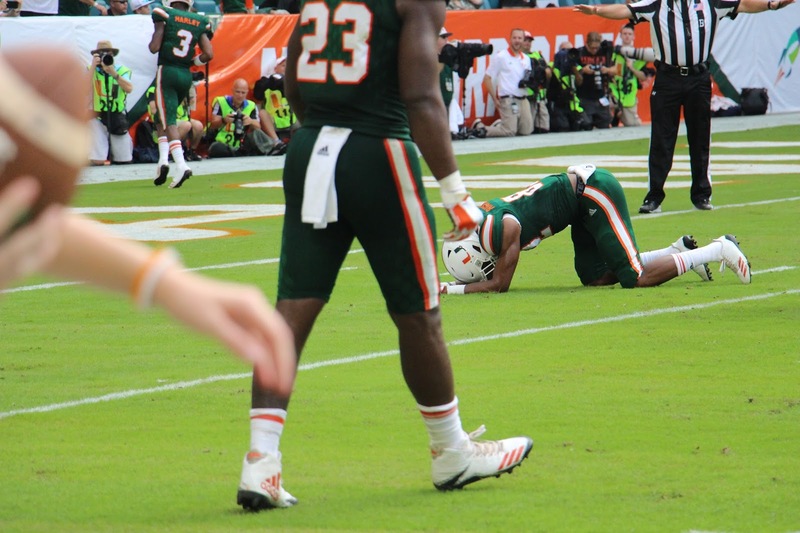 After an exchange of punts, the ‘Canes struck again after Braxton Berrios returned Sterling Hofrichter punt to the UM 47. 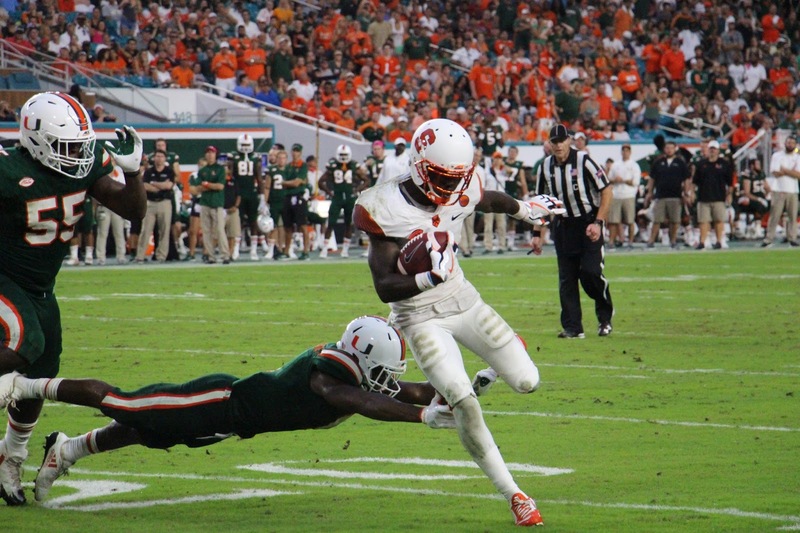 Two-plays later, Rosier hit Jeff Thomas for a 48-yard touchdown and after the extra point Miami led 20-6. 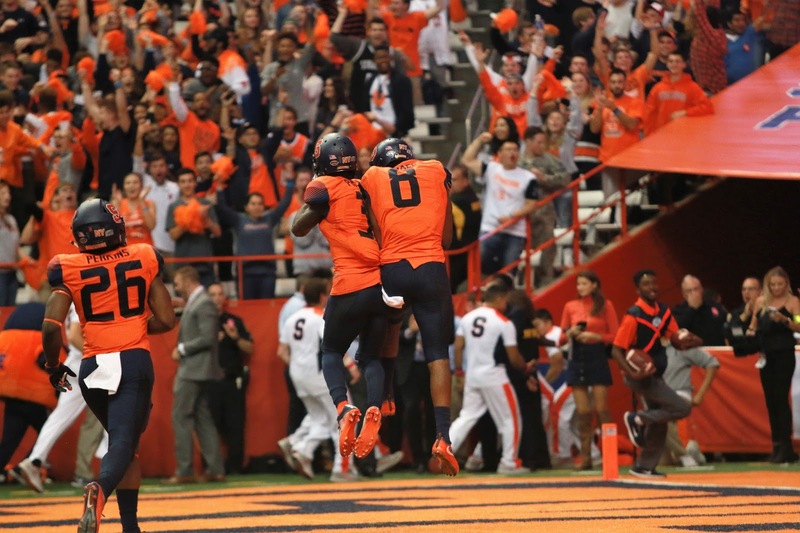 Syracuse responded with its only touchdown with a six-play, 65-yard drive featuring runs by Dungey of 28 and 14 yards, and capped by a 15-yard burst by Moe Neal into the end zone. 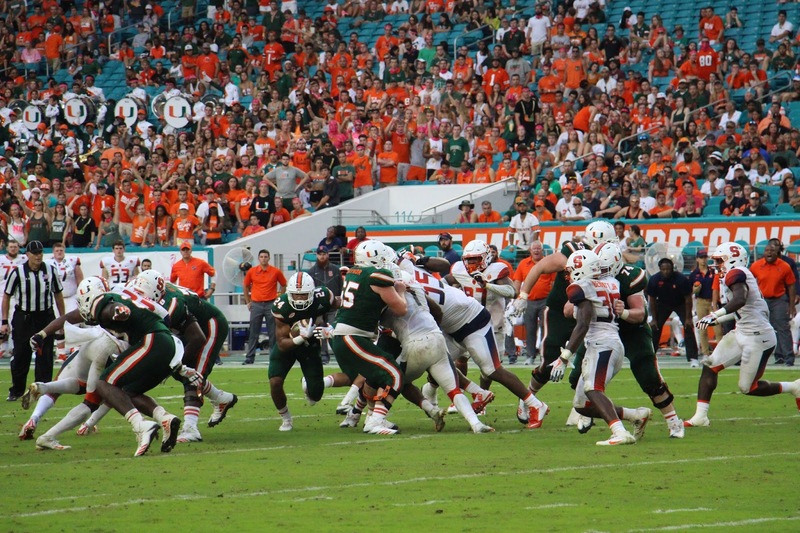 Murphy’s kick was good and it was 20-13 in favor of Miami. 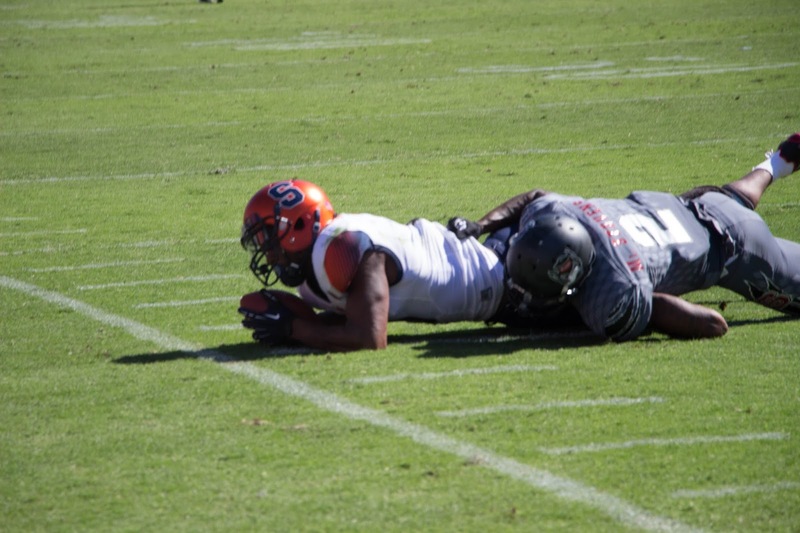 Twice in the game Dungey tried to hurdle would-be tacklers, crashing into them full-bore. 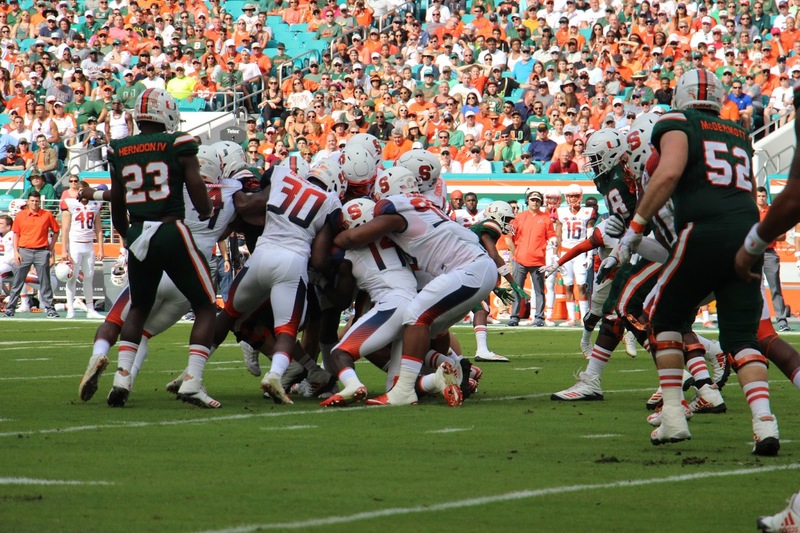 The Syracuse defense stopped Miami and the Orange drove for another Murphy field goal, this one from 45 yards. 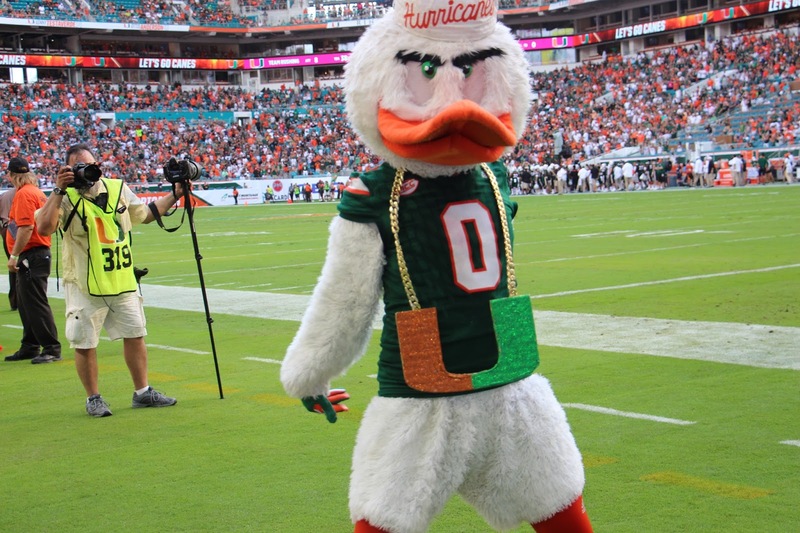 Miami led 20-16. 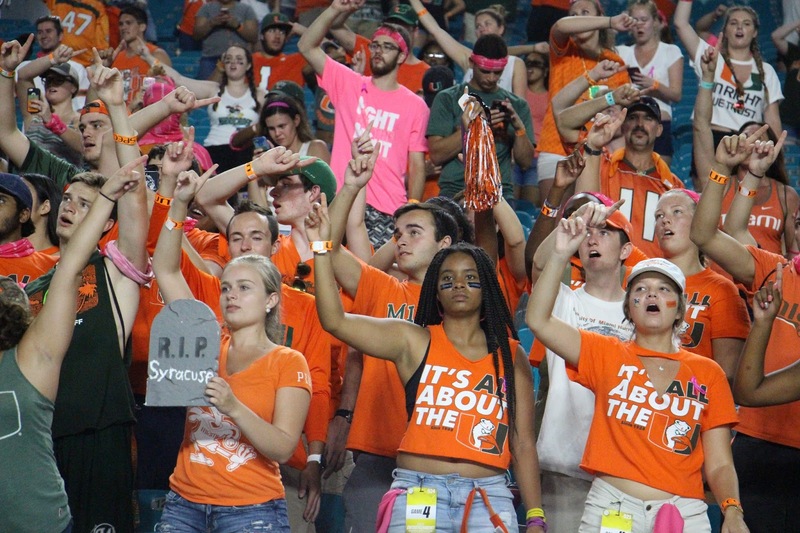 The Miami drive stalled after two first downs and Syracuse got the ball back and drove again. 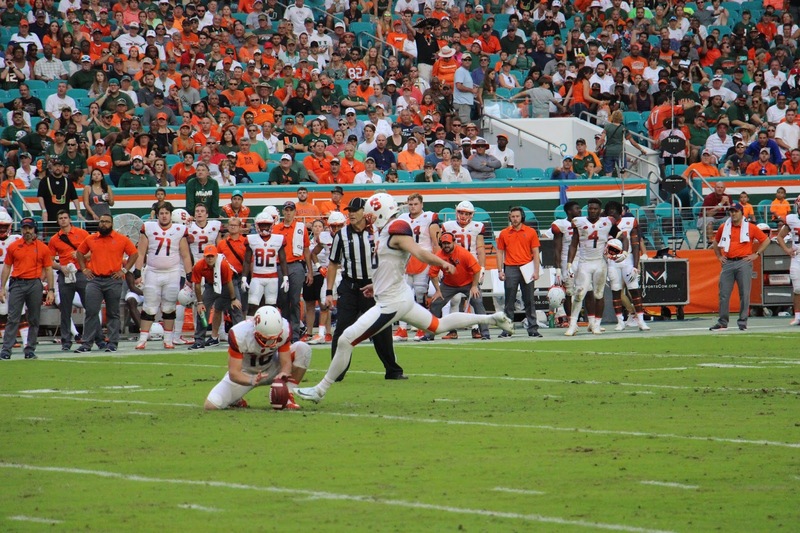 This time the ‘Canes stopped the Orange at the UM 35 and Murphy came back on to the muddy, sloppy field again, this time to try one from 53 yards out. 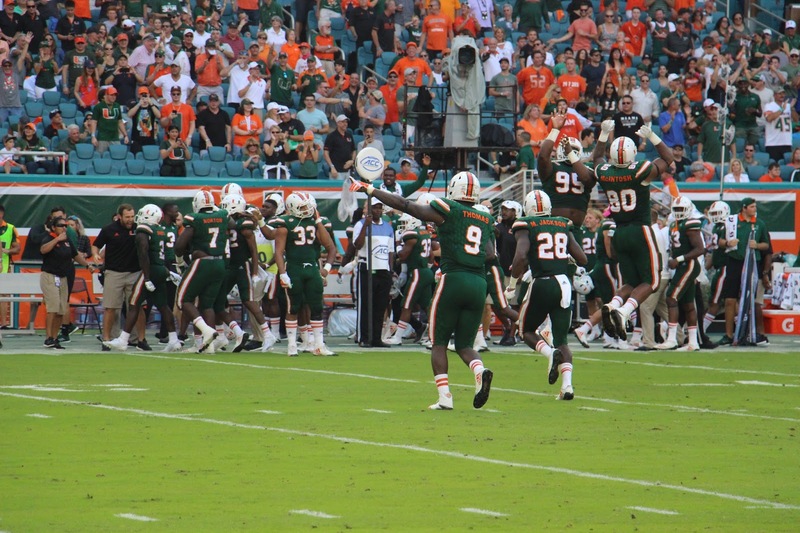 Miami immediately answered with a touchdown on a nine-play, 85-yard drive, but it was still a one-possession game at 27-19. 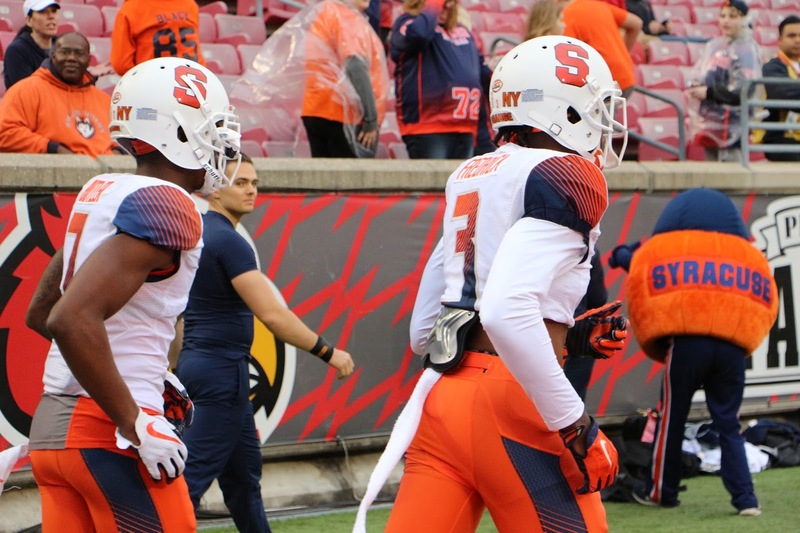 On the next drive for the Orange, Dungey connected to Devin Butler for 22 yards, giving Syracuse a first down. 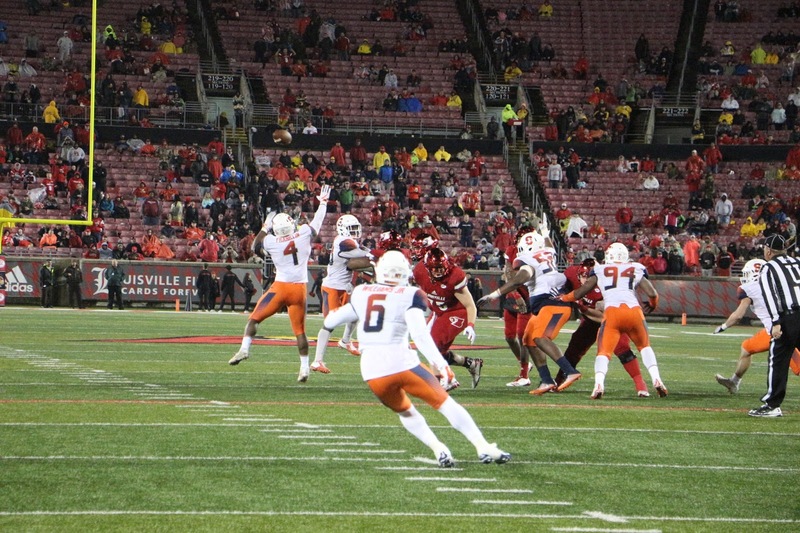 But on the last SU series, a fourth-down pass to Irv Phillips along the right sideline was ruled incomplete and was short of the first down marker anyway. 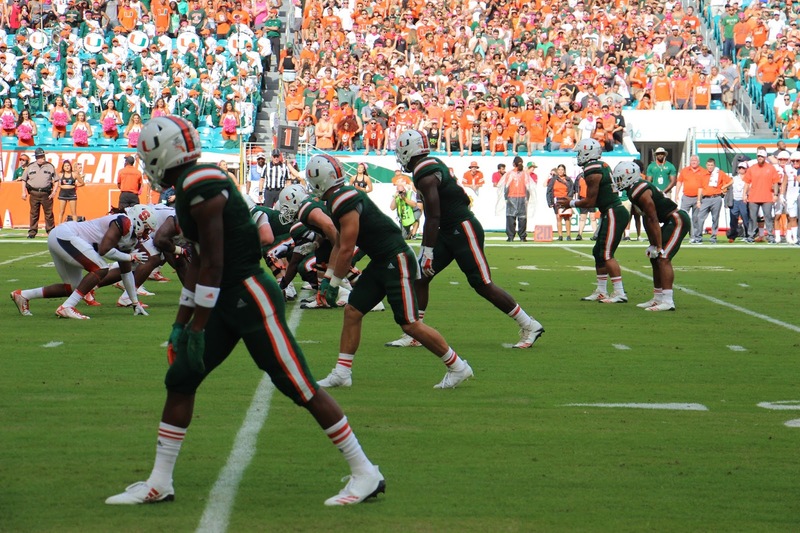 That put Miami in victory formation to run out the clock. 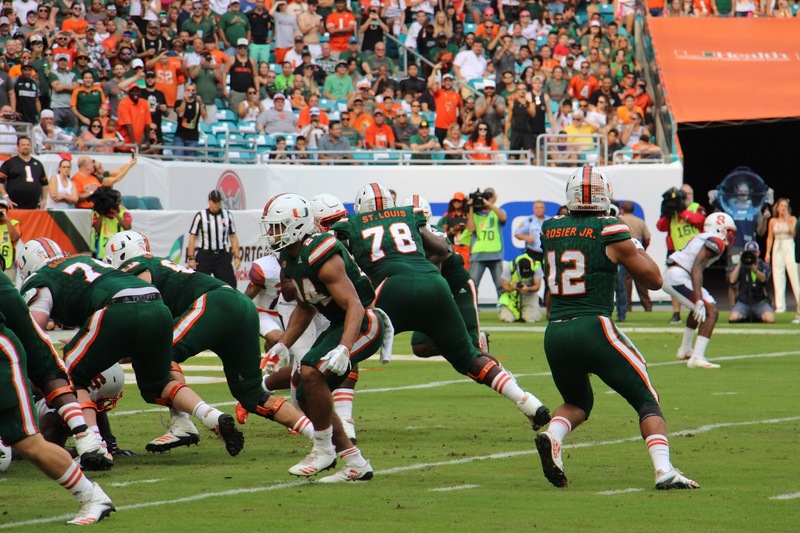 “We found another way to make it really exciting,” said Miami head coach Mark Richt, whose team stayed unbeaten after a third consecutive close game. 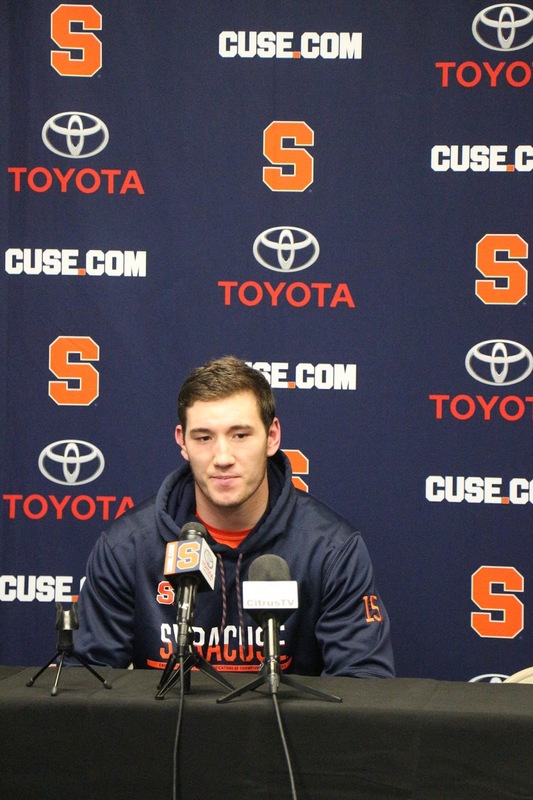 “Part of the reason was Syracuse is a really good football team. 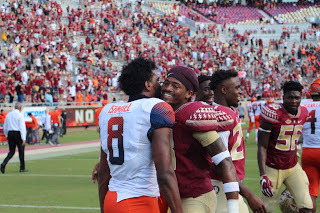 We’ve seen what they can do, especially last week with Clemson, but everybody that’s played them this year has been just talking about them and how much harder they’re playing now and with a purpose now. 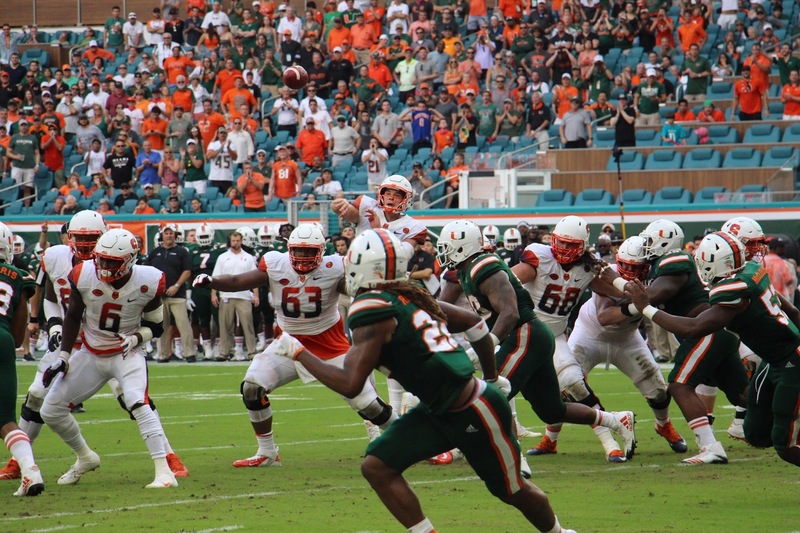 Despite four turnovers by the Orange’s offense the defense held the Hurricanes to 27 points, only allowing Miami to score a touchdown off one of those turnovers. What impressed Bennett was Cole Murphy. Murphy connected on four out of four field goals tries, 22 yards being the shortest. 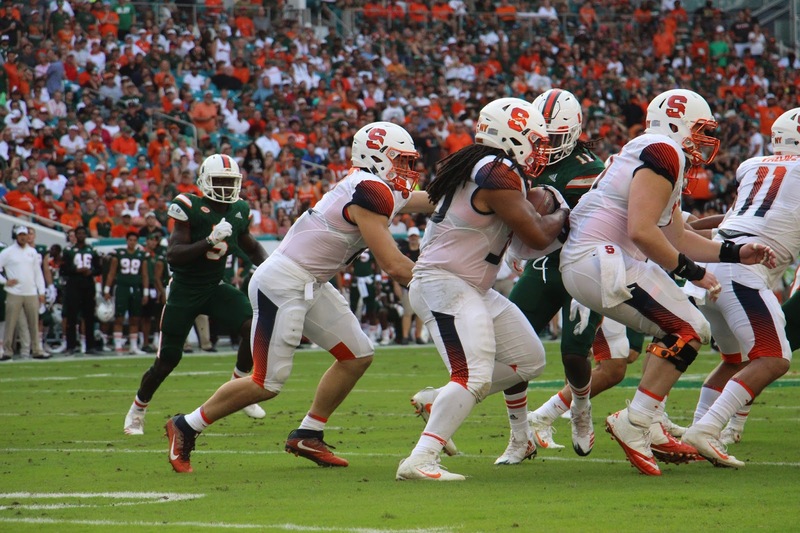 The next three were more than 40 yards, with the longest at 53 in the fourth quarter, putting Syracuse within a point of Miami. 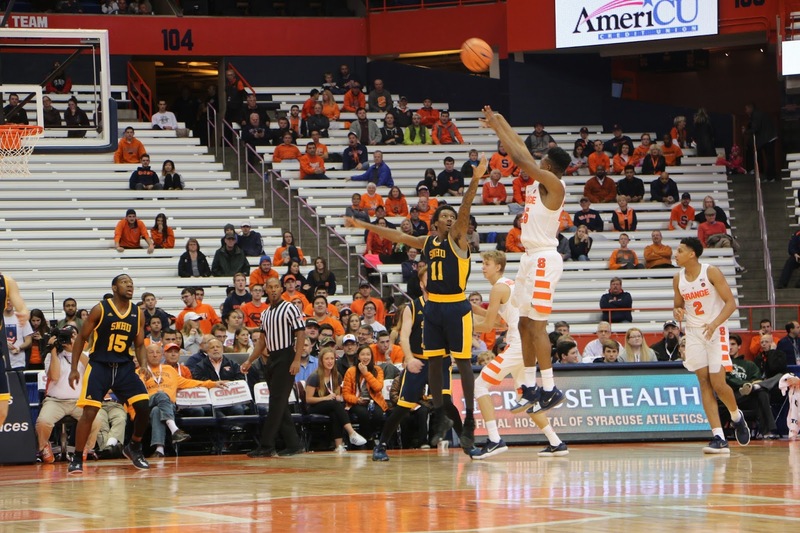 Overall Murphy made 12 out of the 19 points for Syracuse. 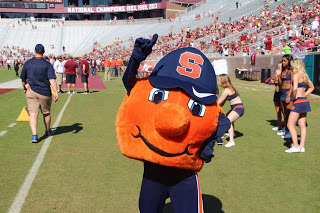 Syracuse has a bye week coming up, but the Orange will face Florida State (2-4, 2-3 ACC) in Tallahassee on Nov. 4. 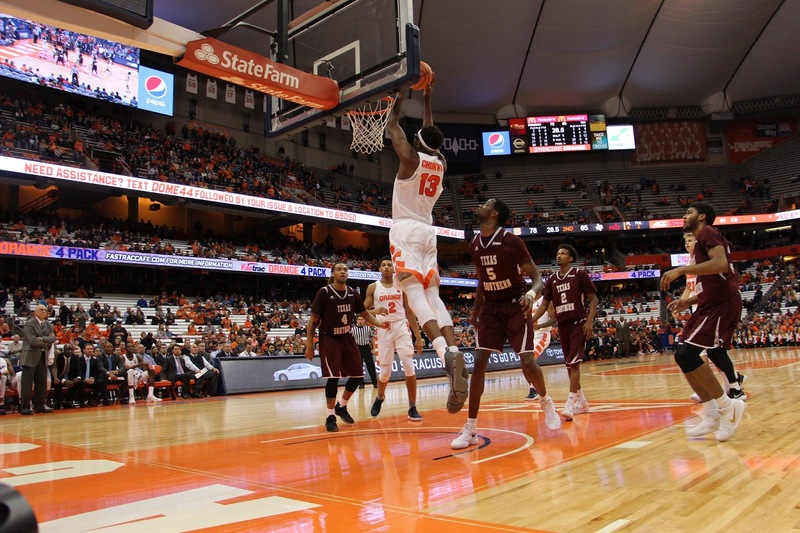 Syracuse is now third in the ACC Atlantic behind Clemson and N.C. State with a league record of 2-2. 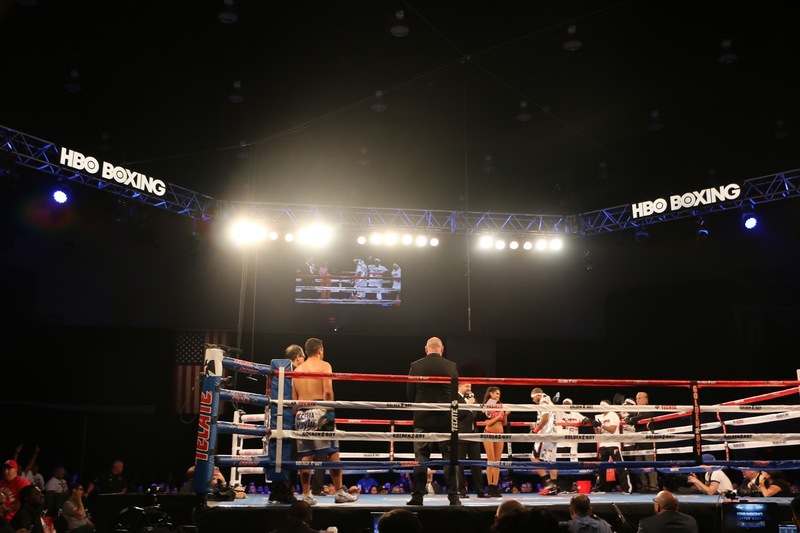 Verona, N.Y. — A new champion was crowned Saturday night as HBO Boxing after Dark returned to the Turning Stone Resort and Casino. 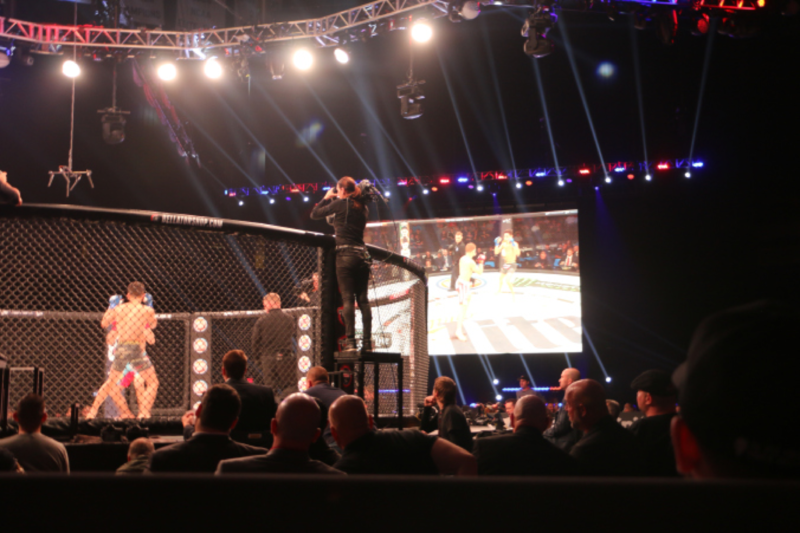 That was just one of nine fights on the card including a match that was televised to the live crowd from across the pond in Belfast, Ireland. 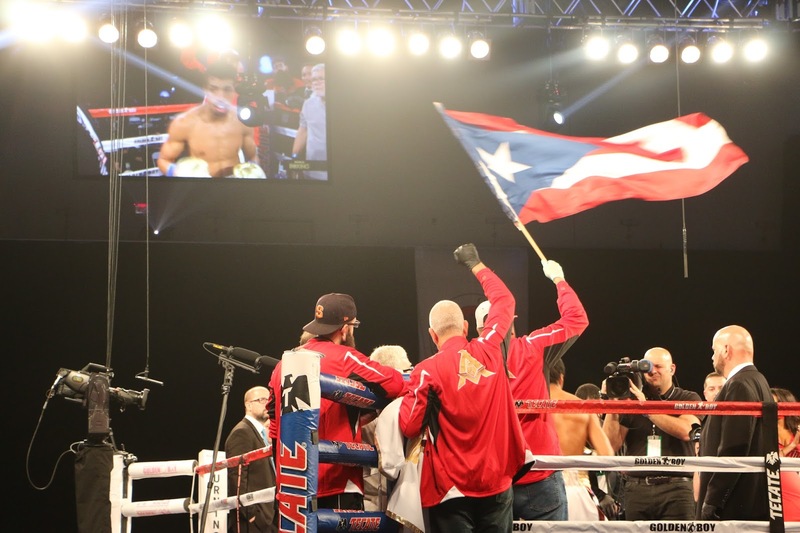 It was a night that started with a TKO, included a fighter who came to the ring in a wolf mask and ended with a new champion’s fans waving the flag of Puerto Rico in the arena. Lightweights in a six-round bout Michael Dutchover (5-0, 4 KOs) defeated Anthony De Jesus (2-3, 2 KOs) via TKO in the fourth round. Super Lightweights in a six-round bout Luis Feliciano (3-0) defeated Istvan Dernanecz (10-6, 7 KOs) via TKO in the second round. 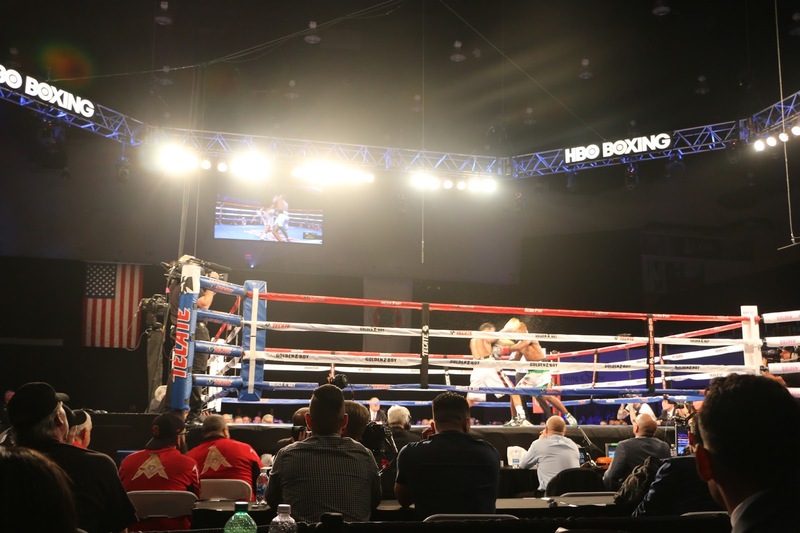 Middleweights in a four-round bout Alex Rincon (2-0, 2 KOs) defeated Steven Andrade (3-2, 2 KOs) via TKO in the second round. *Jezreel Corrales was stripped of the WBA belt after being four pounds over the 130 pound limit. With a record of (54-44-1) Meraz is what many consider a journeyman; he’s a tough guy who will probably never reach the highest echelon of boxing. 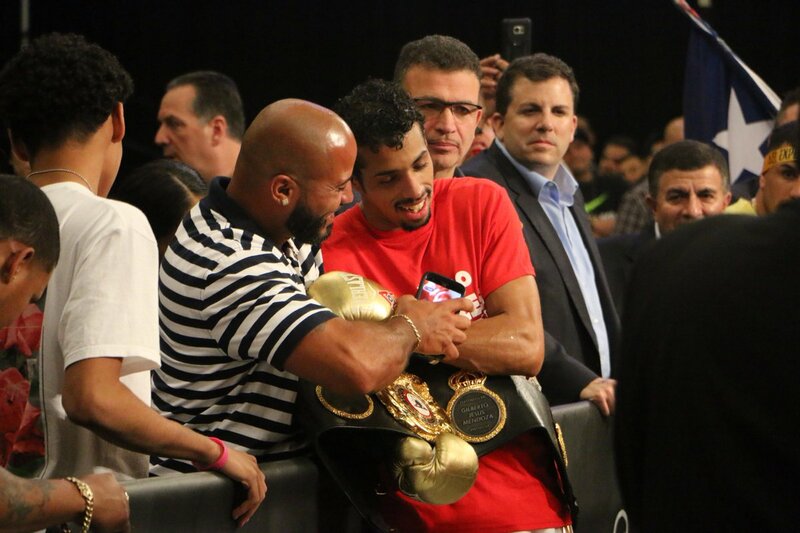 However, Meraz celebrated an accomplishment on Saturday that not many fighters can claim. 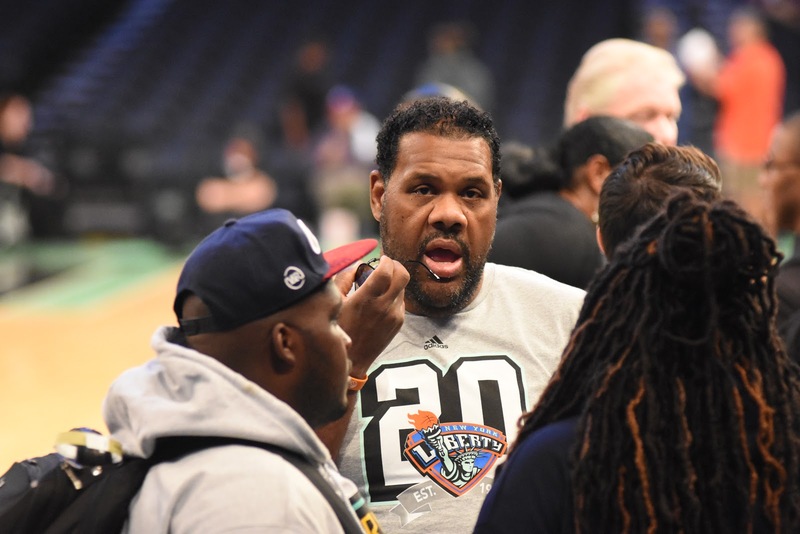 Saturday was his 100th professional bout. 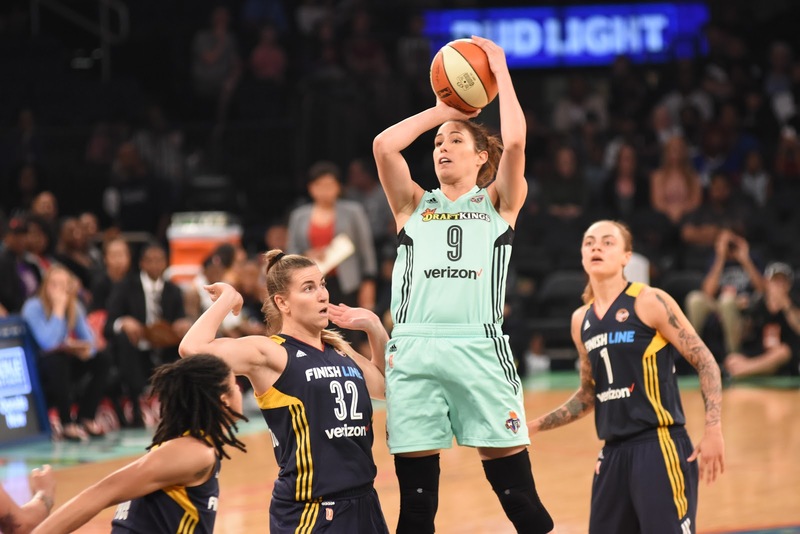 Villa won a comfortable unanimous decision against Meraz, but the accomplishment is still an impressive one. In Boxing it is customary for prospects to face journeymen in their first couple of pro fights. This is to see if they are the real deal and to prepare them for bigger fights that come down the road. D’Mitrius “Big Meech” Ballard was the prospect heading into this fight and Solorio was the rugged journeyman to test him. And did he test him. 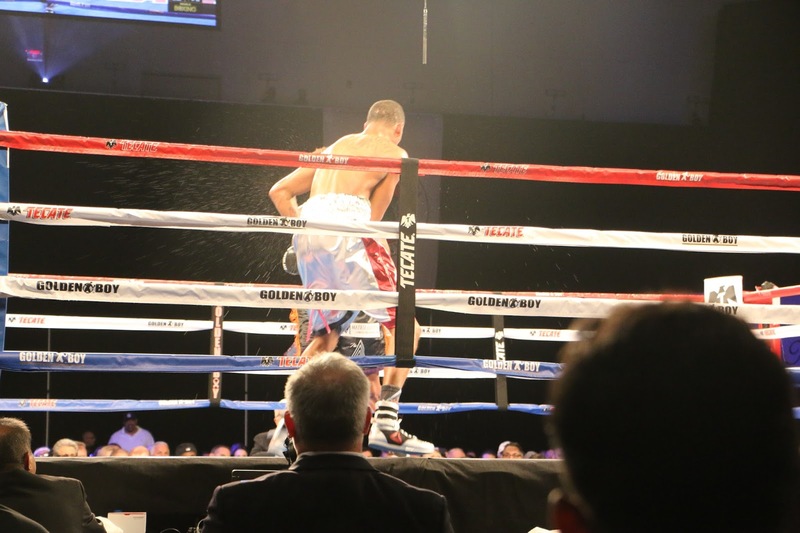 Ballard was on his back foot through many of the rounds as Solorio would not stop coming forward. 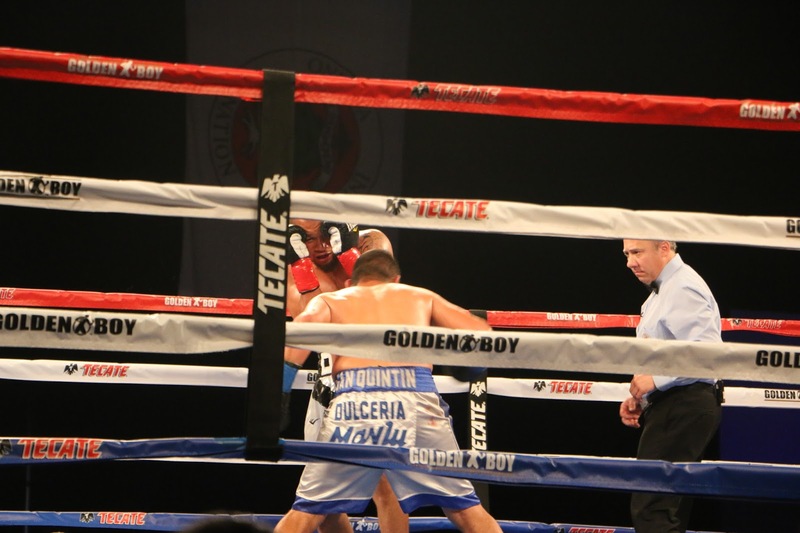 Ballard countered Solorio’s aggression with effective counterpunches and potshots. The formula remained the same for Ballard, but Solorio made it very tough for him, consistently pushing Ballard to the ropes and landing some solid hard punches. What separates journeymen from elite fighters is their technique. That is what got Ballard through this fight. He waited patiently to counter and land effective punches. He read Solorio’s fight patterns and exploited them when he saw an opening. The fight was not easy as Solorio would not quit and gave Ballard all he had. Ultimately Ballard won via unanimous decision. Roach Jr.’s trainer recently died and he dedicated the fight to him and went out looking for a decisive and memorable victory. 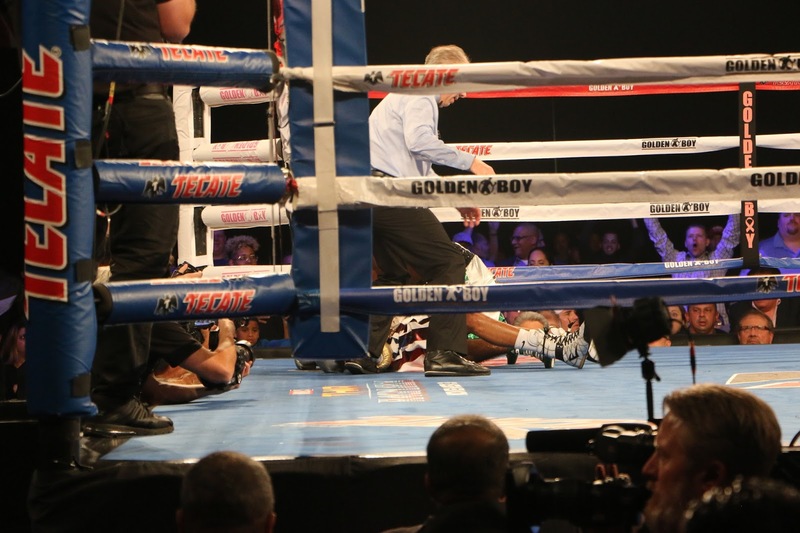 It was memorable not for a titillating knockout, but a bizarre injury to Hinojosa’s foot. 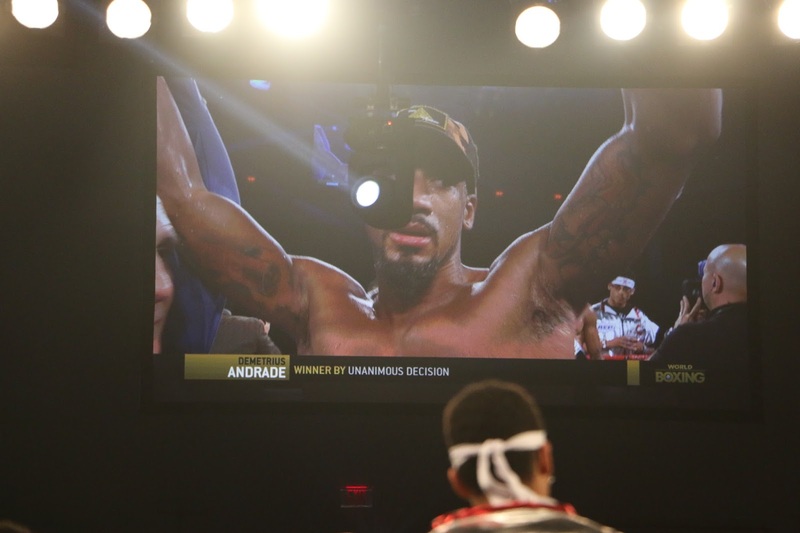 The undefeated Andrade, who came to the ring wearing a wolf mask, was making his Middleweight debut after campaigning at the Junior Middleweight division. 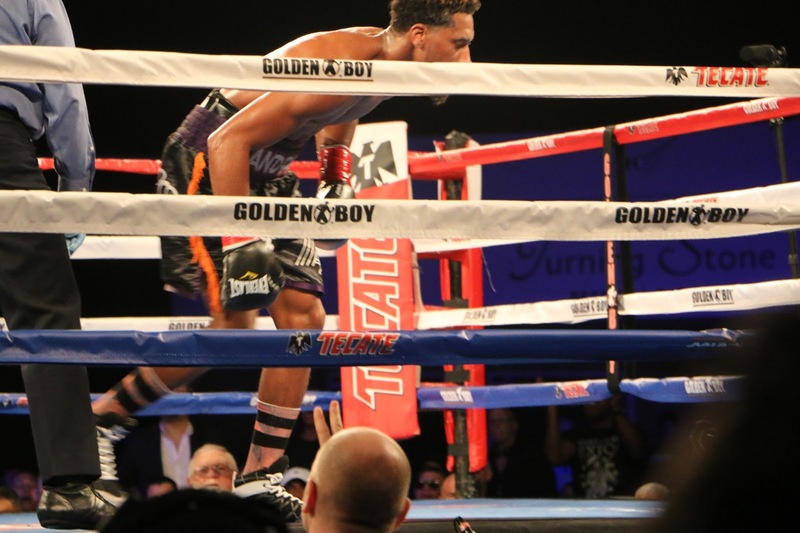 His first test was Alantez Fox who at Middleweight has an unusually tall frame of 6’4″. 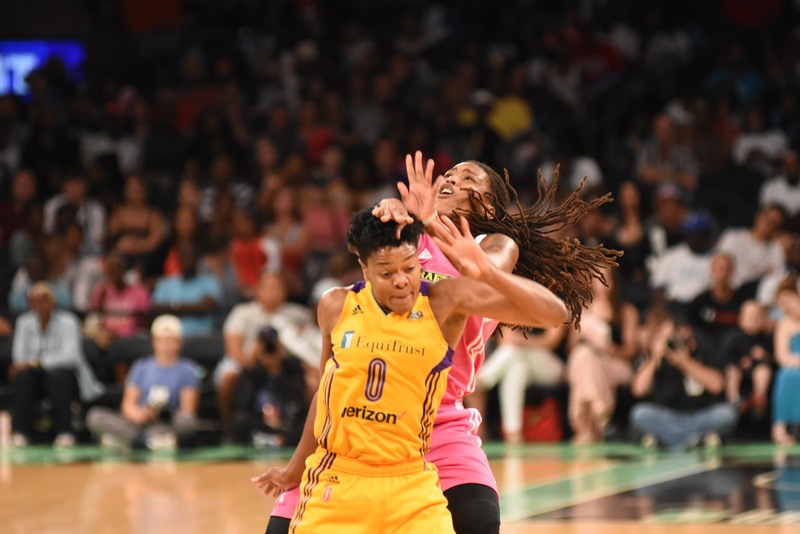 The two exchanged heavy blows from round one. Andrade was consistently landing the harder and cleaner punches on Fox. You could see sweat fly from the ferocity of the punches. 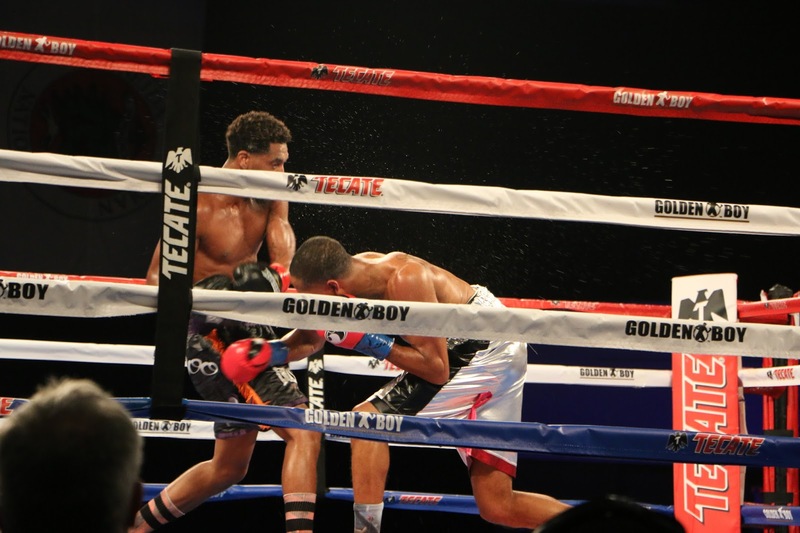 In the seventh round Fox landed a straight right hand that sent Andrade down. 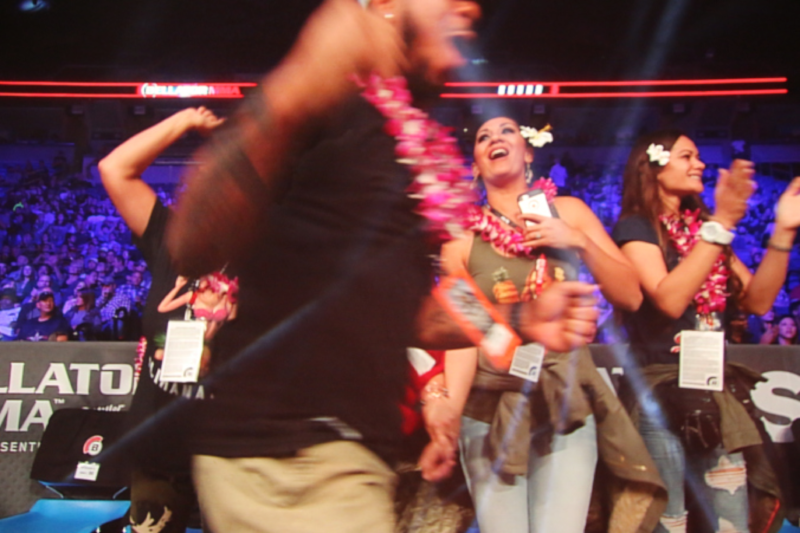 Andrade used his footwork to regain his composure and finish the round strong. 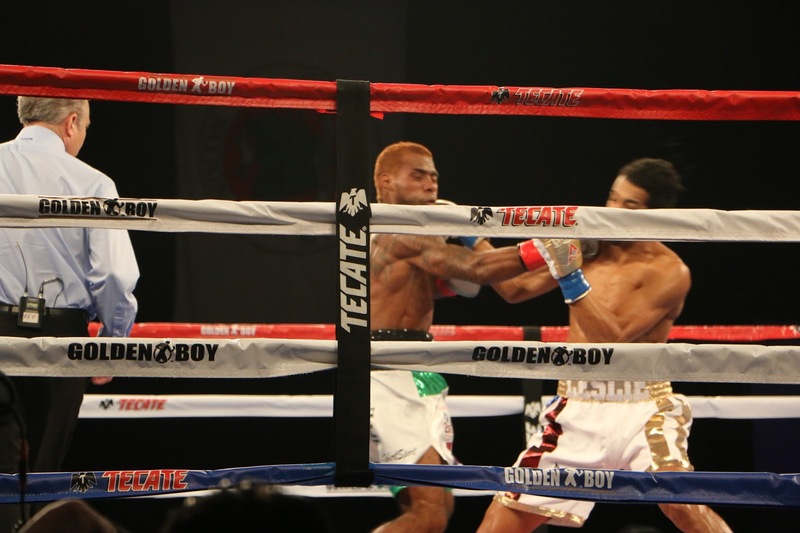 Andrade had a fire lit under him and attacked Fox with more ferocity as the fight went into the final stretch. Fox continued to come forward and try and pressure Andrade, but Andrade’s footwork and counters were too much for Fox. Andrade was declared the victor by unanimous decision. Corrales was stripped of his WBA crown earlier due to him failing to make weight. Some wondered whether the weight advantage would help him against the tough and gritty Machado. 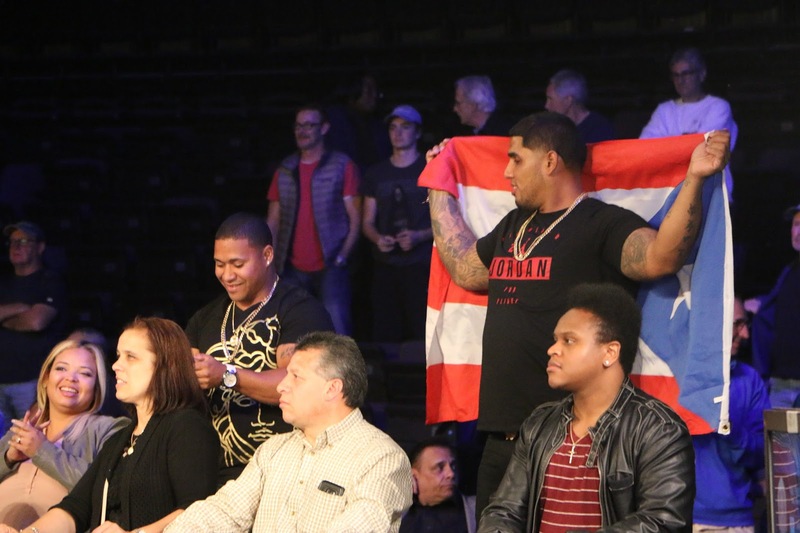 The Turning Stone Resort and Casino was loud for the main event as many Puerto Ricans came to support Machado in his quest for his first world title. 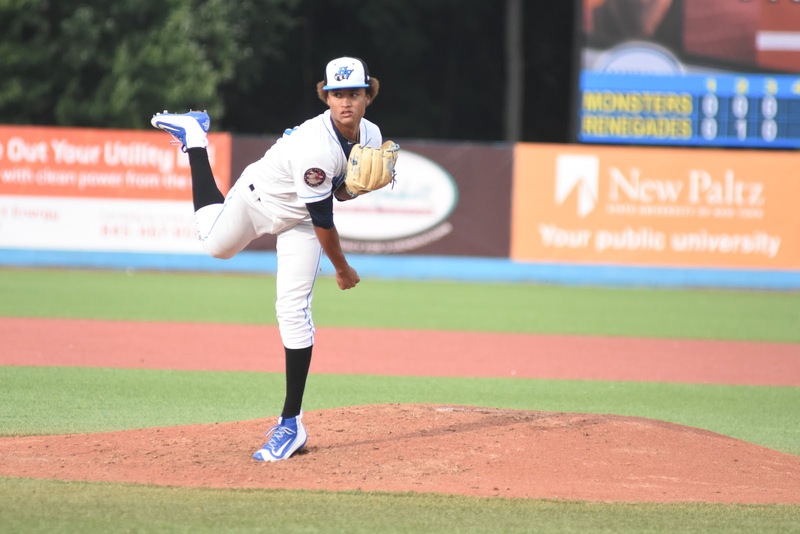 Corrales came out swinging as is is style. 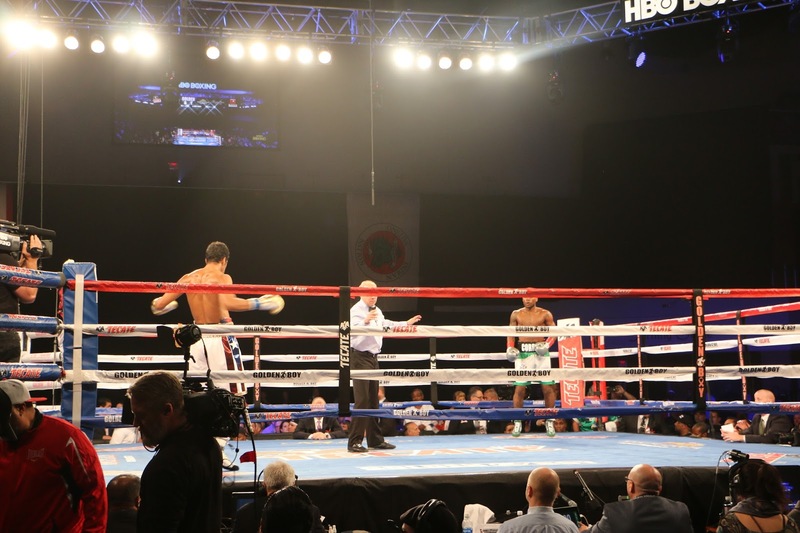 Machado took his punches well, but from round one it was destined to be a slugfest as both men kept coming forward. 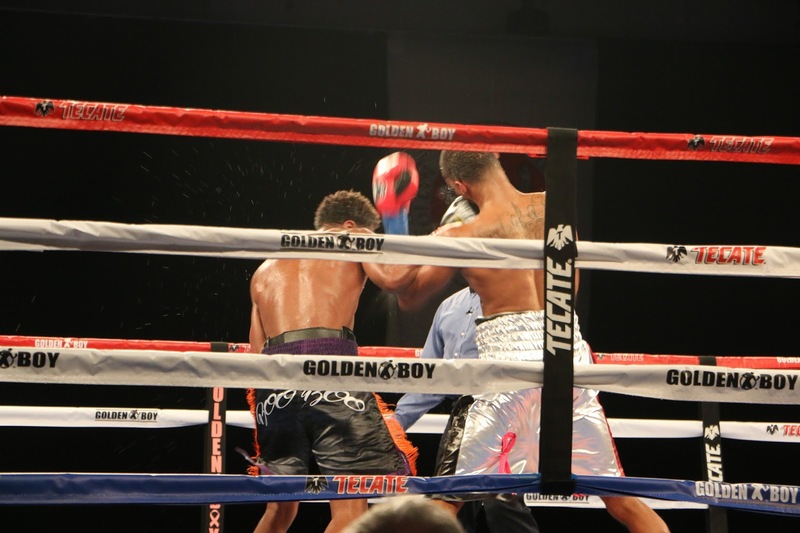 Corrales drew first blood as he landed a flush left hook on Machado’s chin. The punch short-circuited his nervous system and took him down to the mat. 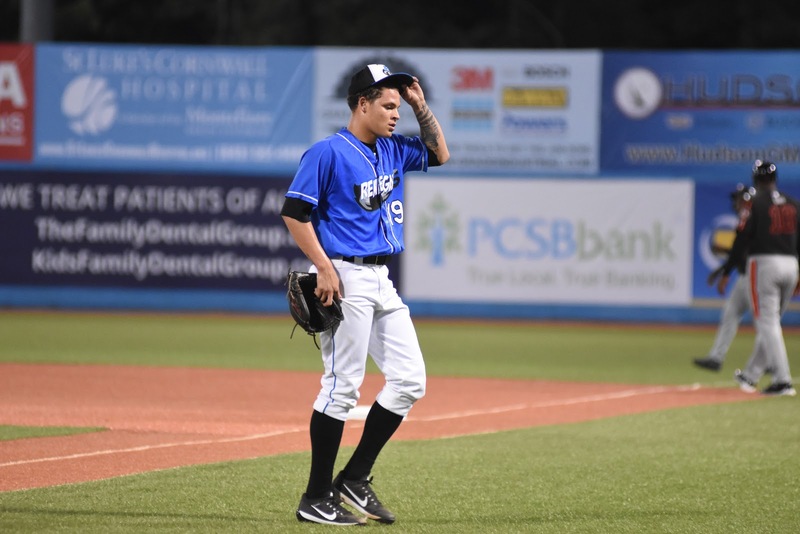 Machado came back and used his footwork to buy some time until he fully regained his composure. 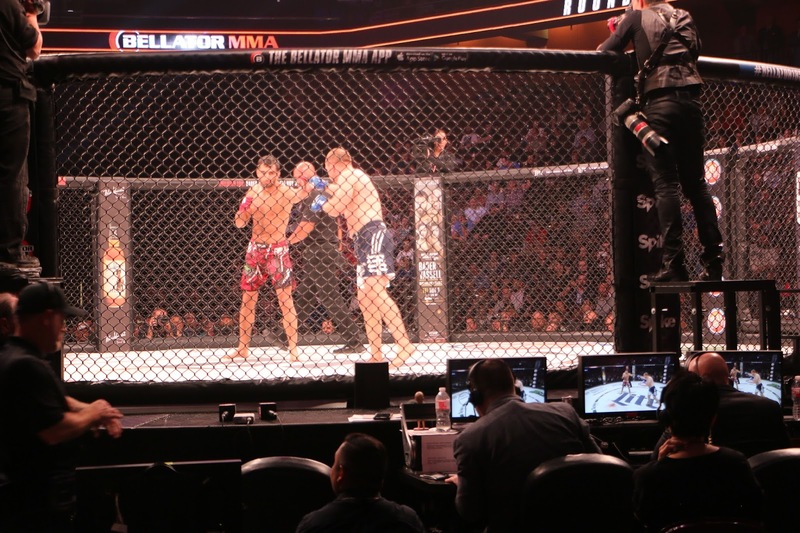 The fight then quickly turned into a wrestling match as Corrales took down Machado with a tackle. The two began exchanging insults with one another in the ring. They plainly did not like each other one bit and were more determined to knock the other fighter out. Machado began timing Corrales’ aggression and started his comeback. 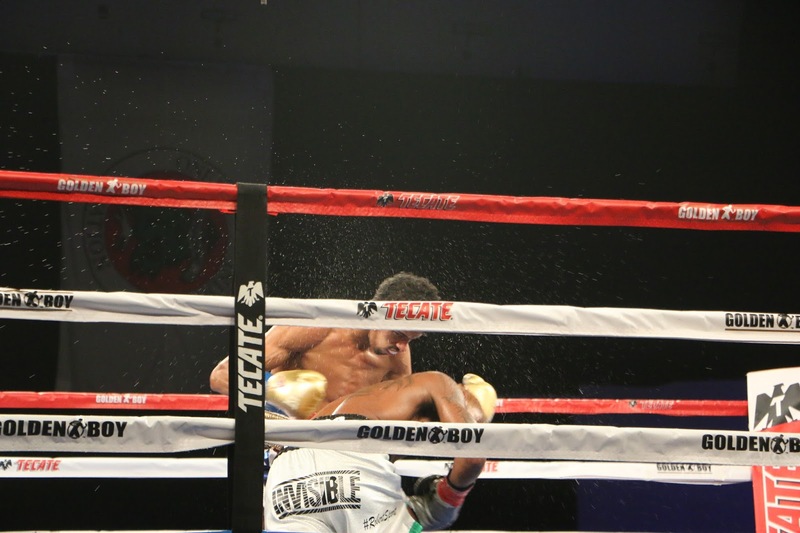 In the eighth round lightning struck as Machado landed a thunderous right hook on Coralles’ temple. Your winner by KO in the 8th round and new WBA Super Featherweight Champion, Alberto Machado. 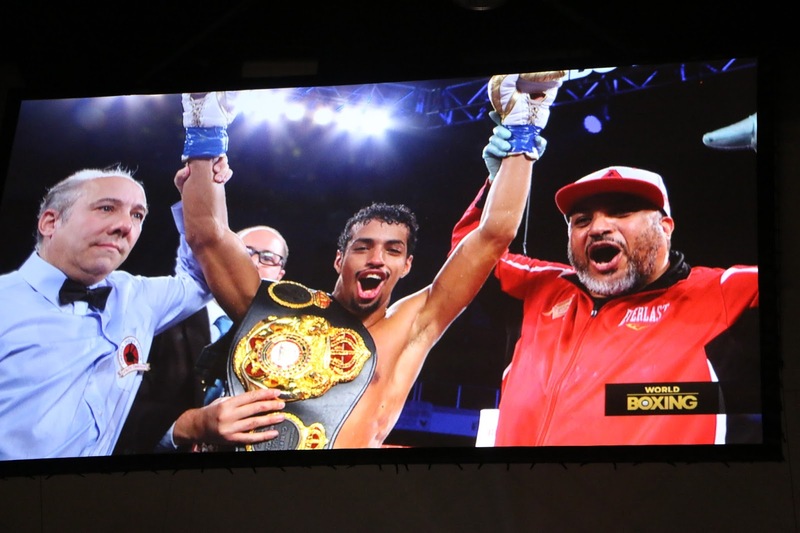 “I won the world title for my family and Puerto Rico,” Machado said in the post-fight interview. 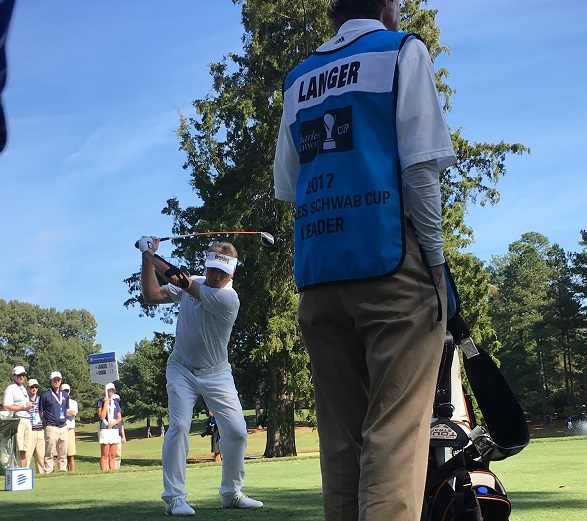 Richmond, Va.— Bernhard Langer came to the par 5 18th at The Dominion Energy Charity Classic Sunday searching for a birdie to force a playoff. He had parred the hole the day before. Instead, the titan of the Champions Tour rolled home a 12-foot right to left downhill slider for eagle, claiming the first round of the Charles Schwab Cup Playoffs and his 35th championship of his Champions Tour career. Langer opened the day with a three-shot lead over Vijay Singh, who played an immaculate ten-under-par over the final 15 holes Saturday. The two World Golf Hall of Famers were the final pairing of the day, and set for a duel for the title. Langer expanded that lead to four strokes with a birdie at the first. The German native failed to add a red number to his scorecard for another 12 holes. Singh capitalized early on with Langer’s inability to convert birdies, closing the gap with birdies at 3, 5, & 6, trailing by one stroke heading to the par 4 seventh. On the seventh green Singh stared down an 18-footer for birdie, which he missed high side of the cup. The ball parked right behind the cup, a foot-and-a-half away. 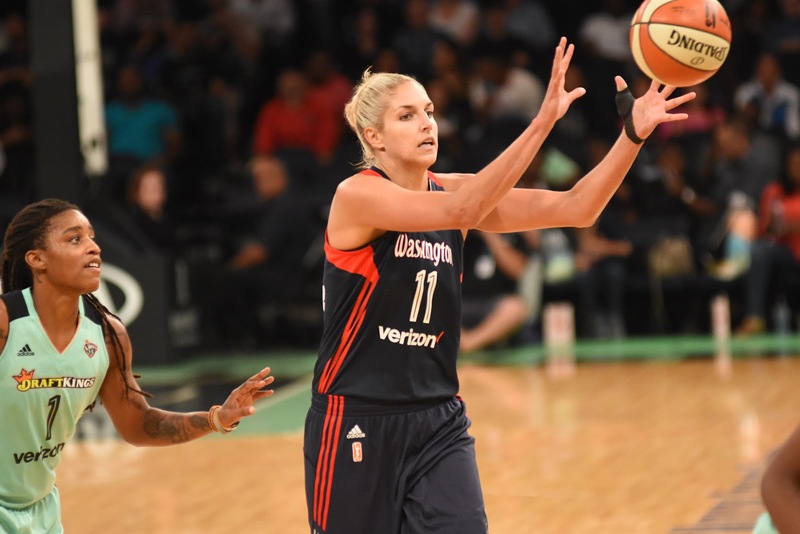 It was not Singh’s swollen ankle that failed him. Nor his right knee, which needs to be replaced. Every golfer’s nightmare, the cursed yips, did him in. He missed the one-and-a-half footer, carding a bogey. He did not make another putt outside three feet until the 18th, where he converted a birdie from 12 feet. He finished the tournament tied for third at -12, alongside Kenny Perry and Billy Mayfair. 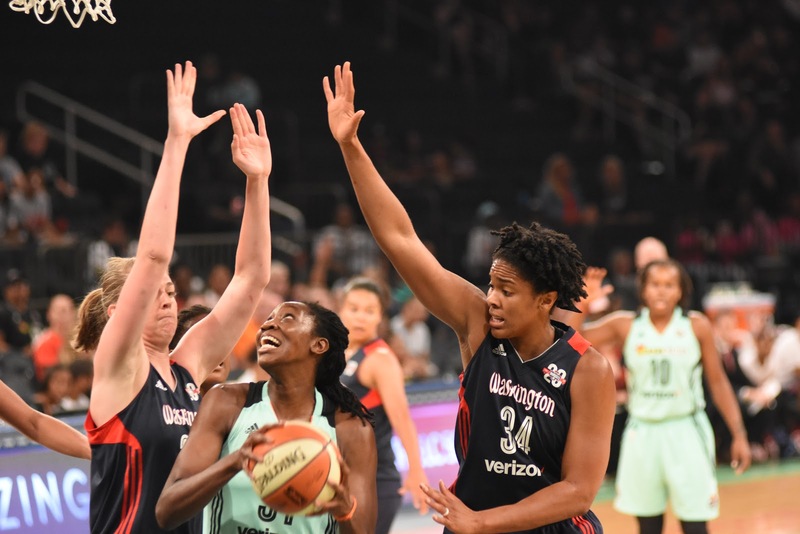 The yips struck again later on in the tournament at a critical juncture. Scott Verplank sat five back of the lead at the start of the day, tied for fourth place at -9. He sat with plenty of Schwab Cup Points to spare to advance into the next round of the playoffs. He could not have foreseen the struggle the groups in front of him had, methodically going about his business. He posted the exact same score on the front and back nine from moving day, turning in another 33/33 for a -6 round. 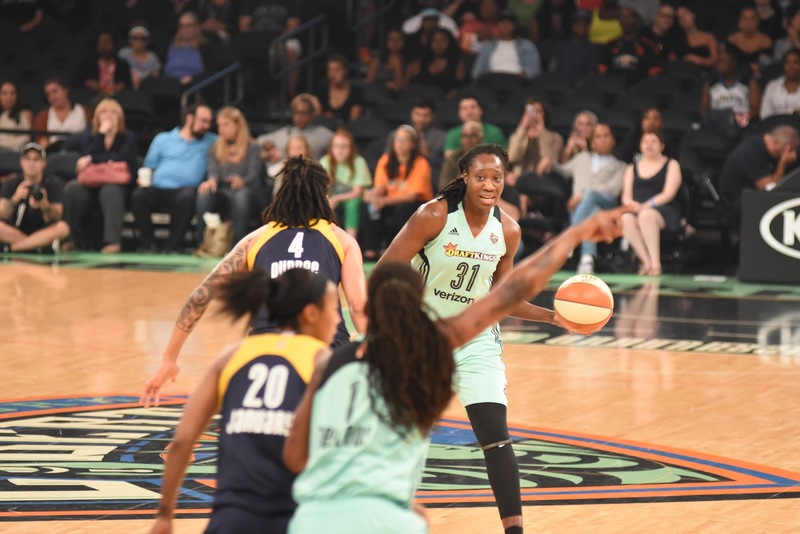 Verplanck had an up and down final stretch, with plenty of moments remaining in his head on his plane flight back home. On the 15th hole, the tournament moved the tee box to make the hole 284 yards. Verplank elected to go to an iron off the tee, laying up and carding a par on the hole. He followed up with a gem of a 16th, going driver-three wood to 15 yards from the pin on the par 5. He had about five paces of green to work with, and parked his wedge shot after one hop to four feet for his birdie. At the 18th, another par 5, he went driver-hybid to a tough back left position. With the pin back right and sloping away from him, he had to pick the ball perfectly to get it to hold. 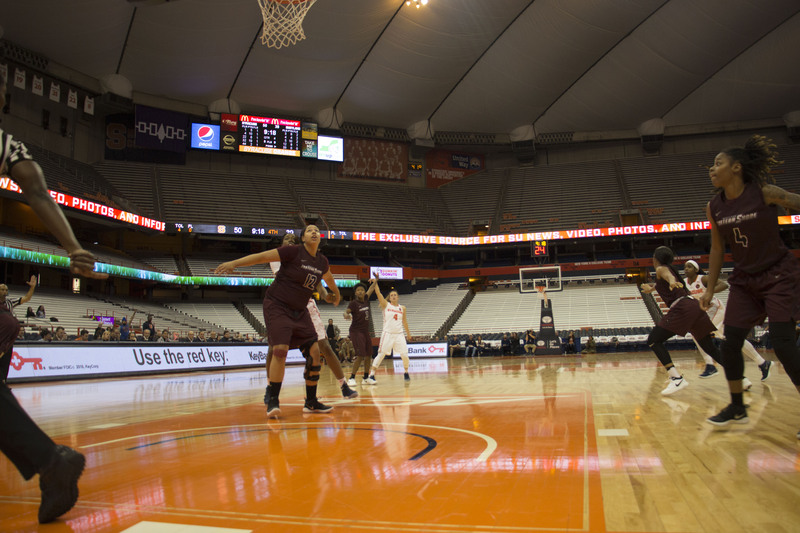 Verplanck stopped his ball on a dime from the slippery angle to set up another four-footer. He followed with a case of the yips. The ball missed right after the pushed putt, and he settled for par. “You know what, if I won 35 times, I probably would have chipped it in or got it up and down,” Verplanker explained. At -15, he held the clubhouse lead, with Langer on the 17th one stroke back. Langer carded his first bogey of the week on the 8th hole. He avoided a bogey on the 6th with a resilient up and down from 75 yards after dropping a ball into the hazard. Langer recorded his second birdie of the day on the 13th, and his tee shot made it look as if he still had more grinding to do. He sat 130 yards out on the 347-yard hole after yanking his tee shot left into the thick Bermuda rough. The ball nestled down, with about a fourth of the ball visible from the top of the rough. Langer had no trees in the way, and in spite of the rough, fired a pin seeker, the ball rolling to four feet above the flag. The yips, which pervaded his opponent’s games, did not find Langer, as he knocked home the short birdie. He bogeyed 14 from just outside the greenside bunker, missing a ten-footer for par. He scrambled for par at the 16th, and missed a 12-footer for birdie on the par 3 17th. The 516-yard par 5 closing hole finished as the easiest scoring hole of the day, with players averaging half a stroke under par. Langer piped his drive down the center of the fairway. He was stuck between clubs for his second shot, a two hybrid and a three wood. He elected to hit a cut three wood, resulting with the ball twelve feet from the cup for the eagle and the win. 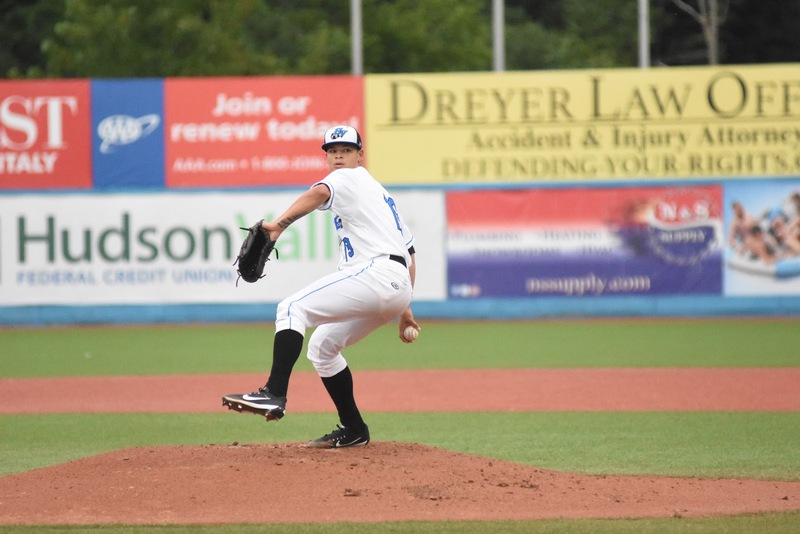 “You never know until it goes in,” Langer said. It dropped dead in the heart of the cup. 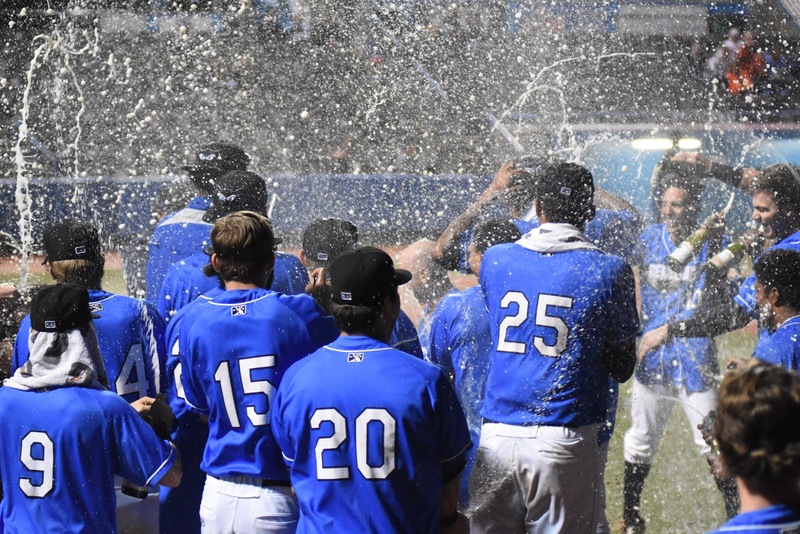 The celebration was on from there, as Langer secured his sixth championship of the year out of twenty four events on the season. 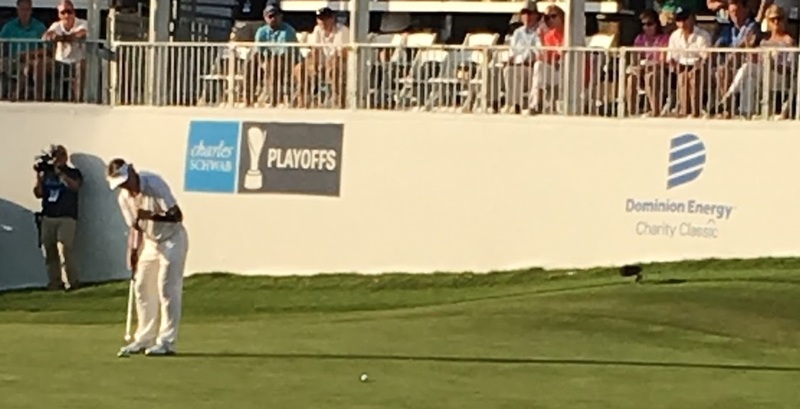 The top 54 players in Charles Schwab Cup points advanced to the Powershares QQQ Championship in Thousand Oaks, Calif.
Fran Quinn and David McKenzie played their way into the field, from 59th and 57thto 53rd and 54th in points, respectively. Quinn carded an impressive 66, including an eagle on the 18th, to punch his ticket to California. Larry Mize and Mark Brooks fell out of the second-round field, finishing at -2 and -1 respectively. The Powershares QQQ Championship takes place next weekend, with the Charles Schwab Playoffs concluding November 10th-12th at Phoenix Country Club in Arizona. 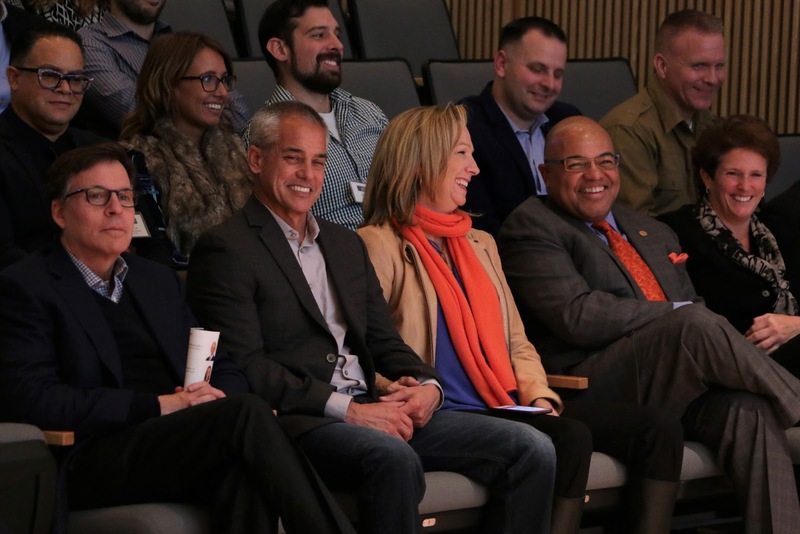 While most are focused on the quality of golf at the opening round of the Charles Schwab Cup Playoffs, Birdies for Charity organizes itself to capitalize on that quality of play. 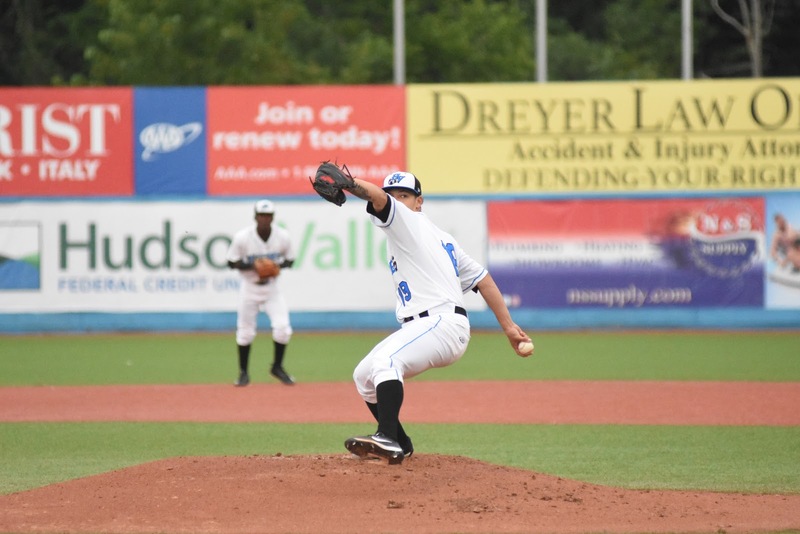 The proceeds from the Dominion Charity Classic went to Virginia Values Veterans Program and Richmond Fisher House, both programs assisting veterans in the Richmond area. But fans can contribute as well through Birdies for Charity. 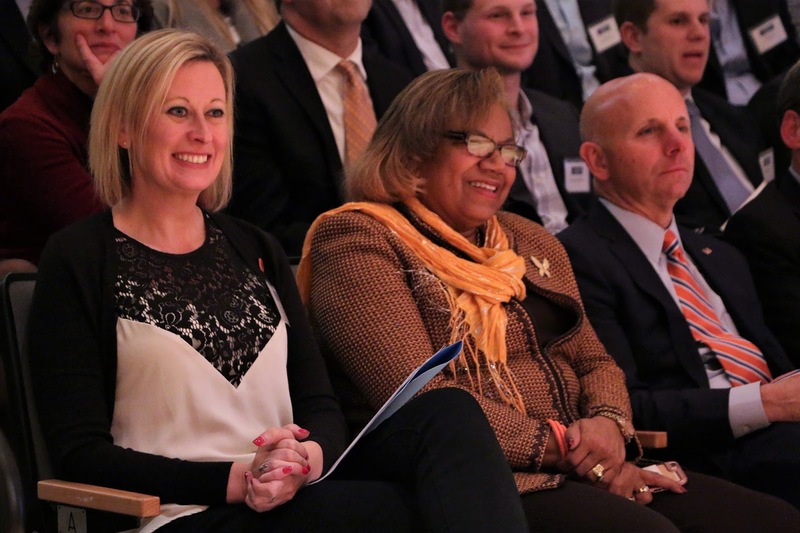 Birdies for Charity was originally conceived at the John Deere Classic, a PGA tour event. In 1992, the tournament organizer offered the person closest to guessing the number of birdies converted by the field a free car, in exchange for a donation per birdie made. The model delivered six times the amount expected to be raised, and has been expanding ever since. Birdies for Charity has 122 charities under its umbrella this year. While the charities are primarily based in Richmond, there are charities from out of state as well, such as Saratoga War Horse in New York. 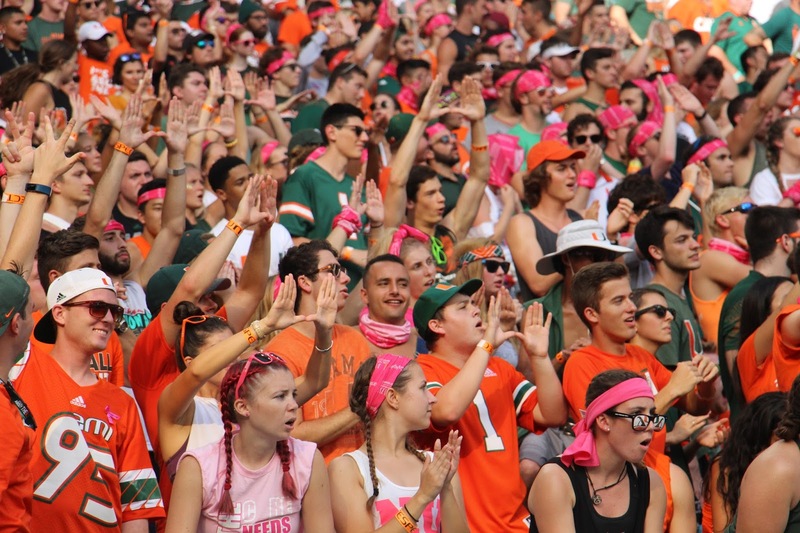 Fans are offered two ways to donate. They can either use a flat fee, or a donation made for every birdie in the tournament. The PGA tour matches 10 percent of any donation made to a charity listed. Monica Mitchell, the organizer of the Dominion Energy Charity Classic’s Birdies for Charity, explained that participation rose from last year, but that was due to the platform starting operations too late last season. 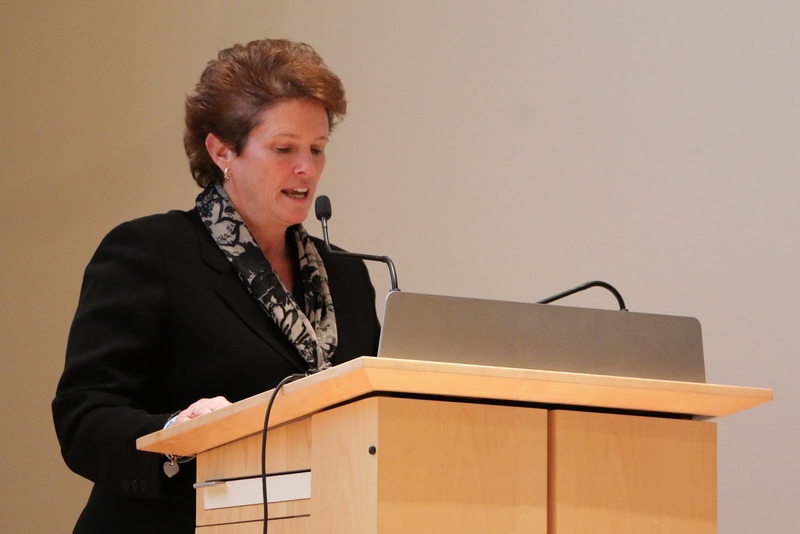 Shes aid a majority of contributions are flat fee donations, as charities reach out to their donors, recommending using the Birdies for Charity platform to capitalize on the extra 10 percent contribution from the PGA tour. 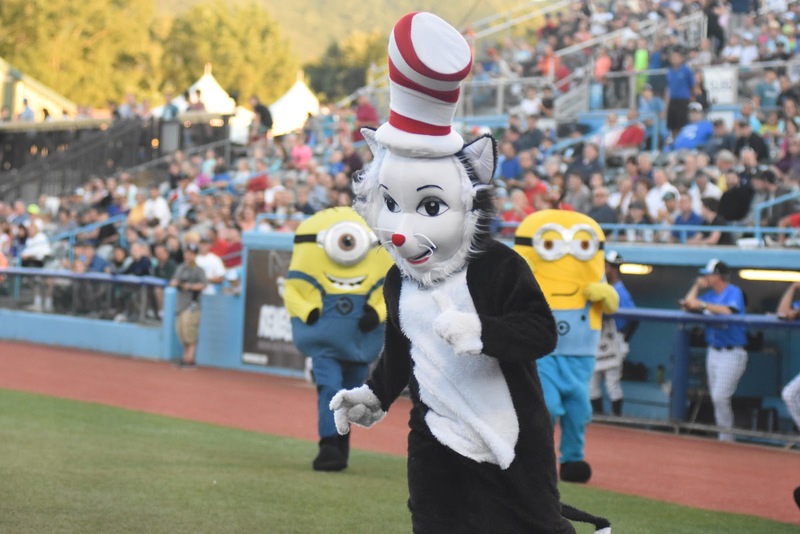 Currently, they have collected $55,000 in flat fees for various charities. The amount collected from per birdie amounts will be calculated after the conclusion of the tournament. There were 584 birdies recorded last year over the three round tournament. 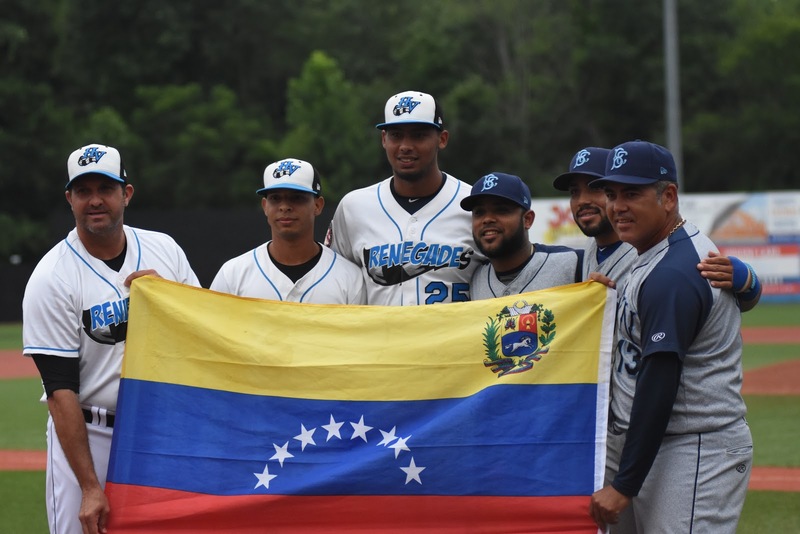 The field expanded from 54 players last year to 72 players this year. Through two rounds this year, 526 birdies are posted. Fans can donate at the tent in the Fan Experience Zone, or online, following this link. 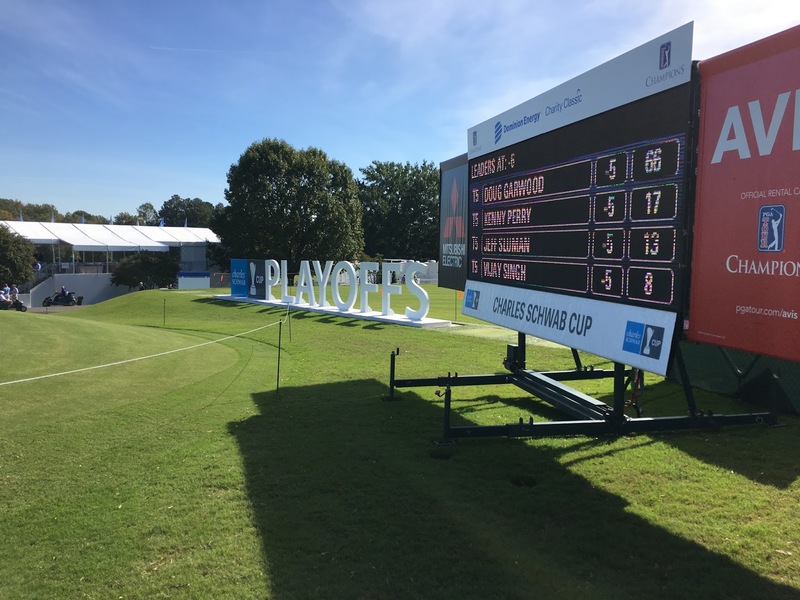 Richmond, Va. —The top of the leaderboard delivered historic numbers on moving day at the opening tournament of the Champions Tour Charles Schwab Cup Playoffs, the Dominion Energy Charity Classic. Vijay Singh and Bernhard Langer tied the course record at The Country Club of Virginia, carding 63 apiece. Bernhard Langer has owned the Champions Tour the last three years, as he is searching for his fourth consecutive Charles Schwab Title. 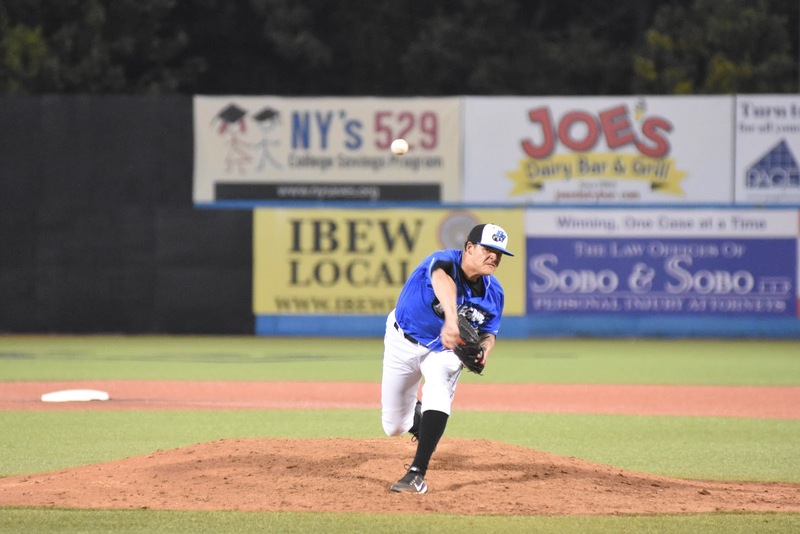 He finished as the runner up the three seasons prior. 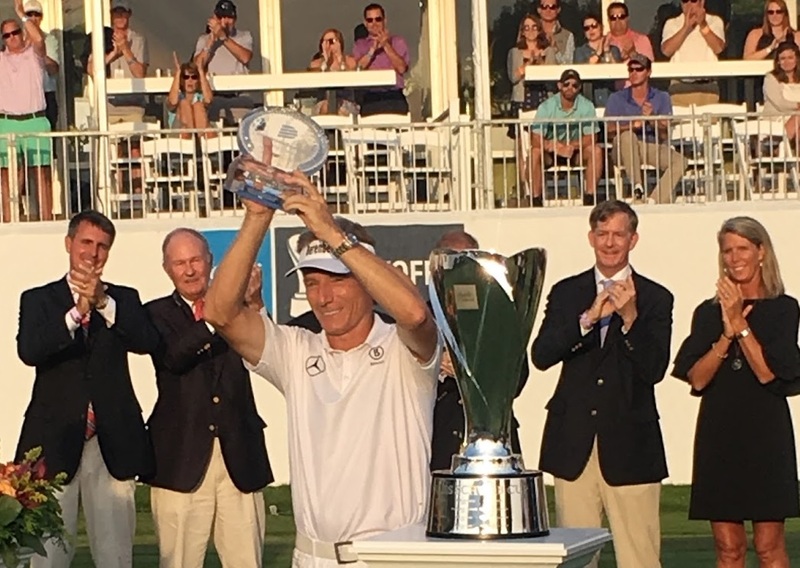 Langer comes off a disappointing T-11 finish last week at the SAS Championship in North Carolina. The 60-year-old German native firmly bounced back from that performance, with five birdies yesterday, and nine birdies today. For the tournament, he has yet to record a bogey enroute to his leading score of -14. He has hit 91.7 percent of greens in regulation, leading the field. Langer strung birdies together beautifully across the day, striking them back-to-back three times over the course of the afternoon. His round was highlighted by his second birdie of the day at the par 3 fourth. From 159 yards, his tee shot rolled just outside the right side of the cup for a tap in two-footer for birdie. Langer’s bid for the course record was shut down by a missed eight-foot slider for birdie on the par 5 18th green. He holds a comfortable three shot lead over World Golf Hall of Famer Vijay Singh. Singh sat at one over through three holes, and one under par for the tournament. He had been reviewing his swing mechanics with his caddy on his IPhone on the driving range. His left ankle swollen like a balloon. A right knee that needs to be replaced. Yet he responded by firing off four birdies in a row. The Hall of Famer capped off the front side with a birdie on the 9th, to turn in four for the opening nine. Singh punctuated his round with a gorgeous up and down from the green side bunker on the 18th from 40 feet out, his bunker shot trickling past the cup for an east tap in to cap off his 63. In spite of Singh’s incredible performance, he holds just a one-stroke lead over Joe Durant, who carded another five under on the day to sit at 10 under par in third place. 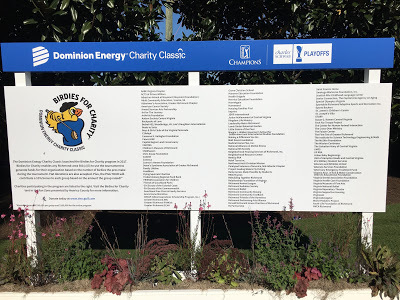 The Dominion Energy Charity Classic is the opening tournament of three of the Champions tour Charles Schwab Cup Playoffs. The top 72 players from the money list qualify for the tournament, with the second tournament field cut down to 54. The points are determined by money earned, dollar for dollar. In the Cup Playoffs, the points are worth double the amount of cash won. Larry Mize entered the tournament at 53rd in the money list, and is projected to drop back to 56th if his current place of T-45 holds. Mize shot one under for the second consecutive round. David McKenzie is now projected at 55th, moving up from 57th after shooting up to T-17. McKenzie currently holds a 17,077 projected point advantage over Mize. Miguel Angel Jimenez finished the day eagle-birdie-eagle to post two under for the day. His stretching routine is always worth another view. He holds two of the nine eagles made so far at the Dominion Energy Charity Classic. The course’s average round dropped from 71.1 to 69.4, the field taking advantage of perfect scoring conditions. Only seven players posted rounds above par. Tomorrow, the first tee time is at 8:10 A.M. EST. 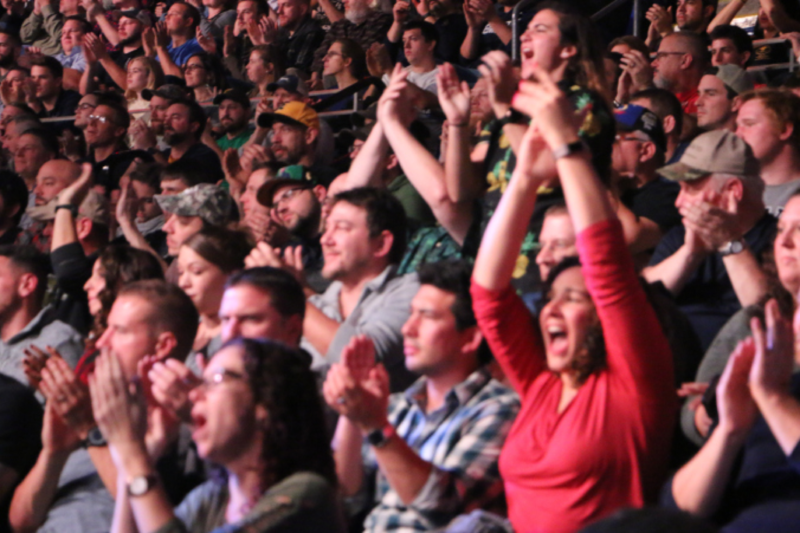 Langer and Singh are the final pairing, teeing up at 1:07 P.M.
Uncasville, Conn. — Bellator 185 was brimming with anticipation for the long-awaited debut of Gegard Mousasi Friday night at Mohegan Sun. Mousasi was a former UFC Middleweight title contender and had fought some of the best in the world. 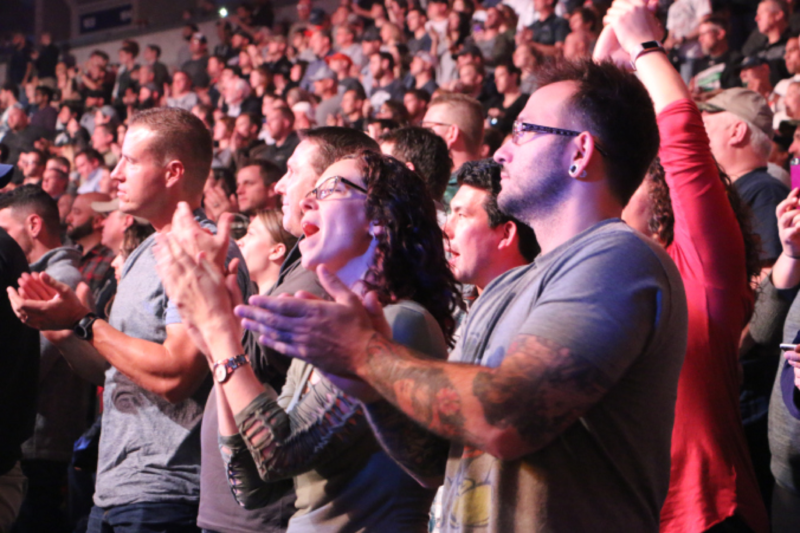 The crowd was excited to see boxing sensation Heather Hardy continue her foray into the world of MMA. 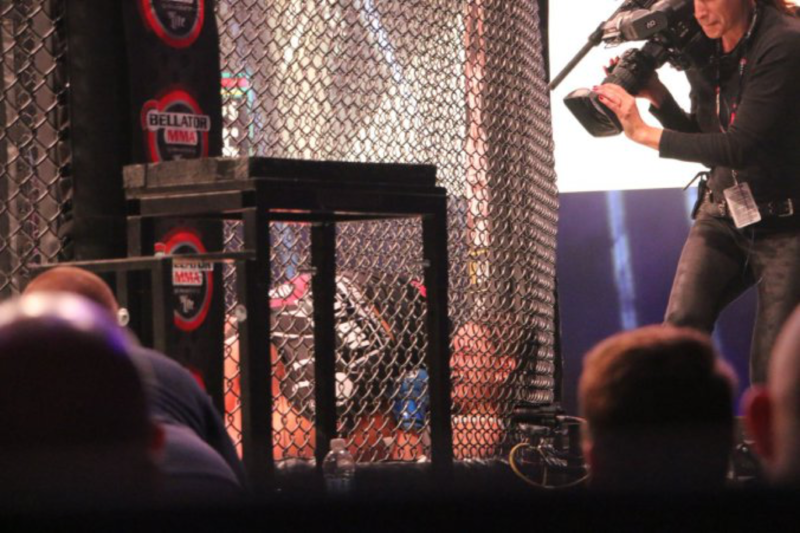 The night was full of surprises, which tells you that anything is possible in the MMA Cage. Here is the fight card with the result of each bout. 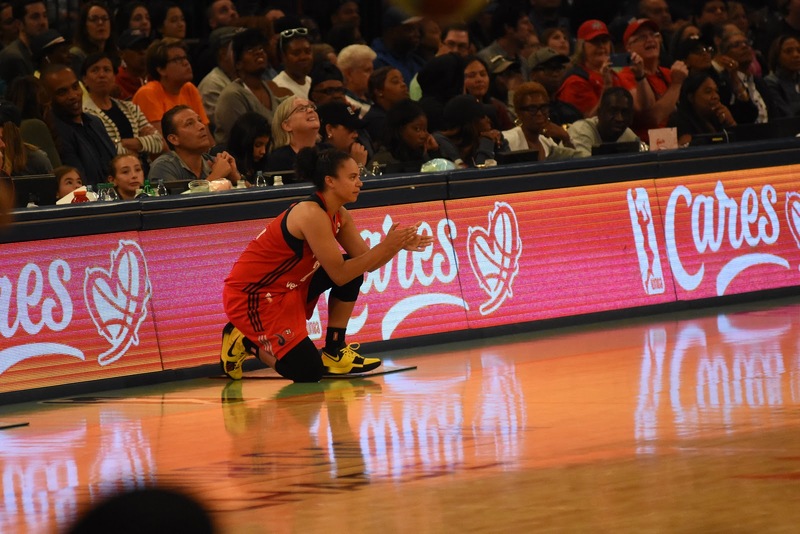 Lisa Blaine versus Ana Julaton was a test of grit for both women. 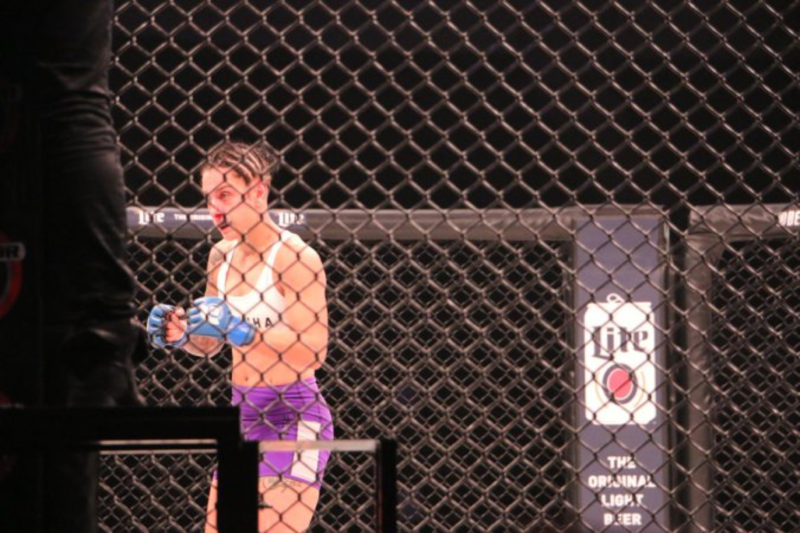 Julaton dominated the first half of the fight with her control of range and striking. She was also comfortable exchanging holds on the mat. Blaine managed to wrestle Julaton to the mat in the later part of the fight and land some strikes. 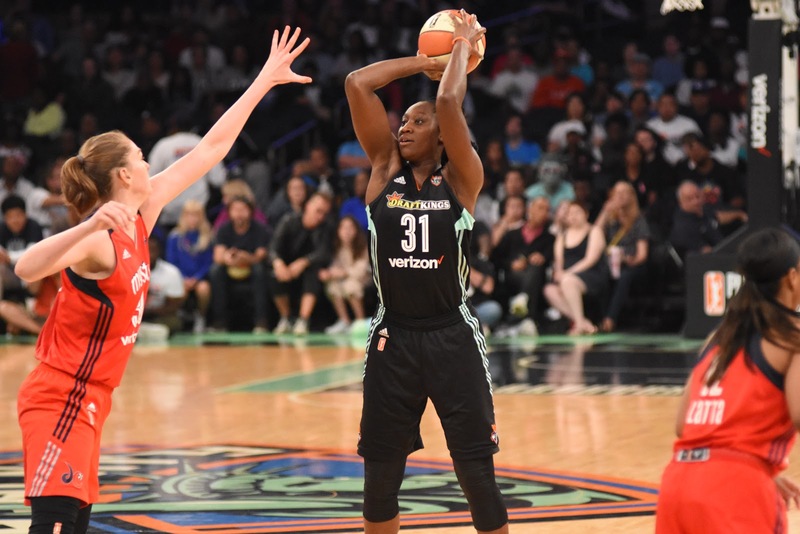 The rounds were hotly contested but she swayed the judges in her favor heading into the third and final round. The third round was hotly contested. 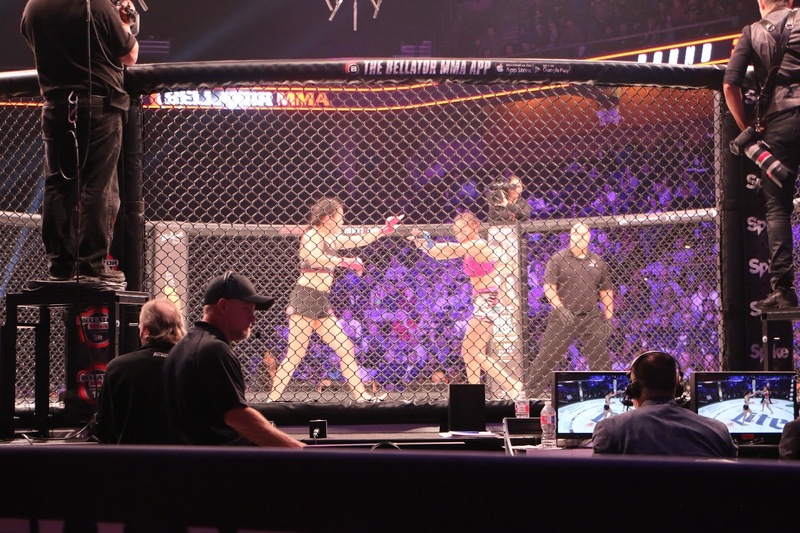 Blaine went into second gear to try to out-will her opponent.The fight ended in the center of the ring with both trying to get the upper hand and squeeze a decision or land a knockout. Blaine ultimately swayed the judges for a close but hard-fought split decision victory. 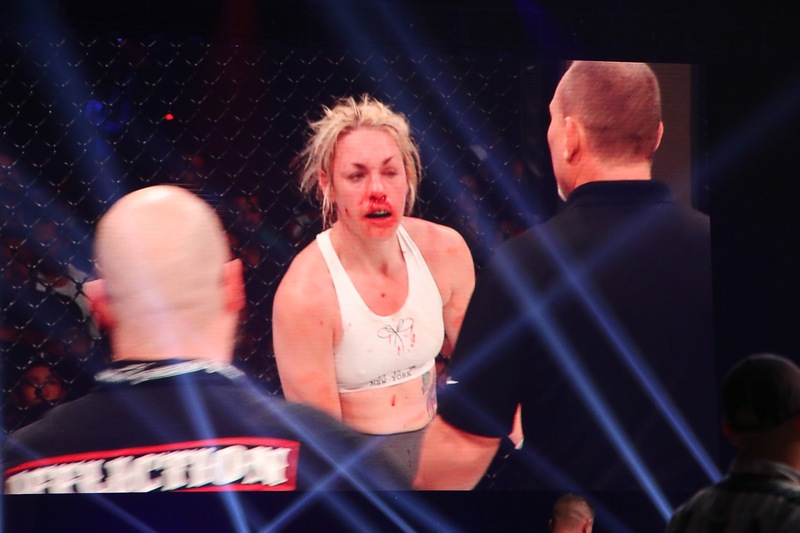 Heather Hardy entered the cage for her second ever MMA Bout and many expected her to continue her winning ways. 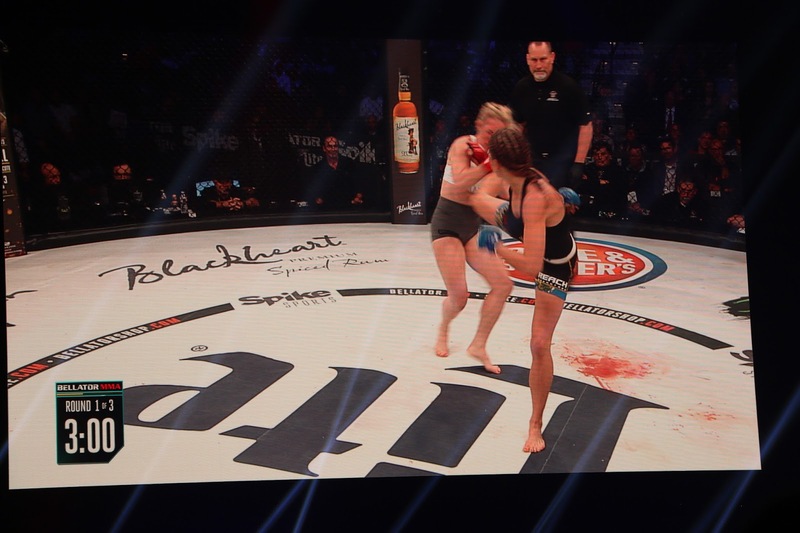 Hardy was the favorite in this fight as she has been positioned to be a star in Bellator. 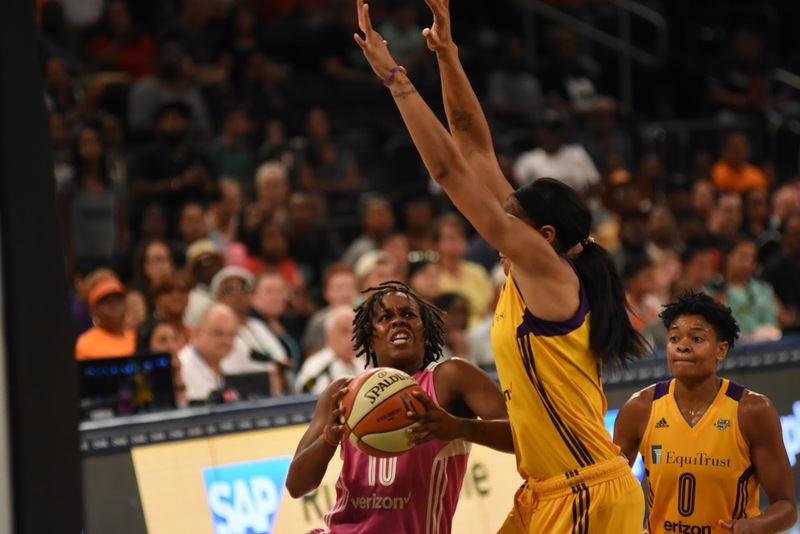 However, Kristina Williams in her pro debut had other plans. 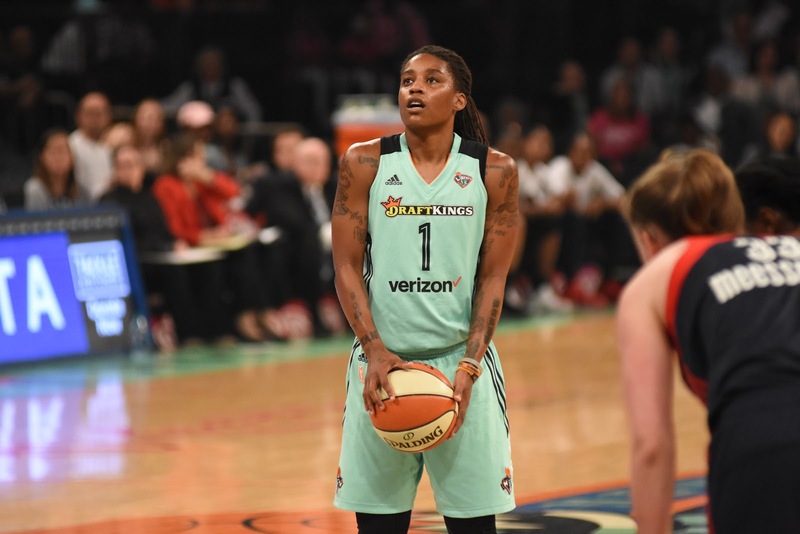 From round one Williams asserted her dominance by exchanging with Hardy. 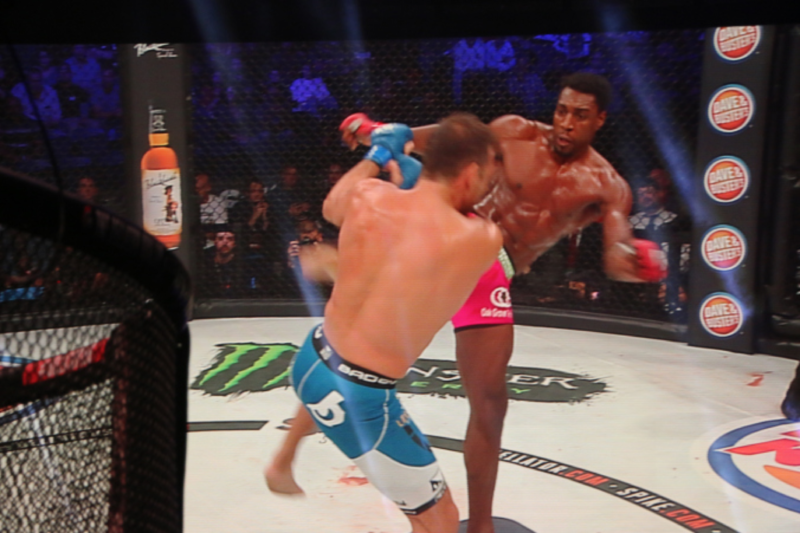 Hardy had no answers to Williams’ arsenal of strikes and kicks. 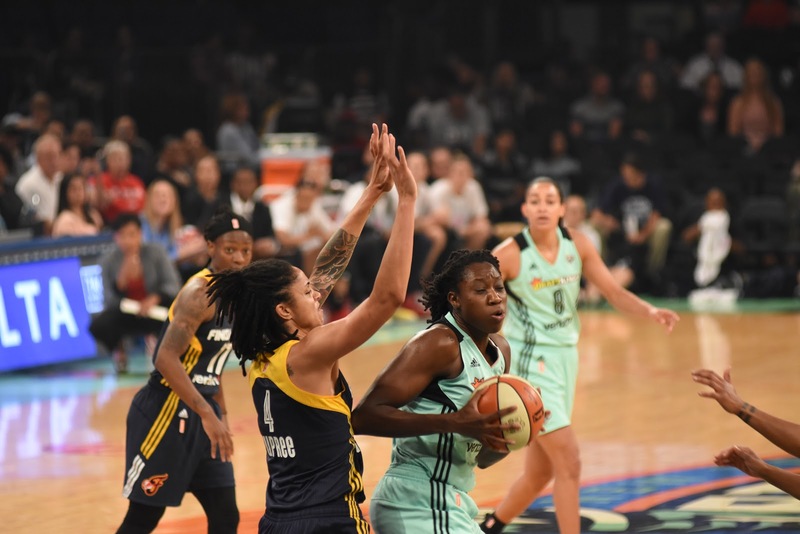 As the second round commenced Williams rushed Hardy and continued to beat and batter her. 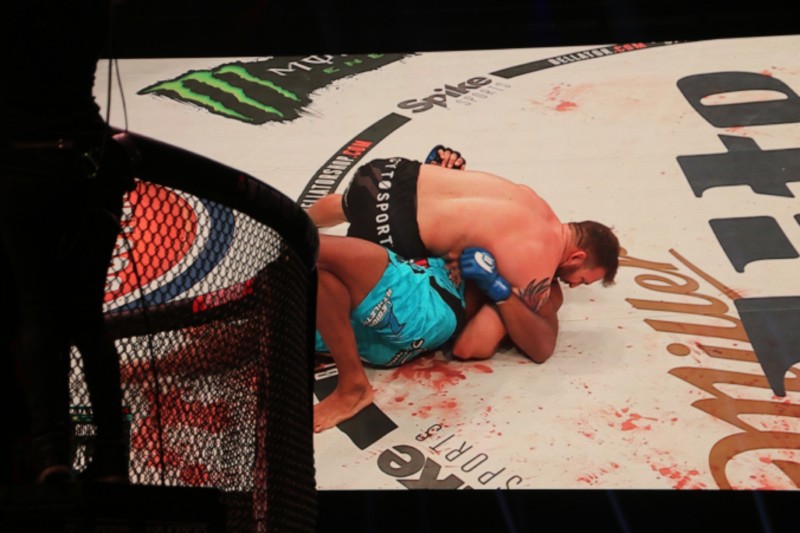 The fight ended in the secnd round with a vicious headkick that forced the cageside doctor to examine Hardy’s wounds. 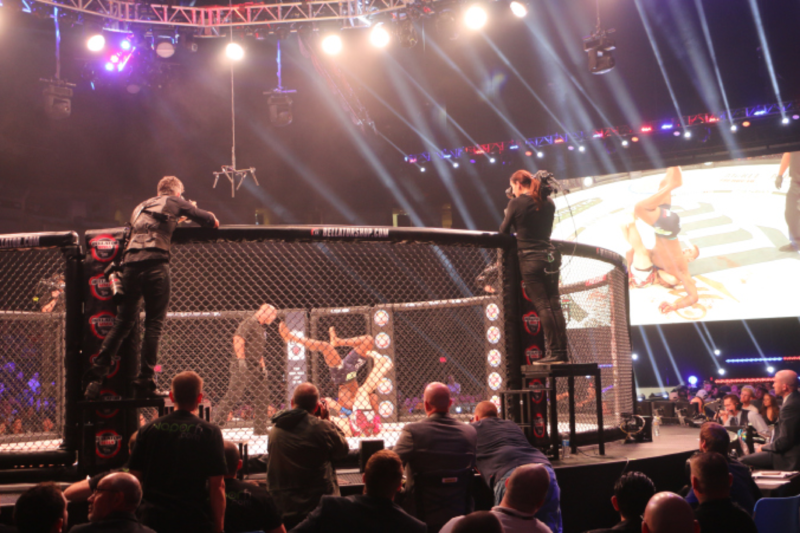 The main event was Gegard Mousasi’s highly anticipated Bellator debut against Alexander Shlemenko. 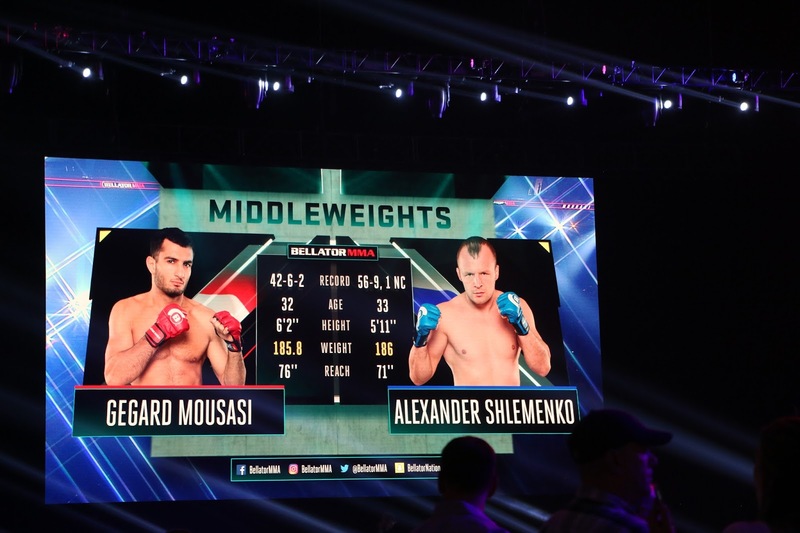 The story driving this bout was how would Mousasi be able to stand toe to toe with the very tough, rugged, and hard-hitting Shlemenko. 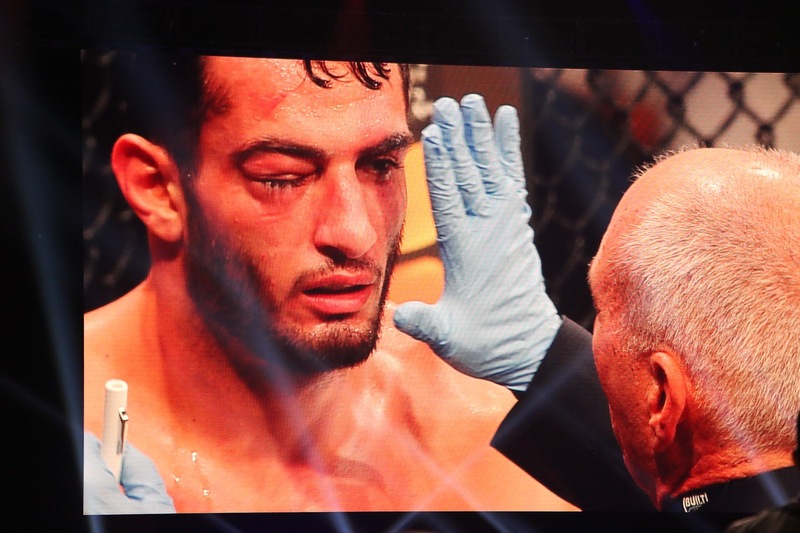 It was not an easy debut fight, despite Mousasi being a highly regarded fighter. The fight began with Mousasi out-wrestling Shlemenko and continuously trying to lock in a rear naked choke. 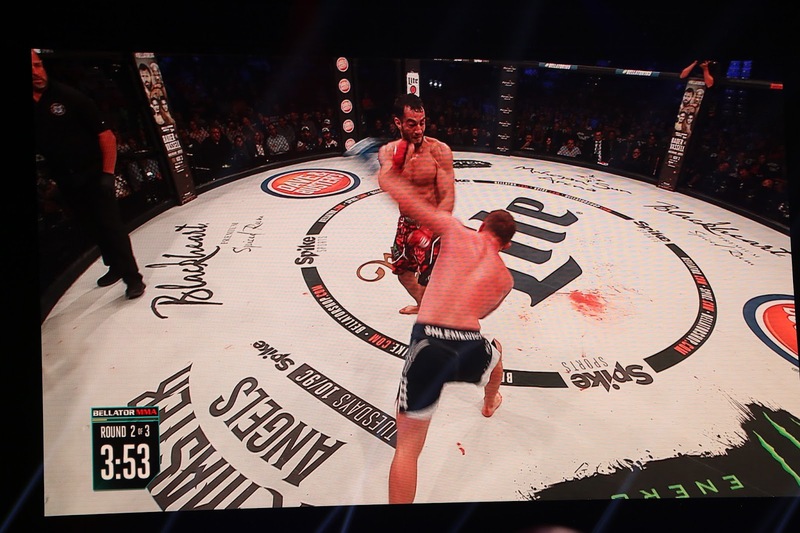 However, Shlemenko showed his power and sneaked in a strike that formed a mouse on Mousasi’s right eye. The eye immediately began to swell grotesquely. 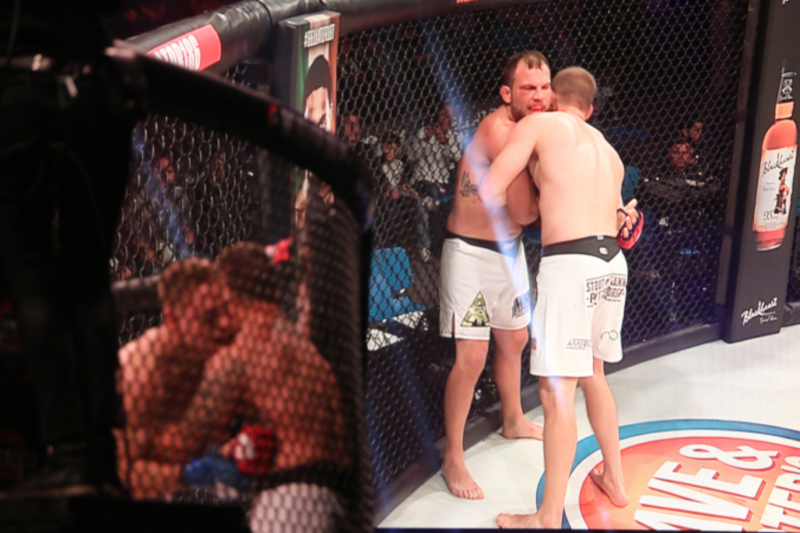 As the fight progressed Shlemenko began focusing on Mousasi’s eye. Mousasi was on his back foot trying to protect himself from Shlemenko’s scary strength. Mousasi had success on the mat, but Shlemenko successfully defended his rear naked choke attempts. 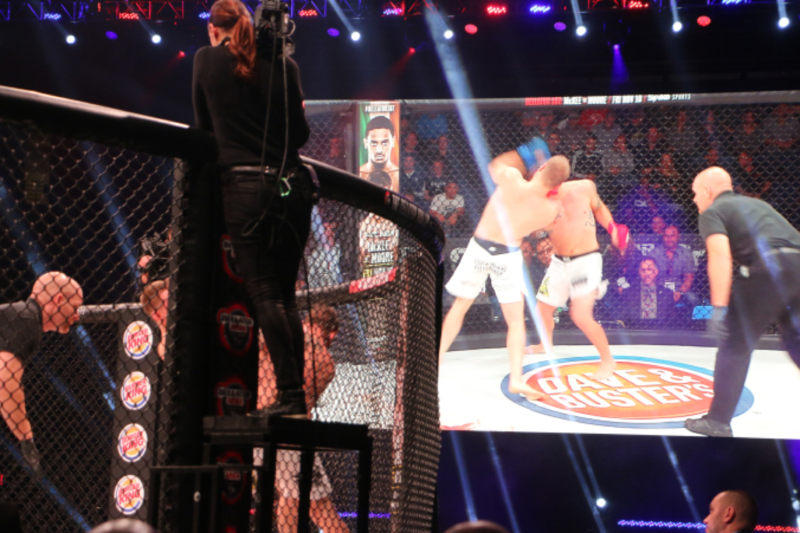 Heading into the third Shlemenko took control as Mousasi was backpedaling away from him. 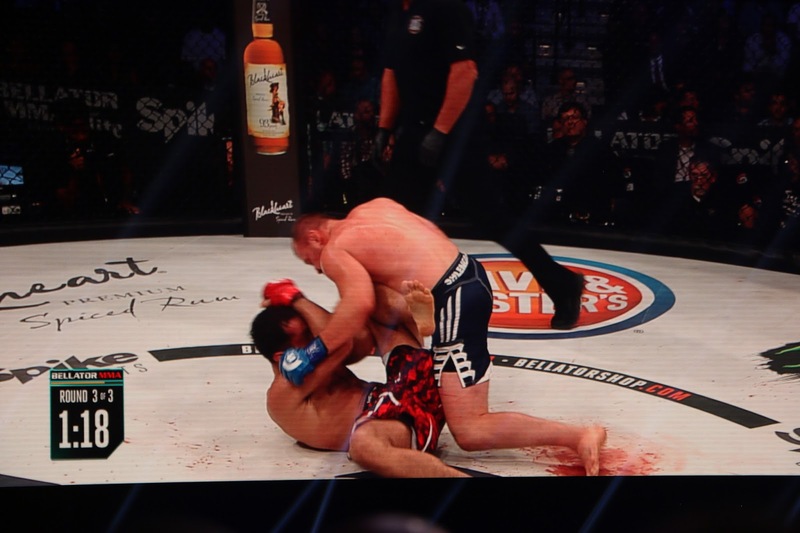 Shlemenko even had success on the mat as Mousasi seemed exhausted and hurt. 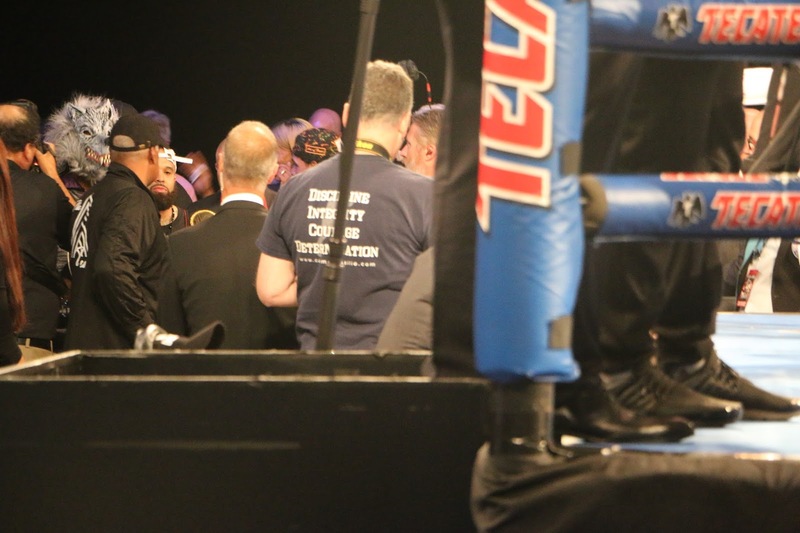 Many in the audience believed Shlemenko won the fight as he was thoroughly in control in the third and final round. 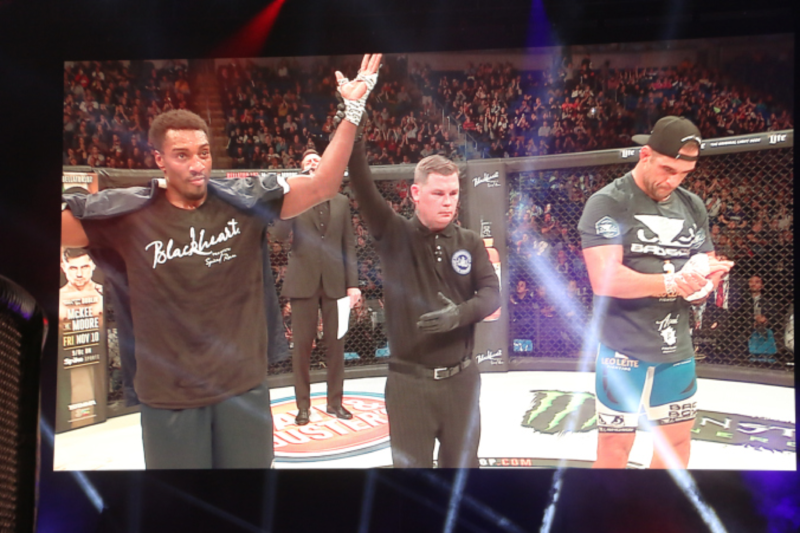 But the winner was Mousasi by unanimous decision. 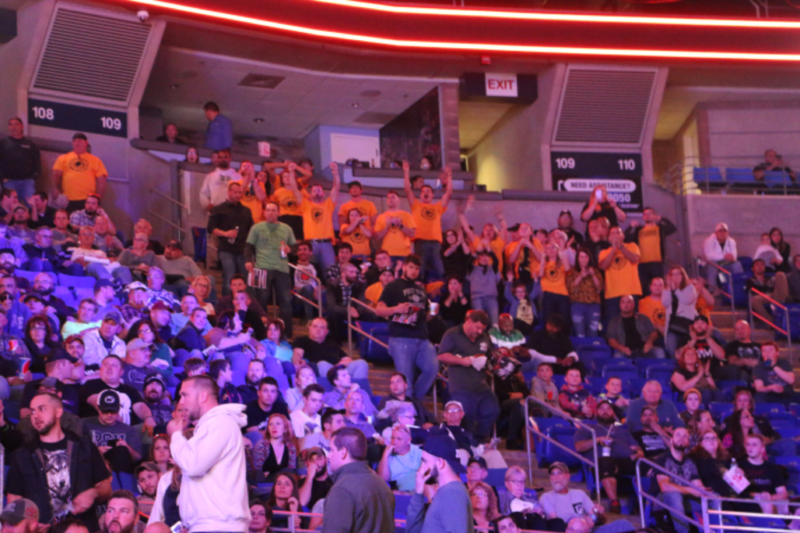 The crowd was irate as many believed Shlemenko had won. Both men had to be taken to the hospital after the fight for further evaluation. 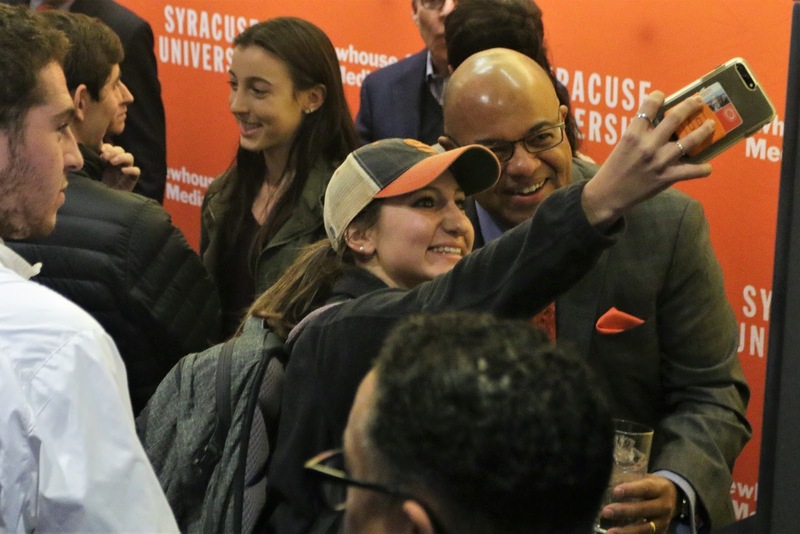 SYRACUSE, N.Y. — For many, Friday the 13th is known as an unlucky day. 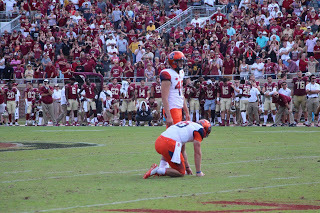 For the Clemson Tigers, the day lived up to its reputation as the previously unbeaten Tigers were upset for their first loss of the season against the Syracuse Orange, 27-24. 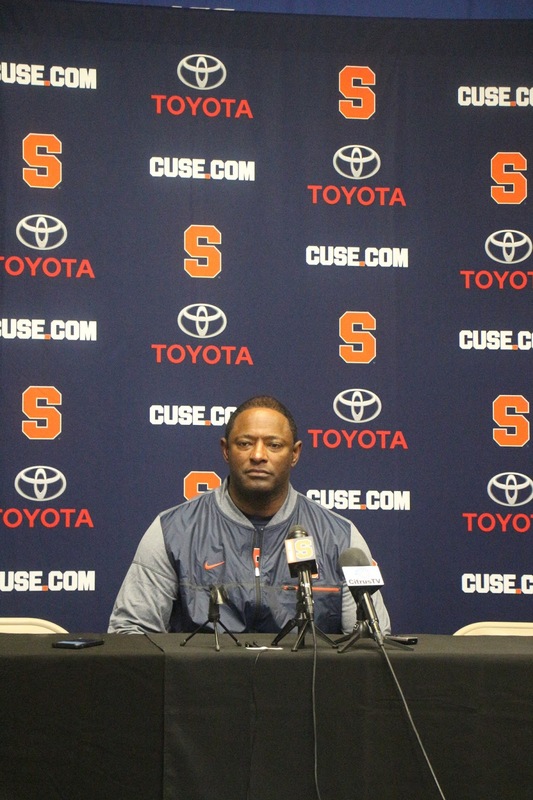 “That senior class, three head football coaches all the things they’ve been through and to have an opportunity to have a win like that, that they’ll never forget for the rest of their lives” Syracuse head coach Dino Babers said after the game. 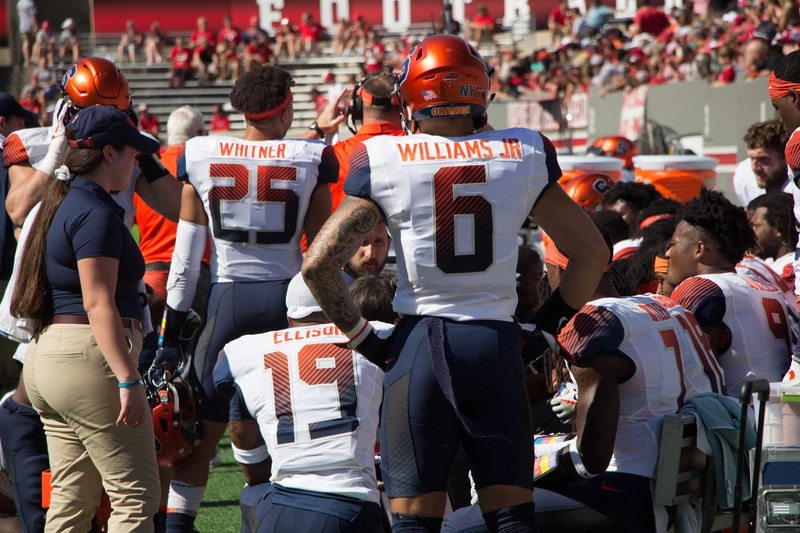 “Nobody believes in us except for us and that’s fine because at the end of the day, I put my pads on to play for these guys next to me” junior quarterback Eric Dungey said. 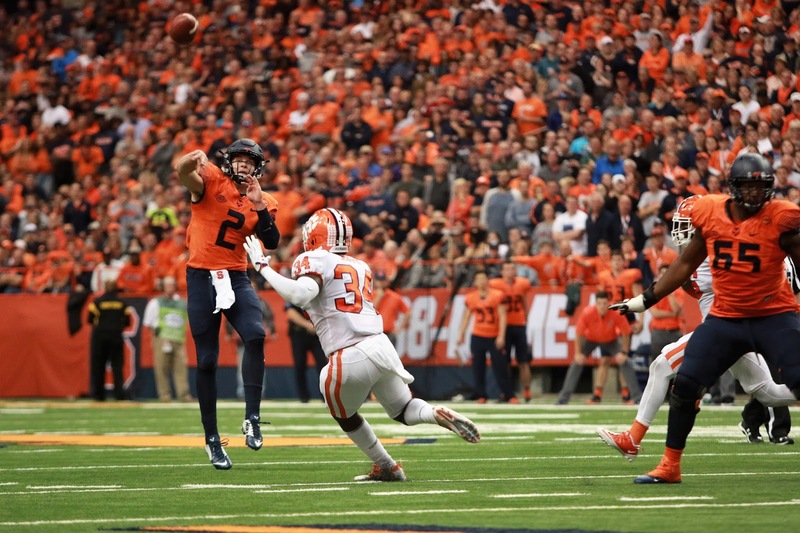 Dungey paced the Orange offense with 278 yards passing and three touchdowns through the air to go along with 61 rushing yards. 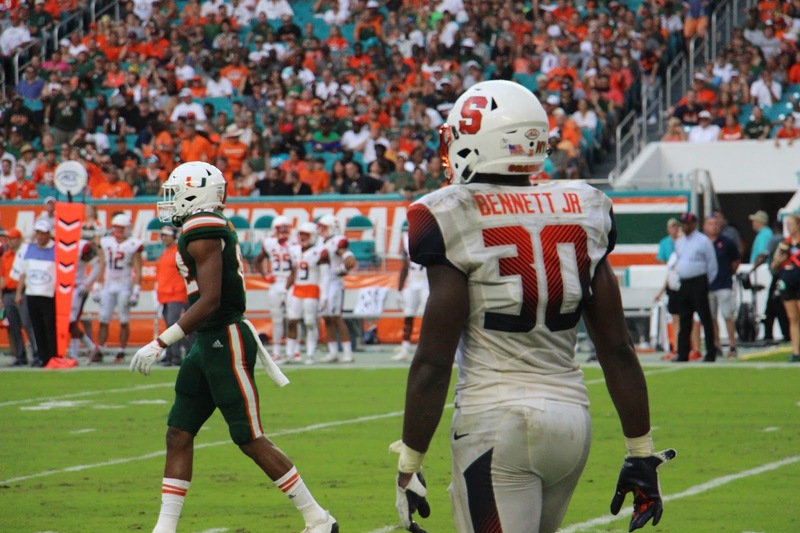 Linebacker Parris Bennett led the Orange defense with a team high nine tackles including a big sack on a potential scoring drive for the Tigers, knocking them outside of the 20 yard line to the 27. 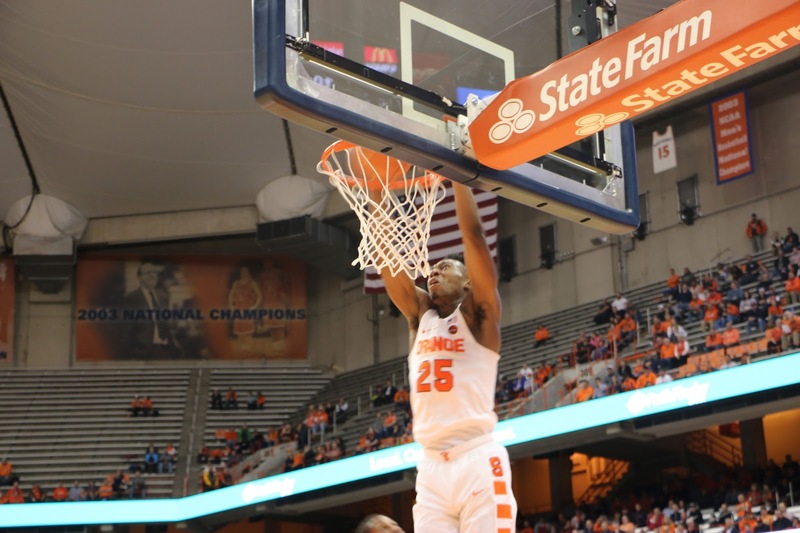 The win brings Syracuse to 4-3 (2-1 ACC), their first time with a winning record since mid-September. 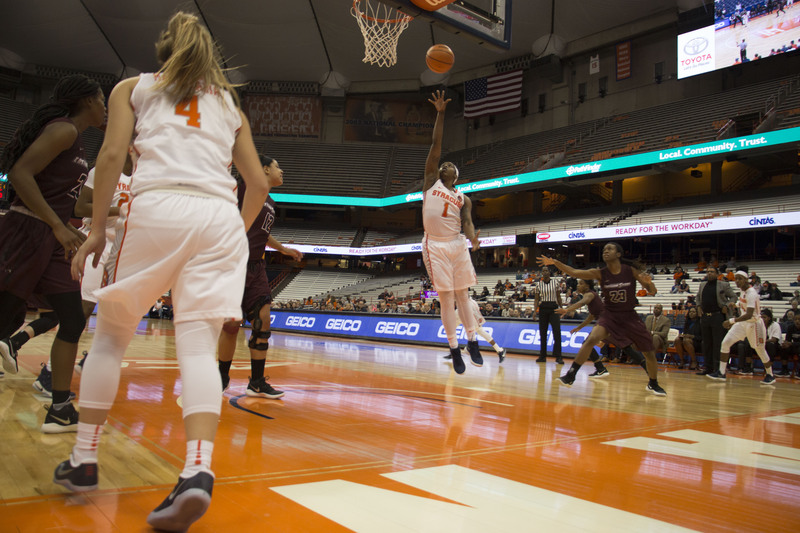 The loss drops the Clemson Tigers to 6-1 (4-1 ACC). 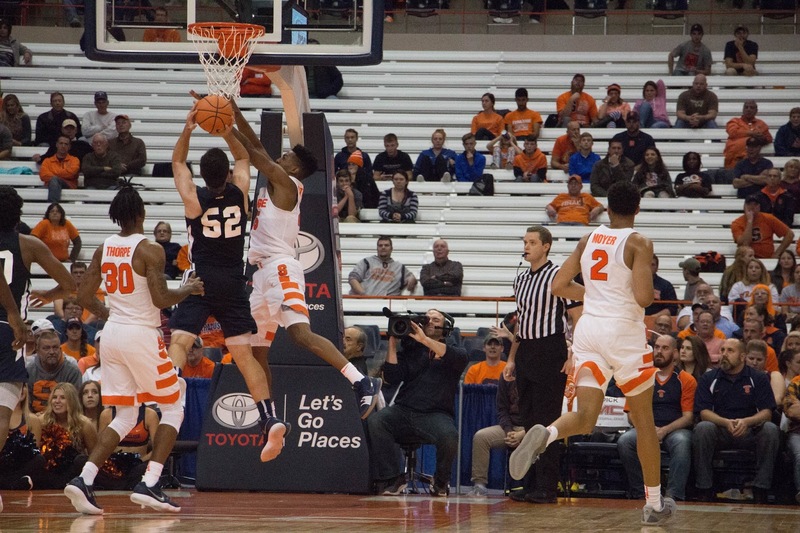 Syracuse has recently been criticized for starting games slowly and doing too little, too late in games to stand a real chance for victory, as seen in its last two close loses to LSU (35-26) and NC State (33-25). This game proved to be much different from the first drive. 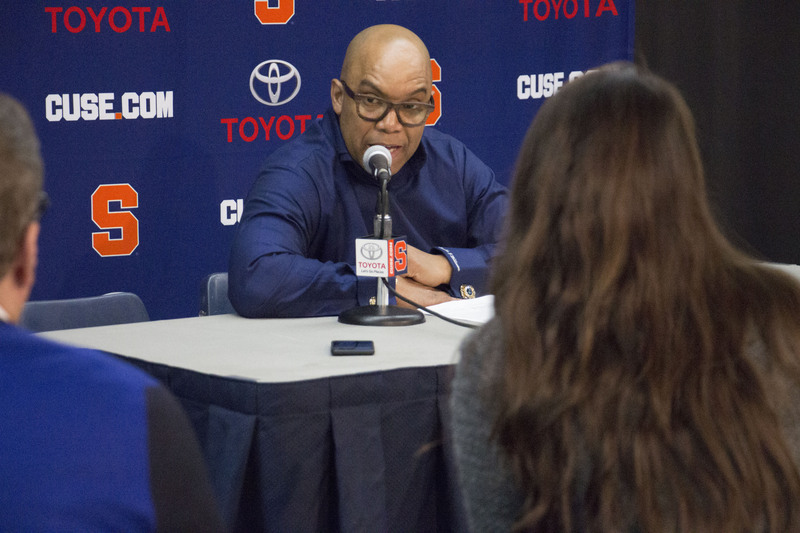 “I think it was an overall team effort and I’m really, really proud of the young men” Babers said. 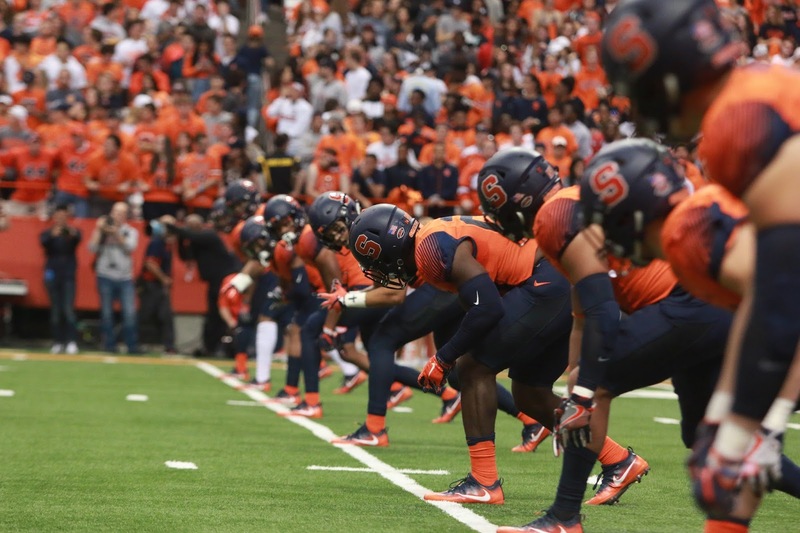 The Orange received the opening kickoff and drove the ball 72 yards in three minutes and 16 seconds. 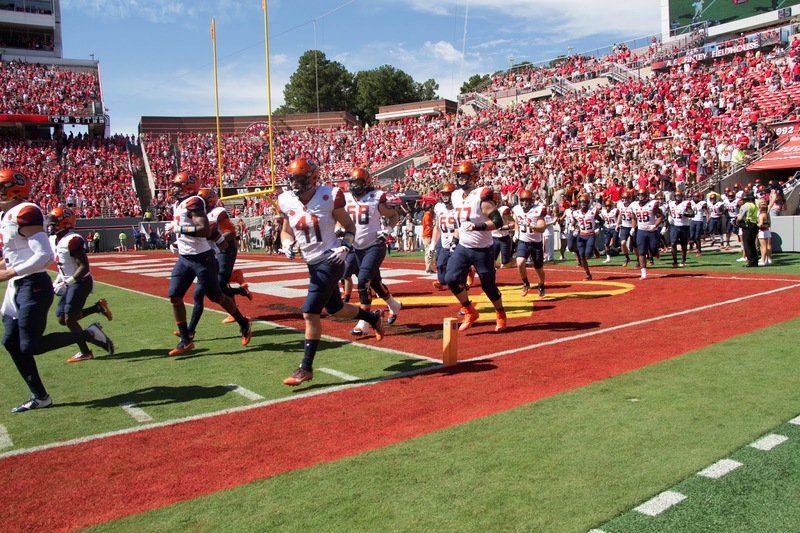 The drive was capped off by a screen pass from Dungey to running back Dontae Strickland for a 23-yard touchdown and the early 7-0 lead. 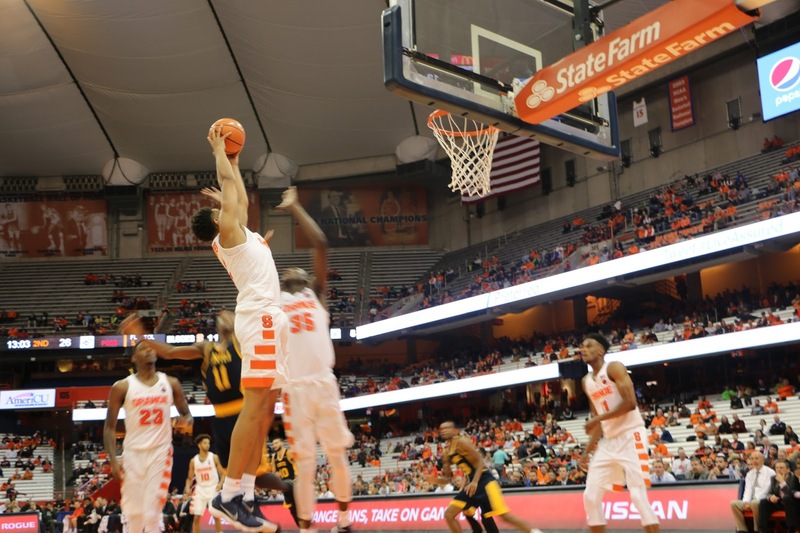 The Tigers responded quickly, scoring in only one minute and seven seconds. 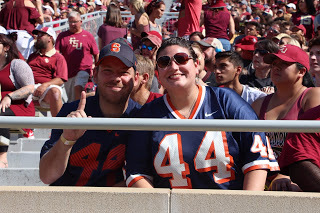 A Syracuse unsportsmanlike conduct penalty set them up with great field position, as they went 62 yards in three plays to score and tie things up. The Orange punted on its next possession, giving the Tigers the ball at the 37 yard line and a chance to take the lead. 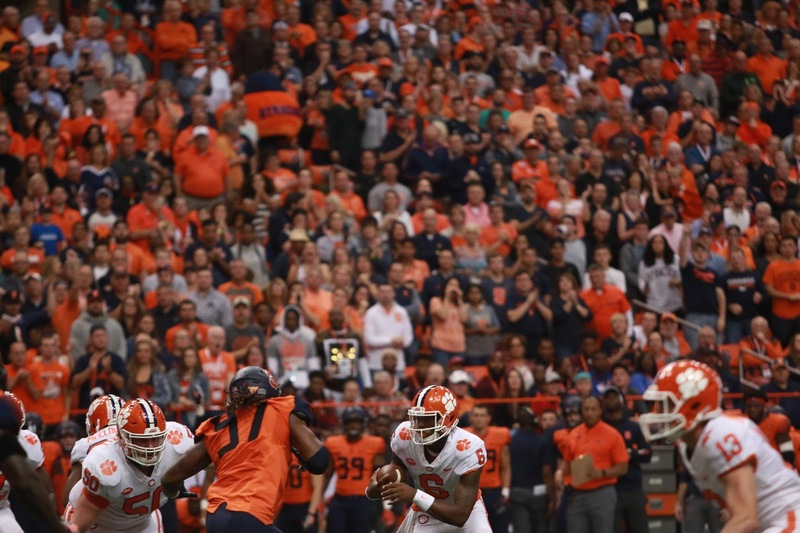 The Tigers moved the ball at will, as Clemson quarterback Kelly Bryant was 5-5 passing on the drive for 46 yards. 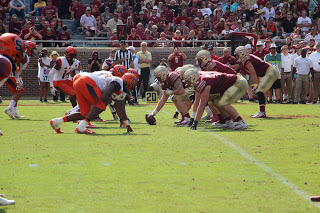 Once the Tigers reached the red zone, the Orange defense stepped up, forcing the Tigers to settle for a field goal try. 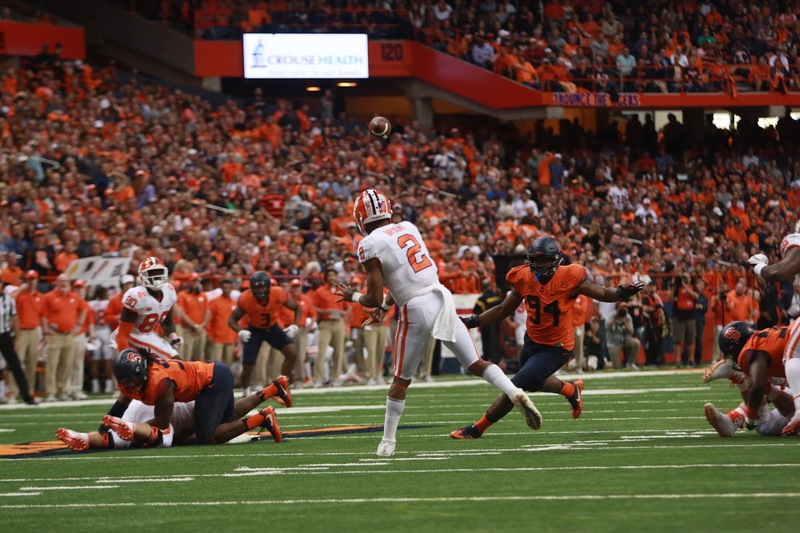 Unfortunately for the Tigers, the field goal attempt was missed and the score remained tied. 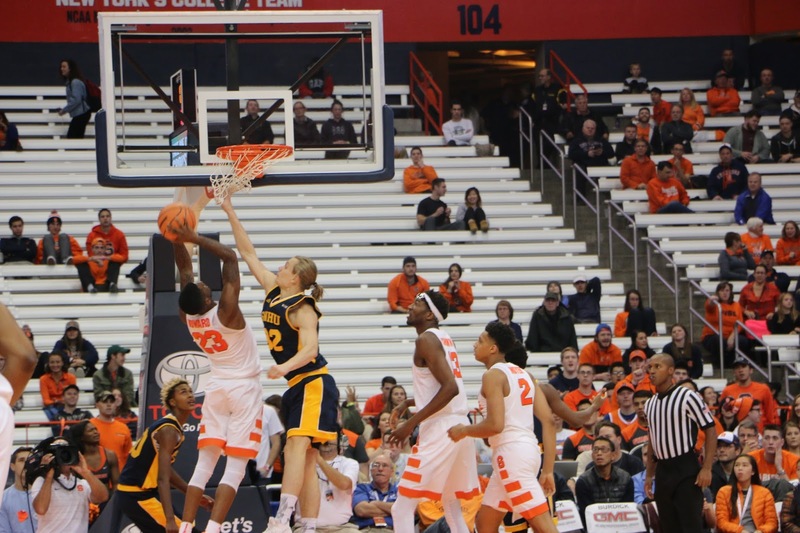 On its next possession, the Orange capitalized on the Tigers’ missed opportunity. 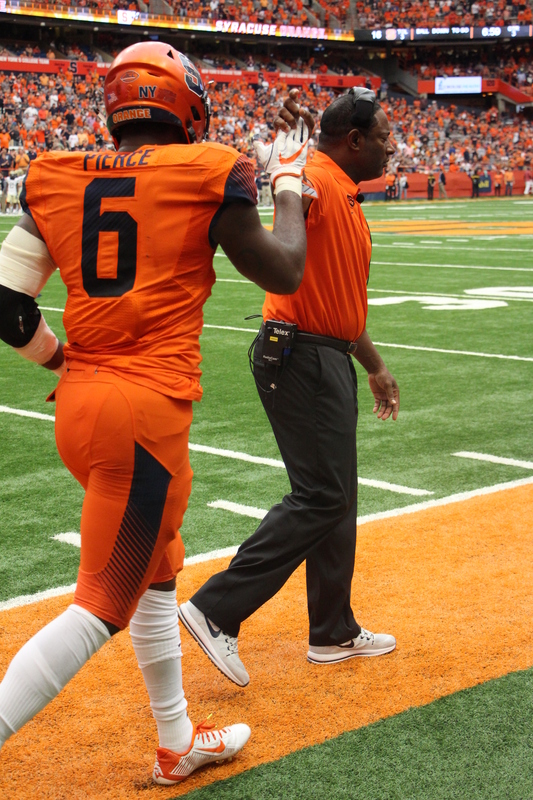 After a 14-yard pass to Steve Ishmael, Dungey threw deep to Ervin Phillips, connecting for the 66-yard touchdown and again giving the Orange the lead at 14-7. 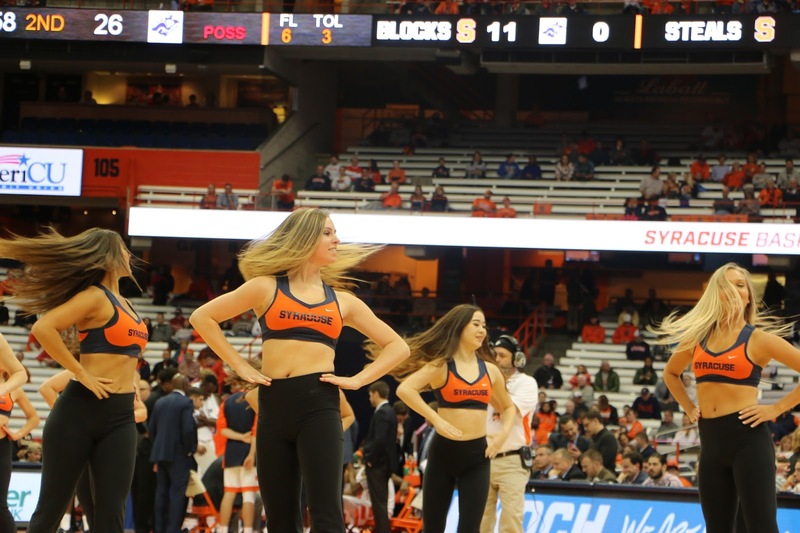 The teams traded punts for the next three possessions until Syracuse got the ball again with 11:59 left in the second quarter. 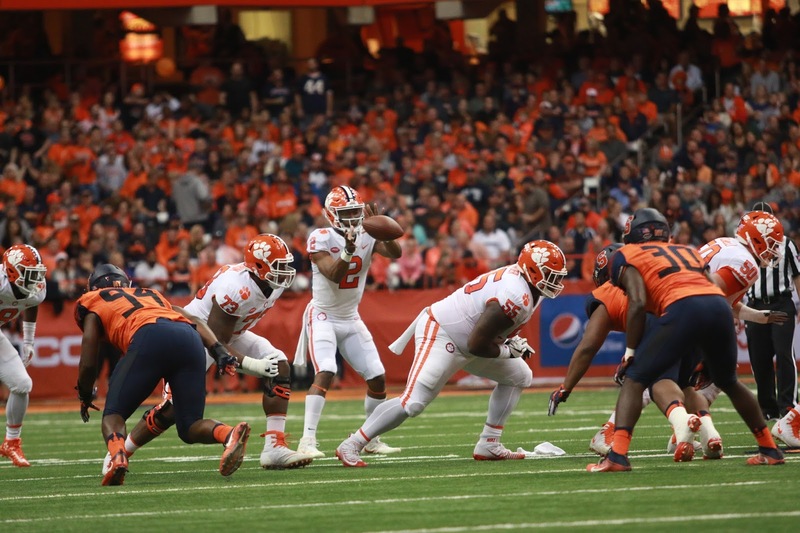 The Orange started at the six yard line, but that didn’t deter them from running their normal offense as they moved the ball quickly and with ease, taking advantage of two Tiger penalties that extended the drive. 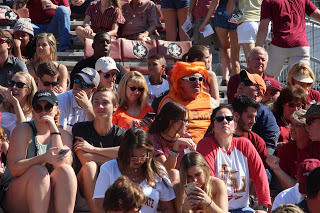 With second down and six yards to go on the Clemson 20 yard line, a false start penalty was called on the Orange, starting the downward spiral. 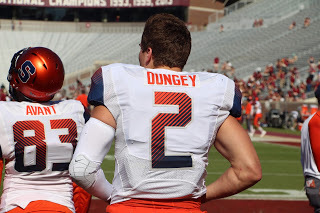 On the next play, Dungey was sacked for a five yard loss. 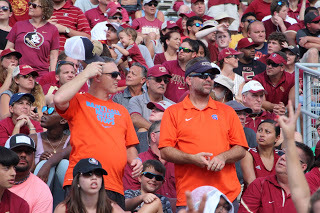 That was followed by another penalty for offensive pass interference leaving the Orange third down and 31 yards to go. The drive ended for the Orange with a fumble by Strickland. The Tiger’s Tanner Muse scooped up the ball and returned it 63 yards for the score. 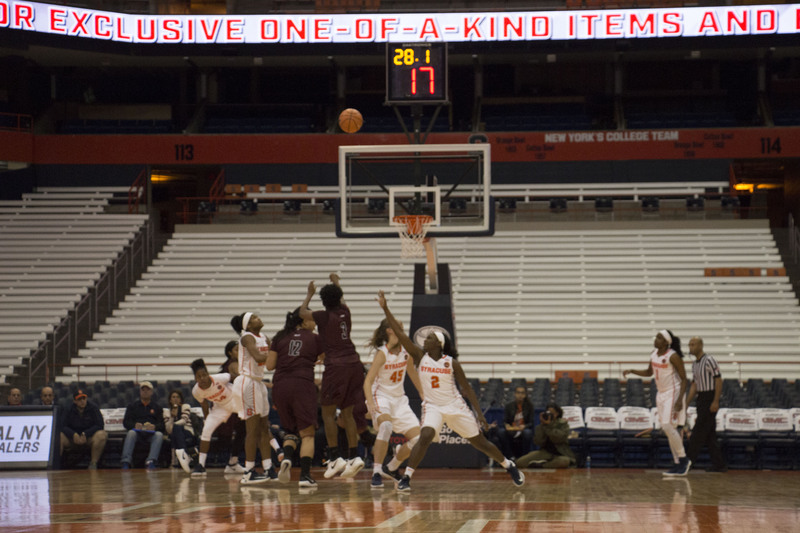 A drive that seemed to be leading to a two score lead for the Orange quickly turned into a tied game at 14 all. 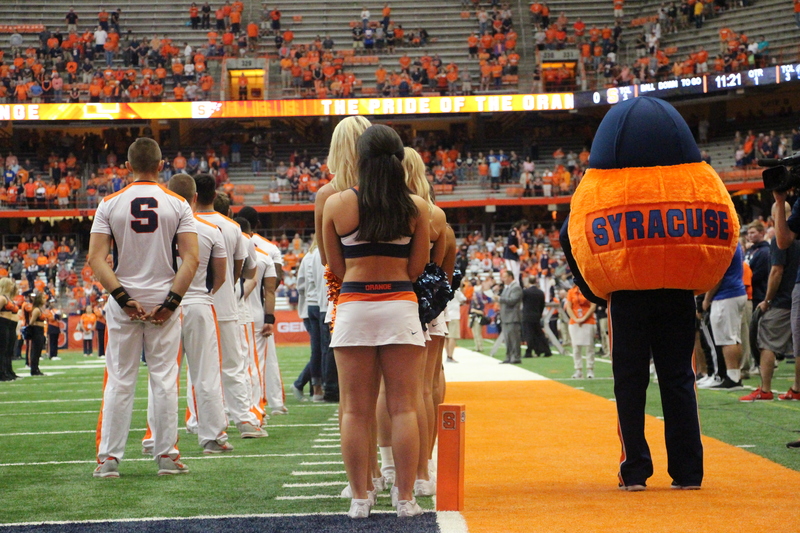 The Orange again took the lead with a field goal before halftime, going into the locker room up 17-14. 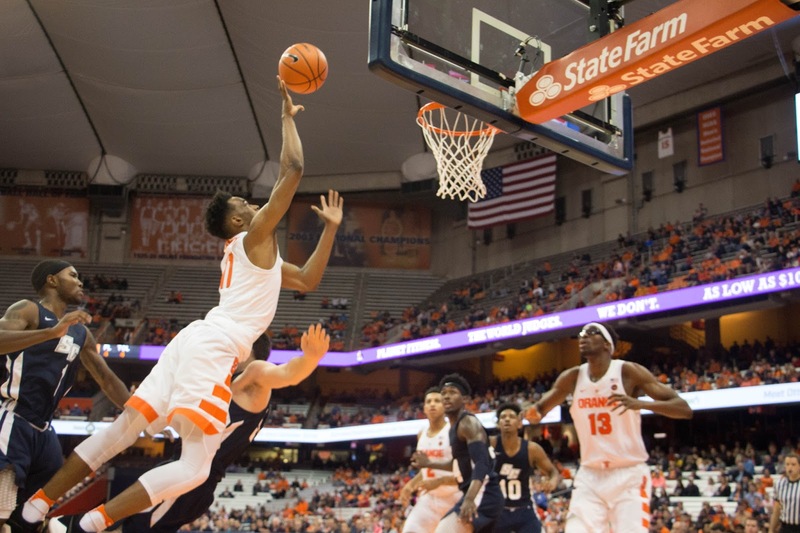 Though Syracuse had plenty of opportunities to pull away in this game, Clemson put up a fight. The fight became a lot harder when starting quarterback Kelly Bryant left the game at the end of the first half with a concussion, leaving redshirt freshman Zerrick Cooper to lead the offense for the second half. 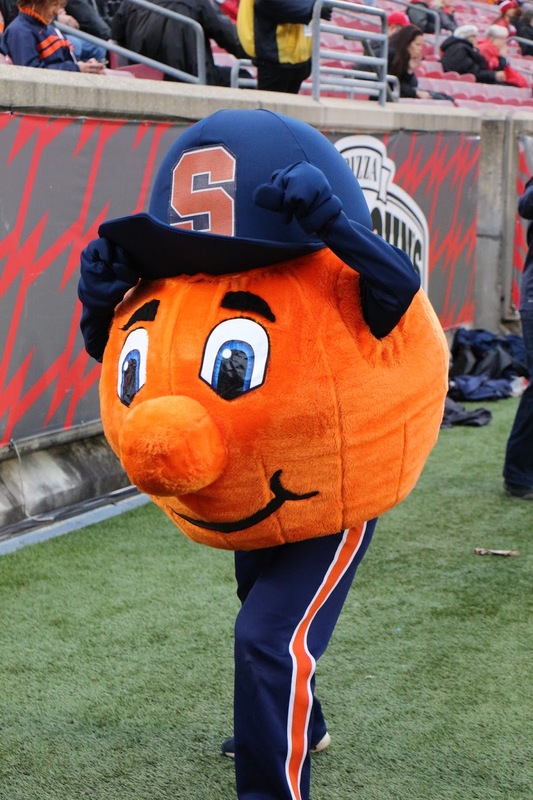 Immediately, the Orange applied pressure on the new quarterback in an attempt to make sure he never got comfortable in the pocket. It worked on the first drive of the half as the Tigers ended up punting. 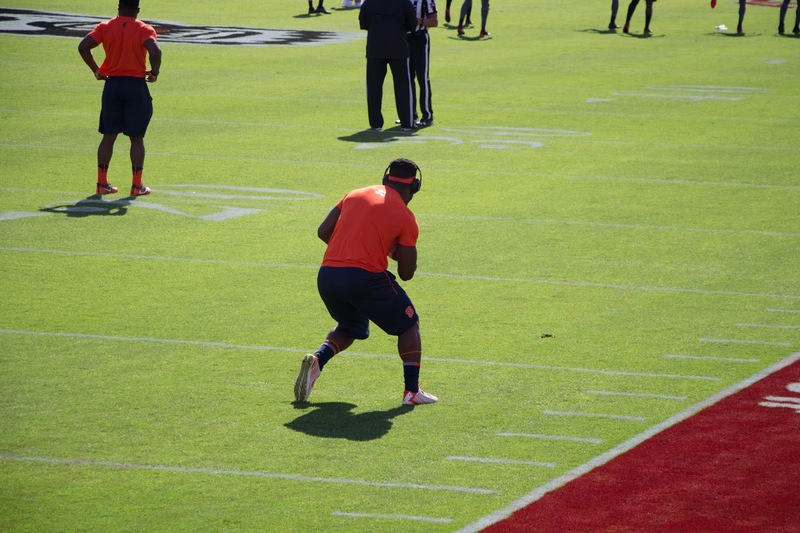 On their next drive however, the Clemson coaching staff combined great starting field position at the Orange 42 yard line with a series of short throws that moved the ball and got Cooper rolling. 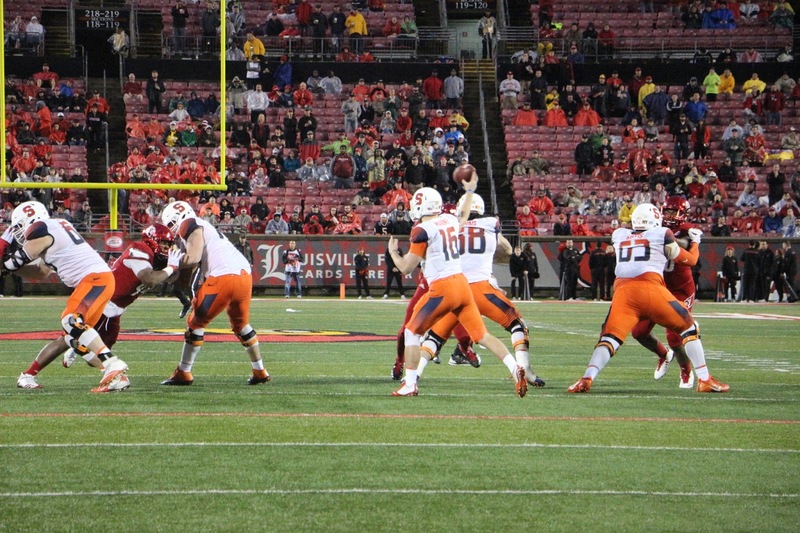 Though the drive fizzled out, the Tigers added a field goal to tie the game at 17. 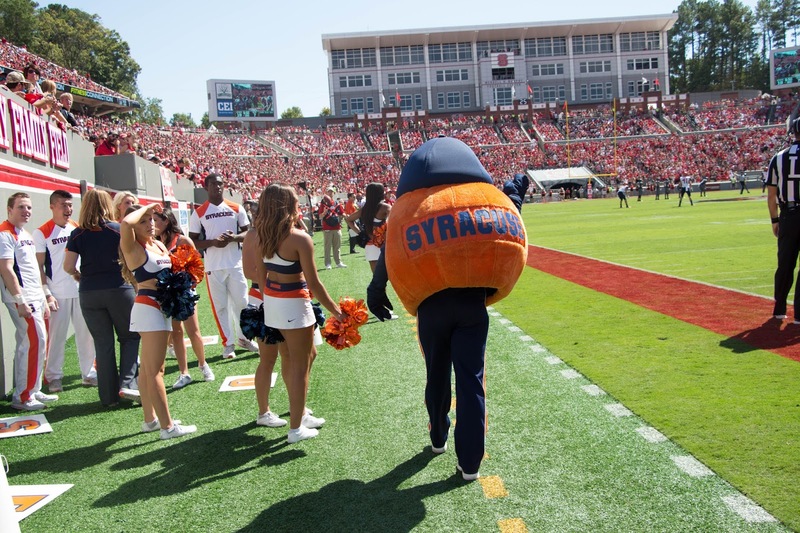 When the Orange got the ball, it used a 45-yard run from Dungey to set up a 30- yard pass to Ishmael for the score, putting the Orange up 24-17. Again, Clemson responded. 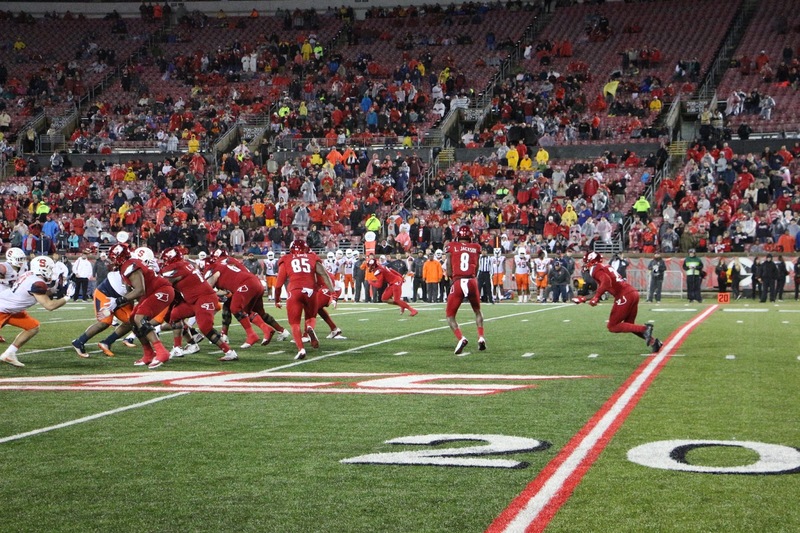 On the kickoff, the ball bounced out of bounds, setting the Tigers up at their 35 yard line to start. 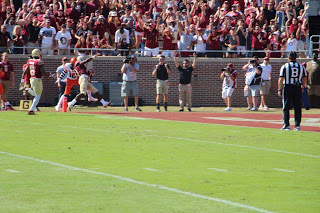 After two plays, on first down from the 48, Tiger running back Travis Etienne ran the ball for a gain of 52 yards and a touchdown, again tying the score, this time at 24. 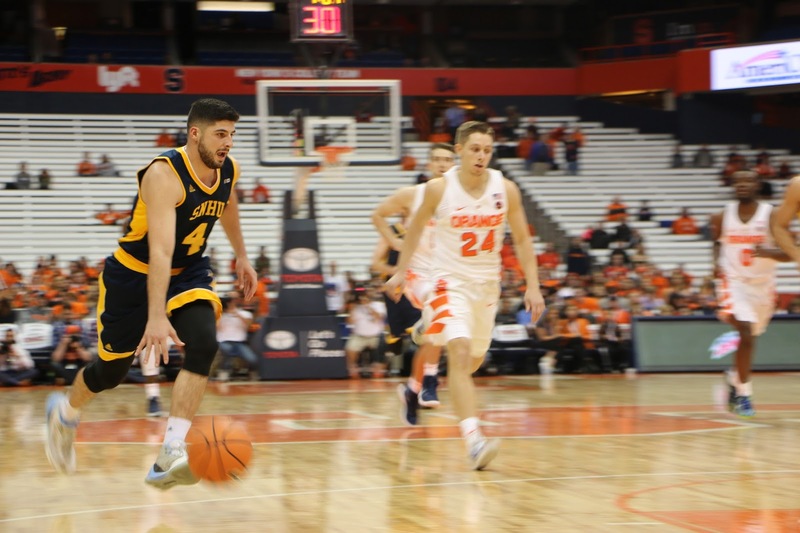 With the ball to start the fourth quarter, the Orange changed from its usually high-paced offense to a slower tempo focusing on ball control. This was accompanied with a heavy run offense to keep the clock moving. 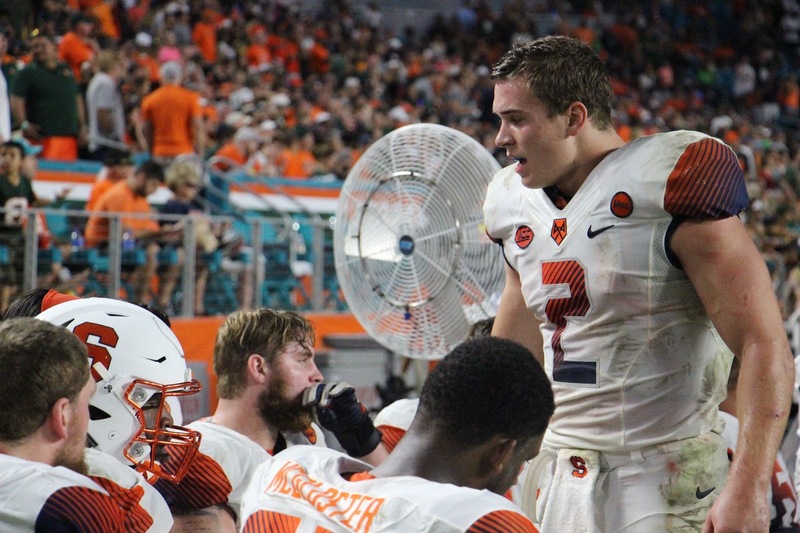 The Orange burned over five minutes off the clock on the way to picking up a field goal to put Syracuse up 27-24. 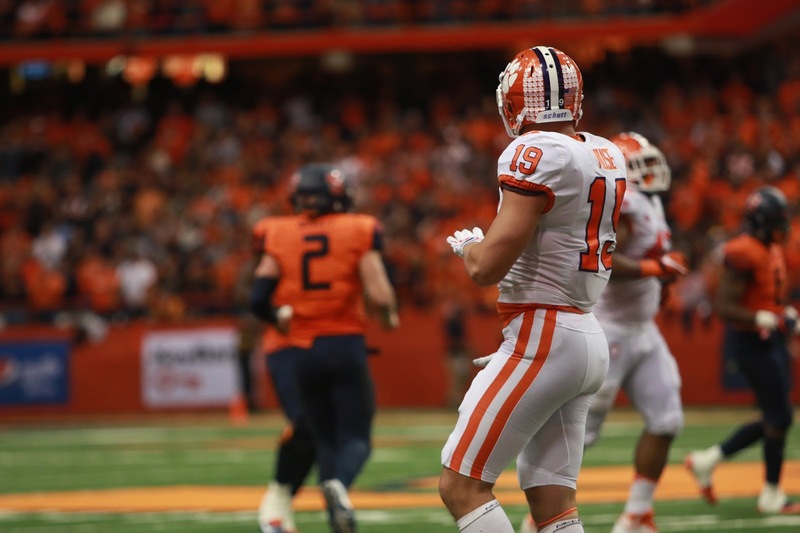 Clemson fought all game to keep the score close in hopes of eventually overtaking the lead and responded again. 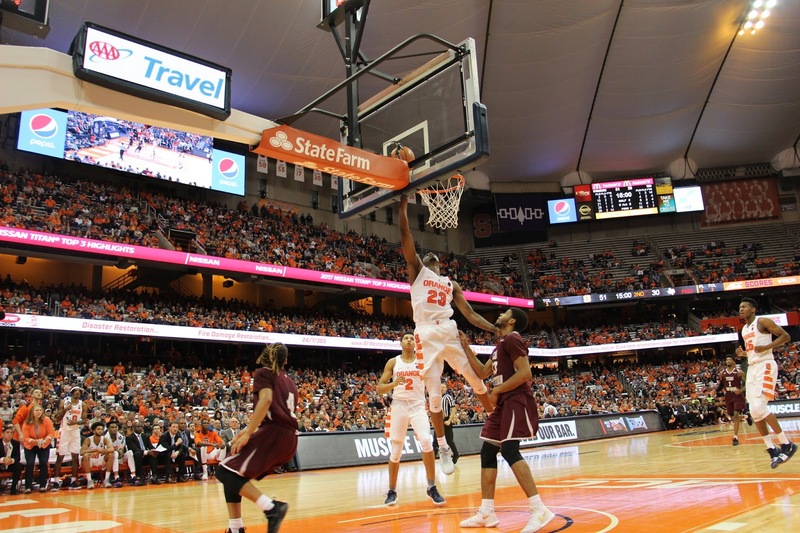 This time, the clock was a factor as the Tigers were running out of time. After picking up, two first downs in the first four plays of their drive, the Orange needed a big play to stop the Tiger momentum. 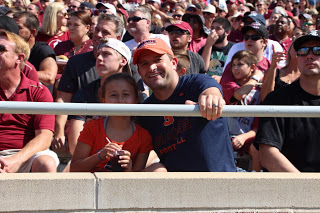 It came in the form of a sack from Chris Slayton, leading to a loss of four yards. The drive stalled, and the Orange took over on downs at the 41 yard line with 6:10 left in the game and the Tigers with two timeouts left. From there, the plan was to run the ball and kill the clock. 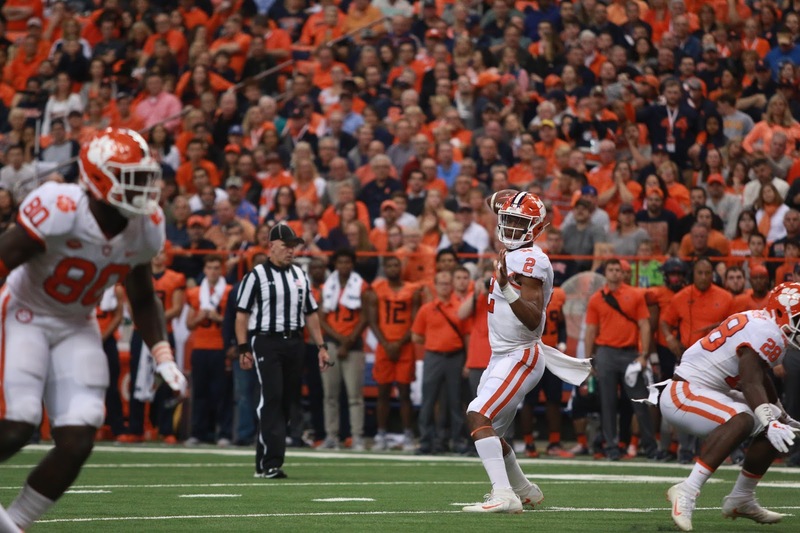 The plan worked to perfection as the Orange slowly moved the ball and picked up two first downs with the clock down to 2:29, forcing Clemson to use its timeouts. 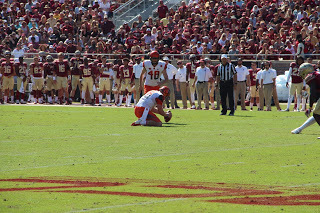 On third down and eight to go, the Orange needed to convert or possibly have to punt the ball away and give the Tigers another chance to come back. 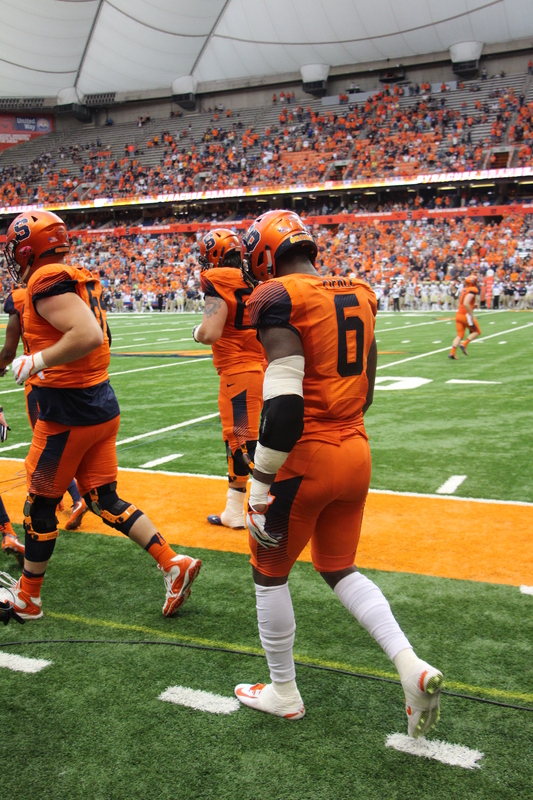 Dungey rushed for eight yards, stretching backwards to reach the first down marker. 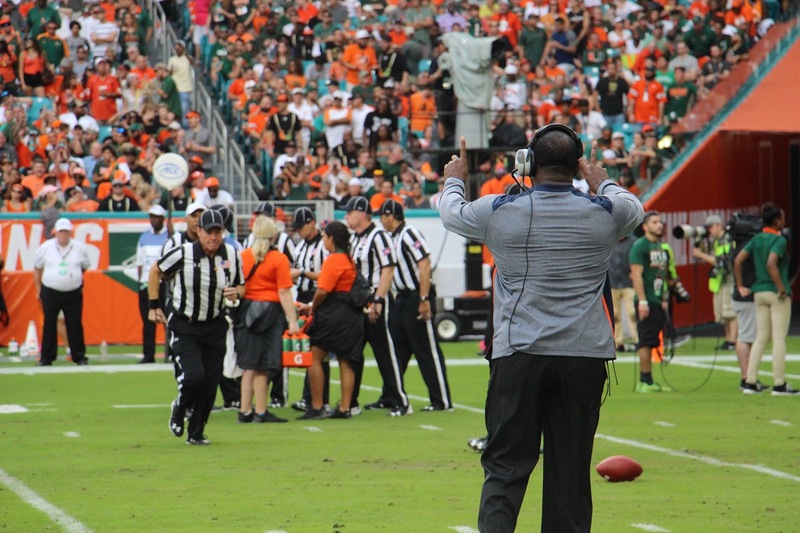 After the officials reviewed the spot of the ball, the ruling on the field of a first down was upheld, essentially ending the game. 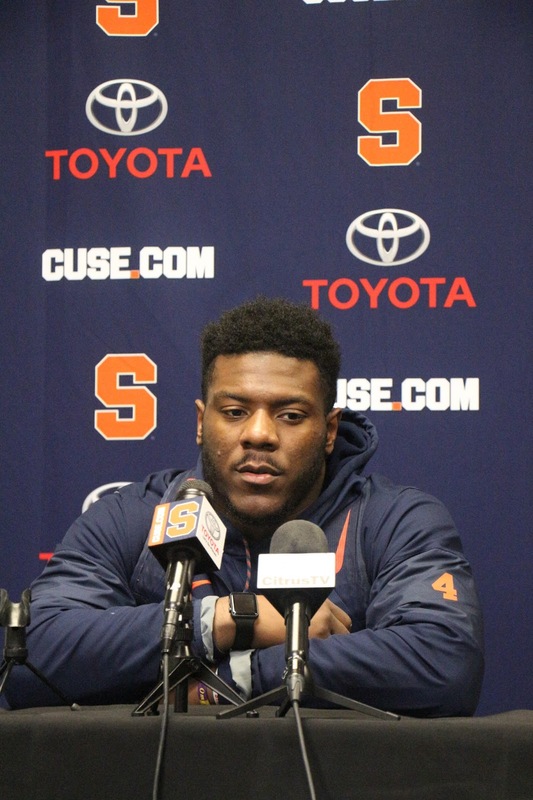 After a few kneels, the game was over and the Orange pulled off the upset, an accomplishment linebacker Zaire Franklin said he couldn’t believe. 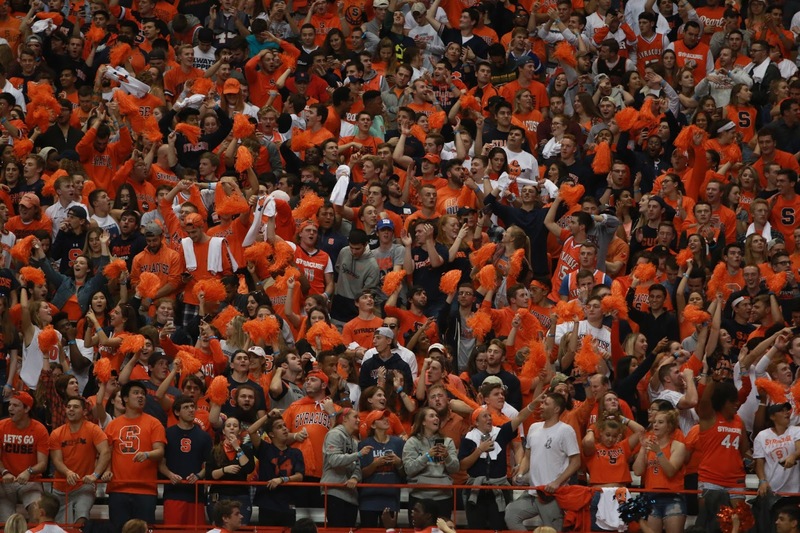 The Carrier Dome had its biggest crowd of the season with over 42,475 counted in attendance. 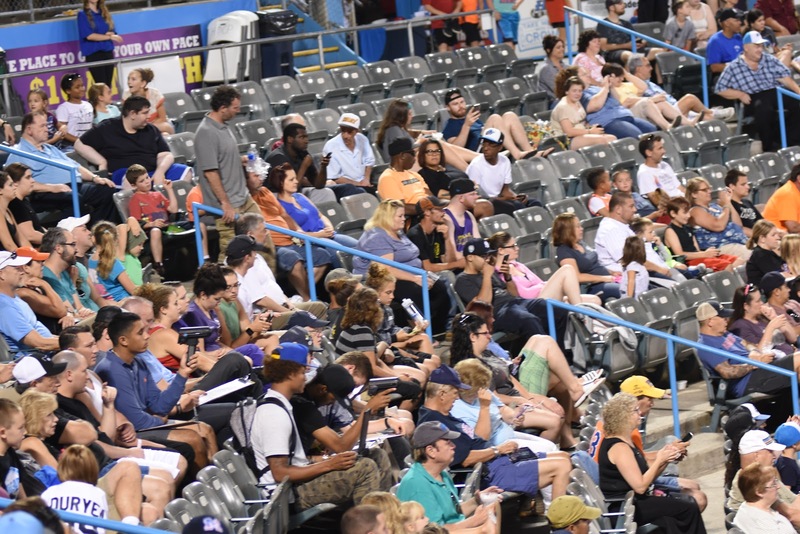 The home crowd was into the game and loud all night. 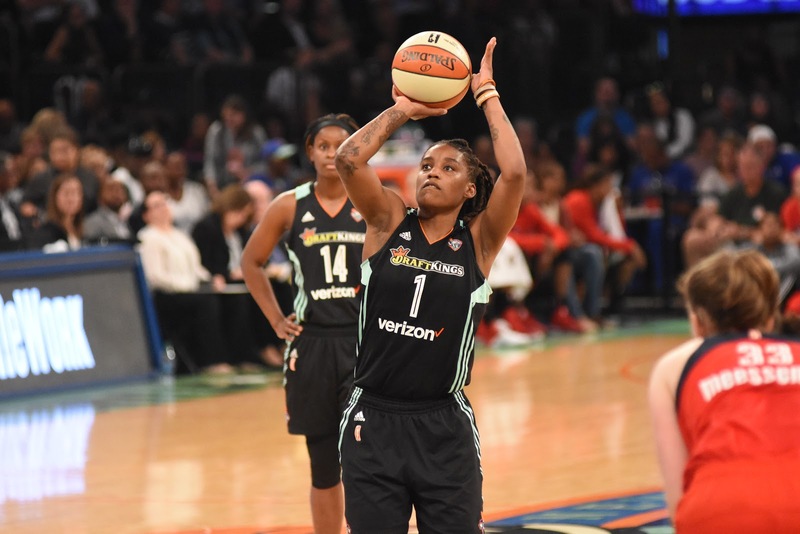 “How about the fans tonight?” Babers exclaimed after the game. “Are you kidding me? We have a DOME. No one else does. Neener neener neener. 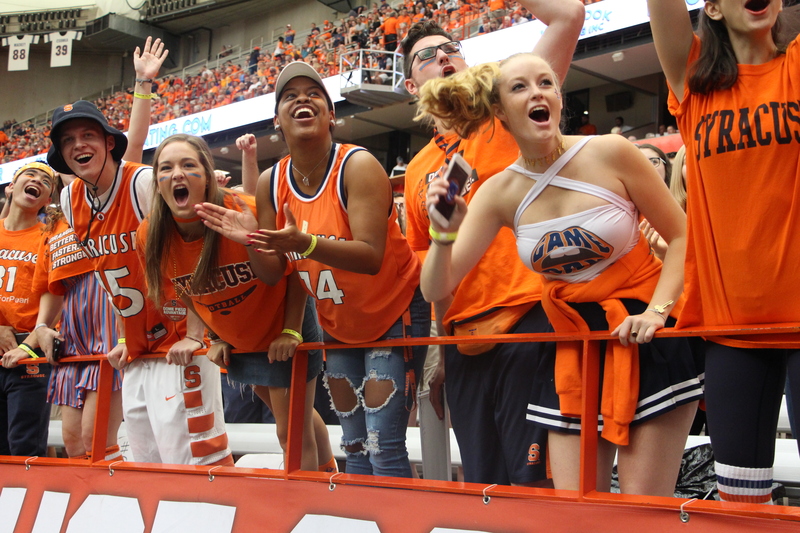 We’re loud, we’re crazy up here and that’s the atmosphere that it should be every single time that we come to the Carrier Dome. 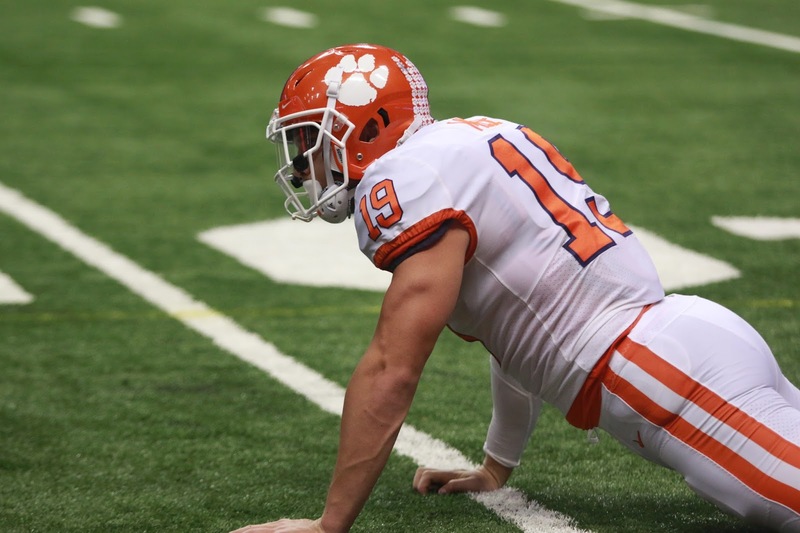 Clemson has one of the best defenses in the nation with averages of 264.33 total yards per game, 165.5 passing yards per game, 98.83 rushing yards per game and 11.33 points per game. 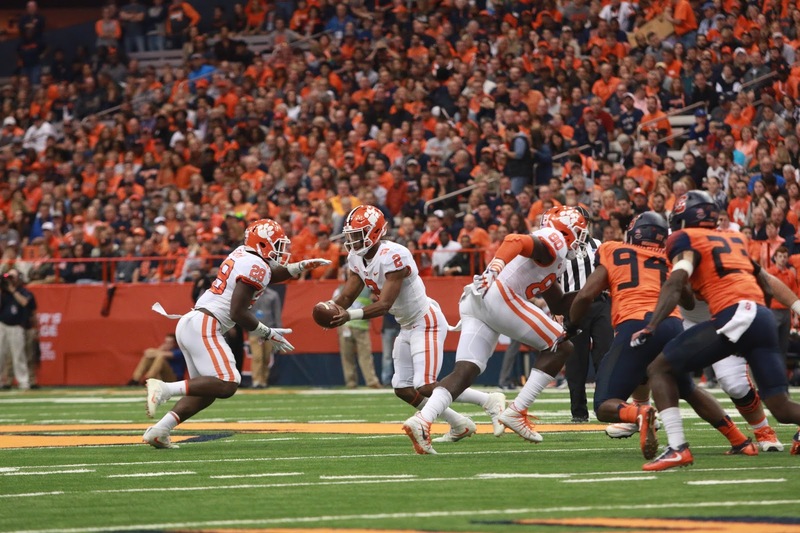 The Syracuse offense blew all of these numbers out of the water with 440 total yard, 278 pass yards, 162 rushing yards and putting up more than double the average points the Tiger defense had allowed with 27. 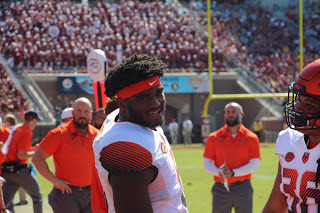 The Clemson offense came into the game averaging 233.67 yards passing per game, 237.33 yards rushing per game, 471 total yards per game and 35 point per game. 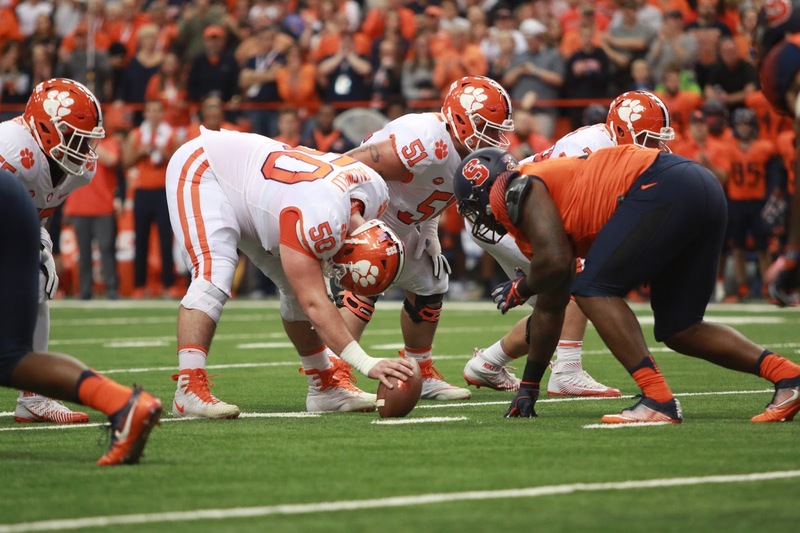 The Syracuse defense held the Tigers under all of these averages with 204 yards passing, 113 yards rushing and allowing only 24 points, seven of which came as a result of the Tiger defense scoring. 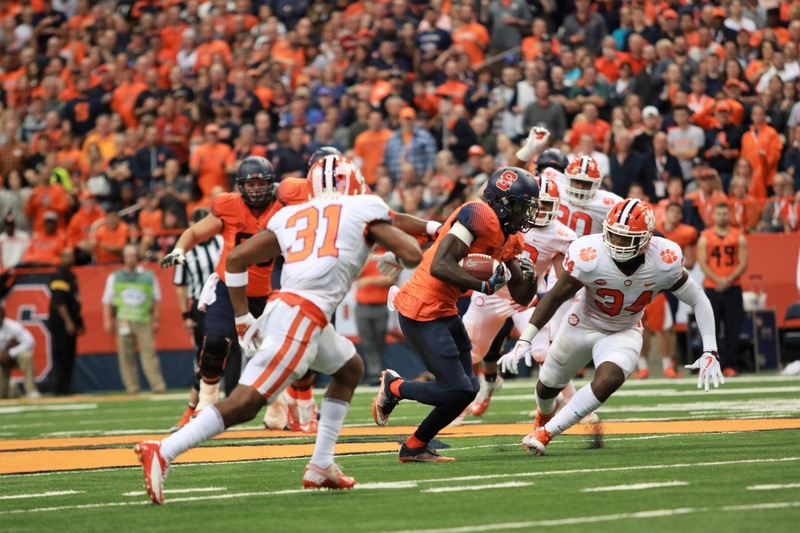 Conversely, prior to the game, the Syracuse defense had allowed its opponents averages of 357 total yards per game, 242 passing yards per game and 131 rushing yards per game, all numbers they held the Tigers under. 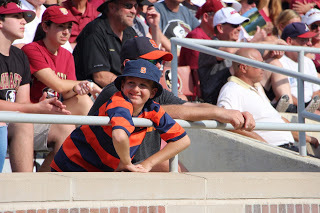 The Orange never trailed the Tigers in the game. 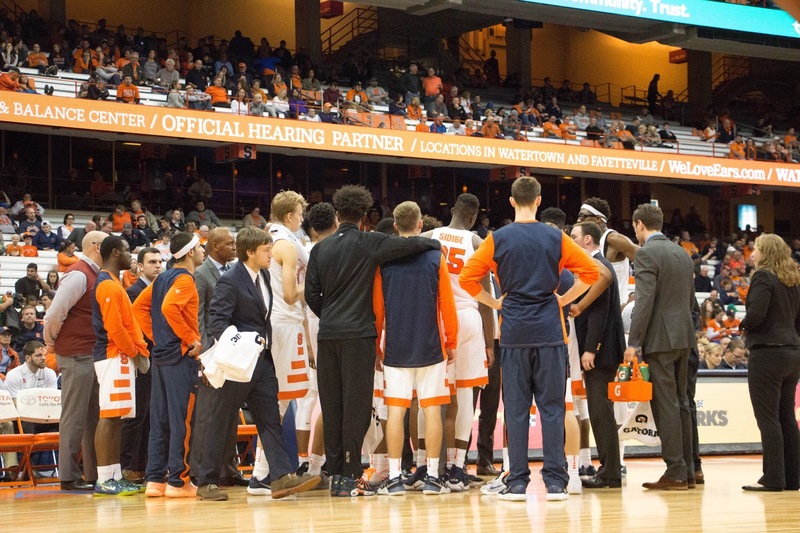 Syracuse travels to Miami next week to face the #11 ranked Hurricanes on Saturday at 3:30 PM. 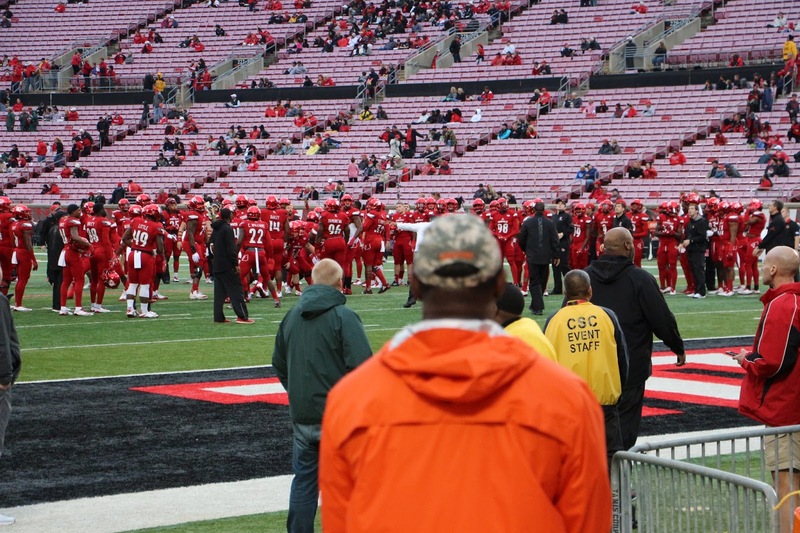 The Tigers limp back home with some concerns at quarterback as they look to rebound from the loss. 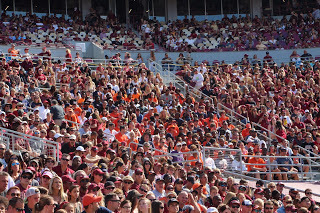 They have a bye week before hosting the Georgia Tech Yellow Jackets on Saturday, Oct 28. 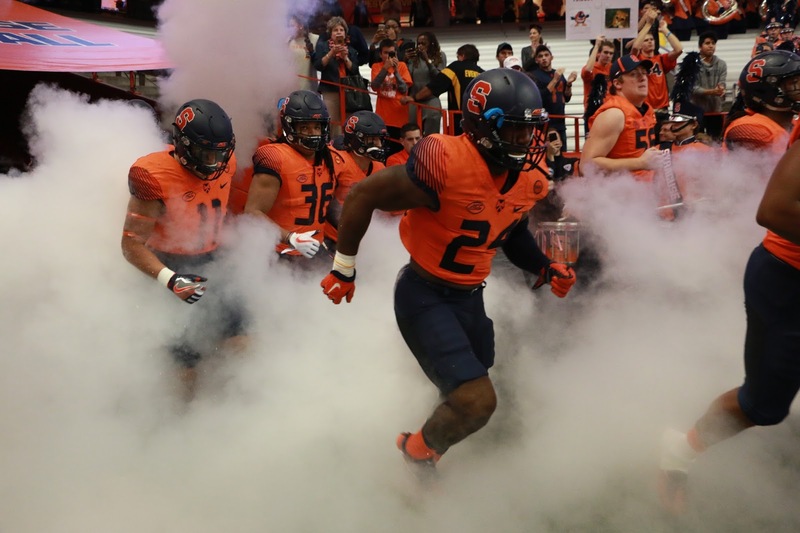 SYRACUSE, N.Y. – The Syracuse Orange held off late comeback efforts by the Pitt Panthers and won a close one, 27-24 in front of a Homecoming crowd at the Carrier Dome Saturday afternoon. 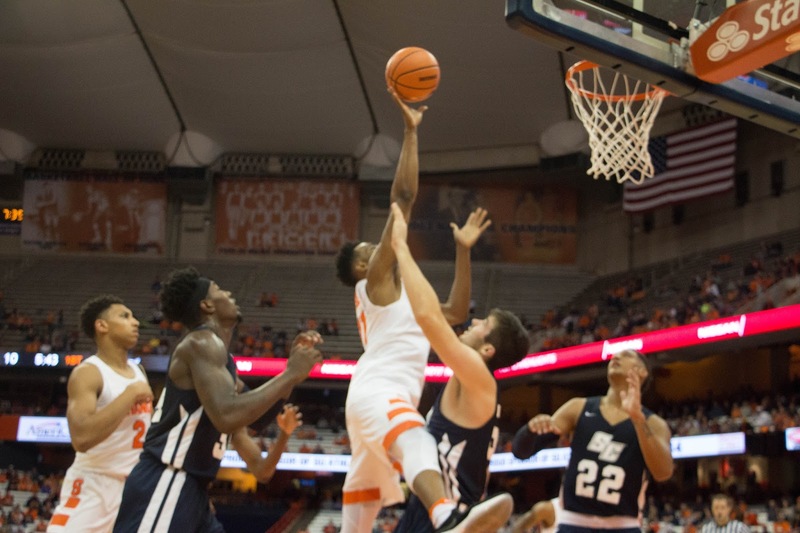 Syracuse(3-3, 1-1 ACC) moved to the .500 mark on the season with its first league win. 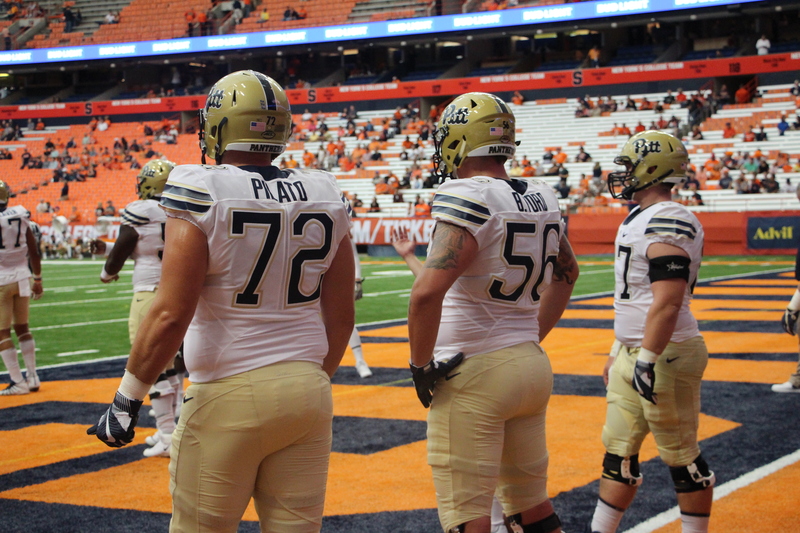 Pitt fell to 2-4 (0-2 ACC). 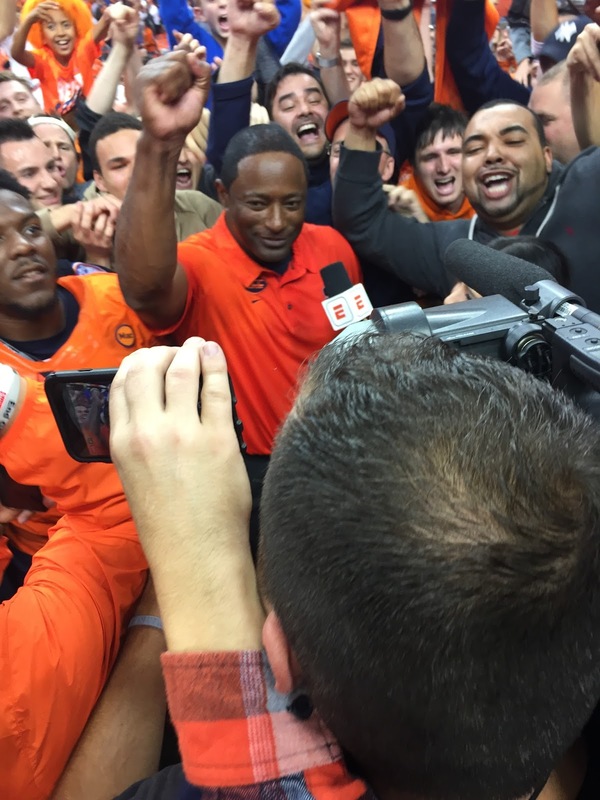 “It was good to finally get that monkey off our back,” Syracuse head coach Dino Babers said after the game. 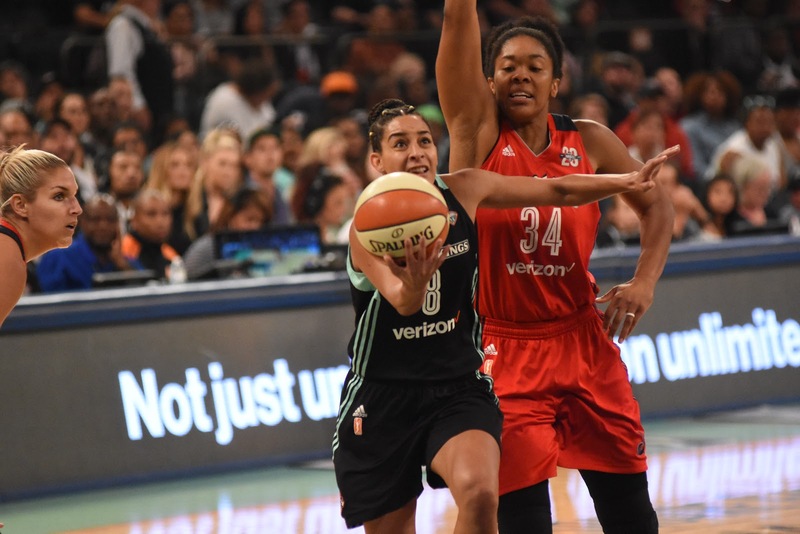 “It was our third close game all the way in the second half. 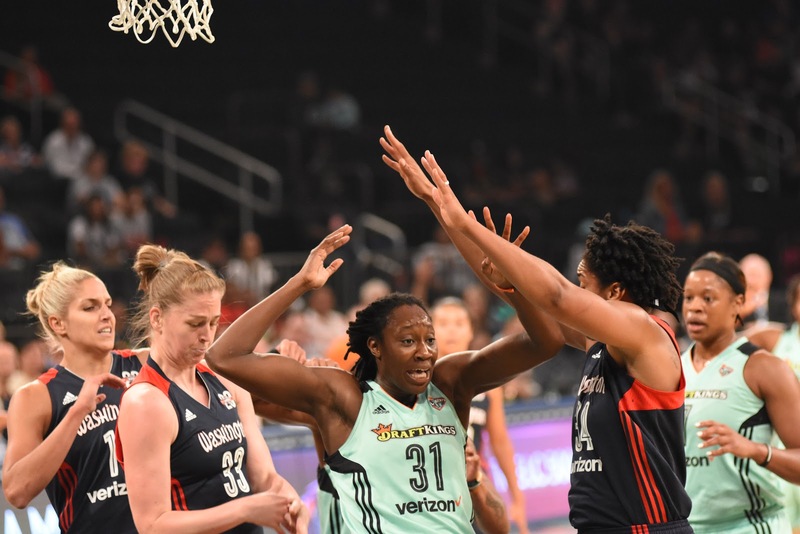 To see the team rally together, and not only have all three units play well in the last five minutes. 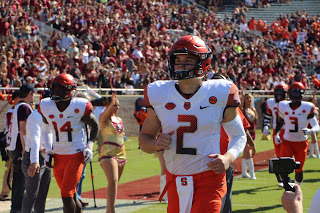 Quarterback Eric Dungey passed for two touchdowns and ran for a third and tight end Ravian Pierce had a breakout game for the Orange. 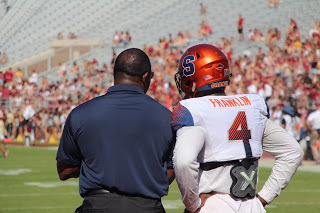 The junior college transfer in his first season with Syracuse finished with nine catches for 99 yards, both career-highs. “It was exciting. 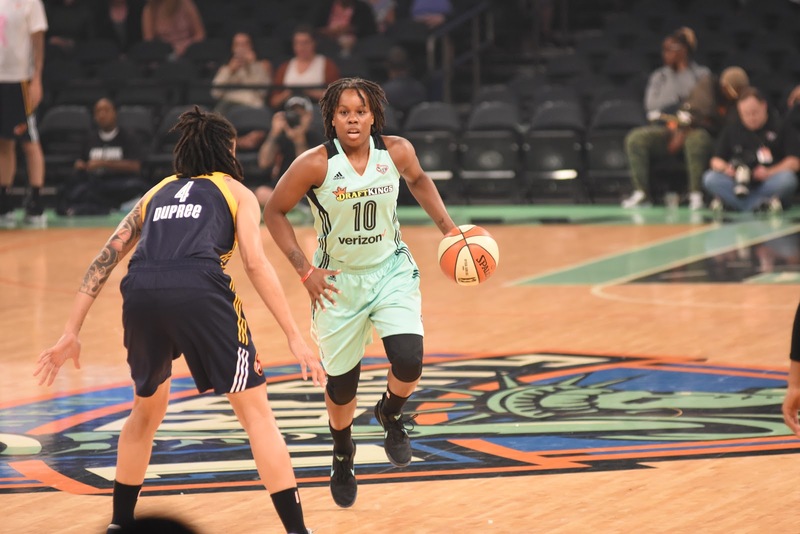 The kids are excited, and we’re happy that we’re able to do our part and make sure everybody had a happy Homecoming,” Babers said. 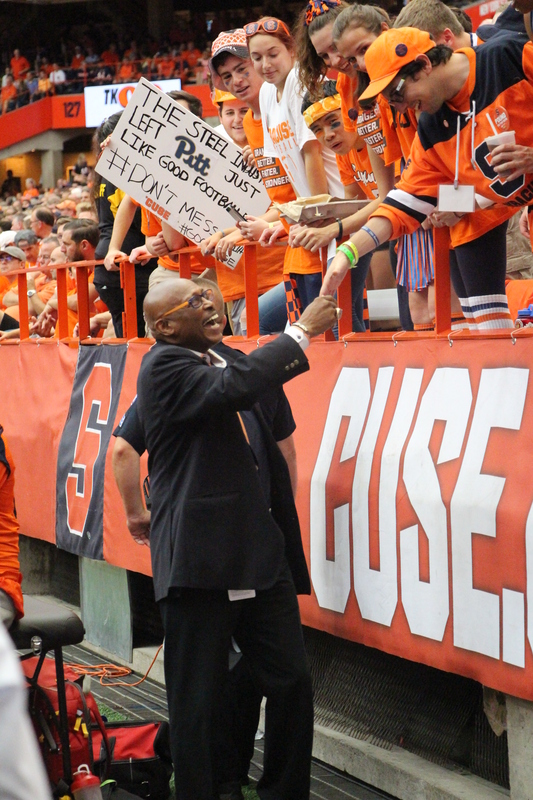 Last season, the Panthers and Orange battled to the finish in a wild contest at Heinz Field to end the regular season. 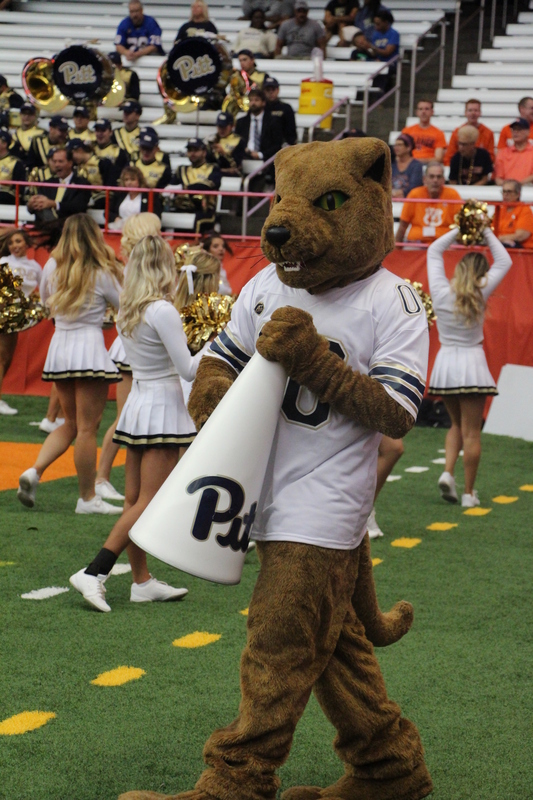 Pitt won 76-61 in a game that featured 621 combined rushing yards, 19 touchdowns, and 1,312 total yards. 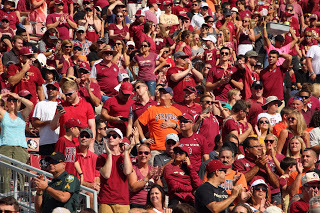 In the fifth week of the 2017 season, the ACC rivals wrote a different script. 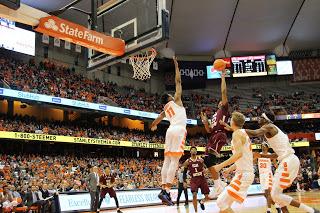 What looked to be a promising start for the Orange resulted in just three points. 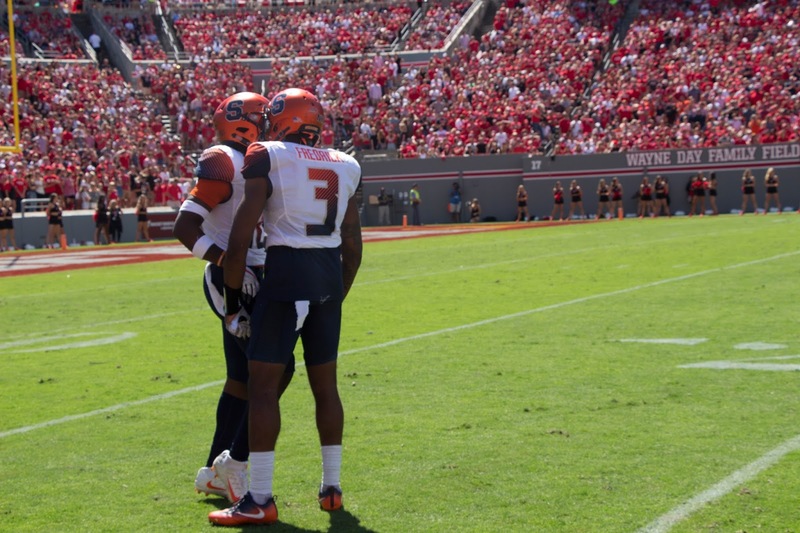 On the first drive, quarterback Dungey found his top target – Steve Ishmael – for a 34-yard gain that put Syracuse into Pitt territory. 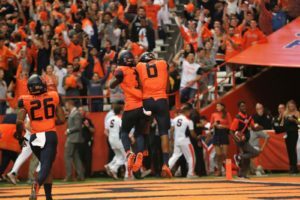 But Ishmael was called for offensive pass interference on an apparent touchdown catch and the Orange settled for a field goal on its first drive to lead 3-0 with 11:30 to play in the first. 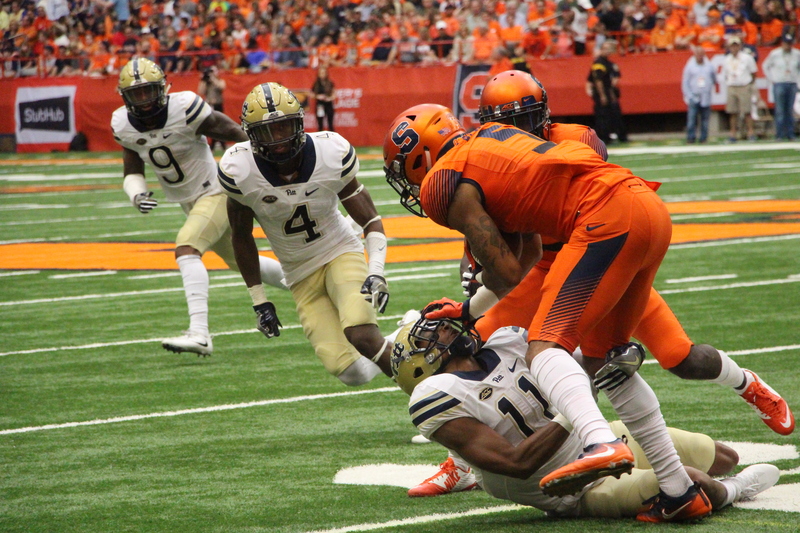 Syracuse then forced a three-and-out as Pitt gained only six yards. 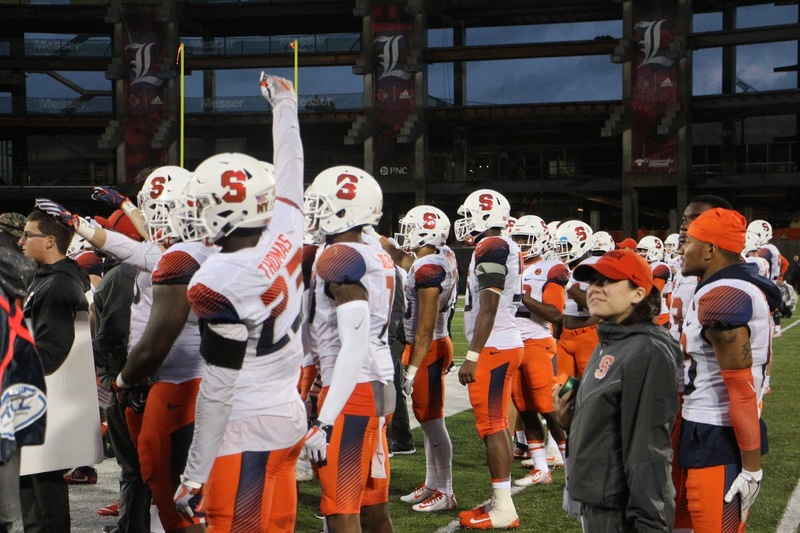 The quarter featured six three-and-outs and six combined punts and ended with Syracuse ahead by that 3-0 score. 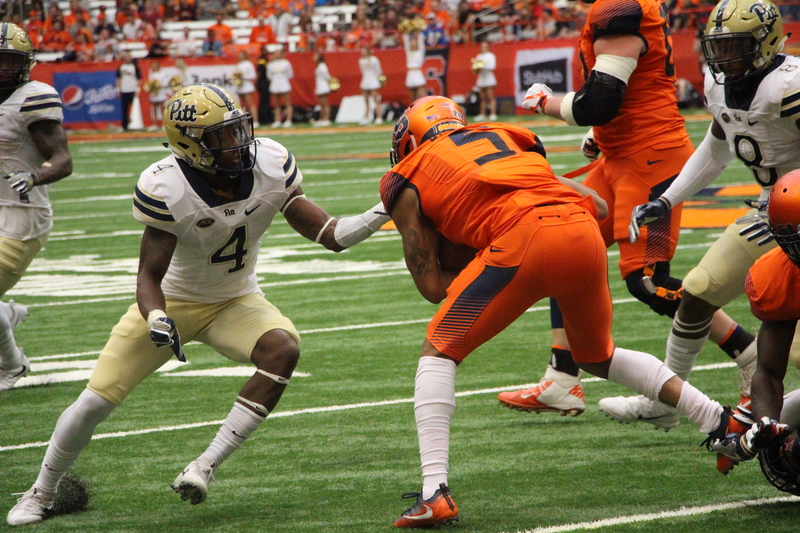 Pitt scored on the first play of the second quarter a 35-yard touchdown by Jordan Whitehead (who is listed as a defensive back on the team’s roster) and an extra point capped off a five-play, 54-yard drive that took 2:33 off the clock. 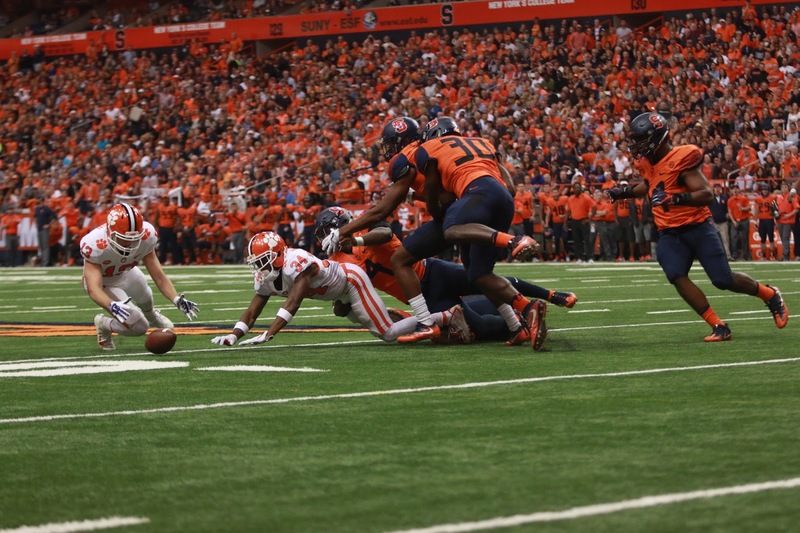 Syracuse responded by gaining a first down on the next drive, but the Orange had to punt again. Pitt then added three more points on a 49-yard field goal by Alex Kessman with 7:26 to play until the half and led 10-3. 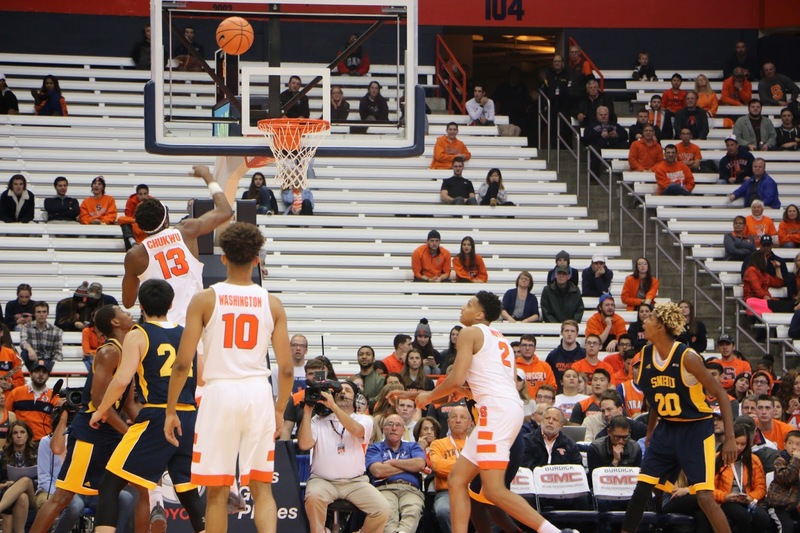 Syracuse showed life at the end of the first half. 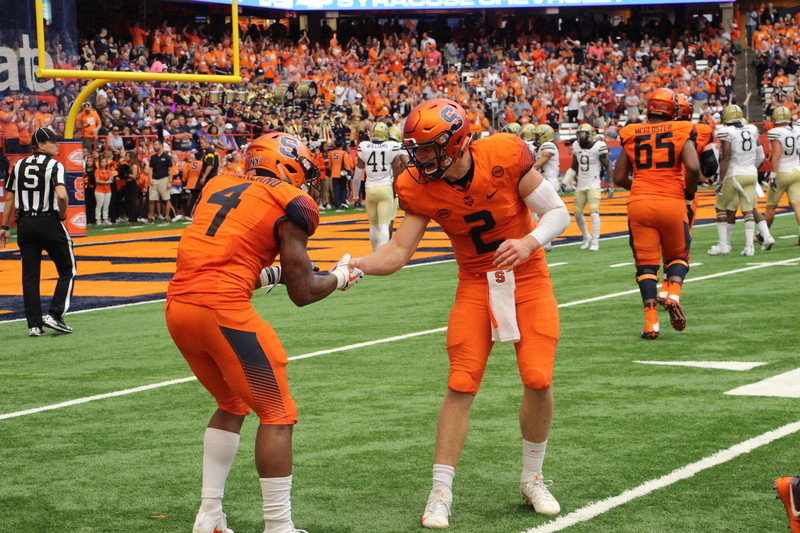 A 21-yard touchdown from Dungey to Devin C. Butler tied this one up at 10-10 with 0:34 to play in the half. This play capped off a nine-play, 93-yard drive that took 2:17 to play. 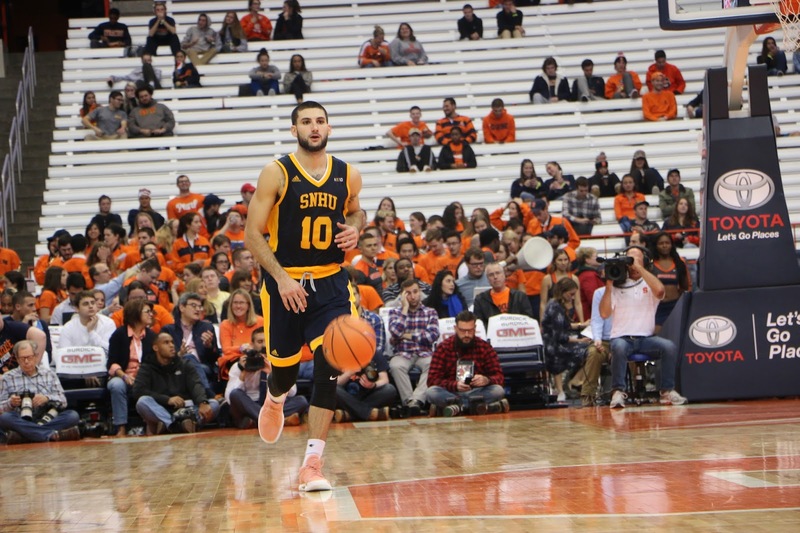 Syracuse and Pitt were tied, 10-10, at halftime. On their first drive to start the second half, the Panthers padded their lead to 13-10 with a 42-yard field goal by Alex Kessman. 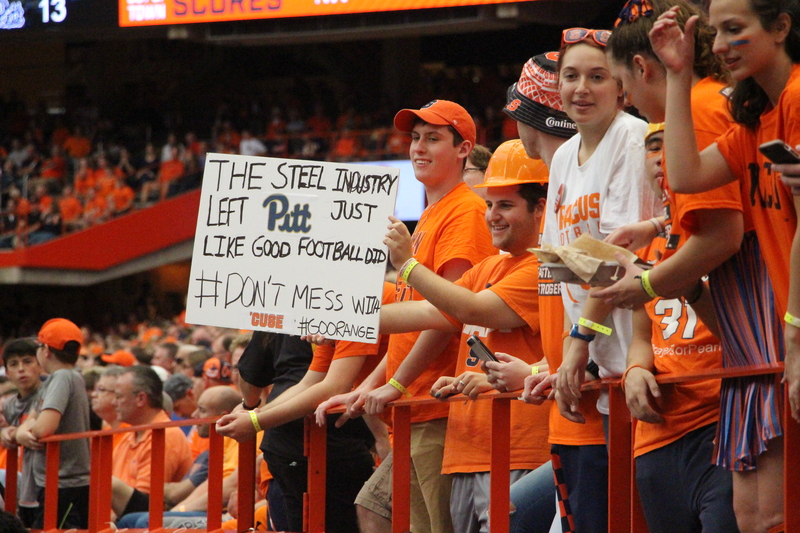 The Orange finally broke through the stout Pitt defense as Dungey scored on a 10-yard keeper. 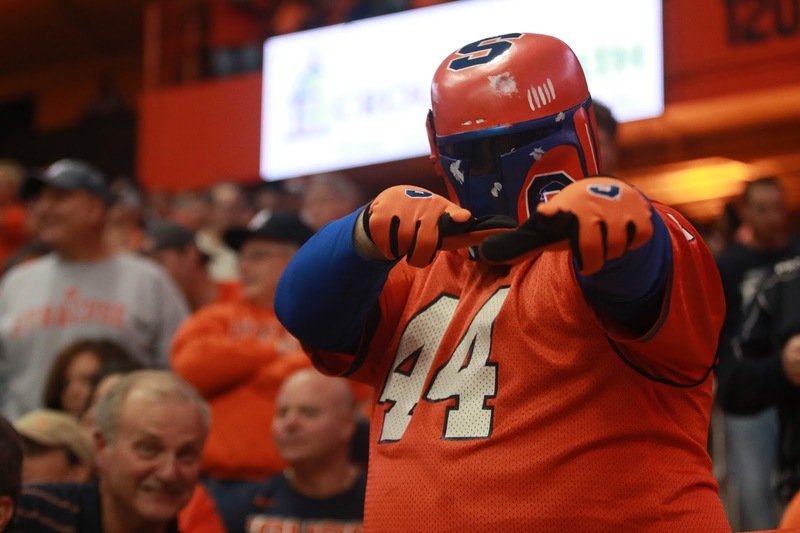 Syracuse lead 17-13 after a 13-play, 75-yard drive. Cole Murphy then tacked on a 38-yard field goal with 2:12 to play in the third. 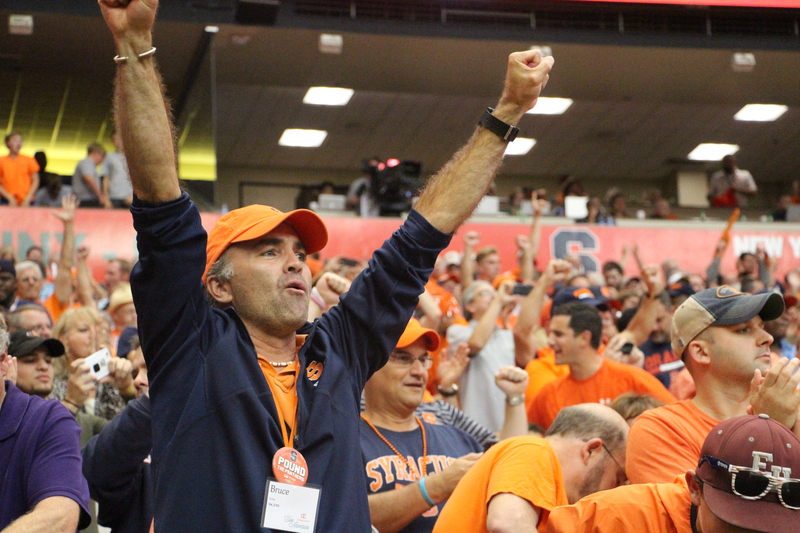 Syracuse led by a touchdown, 20-13. That field goal capped off a 10-play, 52-yard drive. 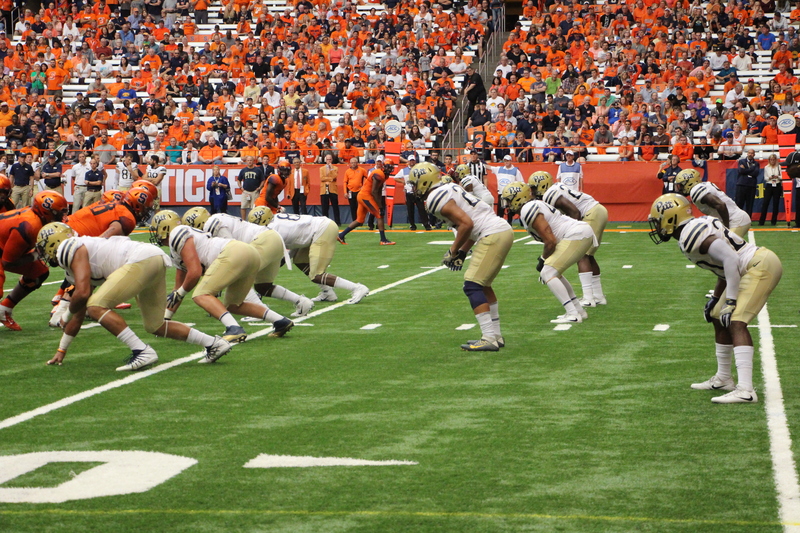 Pitt QB Max Browne went out with an injury after being sacked with under 7:00 to go in the third quarter and Ben DiNucci took over. 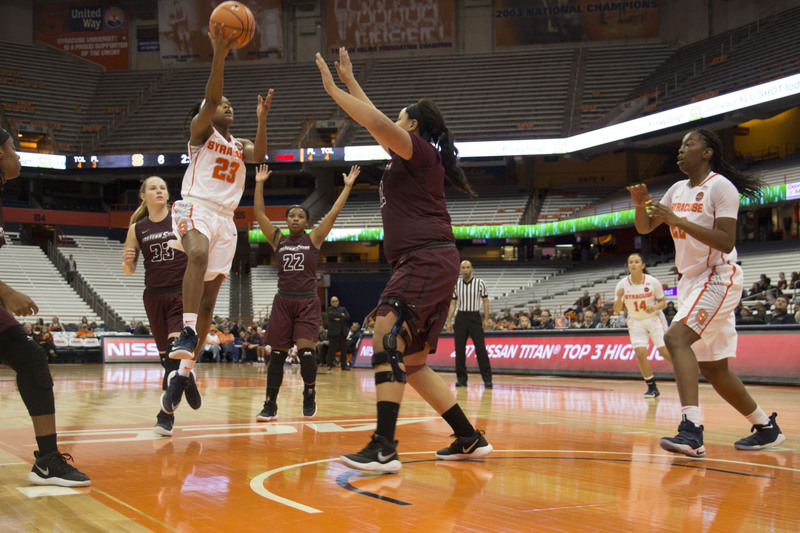 Syracuse held the 20-13 lead after three quarters. 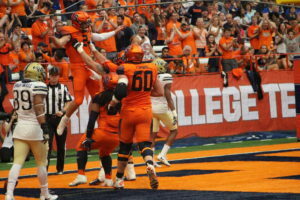 Kessman continued to boost the Panthers as he nailed a 56-yard field goal to cut the Orange lead to 20-16 just five seconds into the fourth quarter. 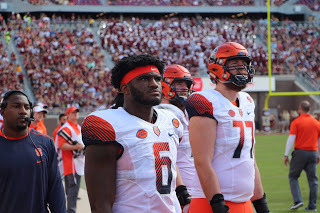 With 11:07 to play in regulation, Dungey connected with Ishmael for a 35-yard score to extend the Orange lead to 27-16. 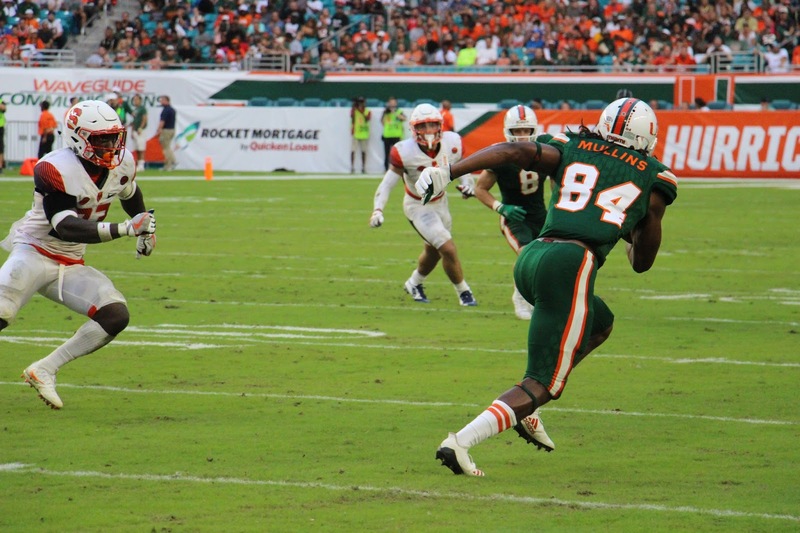 Ishmael entered Saturday’s game as the nation’s leader in catches (51) and he was second in yards (632). He finished the day with five receptions for 97 yards and a touchdown. 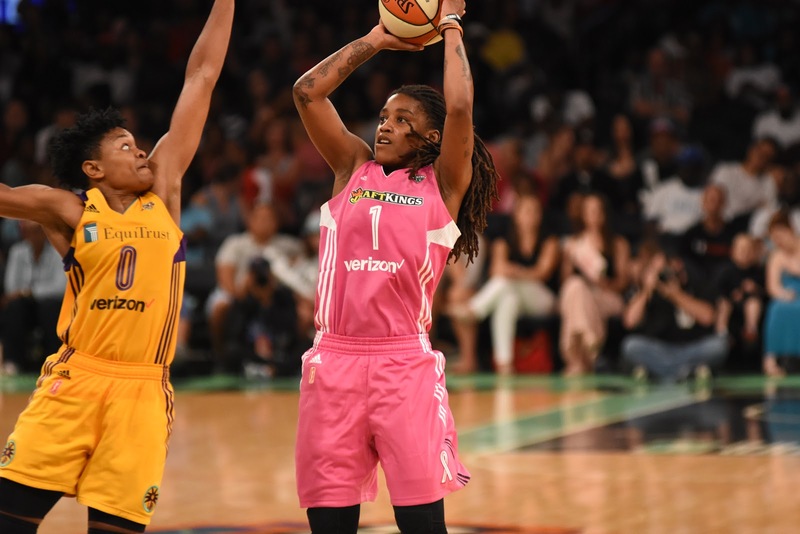 The Panthers found a way to make it interesting in the middle of the fourth quarter. 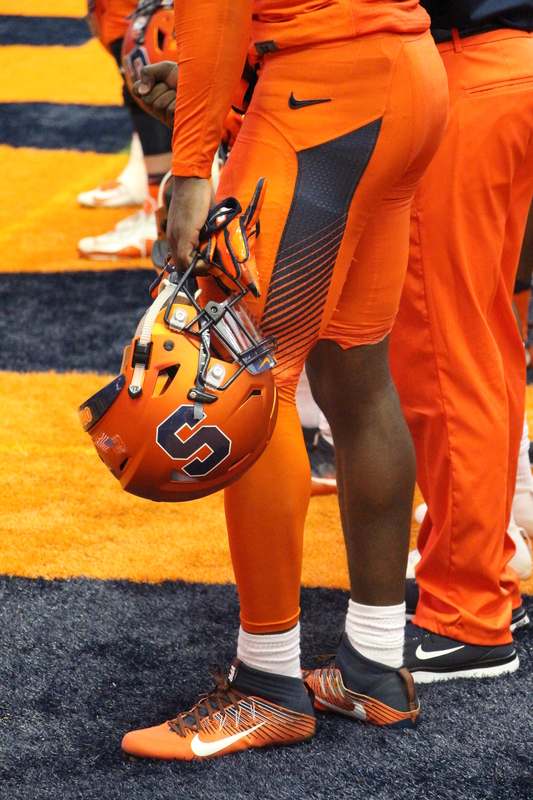 Running back Qadree Ollison ran one in from 19 yards to cut the Orange lead to 27-22. 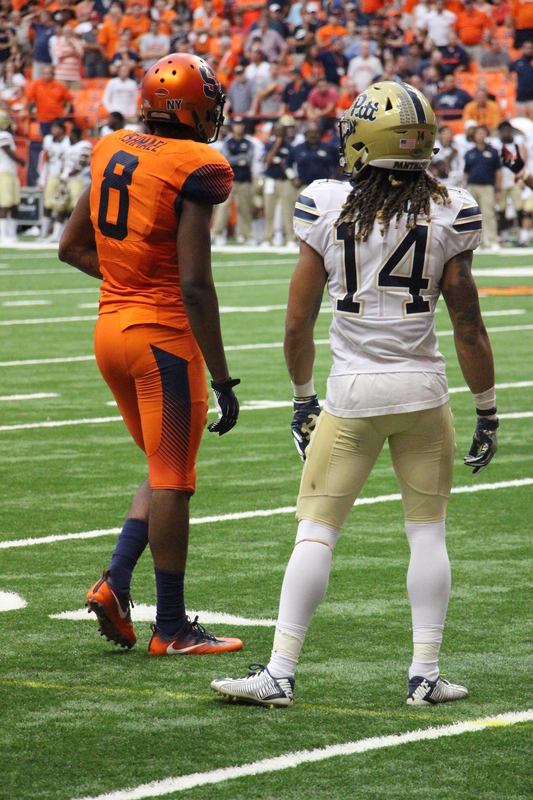 Pitt converted a two-point attempt on a Whitehead rush to make it a 27-24 Orange lead with 7:15 still to play. 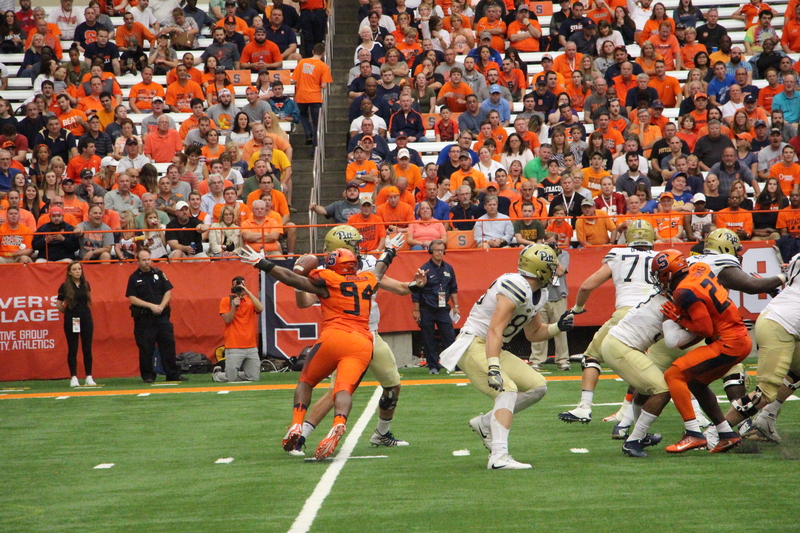 Syracuse’s next drive stalled on the Pitt five-yard line when the Orange went for it on fourth and one and Dungey’s shovel pass to Pierce fell incomplete. 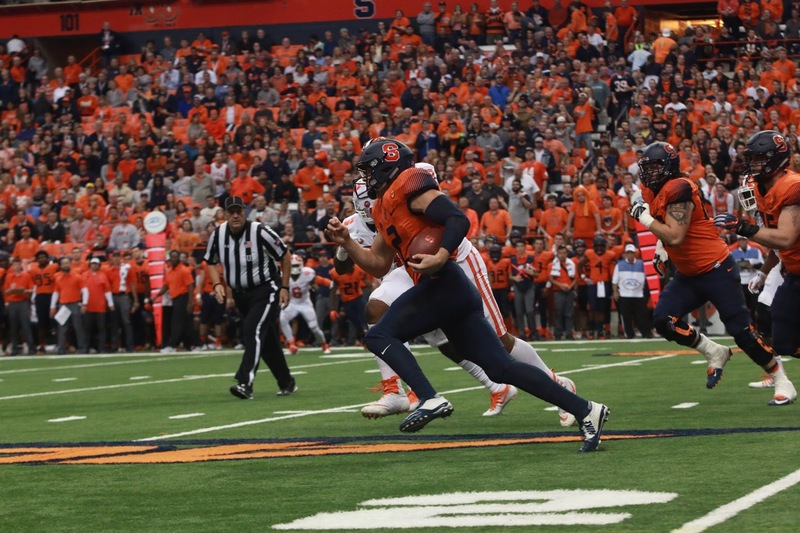 The Panthers had a chance to win it with less than a minute to play but gained only ten yards on their final drive, and Syracuse escaped with the 27-24 victory. 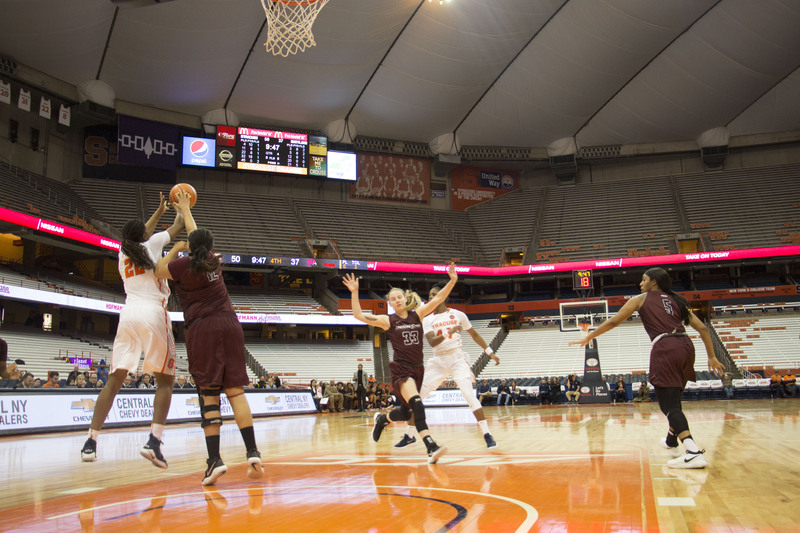 The game took 3:33 to play, and 33,290 were counted inside the Carrier Dome to witness the Orange victory. 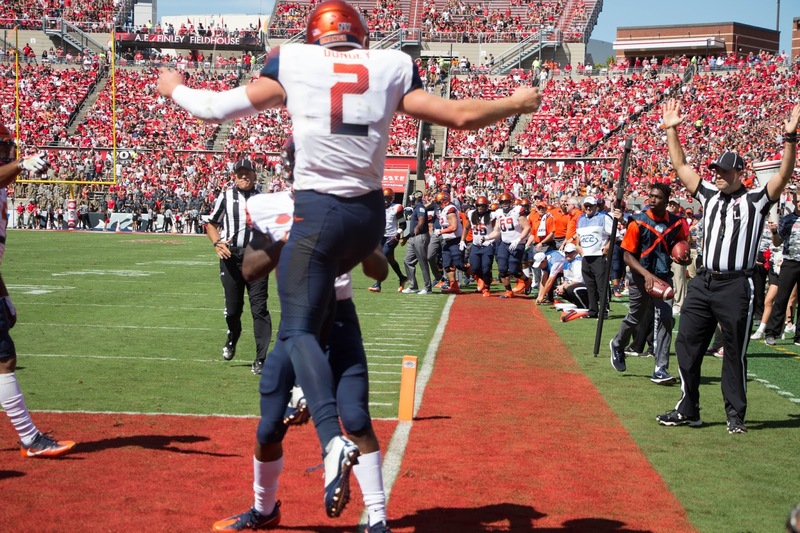 For Syracuse, Dungey went 33-49 in the air with 365 yards. He also rushed a dozen times for a net gain of 48 yards. 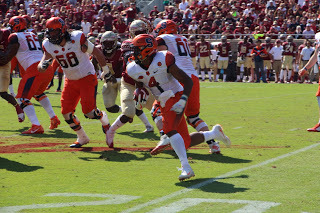 Dontae Strickland was Syracuse’s leading rusher on Saturday. He carried the ball 25 times for 81 yards. 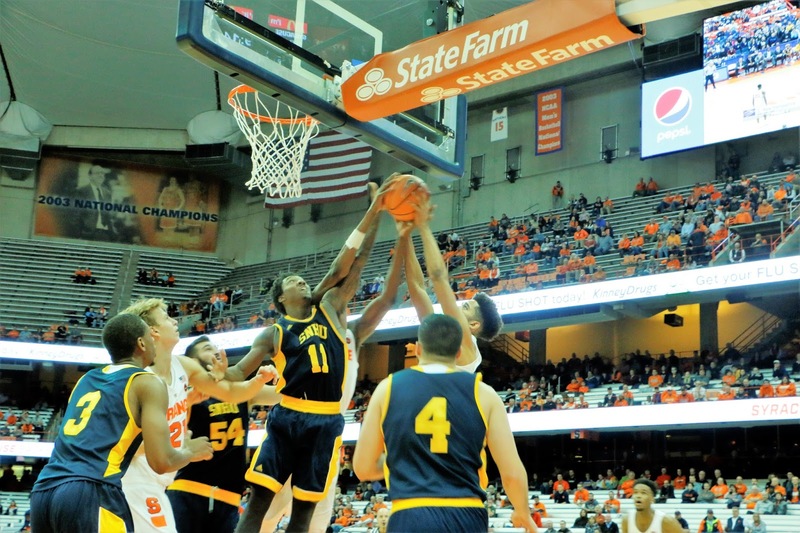 The Pitt-SU rivalry goes back to 1916 and the teams have played each other every year since 1955, starting as independents, then as Big East members and now in the ACC. 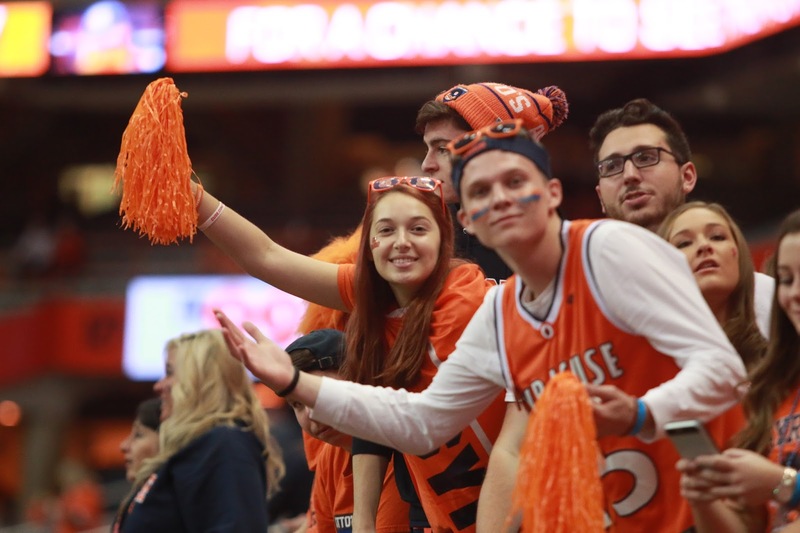 Pitt is the only Coastal Division team that SU, an Atlantic Division team, plays every season. 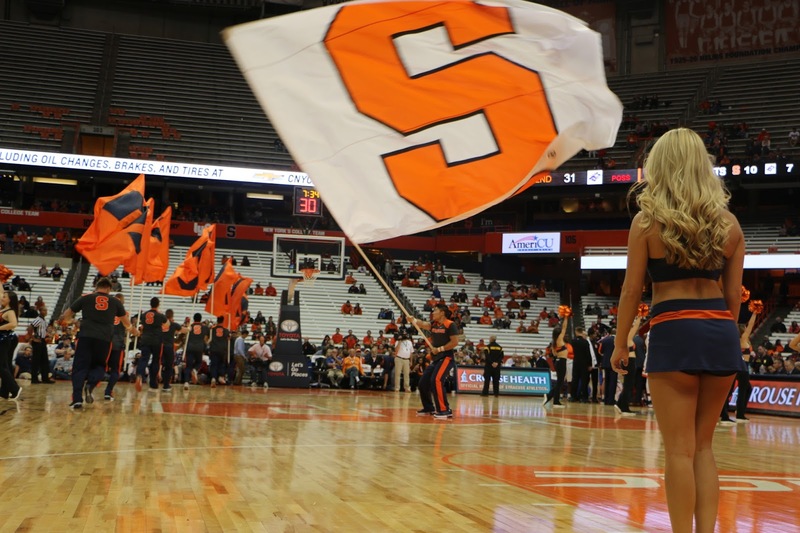 The Syracuse Orange will turn around in a short week to welcome a national powerhouse into the Carrier Dome. 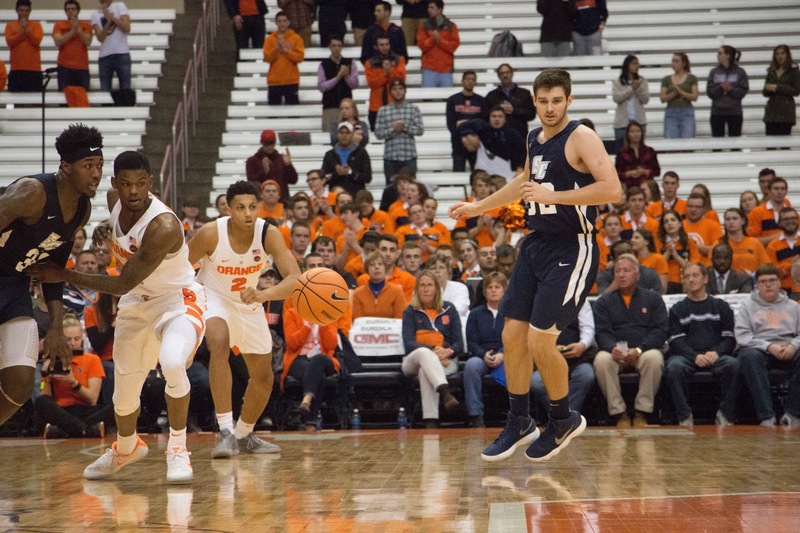 The second-ranked Clemson Tigers (6-0, 4-0 ACC) will come to Syracuse for a nationally-televised contest that kicks off at 7:00 p.m. EDT Friday. 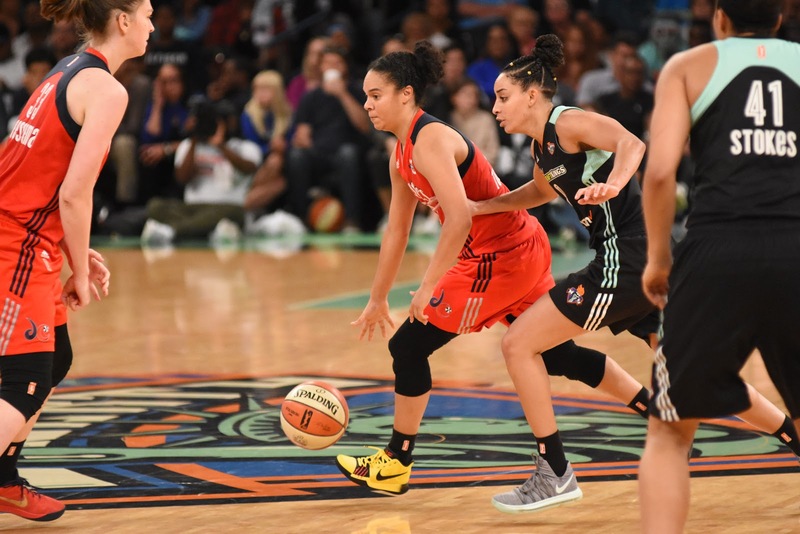 The game can be viewed on ESPN. 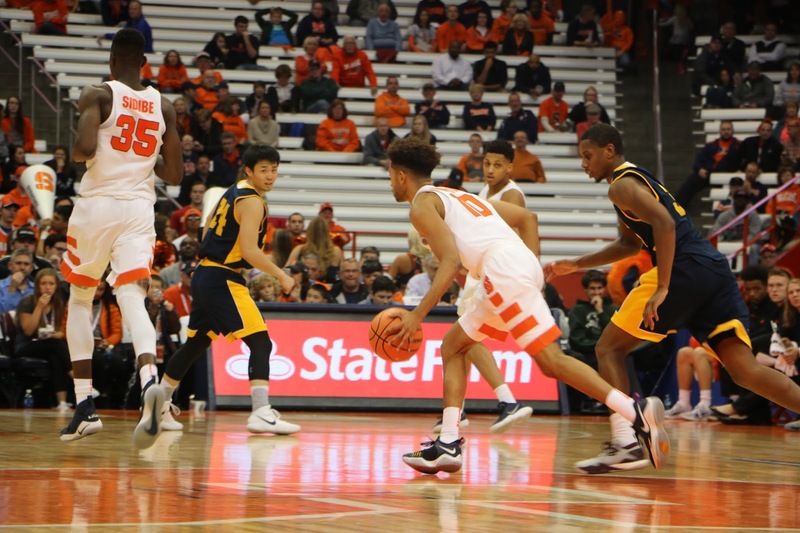 Pitt returns home to take on the No. 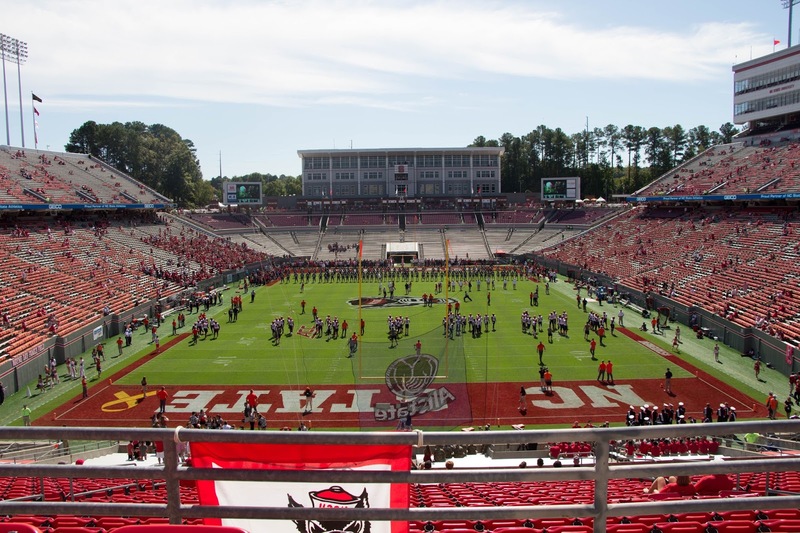 20 North Carolina State Wolfpack (5-1, 3-0 ACC) at noon on Saturday. 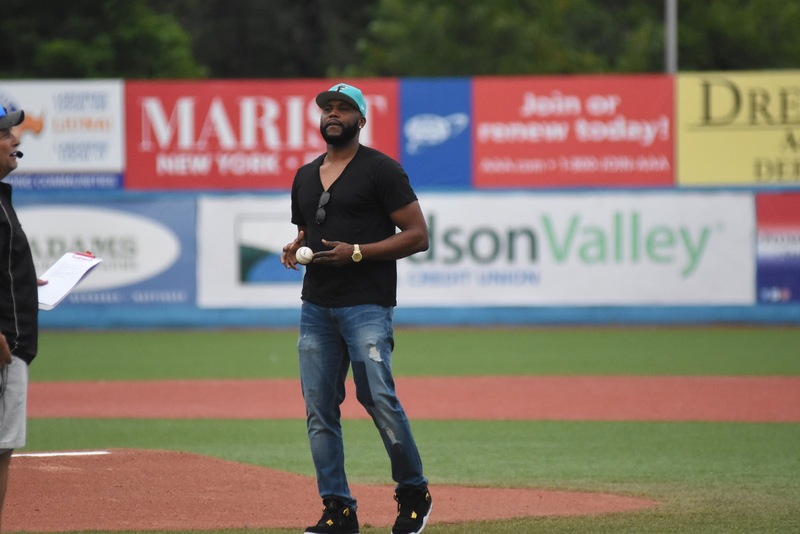 Editor’s note: As part of his capstone for his master’s degree in Broadcast and Digital Journalism with Sports Communications Emphasis, Dontae Harris covered the Hudson Valley Renegades this summer. 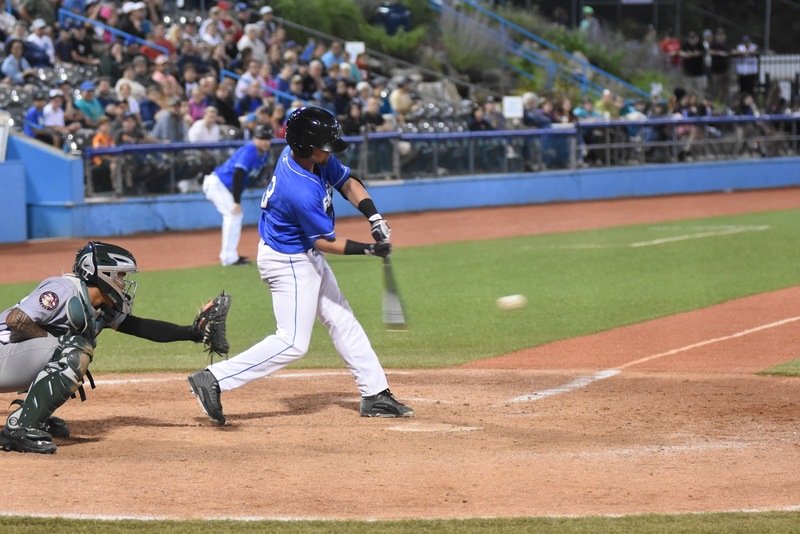 The story below is from August 12 – the night fans packed the stadium to see a visiting player. 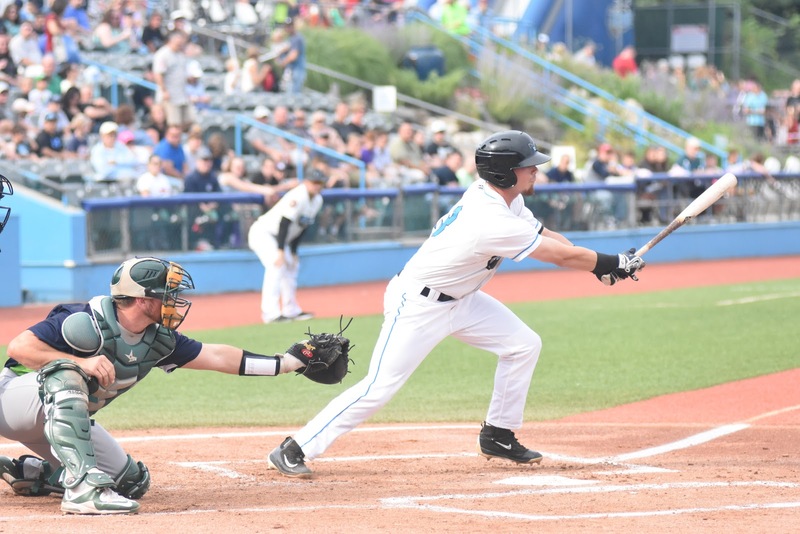 Fishkill, N.Y. – The home team was not the headline for a sellout crowd at Dutchess Stadium on Saturday. 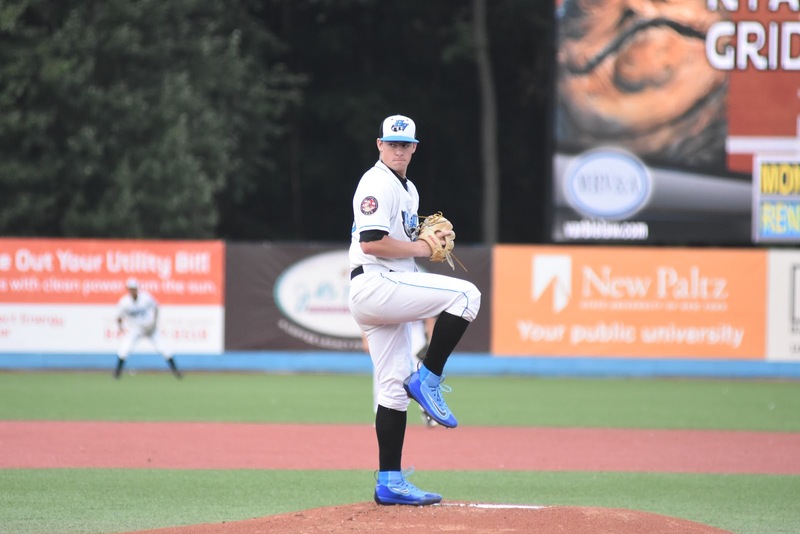 In fact the home team promoted the visiting player through social media and on the big screen just outside the ballpark and there were a lot of orange jerseys in that crowd. 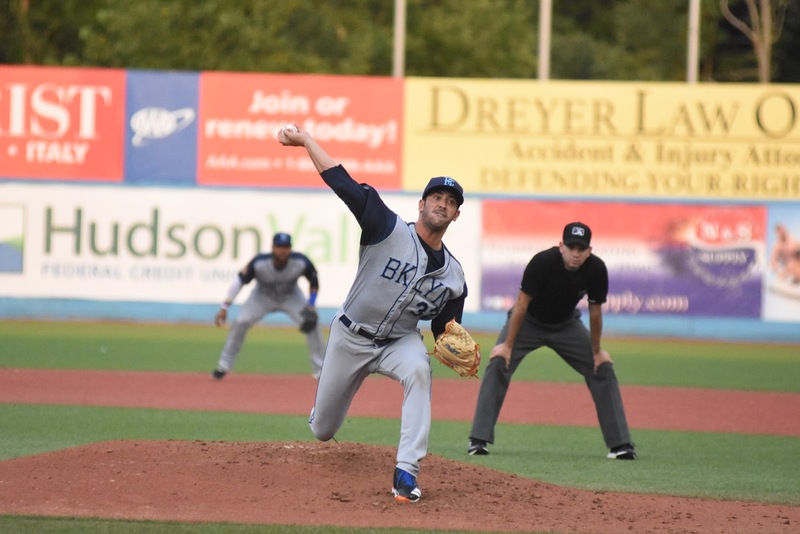 New York Mets All-Star pitcher Matt Harvey got his first start off the disabled list, throwing one inning for the Brooklyn Cyclones in the back end of a non-traditional doubleheader against the Hudson Valley Renegades. He gave up a walk, a hit and a run. 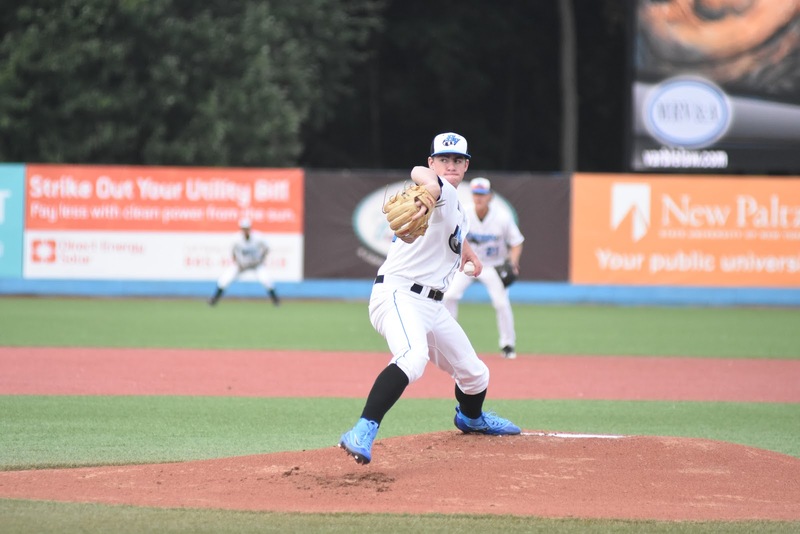 “I was trying to get my rhythm and mechanics back down,” Harvey said. 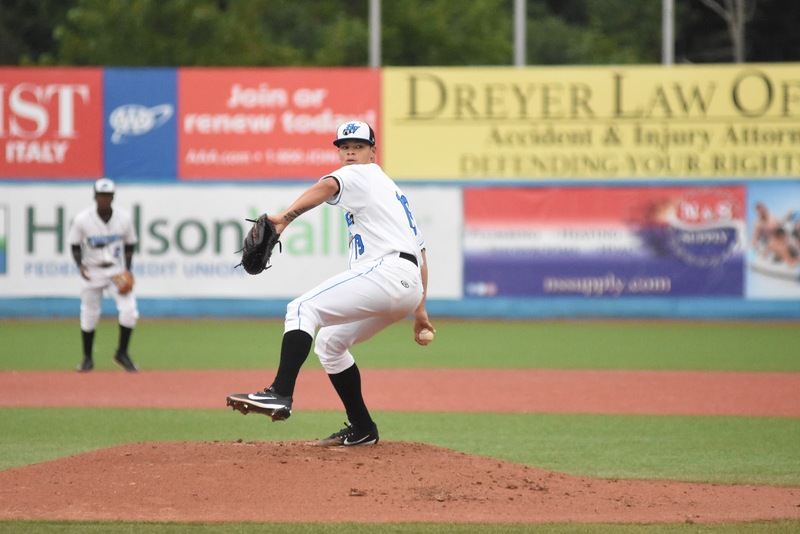 He had not pitched since June 14 due to a shoulder injury. 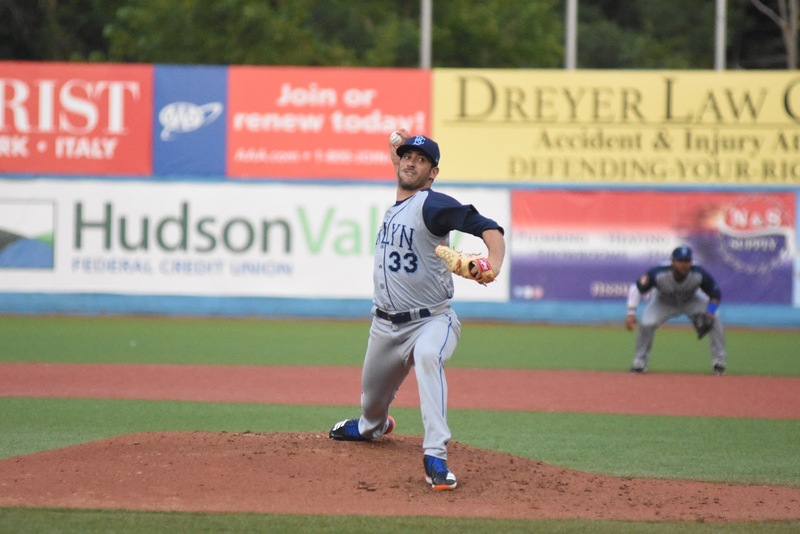 Harvey said he threw some sliders, a few changeups and fastballs. 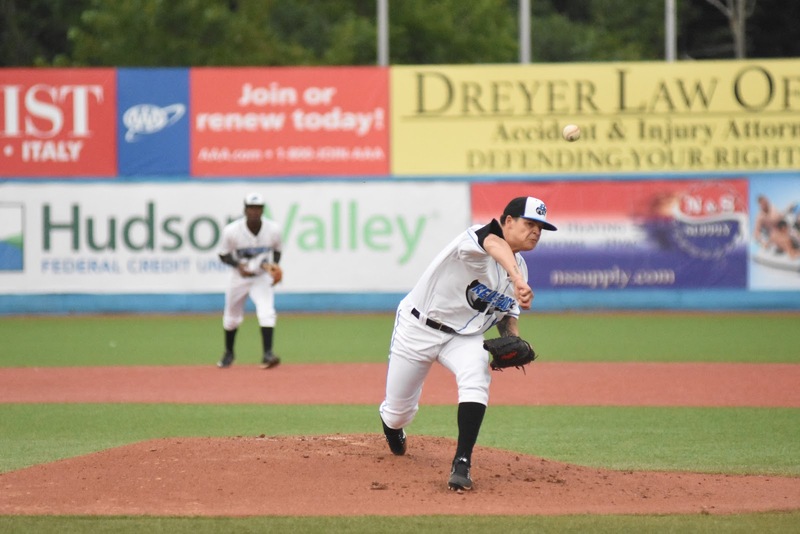 Trailing 1-0, the Renegades came out with energy in the bottom of the first against the man known as the Dark Knight of Gotham. He started off his outing with a walk to Vidal Brujan. 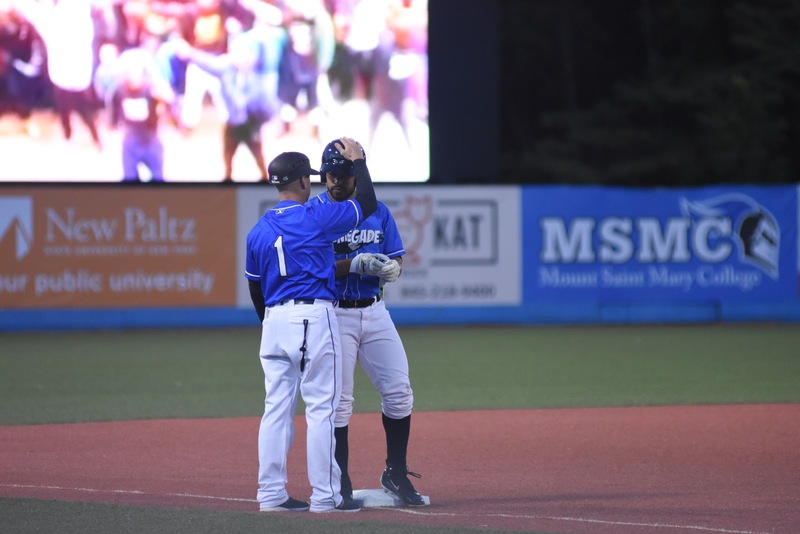 Brujan took second base on a delayed steal because the Cyclones didn’t pay attention to him. 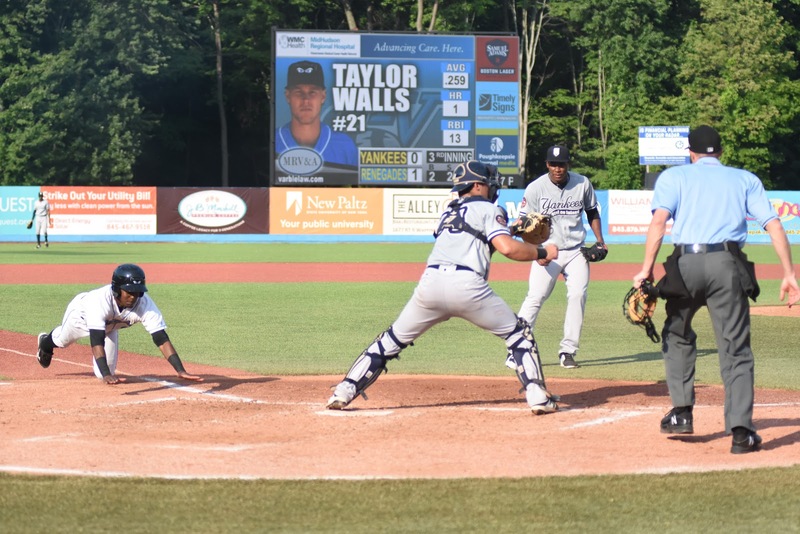 Taylor Walls knocked in Brujan with a single. Harvey retired the side after that and his day was done. The Dark Knight said the excitement for his next start is to stretch things out and works things in a little more. 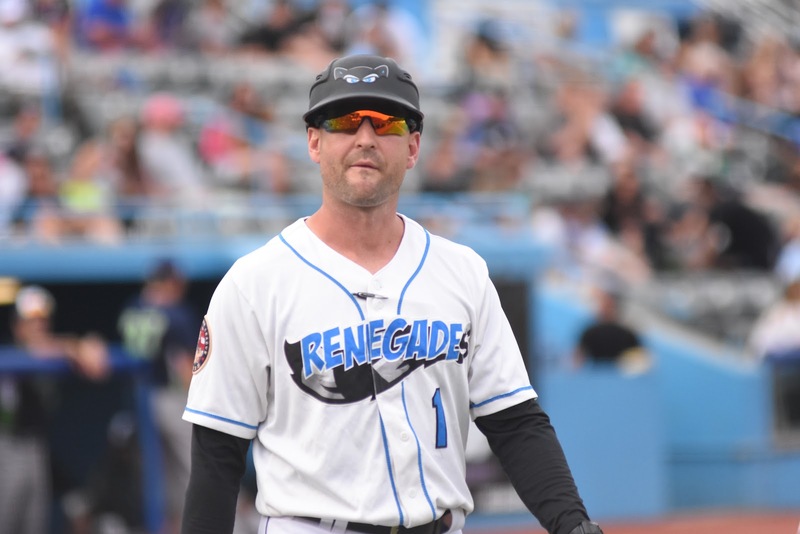 The Renegades didn’t cool down after Harvey’s exit. 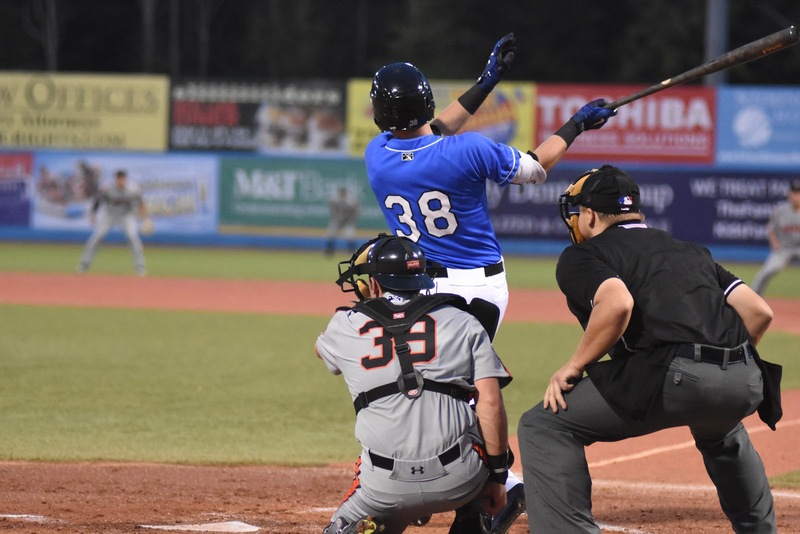 They scored one in the second inning, two in the third and two more in the fourth to win the seven-inning game 6-2. 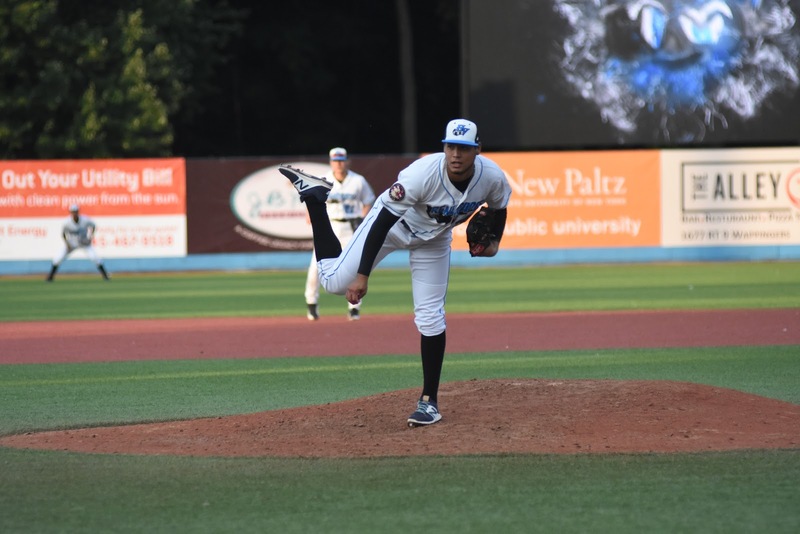 That was more than the Renegades’ 19-year-old starting pitcher Tobias Myers needed to get the win. 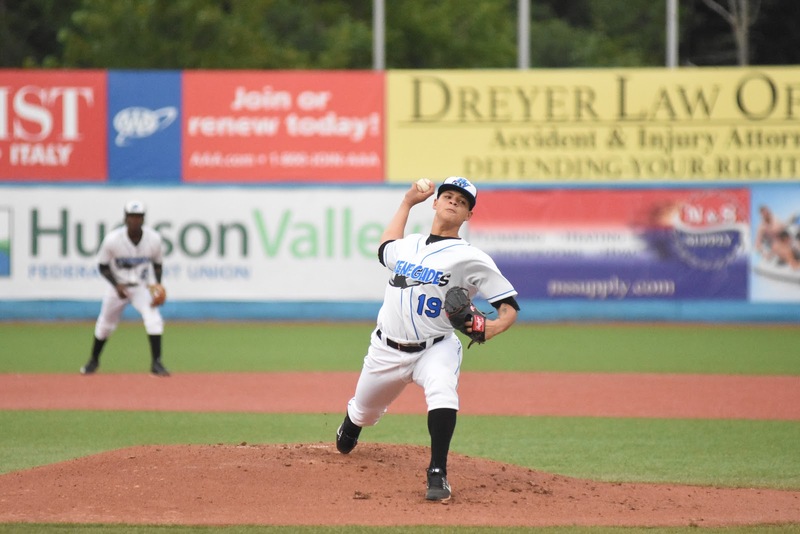 He pitched 5 2/3 innings, allowing two runs on two hits and striking out ten Cyclones. 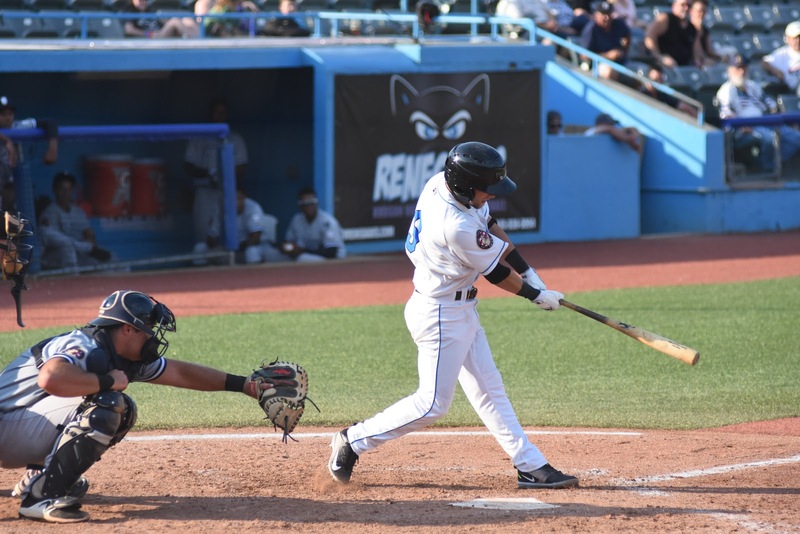 “I just went in there and tried to attack them with fastballs,” Myers said. 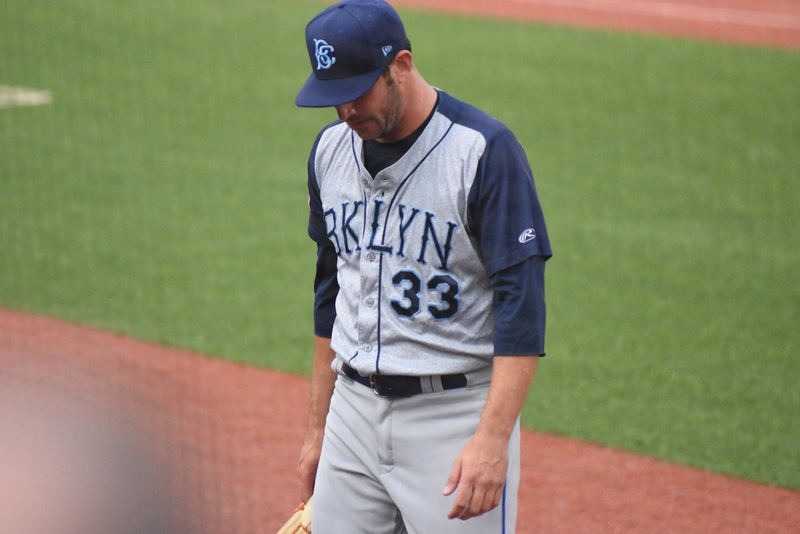 This was his fourth start against Brooklyn but the first against them with the Renegades. 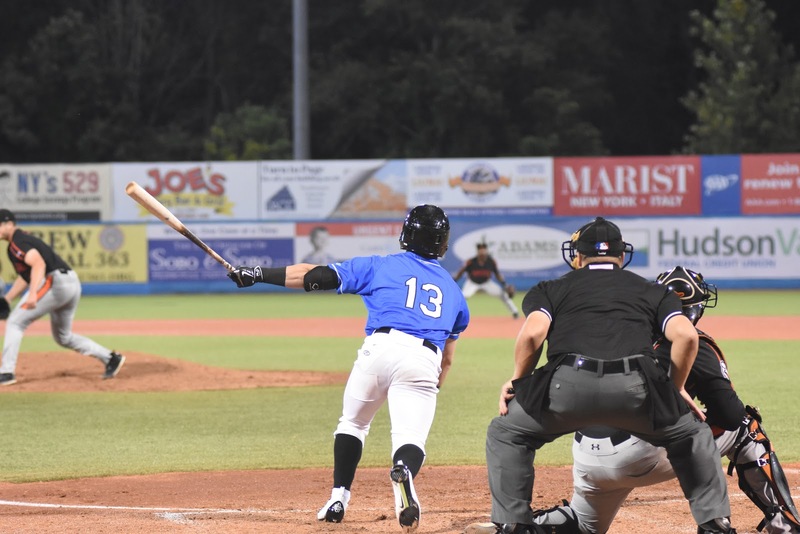 The Orioles traded Myers to the Rays for Tim Beckham on July 31. Beckham was the #1 overall pick in 2008 MLB Amateur Draft. 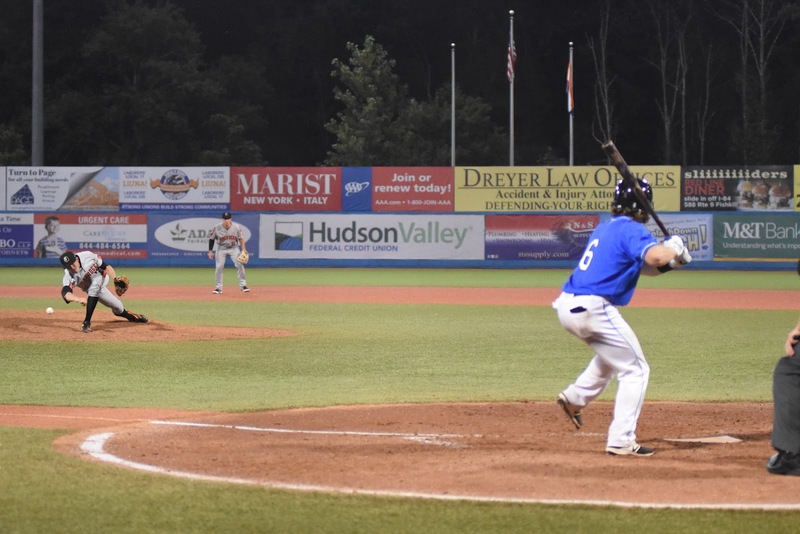 The double-header came about because Friday’s game had been suspended due to rain and was picked up on Saturday at 5:05pm. 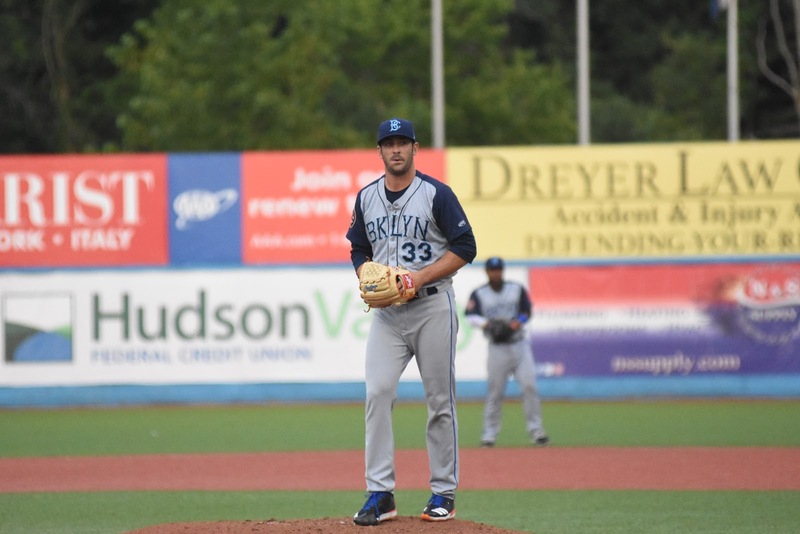 Rumor around the press box was that Harvey was going to resume the first game, but it turned out that he couldn’t because he wasn’t on Friday’s roster. 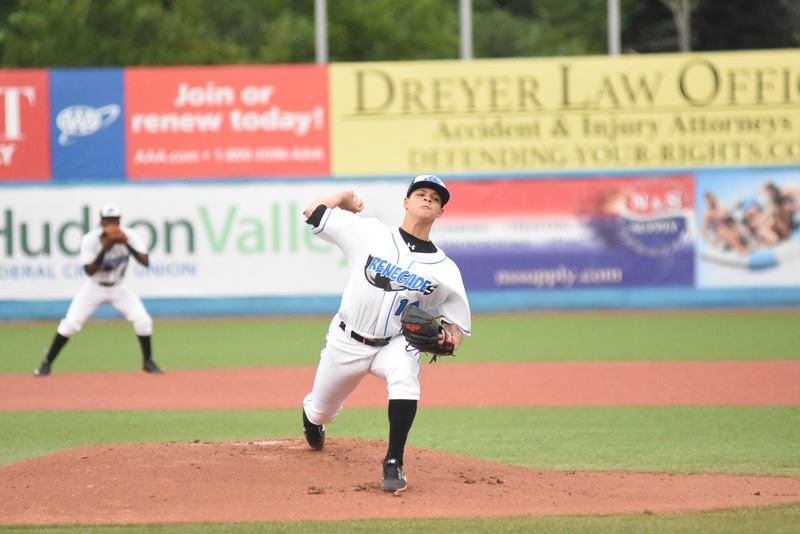 The Renegades wound up winning that one 4-1. 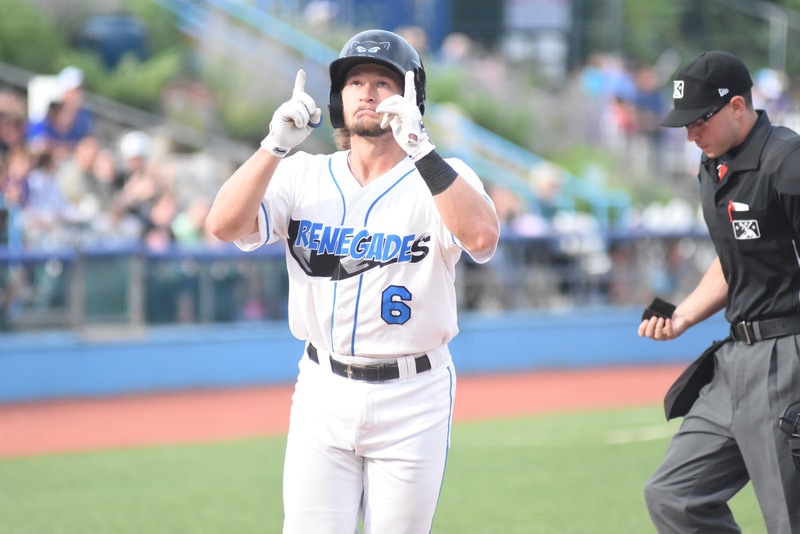 The Renegades head into Sunday’s rubber match with the Cyclones two-and-a-half games out of a wild card spot. 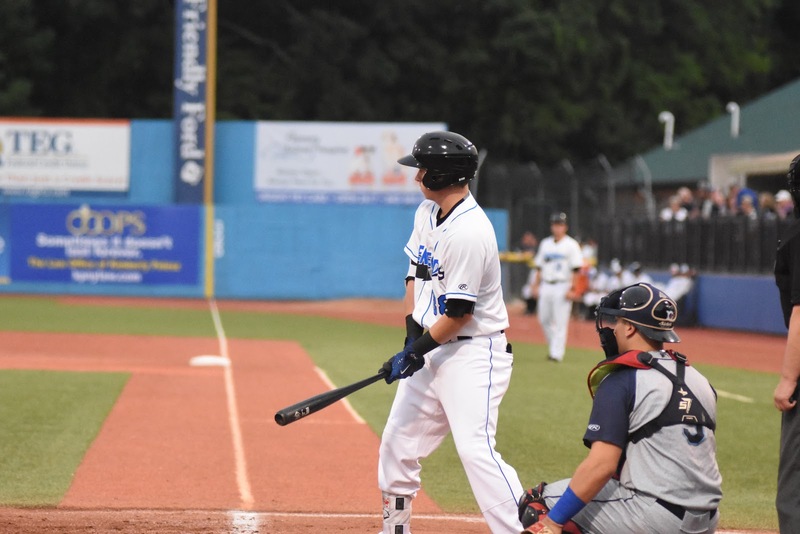 With four weeks left in the regular season, they are five-and-a-half games behind the Staten Island Yankees who lead the division. 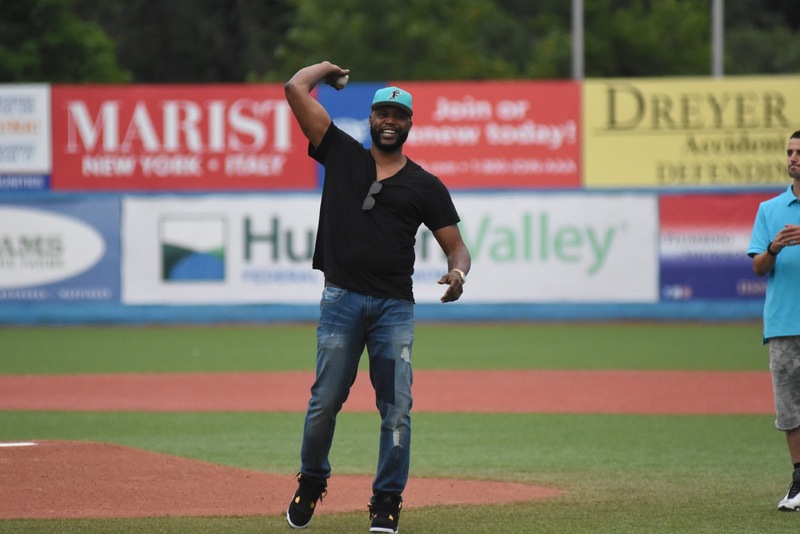 Before game two, former New York Met Cliff Floyd threw out the first pitch along with some fans. 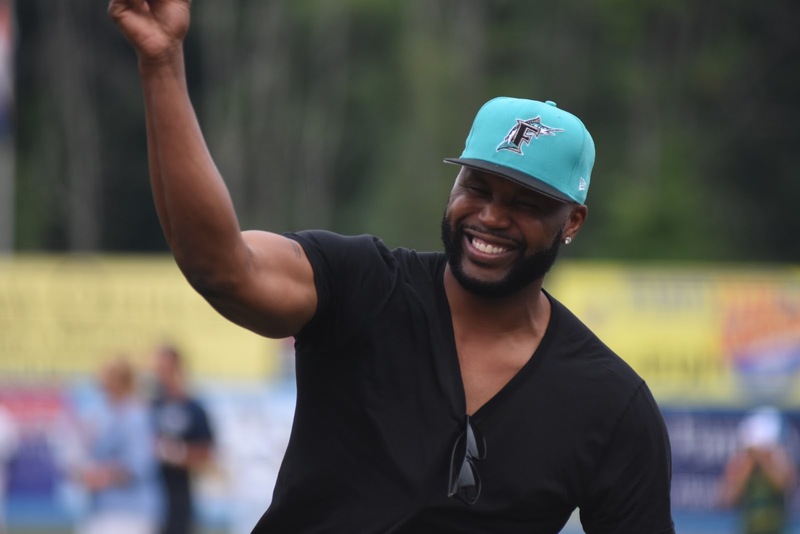 Floyd showed his loyalty by wearing a retro teal Florida Marlins hat. 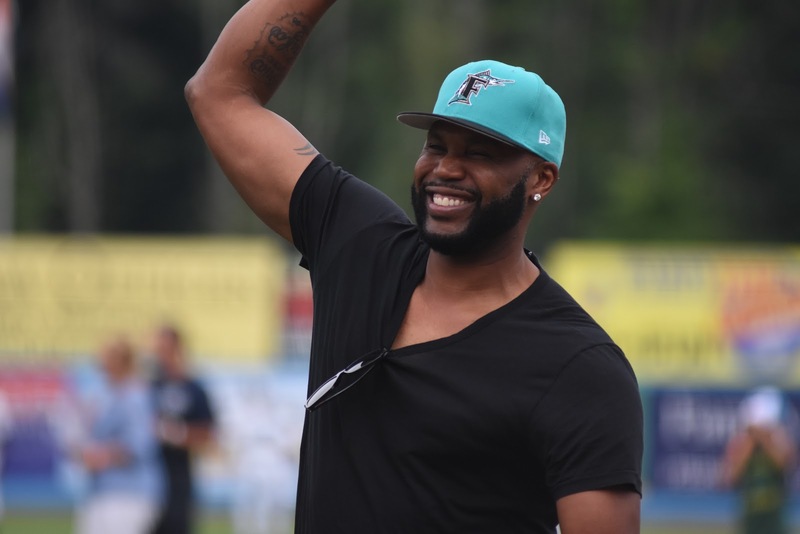 Floyd won a World Series with the Marlins in 1997. 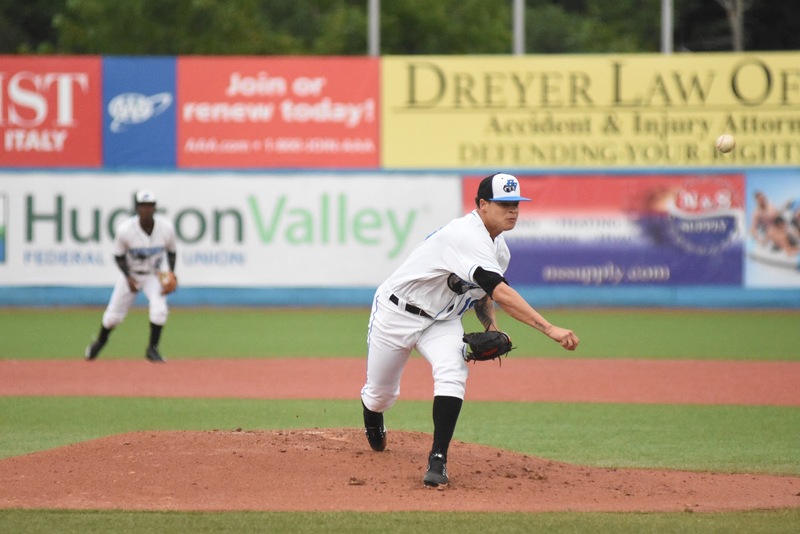 FISHKILL, N.Y. — The Hudson Valley Renegades are the 2017 New York-Penn League champions, having swept a best-of-three series with the Vermont Lake Monsters in September. 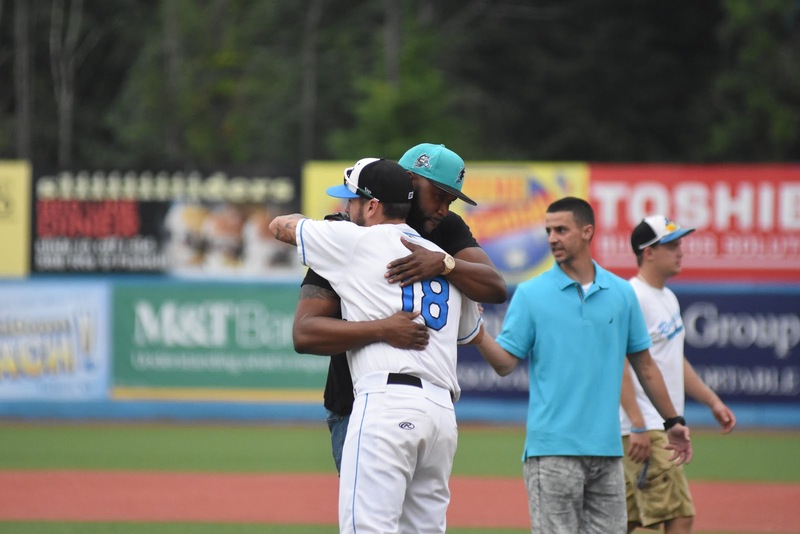 As part of his Newhouse School master’s degree capstone project, Dontae Harris covered the Renegades’ season. 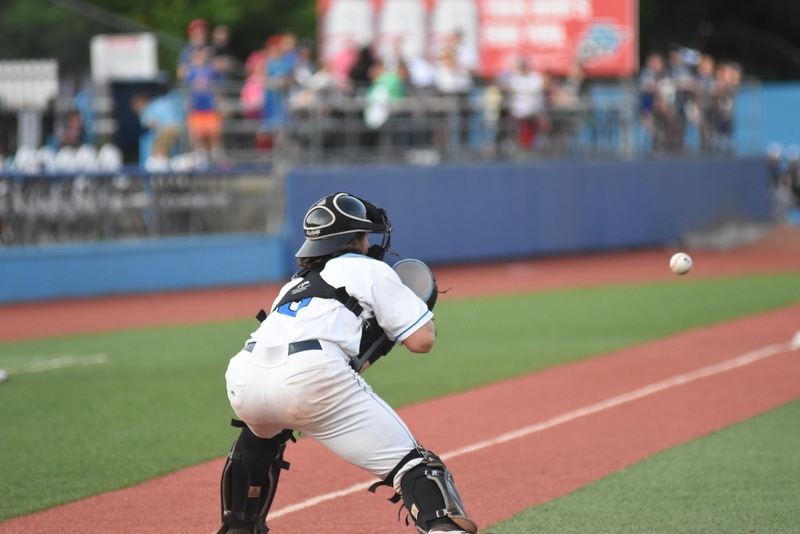 Here is a look at season highlights as seen through his camera lens. 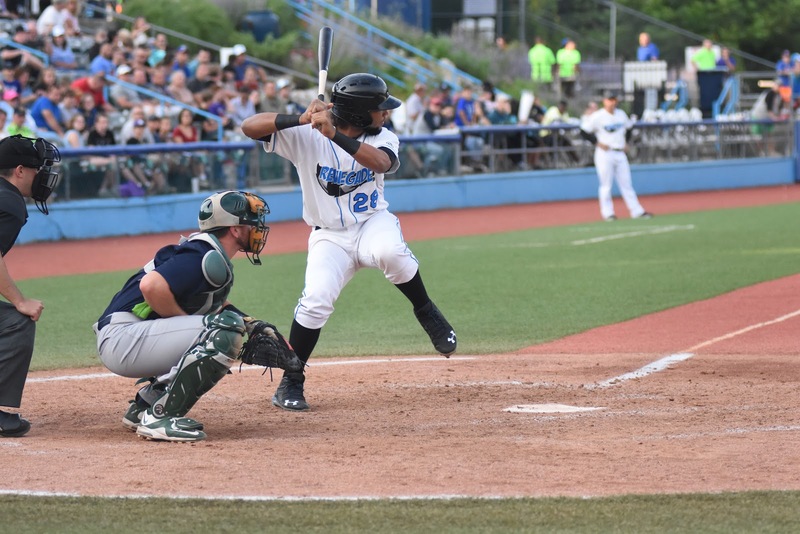 FISHKILL, N.Y. — The Hudson Valley Renegades are the 2017 New York-Penn League champions, having swept a best-of-three series with the Vermont Lake Monsters in September. 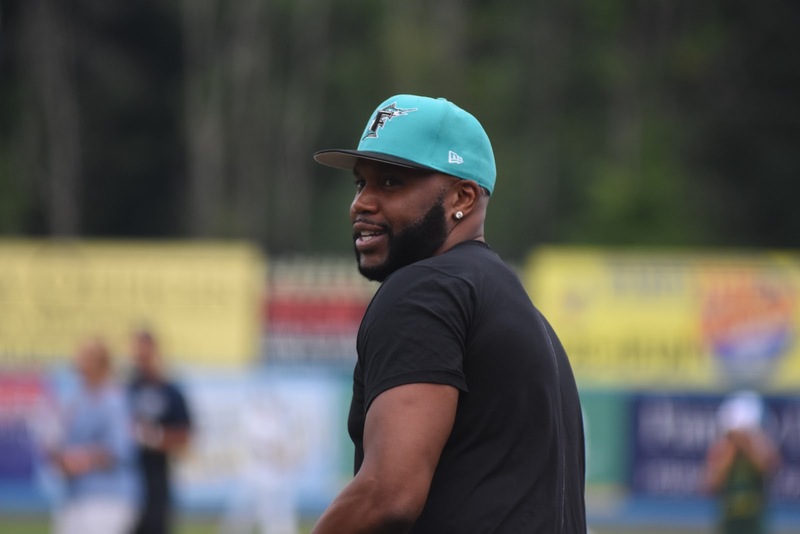 As part of his Newhouse School master’s degree capstone project, Dontae Harris covered the Renegades’ season. 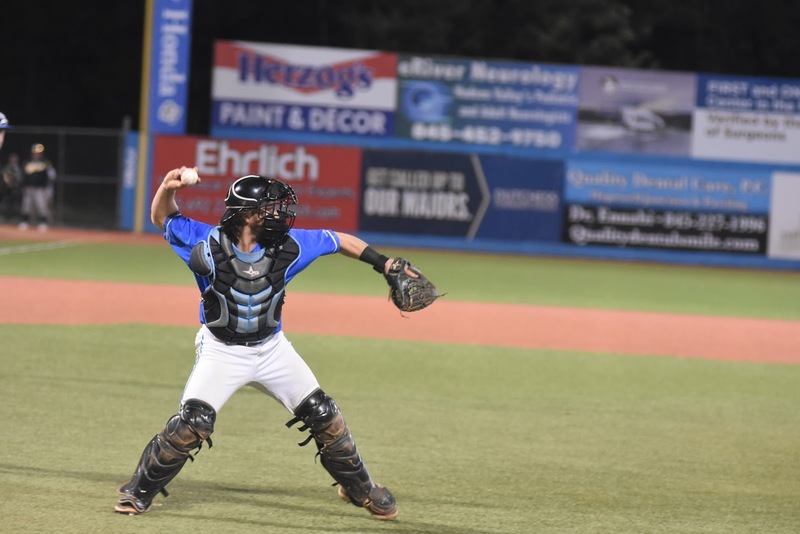 Here is a look at season highlights as seen through his camera lens. 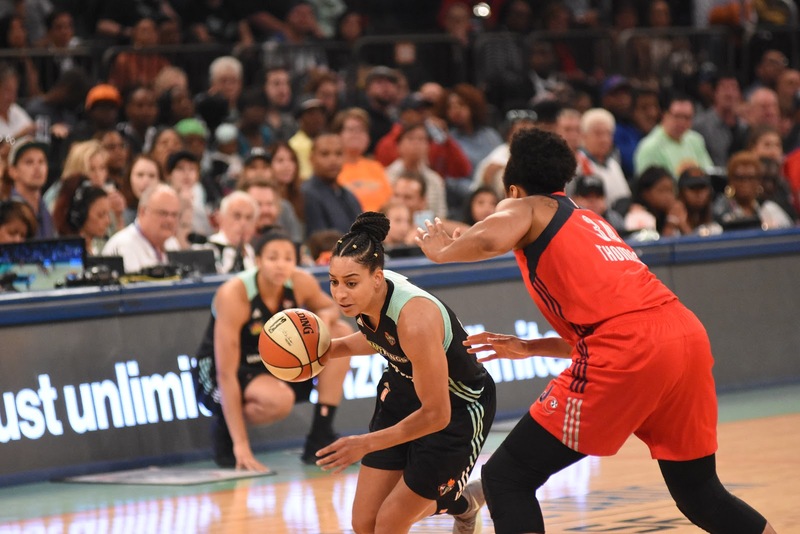 NEW YORK, N.Y. — The New York Liberty closed the 2017 WNBA regular season on a ten-game win streak to finish 22-12. 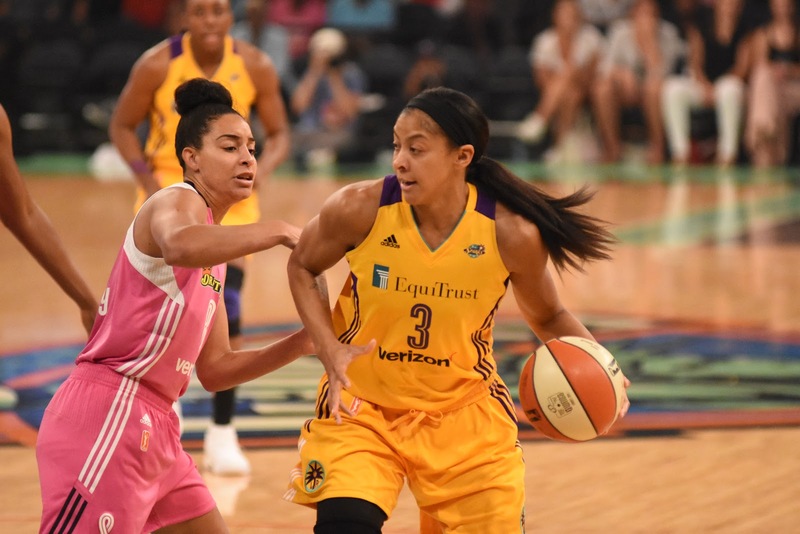 Sitting at .500 on Aug. 4 after a loss to the L.A. Sparks, the Liberty got on a roll and finished in third place in the final standings. 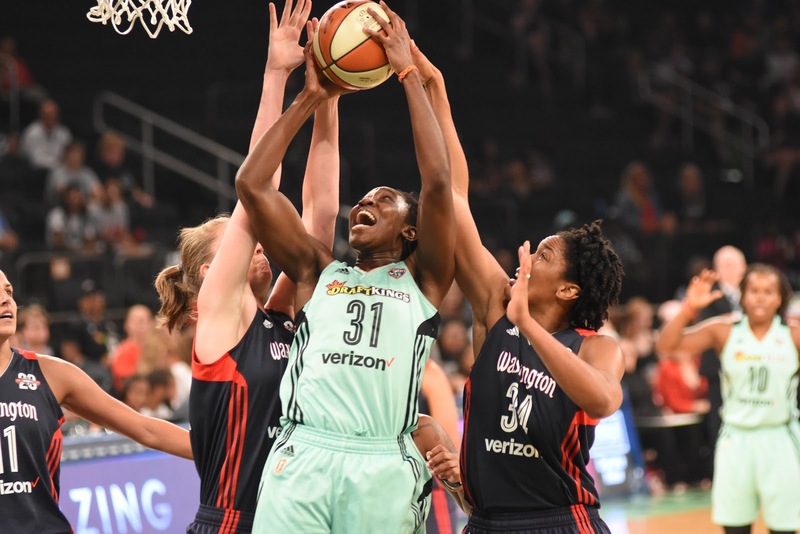 But whatever the Liberty had found was lost in a single-elimination playoff game against the six-seed Washington Mystics and Coach Bill Laimbeer’s team went out, 82-68. 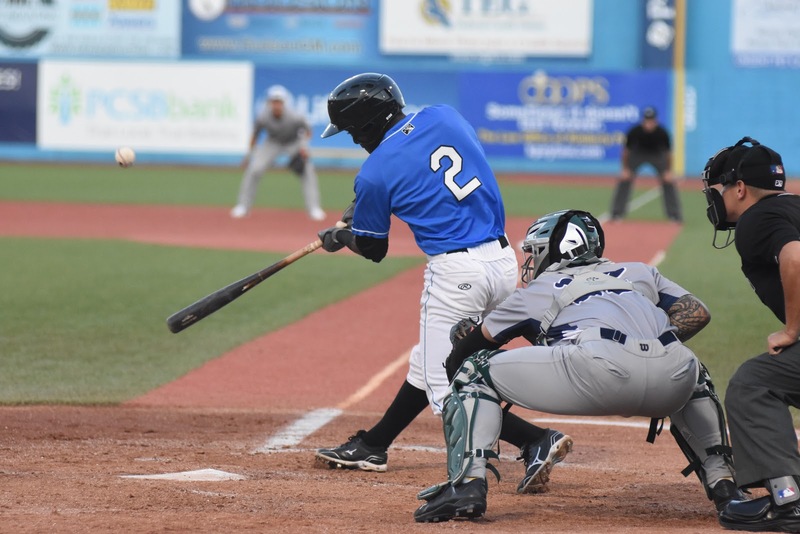 As part of his capstone for his master’s degree in Broadcast and Digital Journalism with Sports Communications Emphasis, Dontae Harris contributed to the website “A Lot of Sports Talk” coverage of the Liberty’s season. Here is his look in photos at some of the highlights. 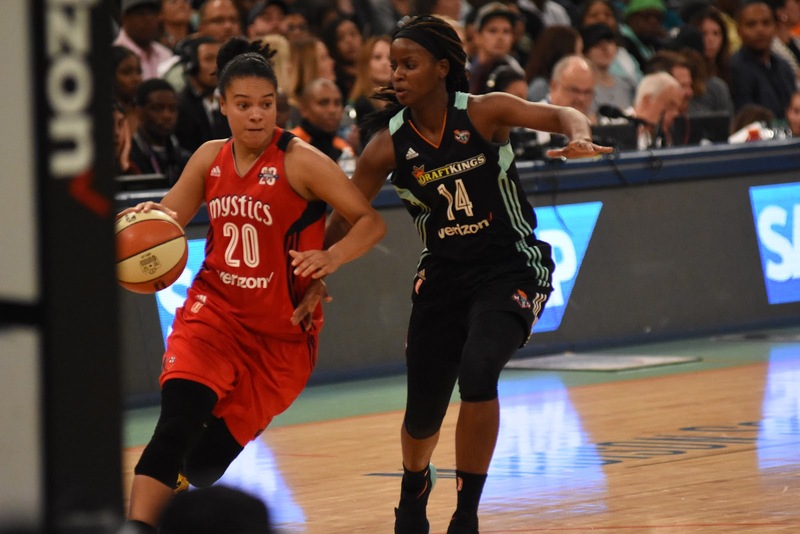 And here is the playoff loss to the Mystics. 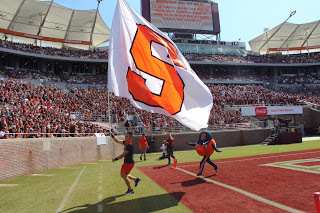 Raleigh, N. C. — The Syracuse Orange (2-2, 0-0) ventured into Carter-Finley Stadium for its ACC opener against NC State (3-1, 1-0) on a beautiful Saturday afternoon, with the newly debuted Wolfpack logo scowling at midfield on Military Appreciation Day. 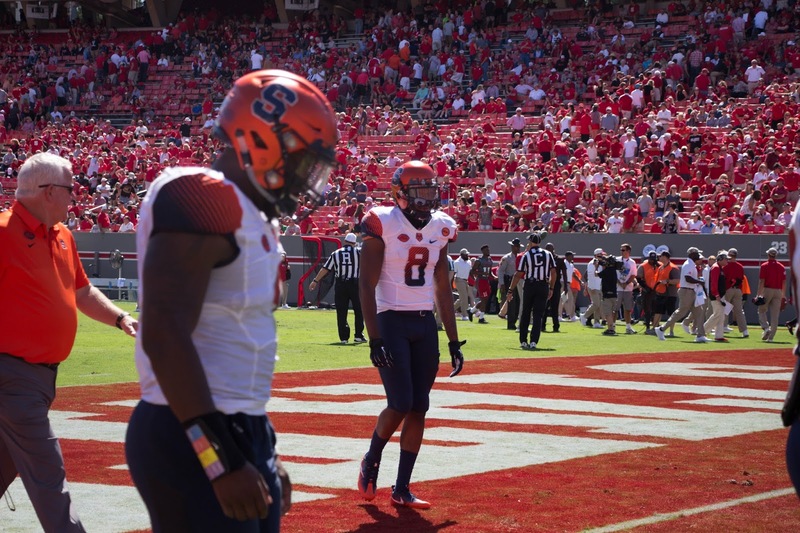 Syracuse left chasing its tail after another failed second half comeback bid, with the Wolfpack winning 33-25. 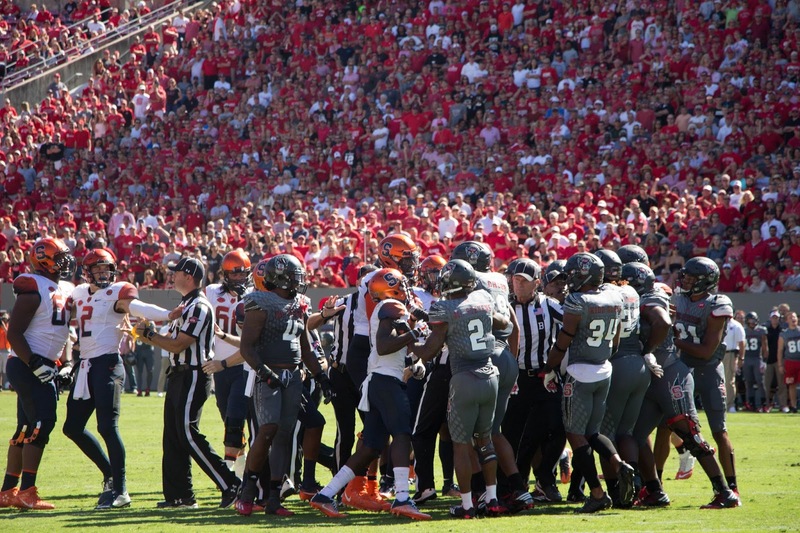 Syracuse elected to defer the opening kickoff, and NC State took advantage of the decision.The Wolfpack had scored on its first offensive possession in each game this season. NC State topped that trend by scoring on its first five possessions in the first half, putting up 26 points on 350 yards from scrimmage. Its only blemishes were a missed field goal from 31 yards and a missed PAT. 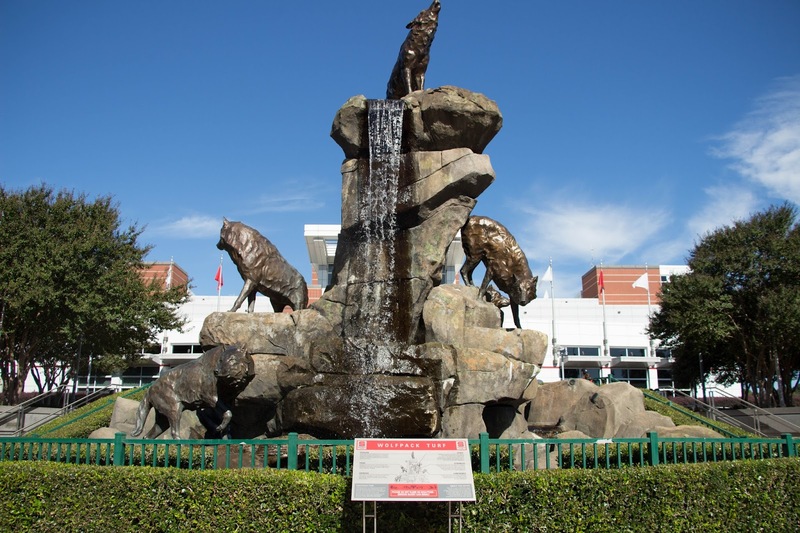 “We knew that if we got on them early it would make it tough for them, so we wanted to get them out of their comfort zone,” Wolfpack wide receiver Stephen Louis said. 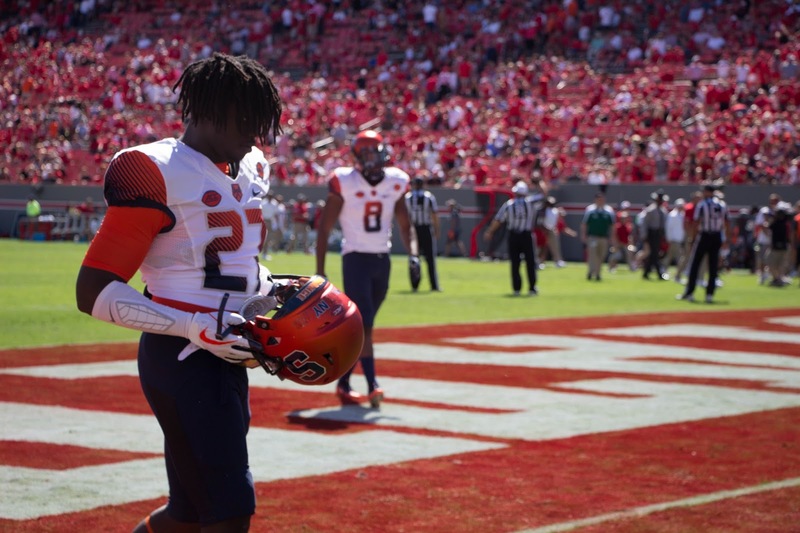 The Wolfpack approach proved effective as Syracuse opened the game as if having hit the snooze button on the noon kickoff. 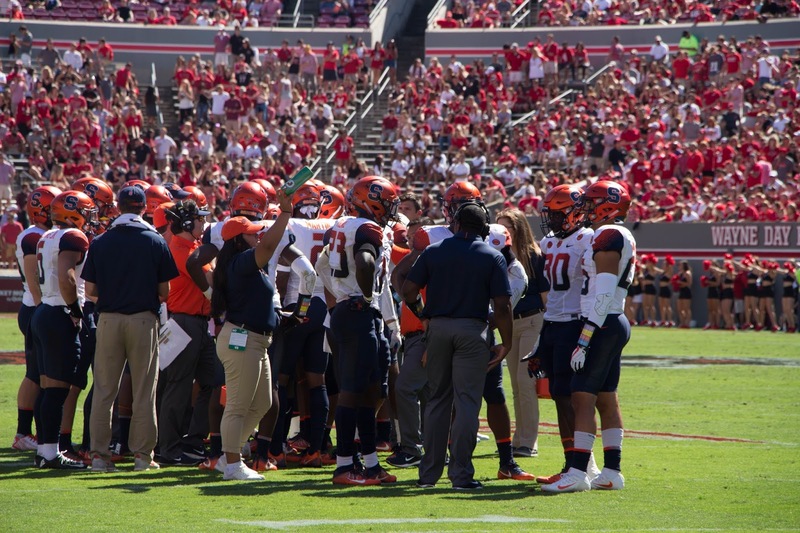 Syracuse began the game kicking the ball out of bounds, setting the Wolfpack up with strong field position at its own 35-yard line. 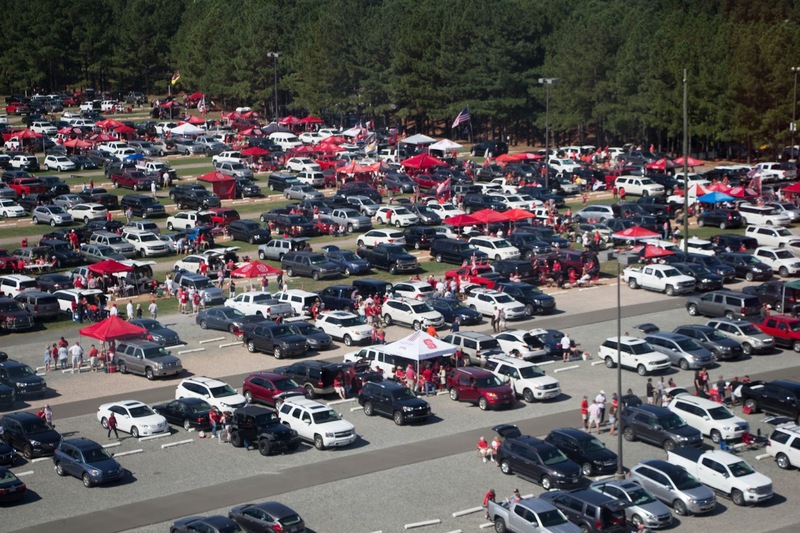 NC State drove for a field goal and a -3-0 lead. 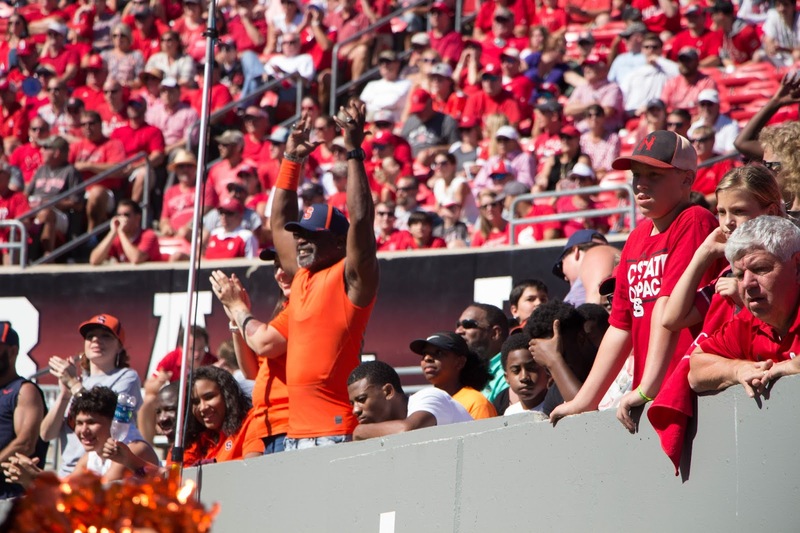 As he had the week before against LSU, quarterback Eric Dungey once again threw an interception on the Orange’s first possession, with NC State cornerback Johnathan Alston securing his team-leading second interception of the season. 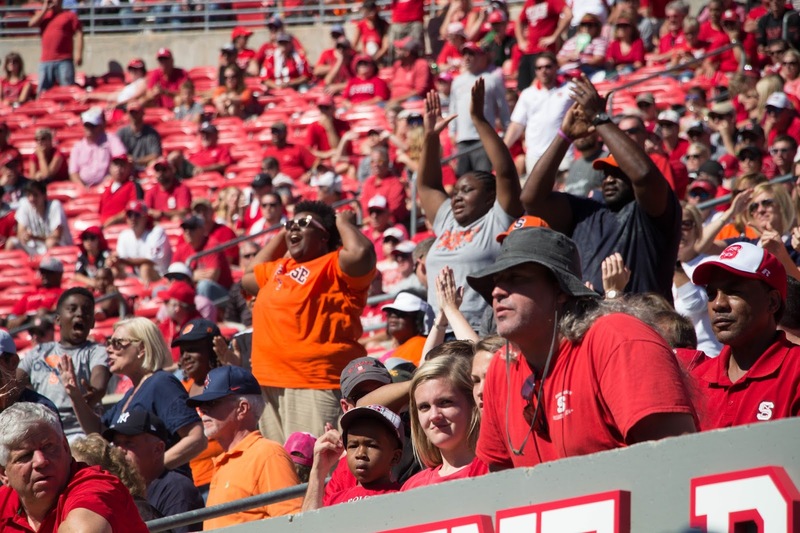 The Orange again held NC State to a field goal but then got in its own way again. 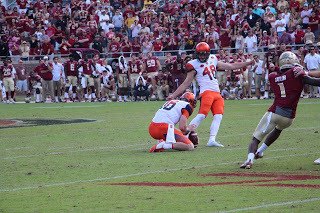 Placekicker Cole Murphy who went one of six last season on outdoor kicks, was tasked to convert a 48-yard field goal after Syracuse drove 45 yards. He missed, leaving the score at 6-0 and was benched from field goal attempts for the remainder of the game. 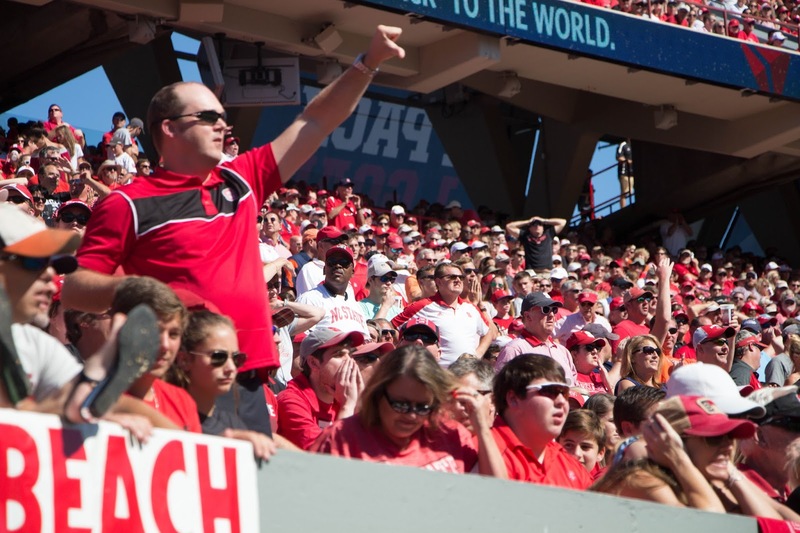 Starting at its own 20, NC State drove 70 yards in five plays, finishing with a 20-yard pass to Louis for the touchdown. The extra point made it 13-0. 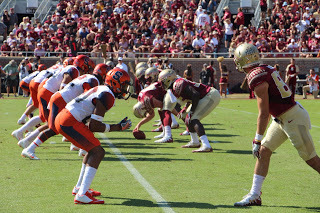 Syracuse finally got going with a ten-play, 75-yard drive to get within 13-7. 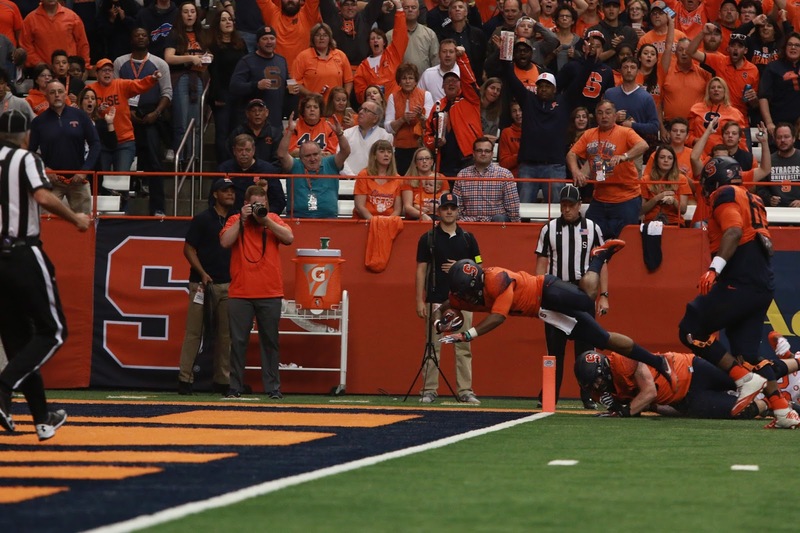 Dungey took it the last seven yards himself. 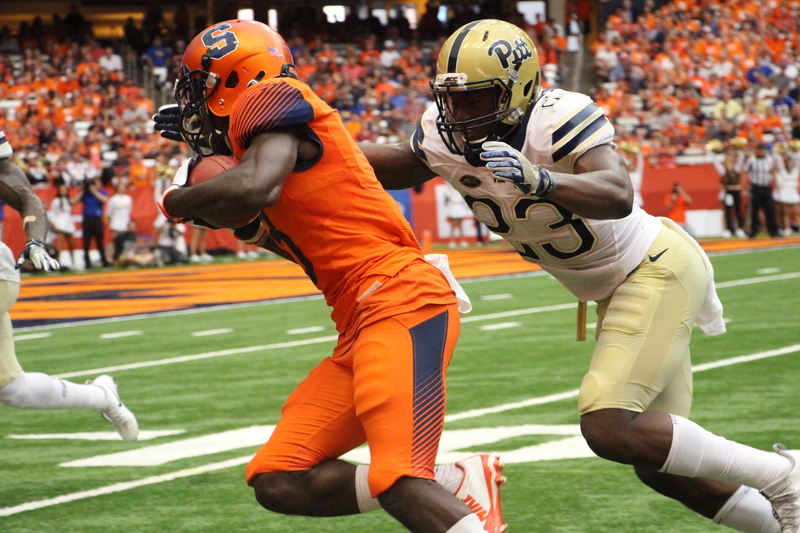 Wide receiver Ervin Phillips highlighted the Syracuse drive with a 37-yard reception. It was one of 17 for him on the afternoon, setting a new school record for receptions in a game. 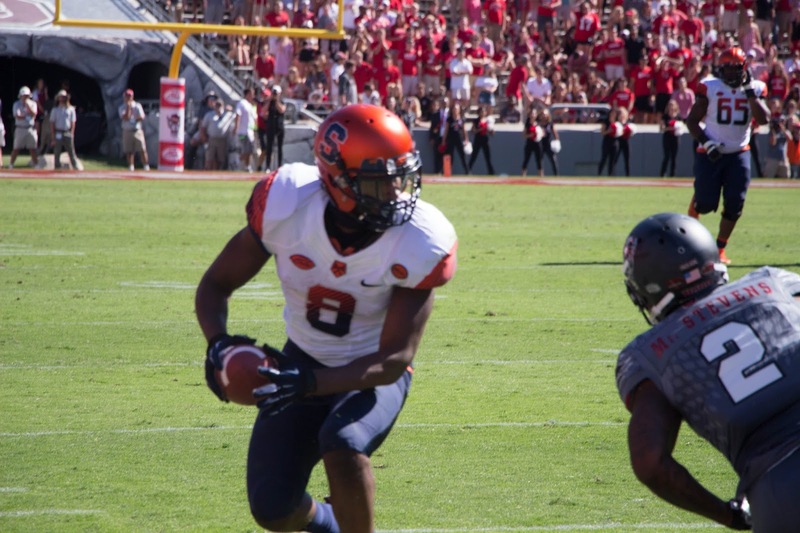 Dungey also surpassed 6,000 career all purpose yards on the opening TD drive. 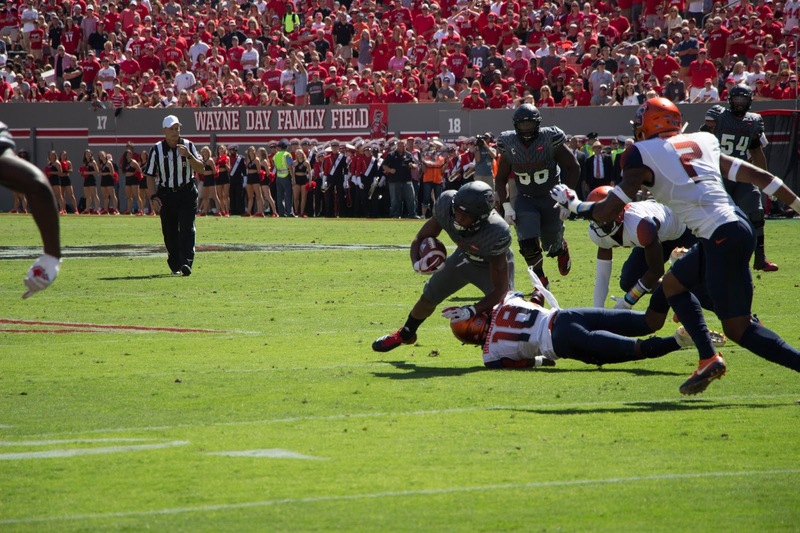 NC State answered back with a five-play, 75-yard drive, but missed the point after and led 19-7. 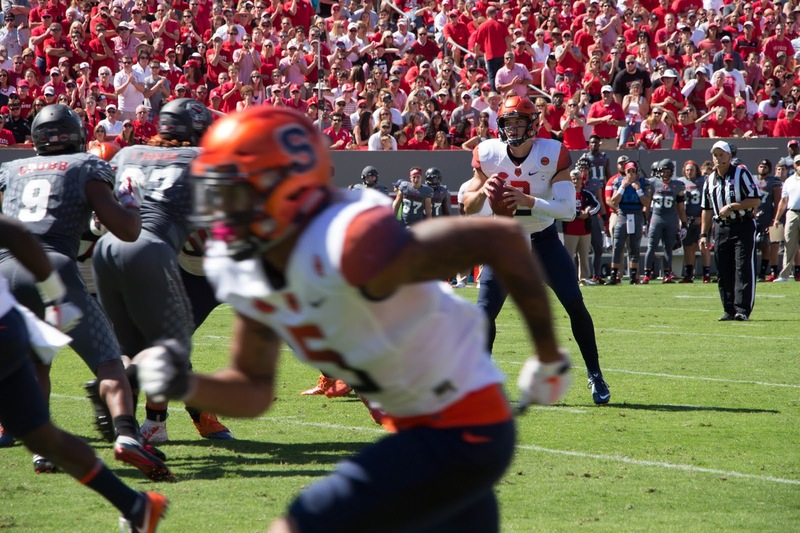 Driving after getting the ball back, Syracuse faced a fourth and one at the Wolfpack 17. 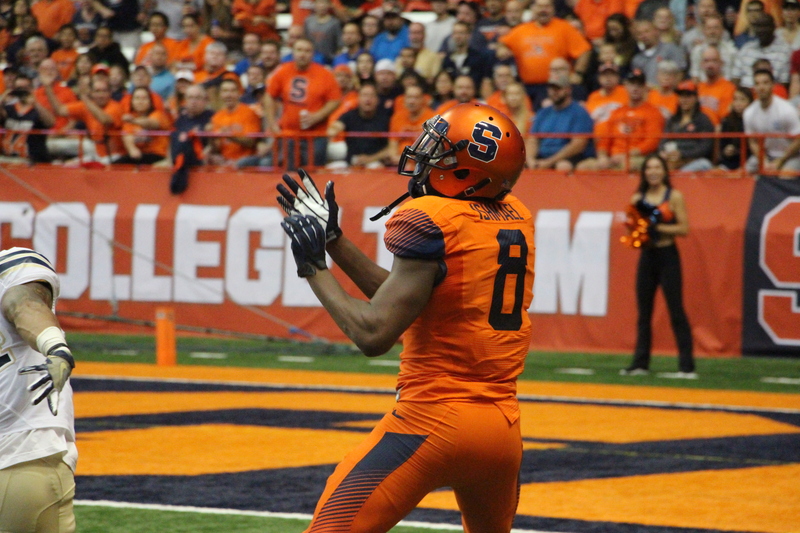 Babers elected to go for it, leaving the ball in the hands of Dungey. 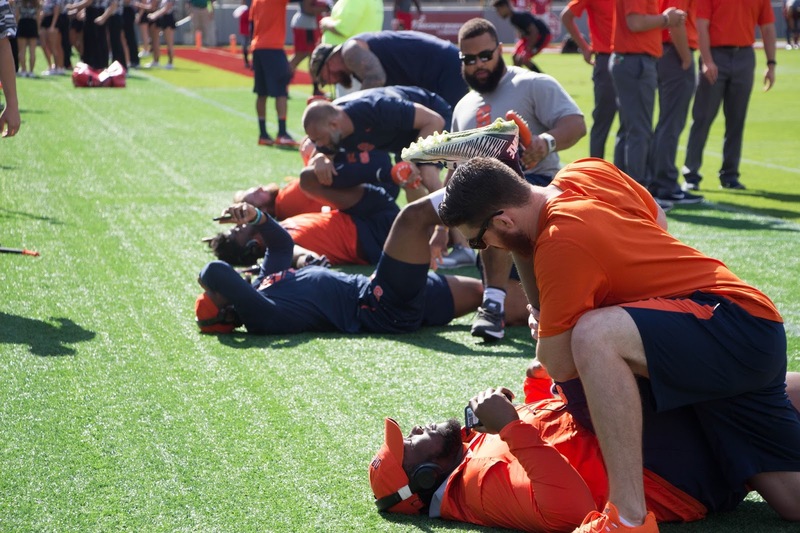 Dungey broke left, and his offensive line broke right. 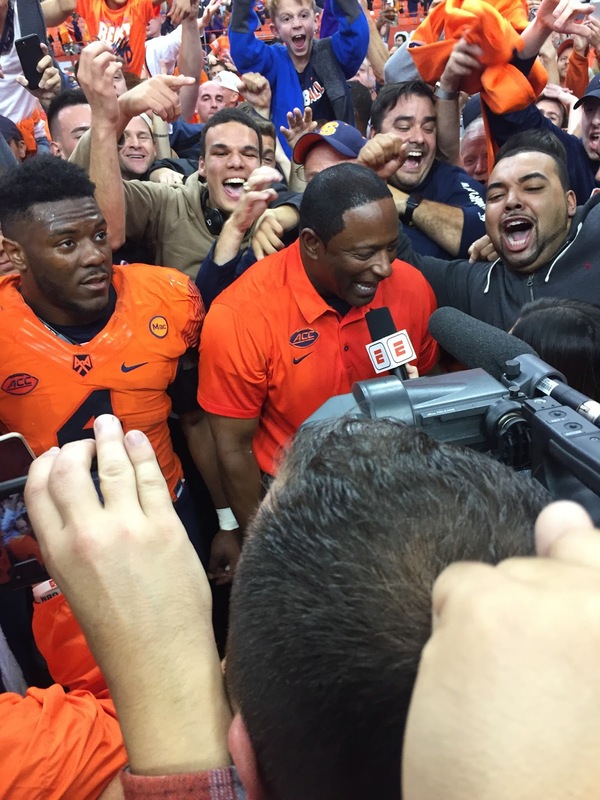 “I was just trying to get the first down, and there was a little miscommunication,” Dungey said. That miscommunication resulted in a turnover on downs after Dungey was stuffed. 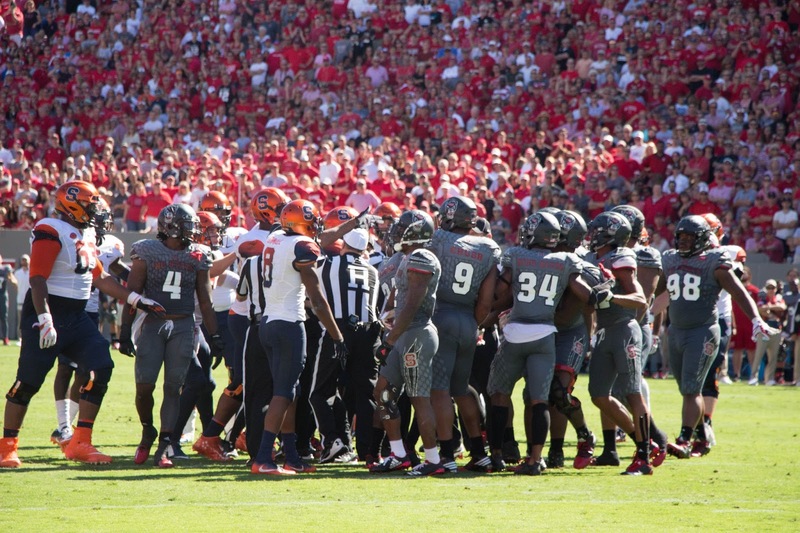 The Wolfpack stayed on the hunt, striking for its final score of the half, leading 26-7. 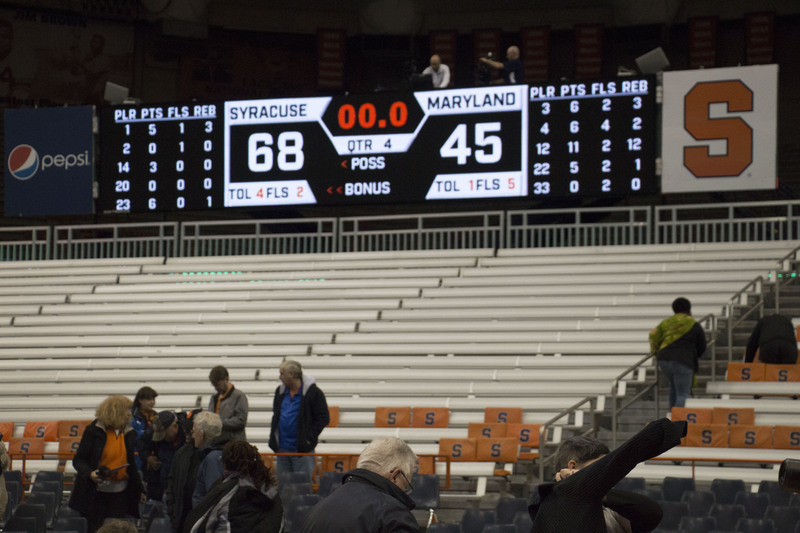 The stage was set for a blowout, but the Orange responded. 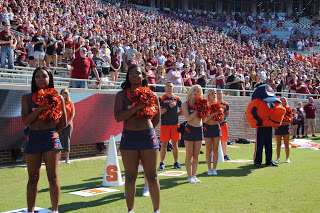 The second half had the stands significantly thinned out from the start of the contest on the far side of the field. 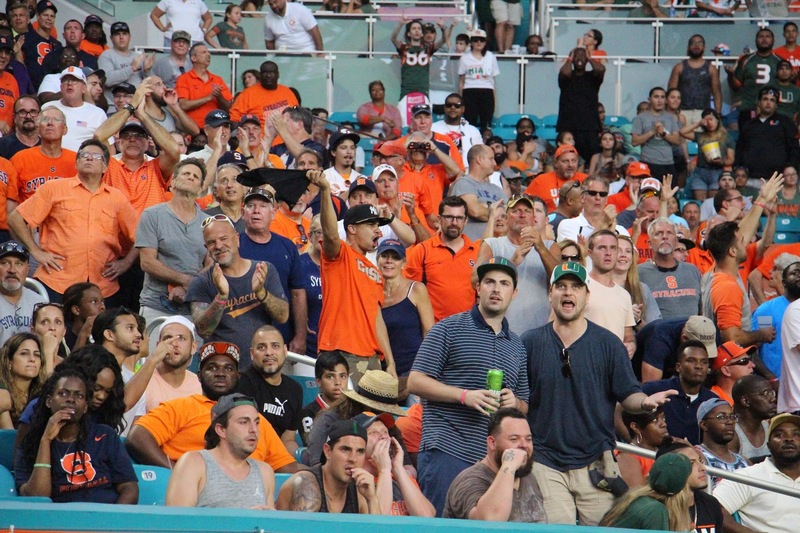 The sun beamed down on the stands the entire game, and fans headed for shade to avoid the heat. 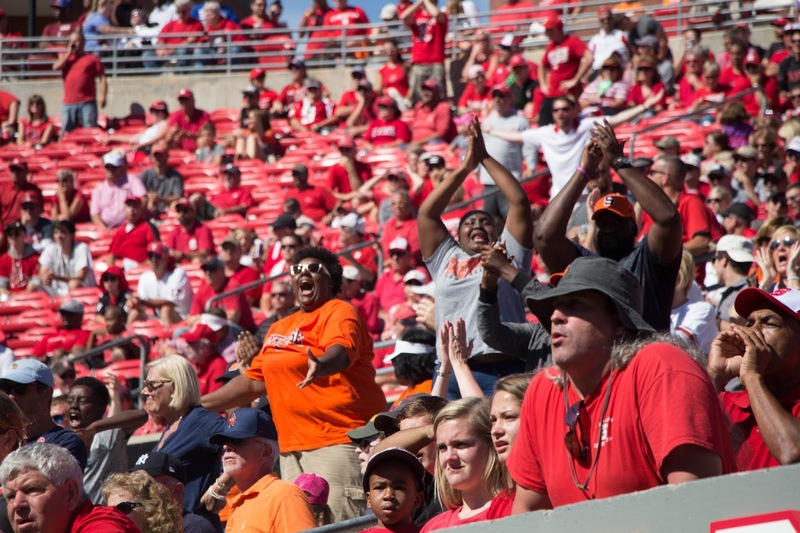 The Orange took advantage of the quieter crowd, scoring a touchdown. 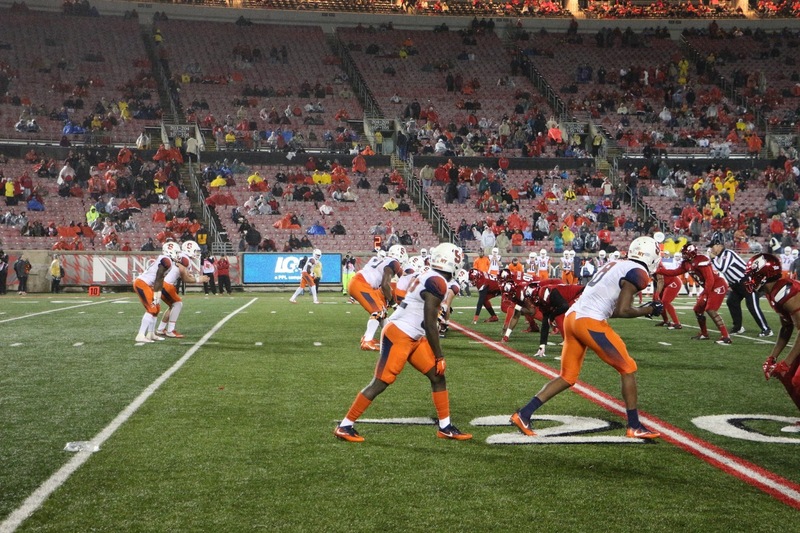 The drive was highlighted by a 38-yard pass completion to wide receiver Steve Ishmael on fourth down. 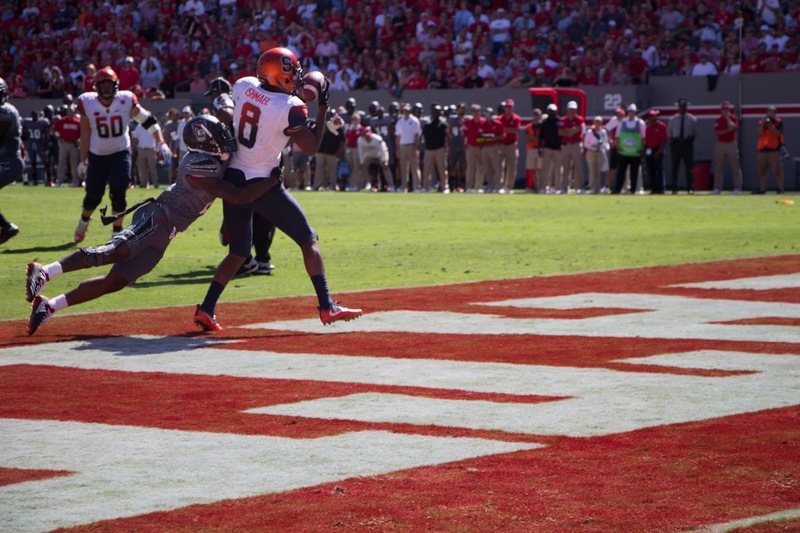 Syracuse gave up one first down to NC State over its first three possessions of the second half. This opened up opportunities for the offense to respond. 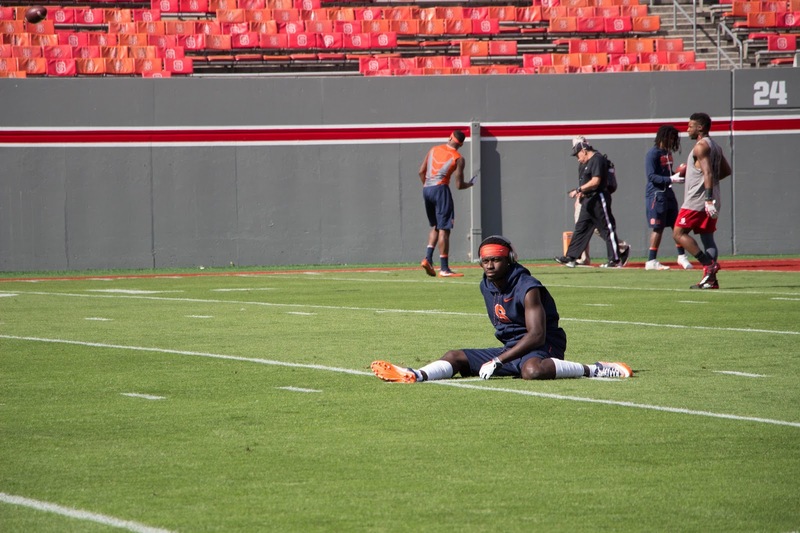 On its third drive of the half, the Orange faced third and seven from the NC State eight. 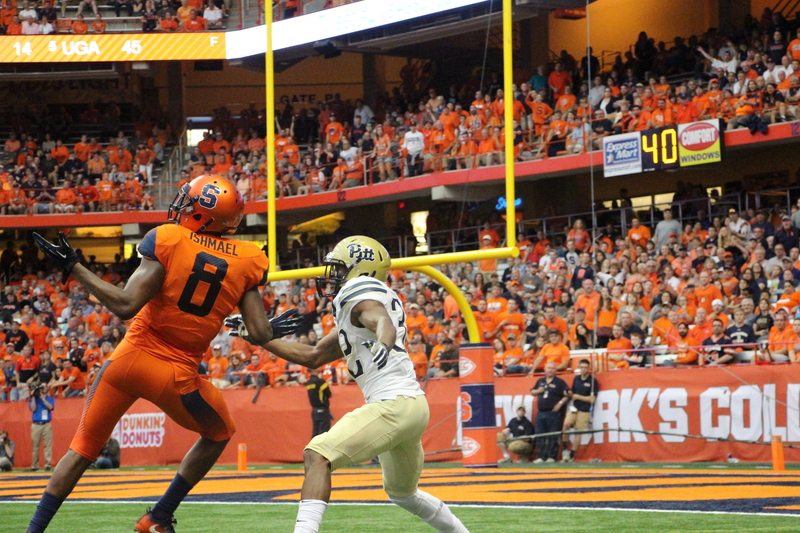 Dungey completed a slant route to Ishamel for an apparent touchdown. 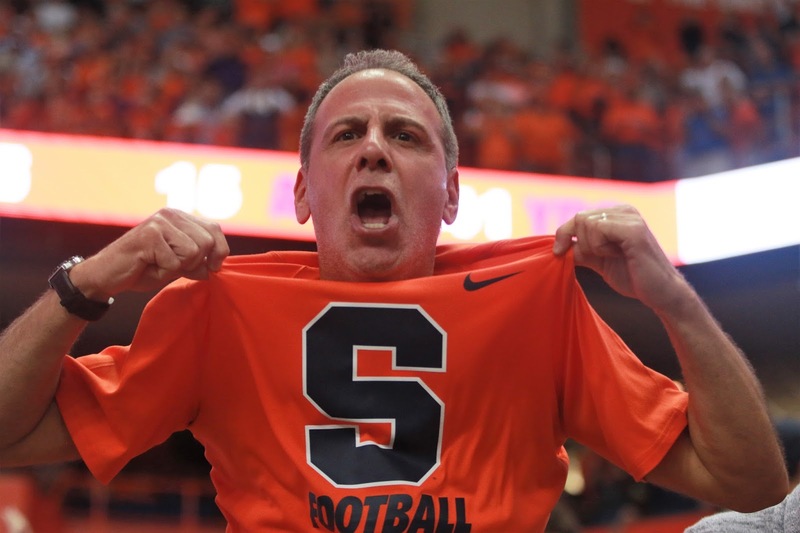 But Syracuse once again got in its own way. Penalty flag thrown into the air. Illegal formation. Touchdown wiped off the board. 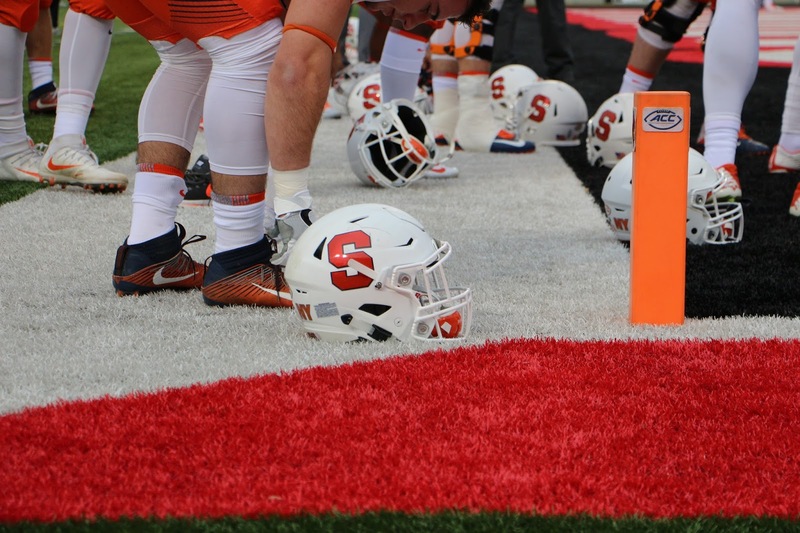 It was 5 of the Orange’s 93 penalty yards on the afternoon. 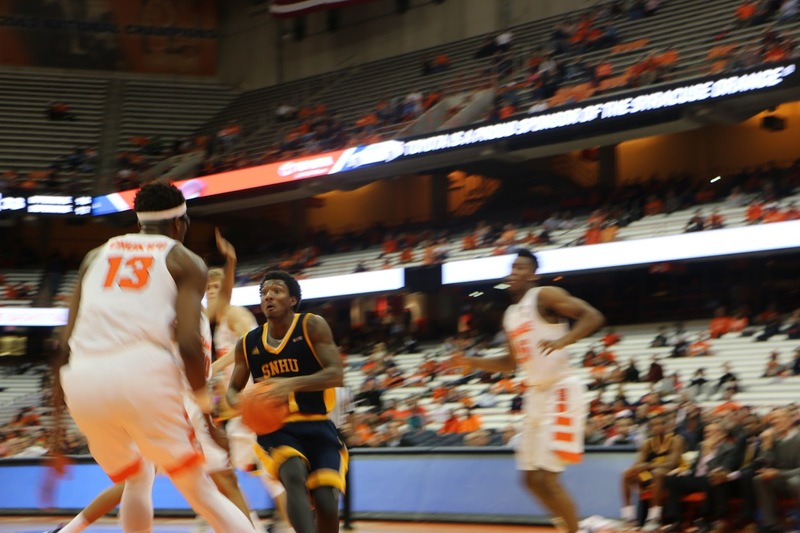 The Orange settled for three, leaving four critical points behind. 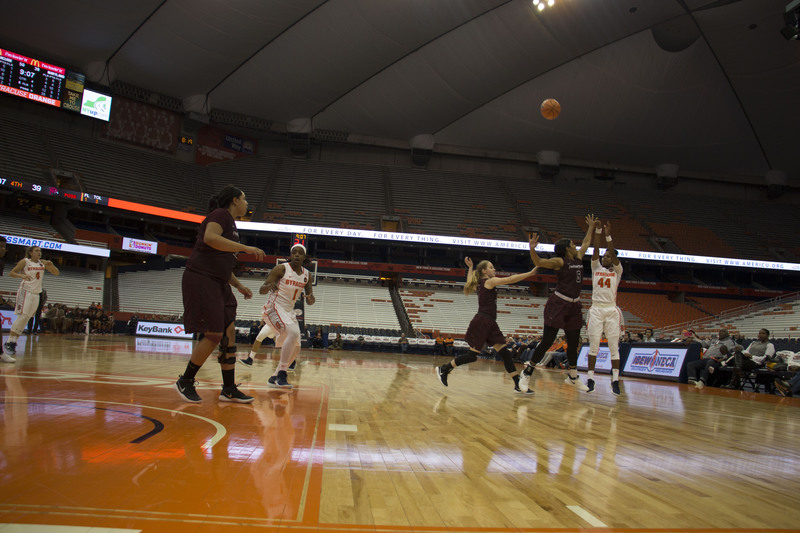 Syracuse trailed 26-17 near the end of the third. 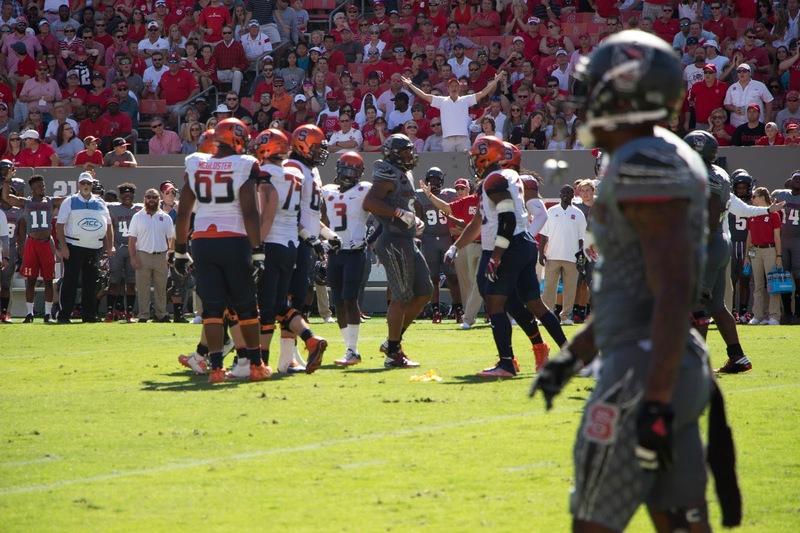 The Wolfpack opened the fourth quarter on a five minute, 65-yard touchdown drive. 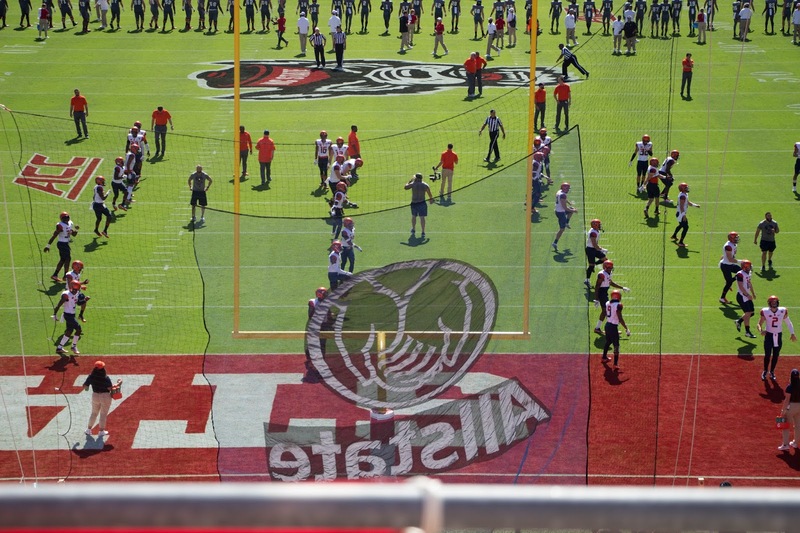 NC State Headcoach Dave Doeren went for one, leaving the game at a 16-point margin, 33-17. 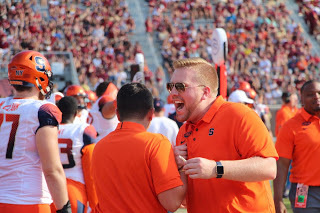 Syracuse had to play a perfect game the rest of the way, needing two touchdowns and two two point conversions to tie the game. 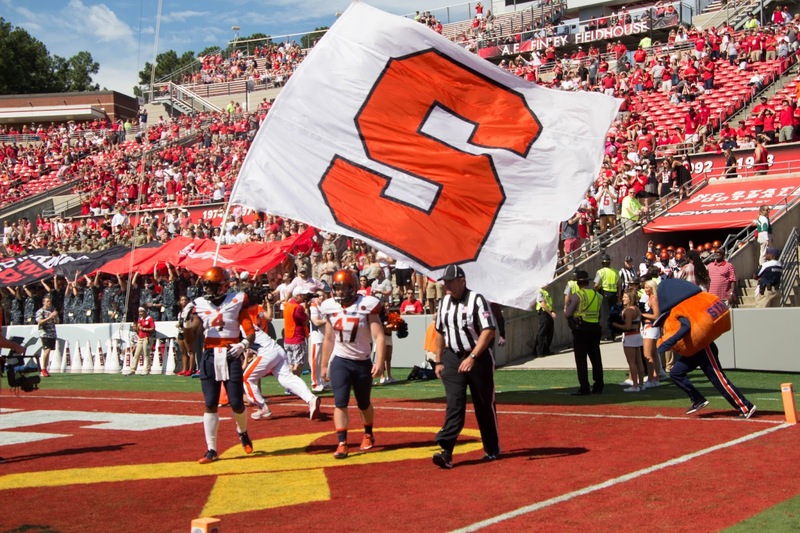 The Orange marched down the field, with Dungey breaking out on a 22-yard run on fourth and four to get Syracuse into the red zone at the Wolfpack 15. 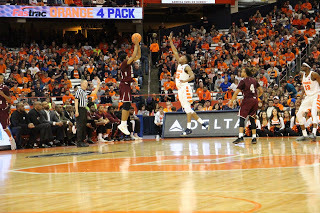 SU failed to move the ball forward another yard. 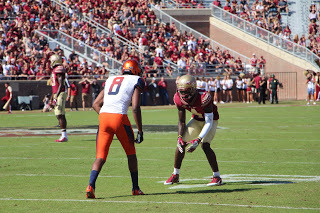 Babers went deep into the playbook with a trick pass on fourth down from wide receiver Devin Butler to tight end Ravian Pierce. It landed just outside his reach in the end zone. 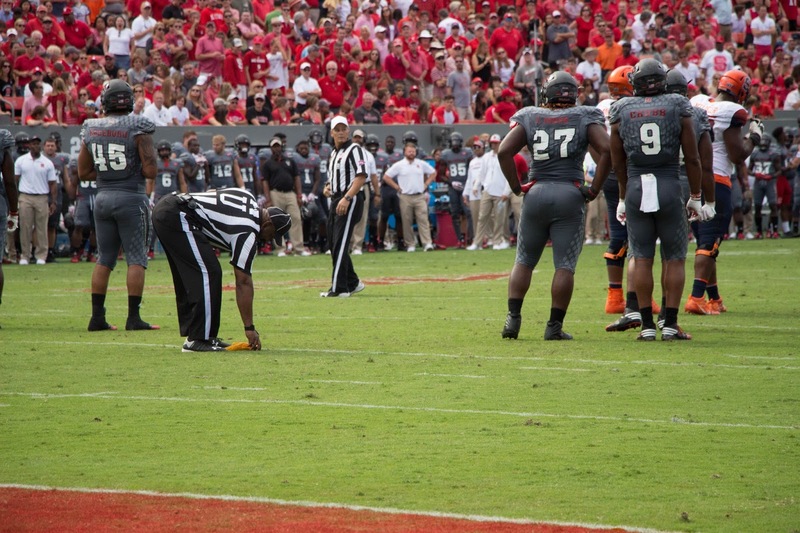 NC State went three and out, with Babers using two of his three timeouts to stop the clock. 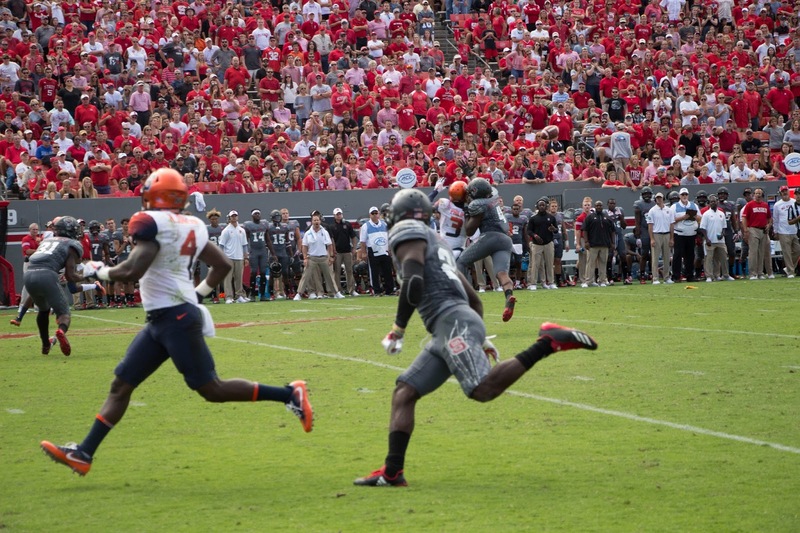 Syracuse punt returner Sean Riley returned the Wolfpack punt into NC State territory. 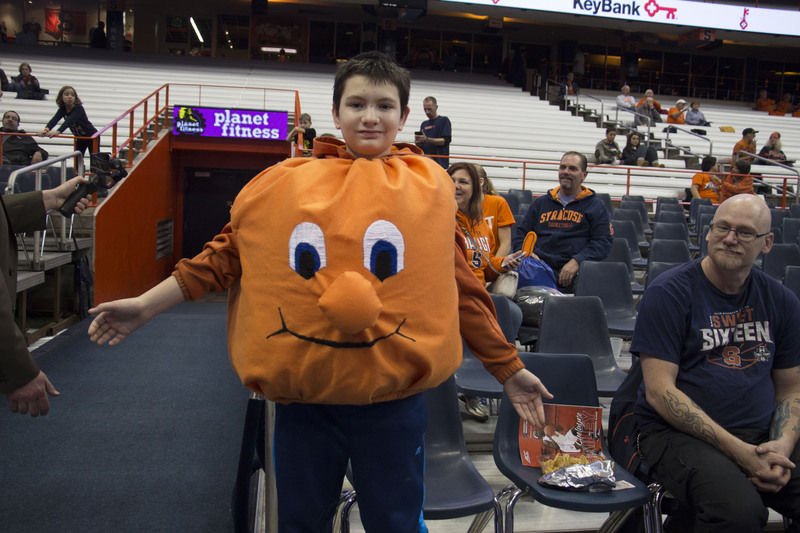 Dungey and the offense scored in one minute n a ten-yard pass to Ishmael. 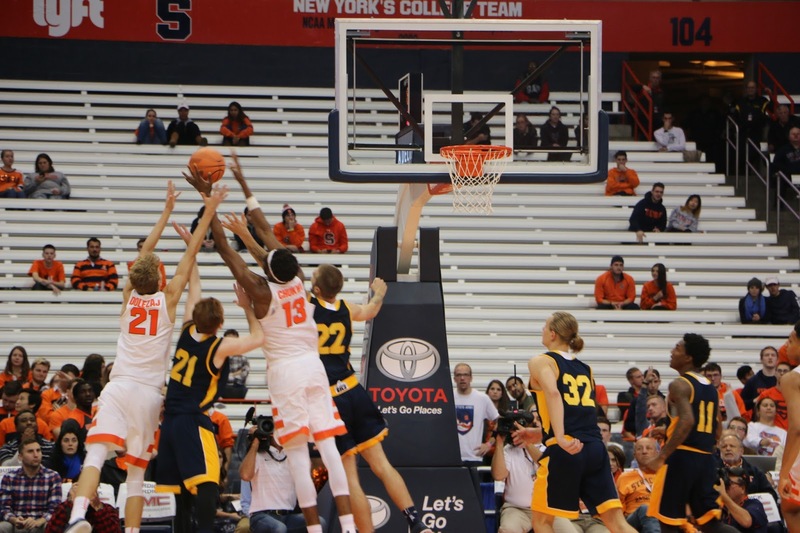 Dungey kept it himself to convert two, and the Orange trailed by eight. 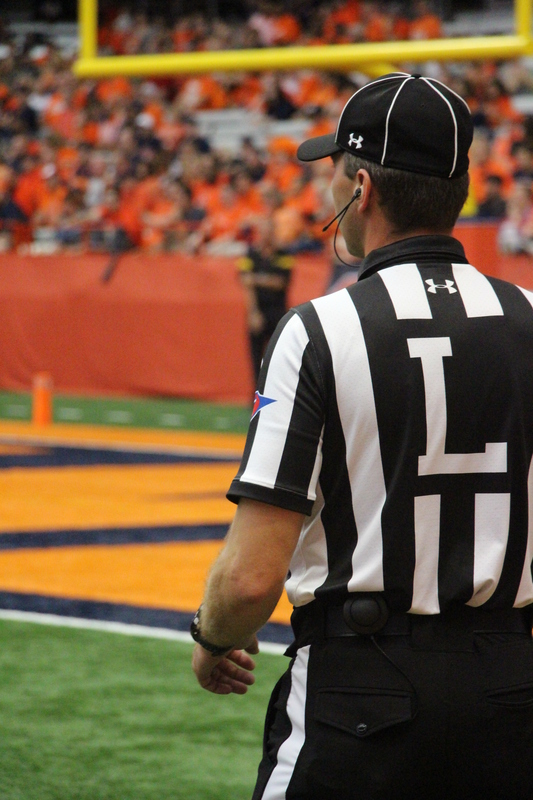 Syracuse never got the ball back, as Finley convertedt a fourth-and-inches into a first down on the next possession to ice the game. 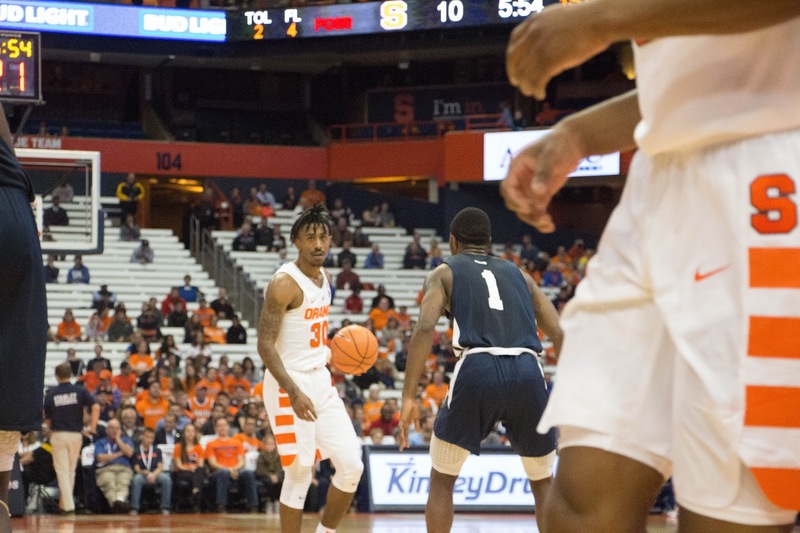 Syracuse won the second half in both games on its road trip, outscoring LSU and NC State 41-28, but ended the road trip winless. 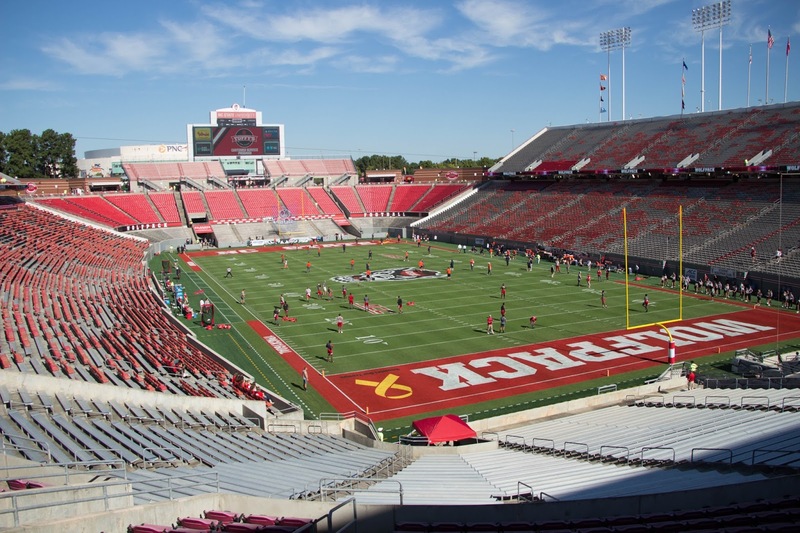 NC State won its 200th game at Carter-Finley Stadium with the victory. 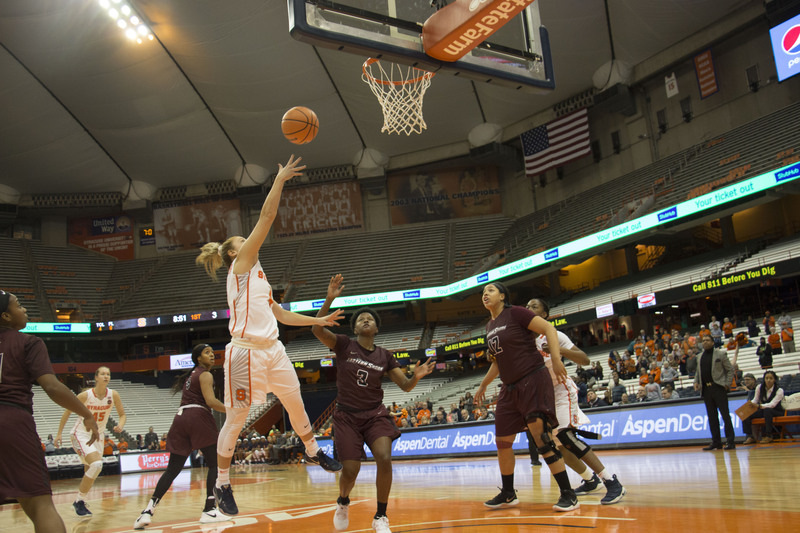 The Wolfpack advanced to 2-0 in ACC Play, the first time in eleven years. State running back Dakwa Nichols was injured on his eighth carry of the season, and had to be carted off the field. 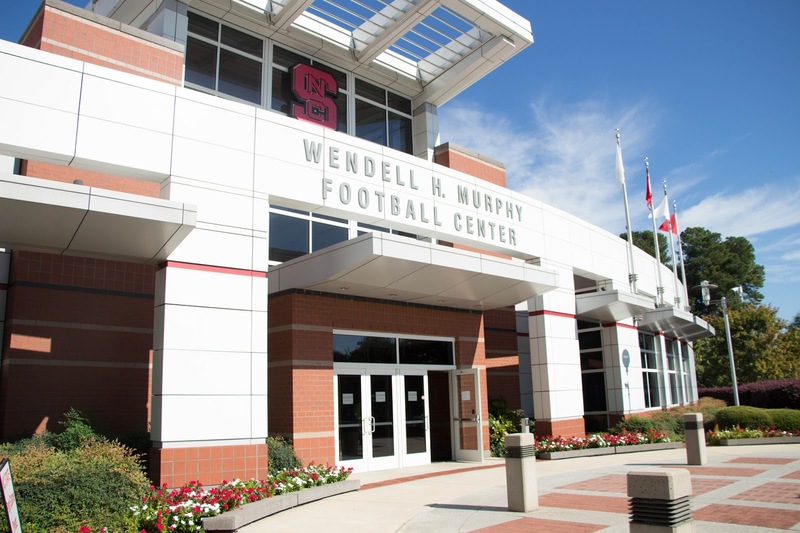 Doeren updated his status after the game, saying Nichols is out for the season and will be have knee surgery tomorrow. 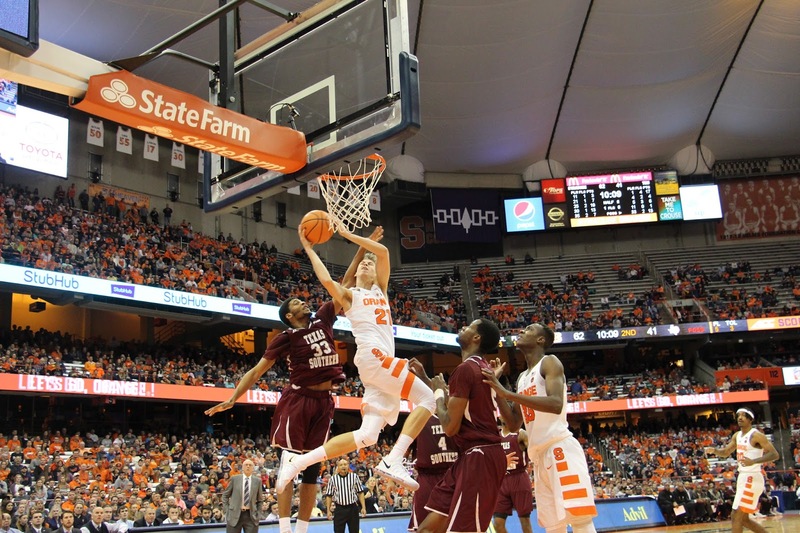 The Wolfpack advanced to 10-1 in the series history against Syracuse. 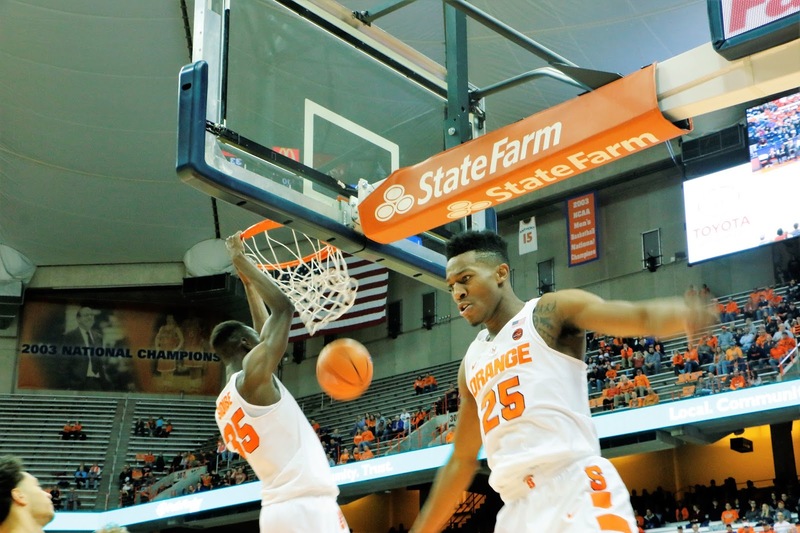 NC State and Syracuse’s next games will be ACC openers for their opponents. NC State hosts Louisville this Thursday at 8:00 p.m. on ESPN. 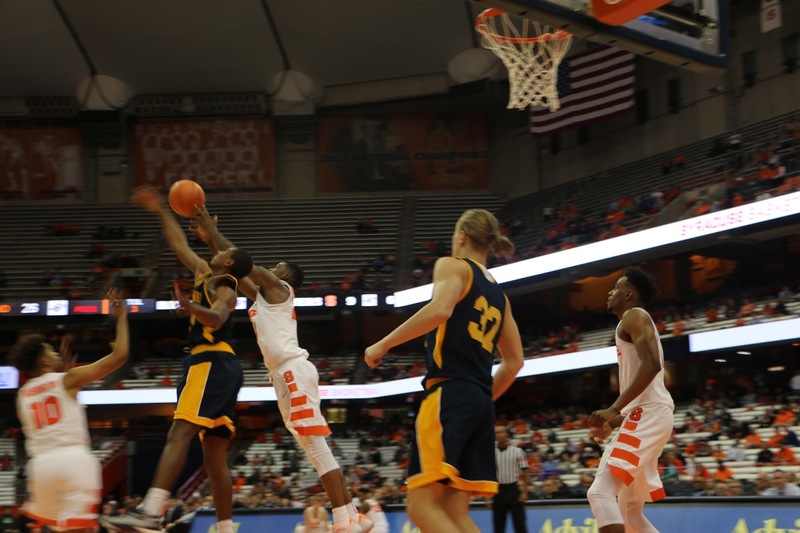 Syracuse returns to the Carrier Dome against the Pittsburgh Panthers on Saturday at 12:30.